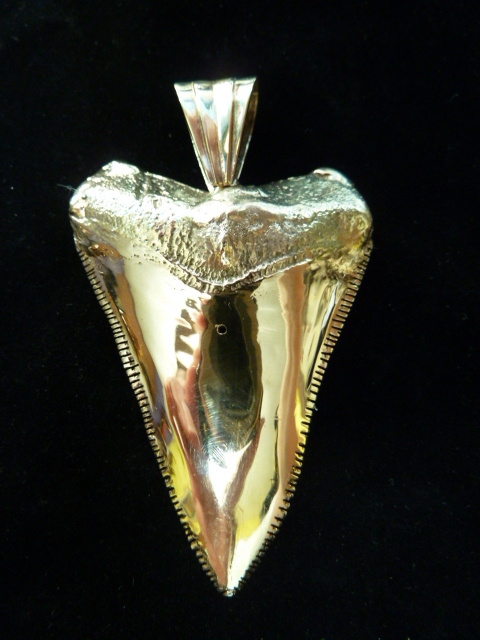 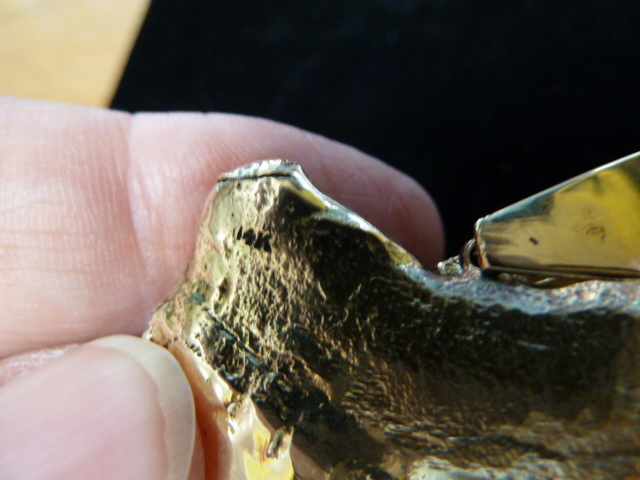 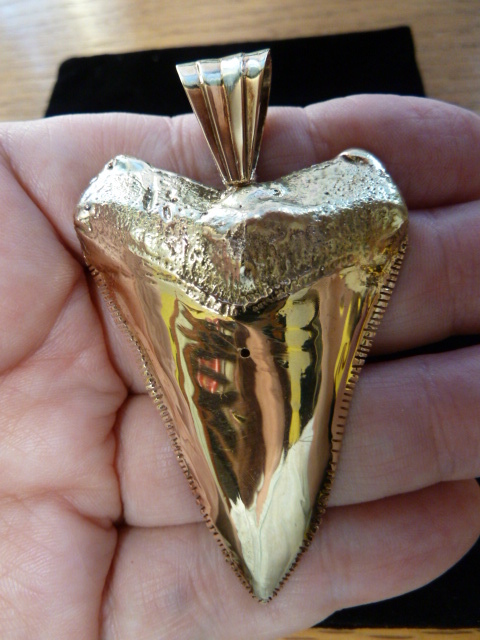 Both teeth have been drilled just below the center of the root, all the way through, to certify that it is indeed solid 14k gold. 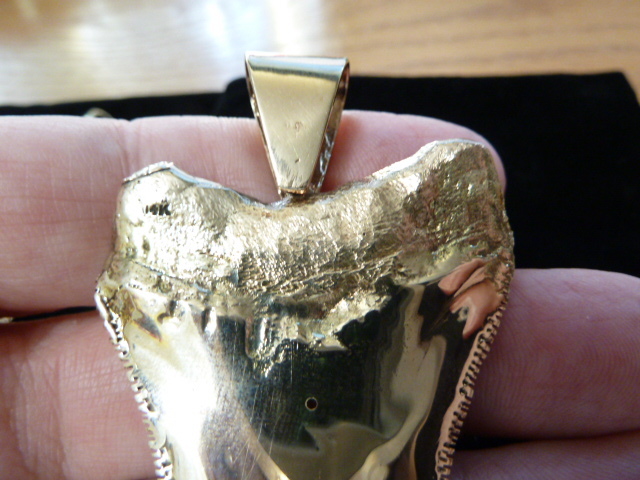 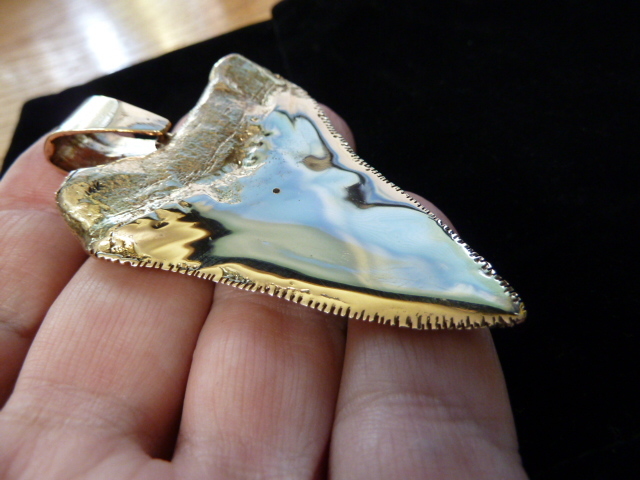 That is exactly what they are, solid 14k gold. 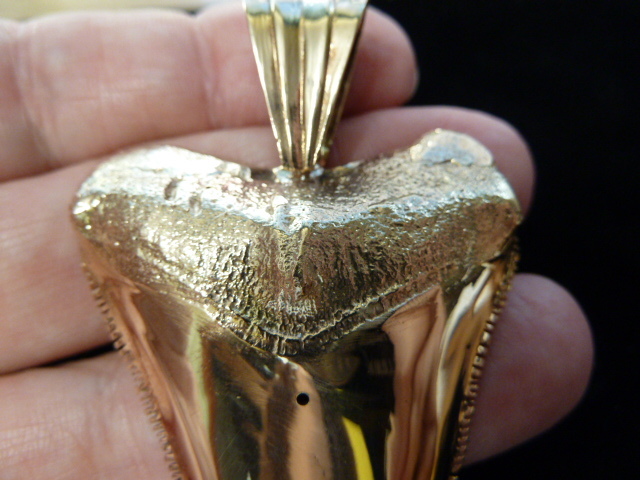 The same jeweler that did the drilling indicated that filling the hole was an easy task. 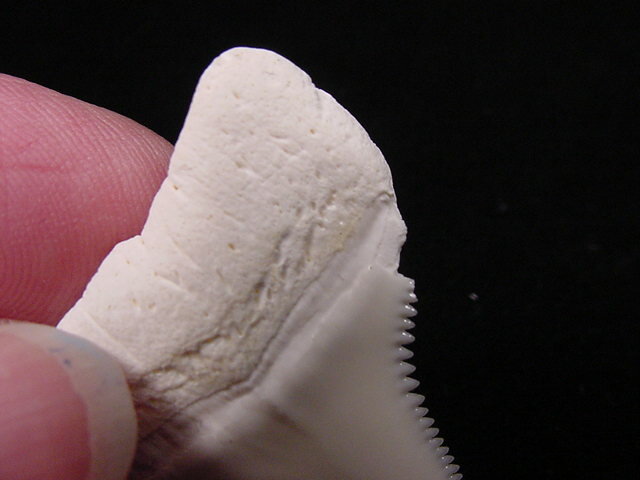 We will not do so, so you can re-check this to confirm the finding. 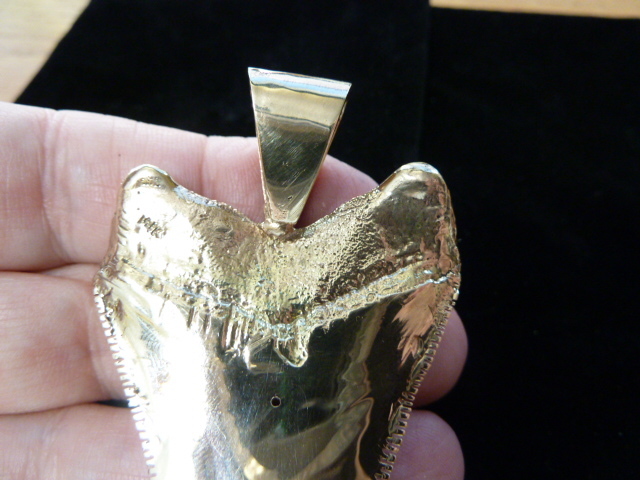 Each is stamped on the back, upper left root "14k"
Polished to a mirror finish, flawless, never worn. 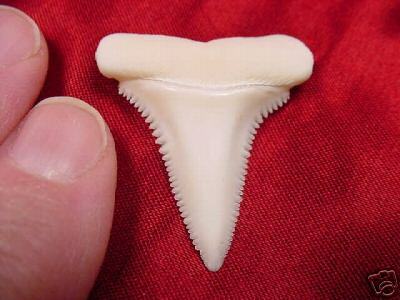 Shown below on Glenn's neck for size. 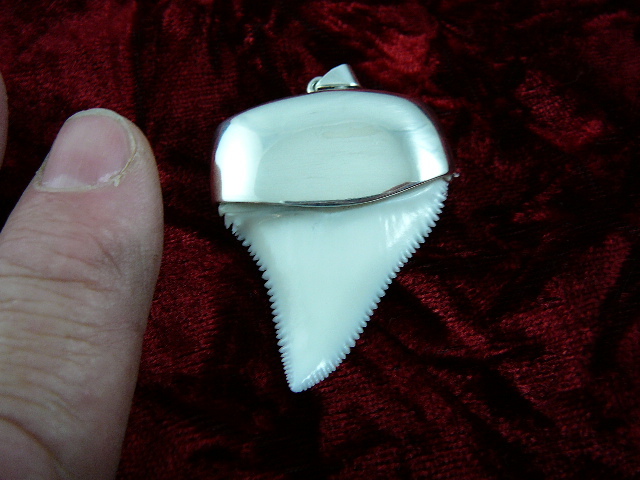 Acquired from an estate. 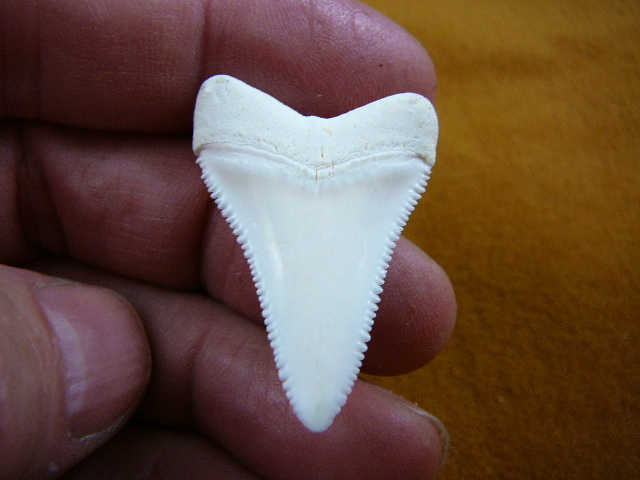 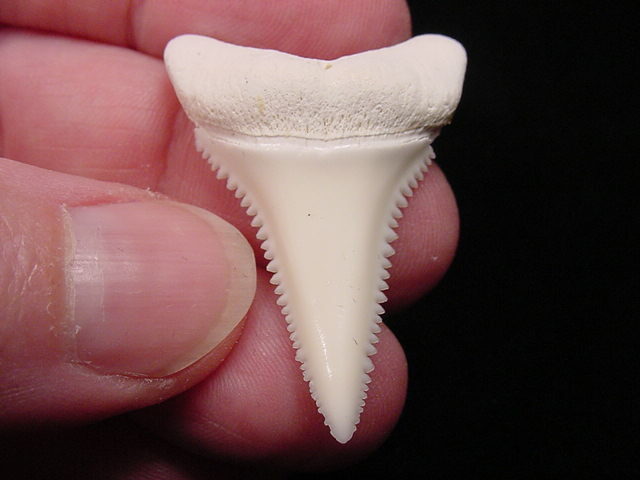 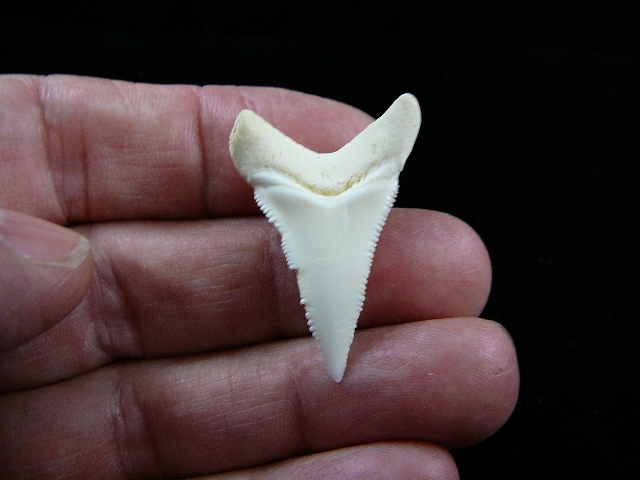 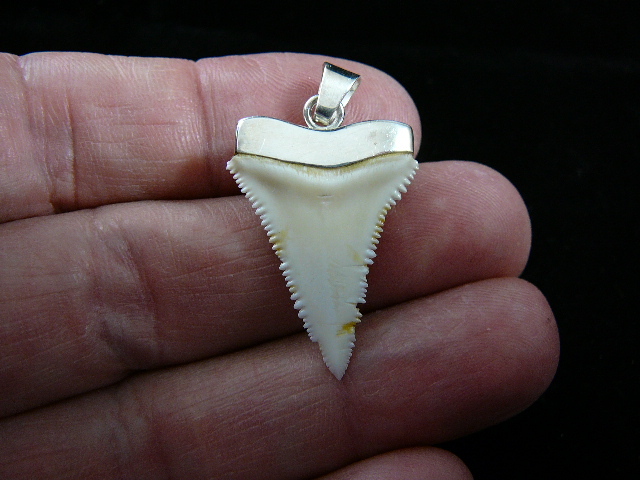 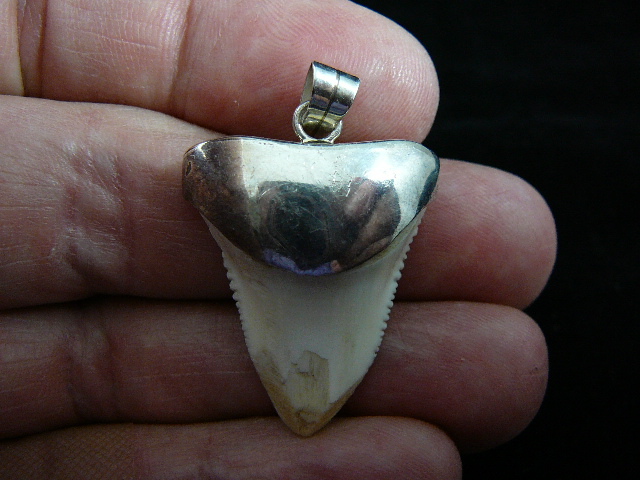 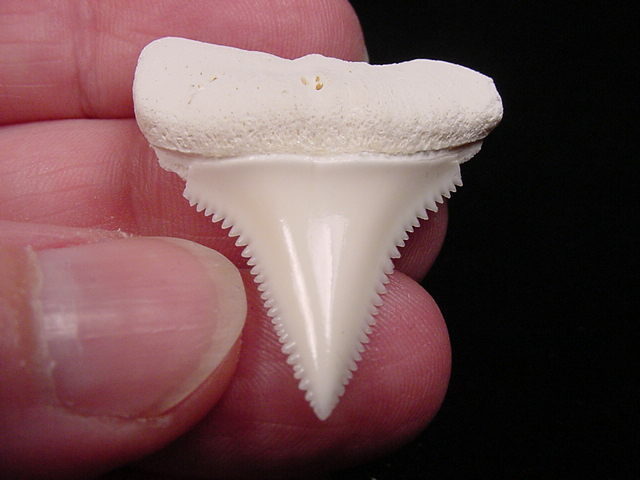 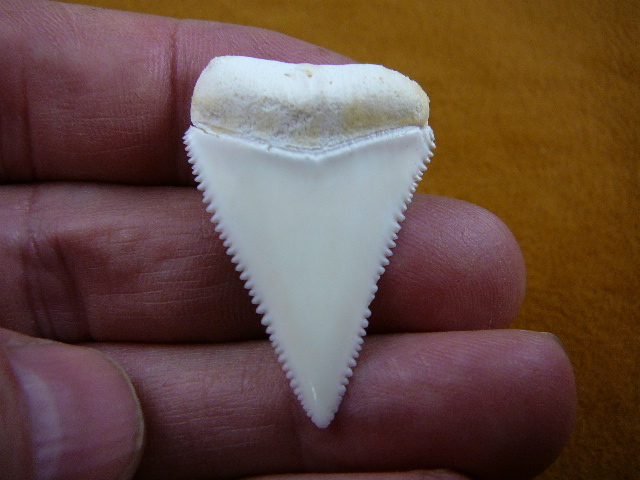 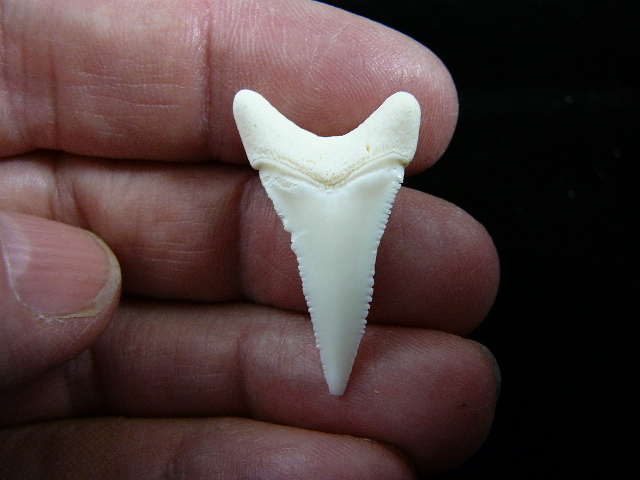 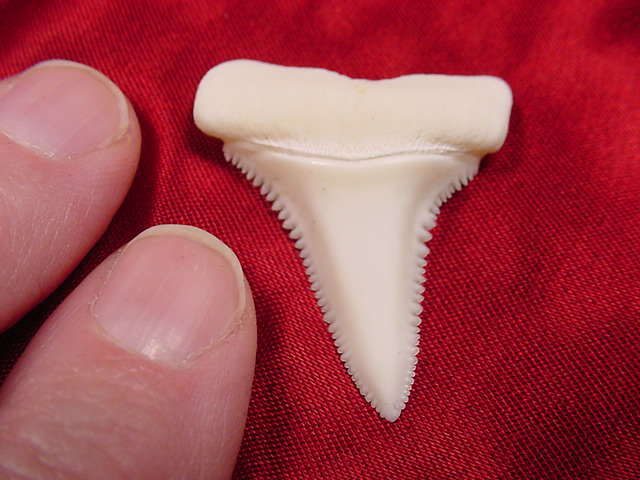 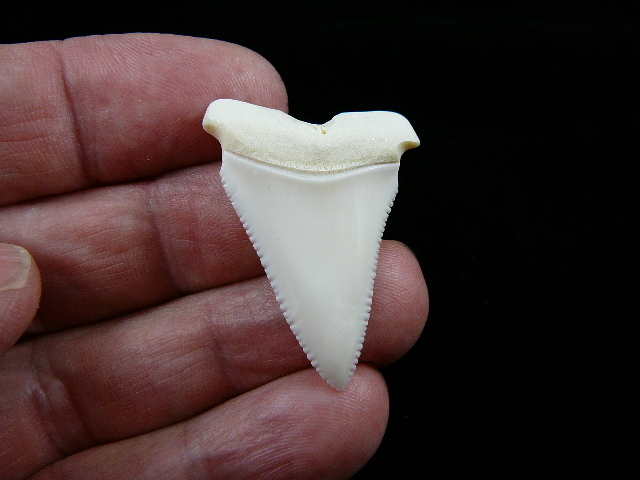 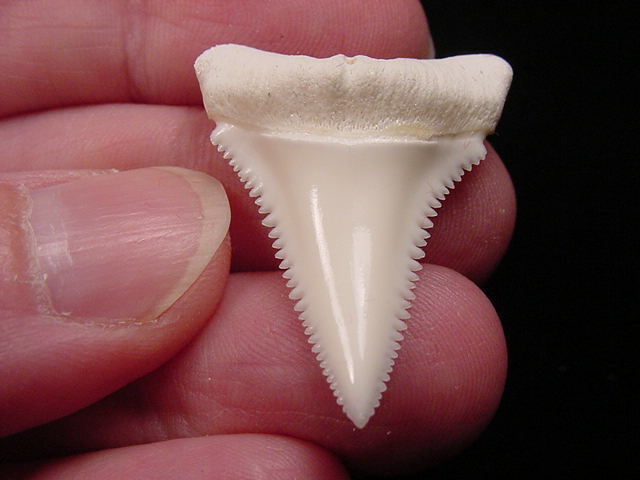 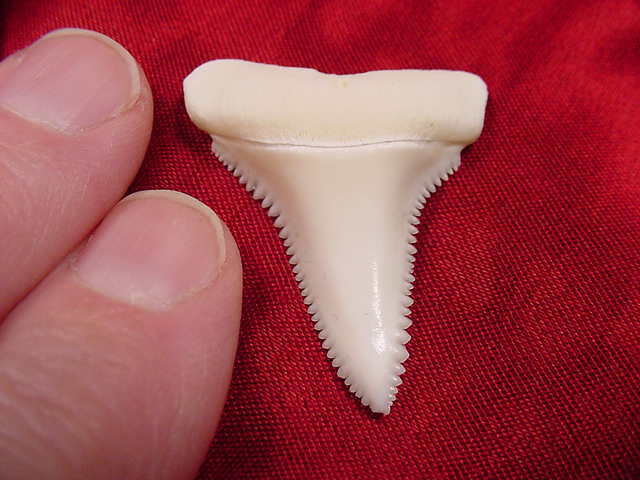 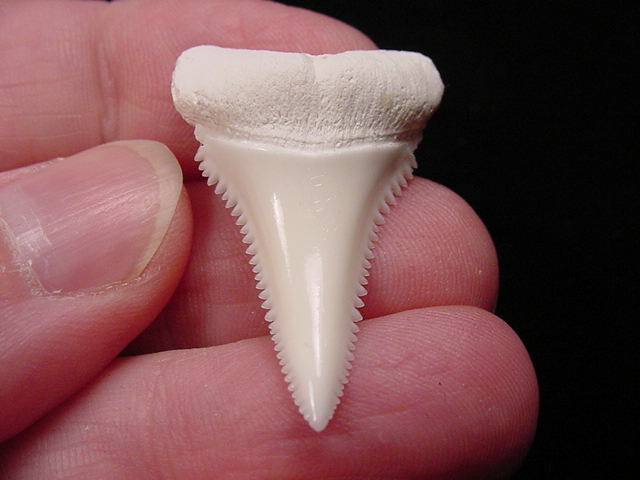 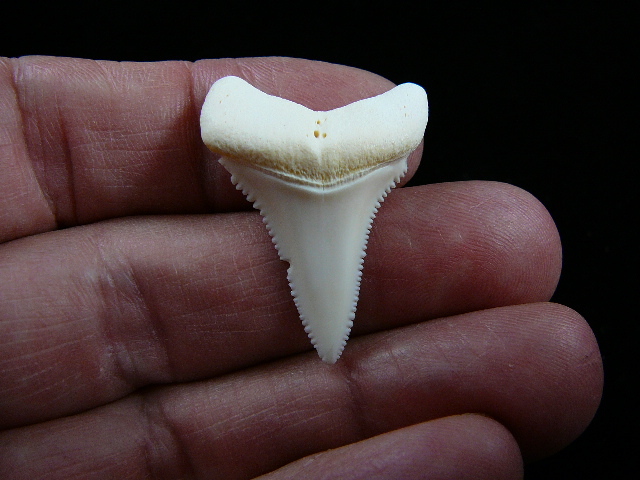 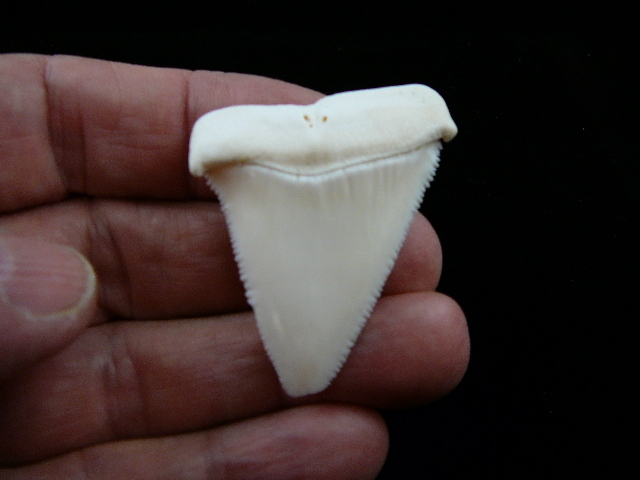 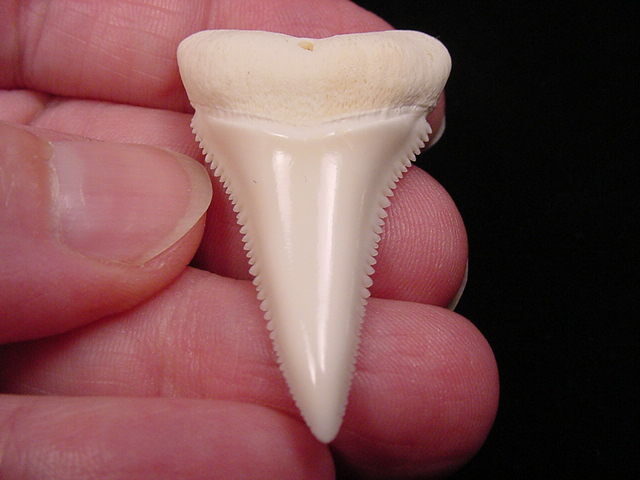 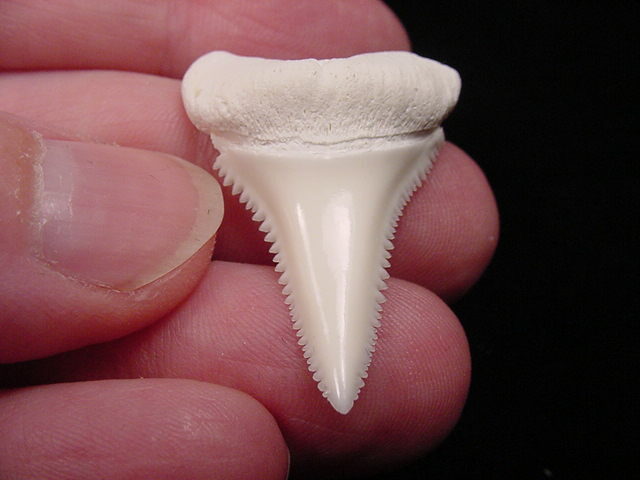 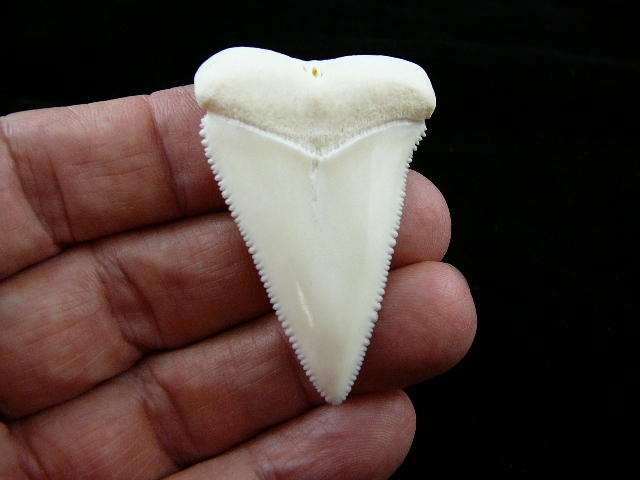 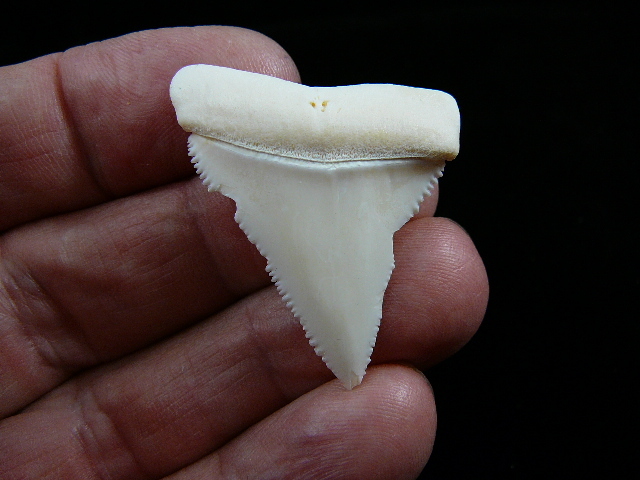 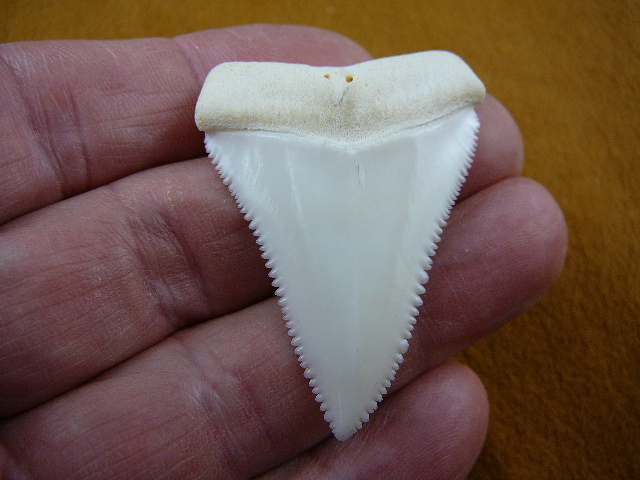 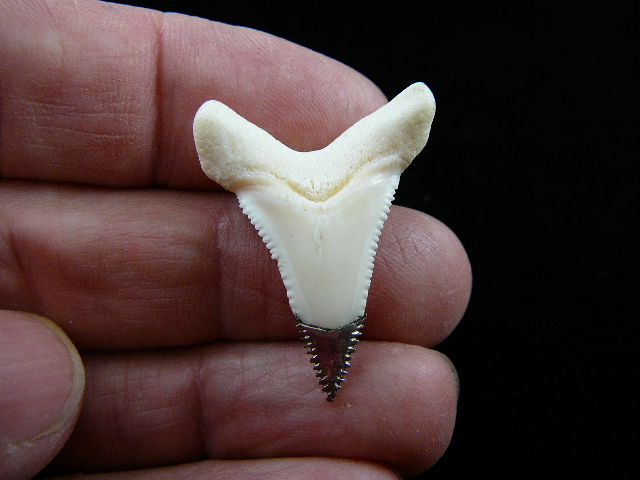 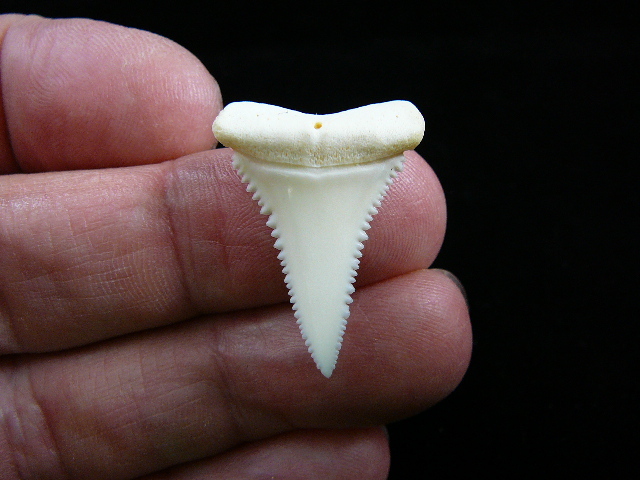 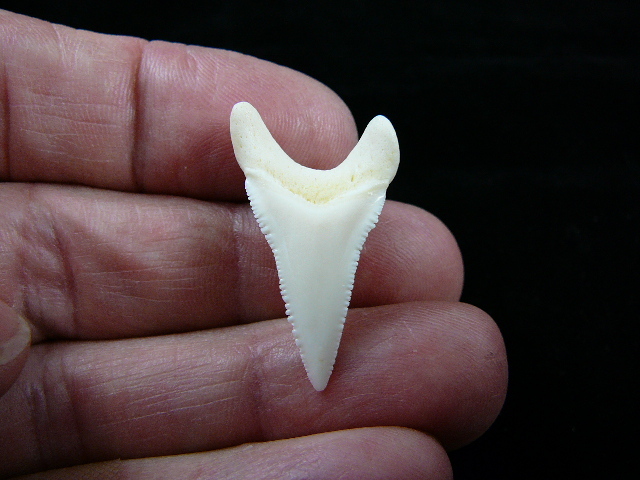 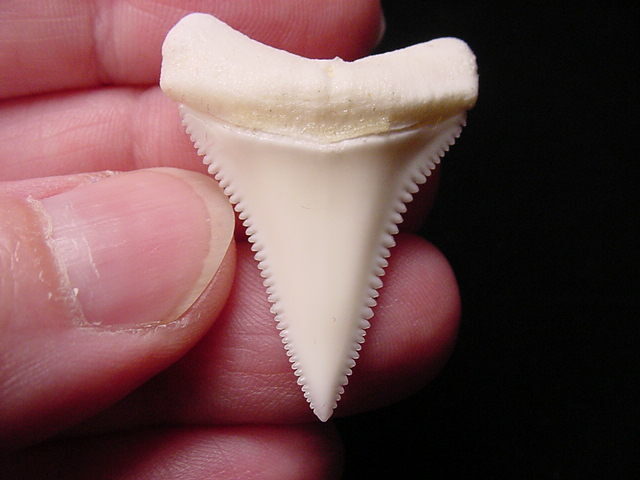 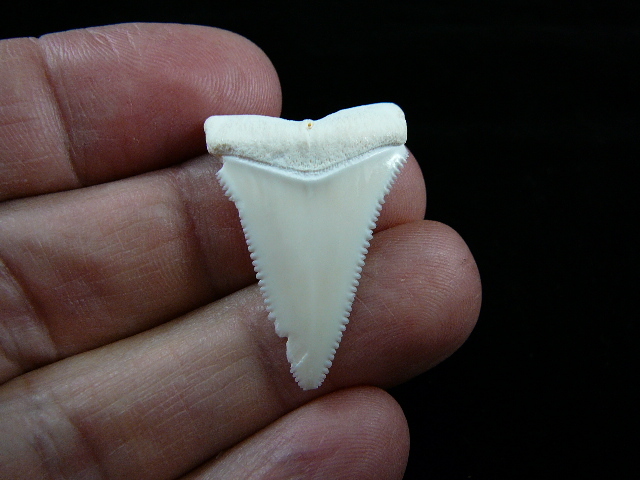 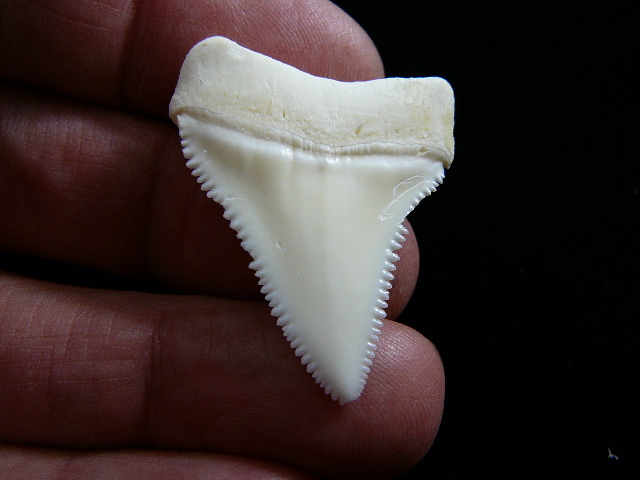 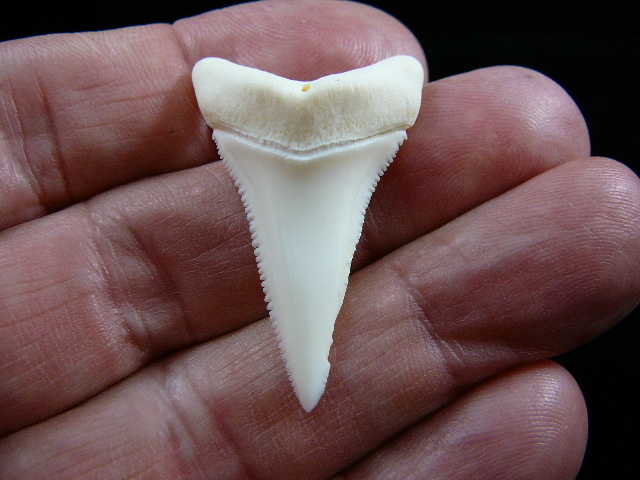 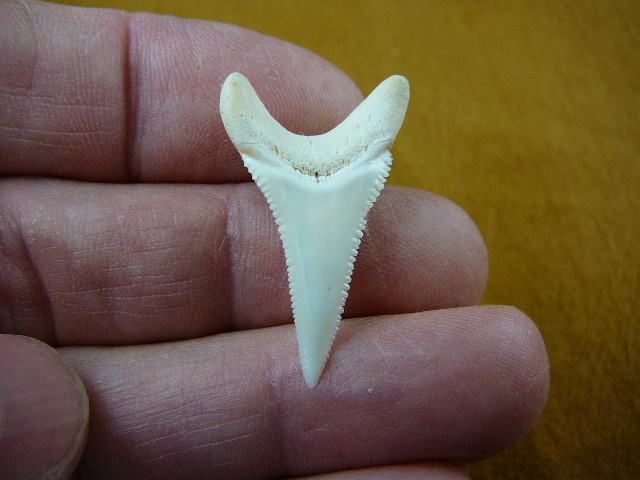 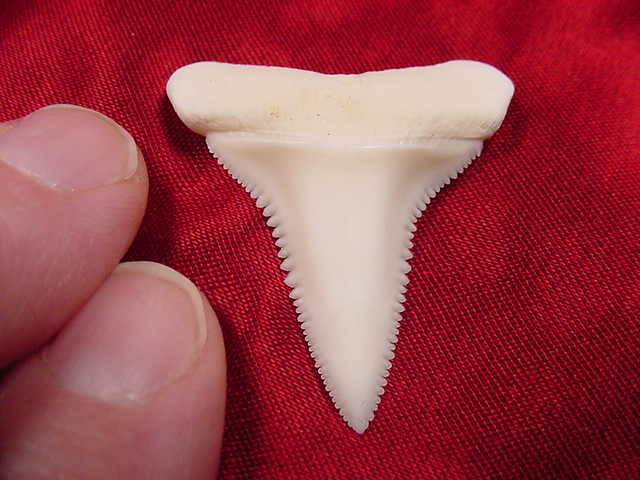 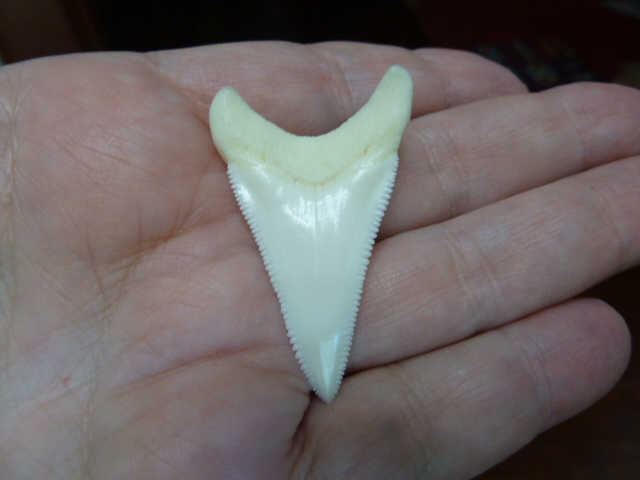 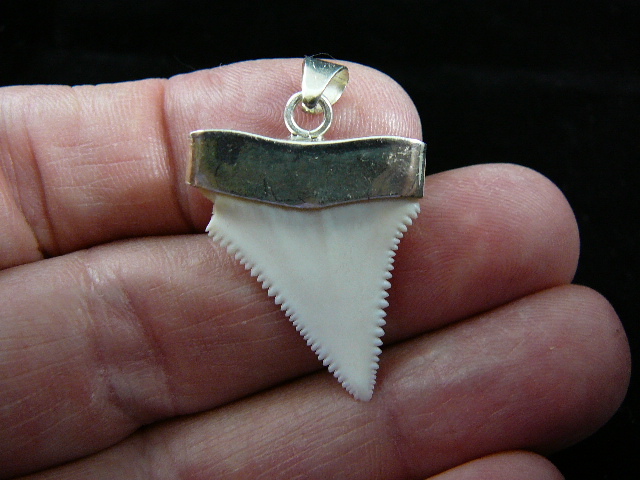 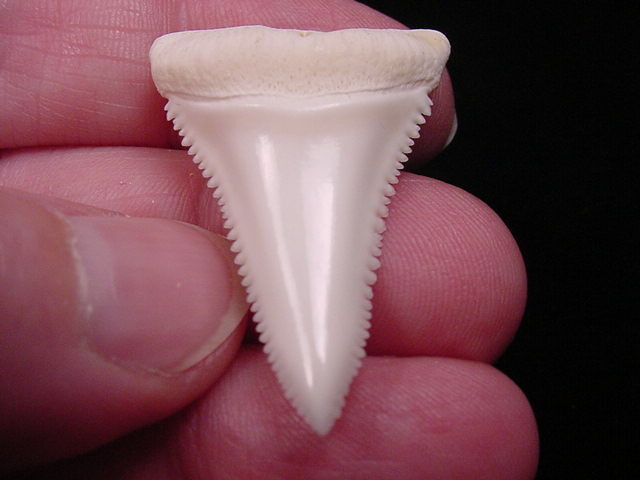 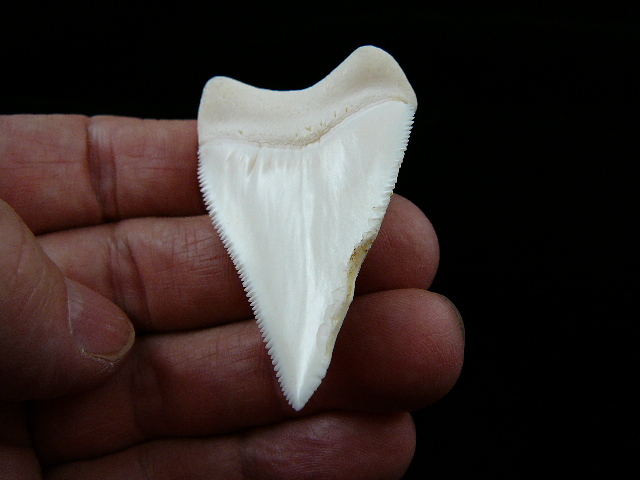 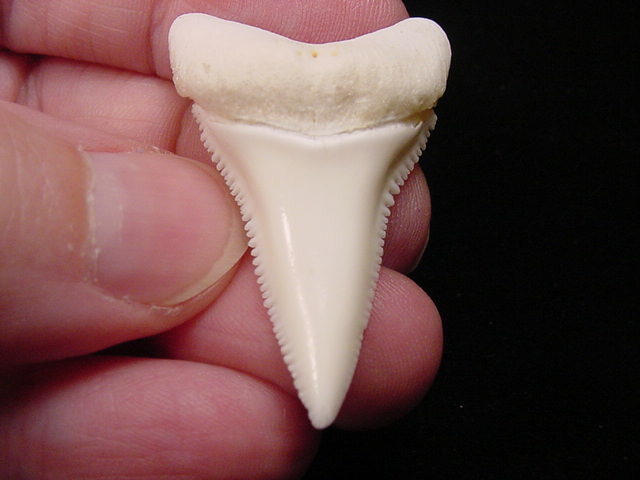 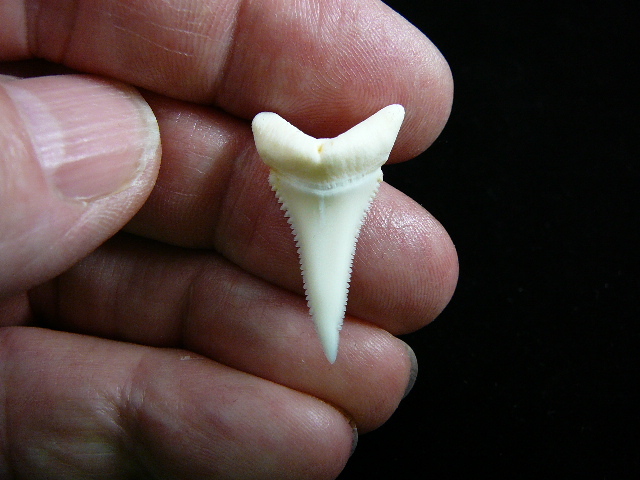 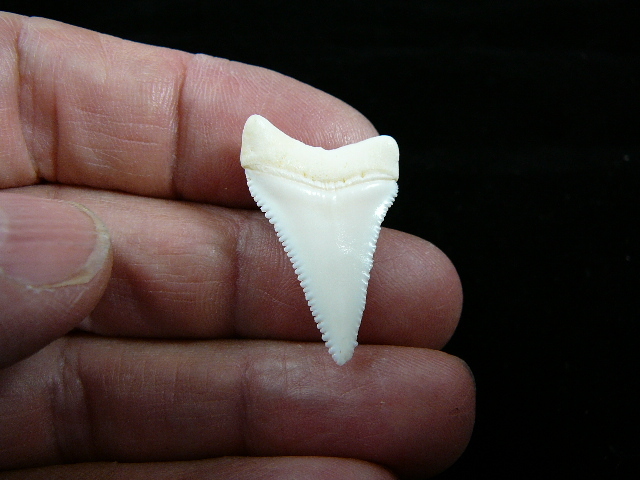 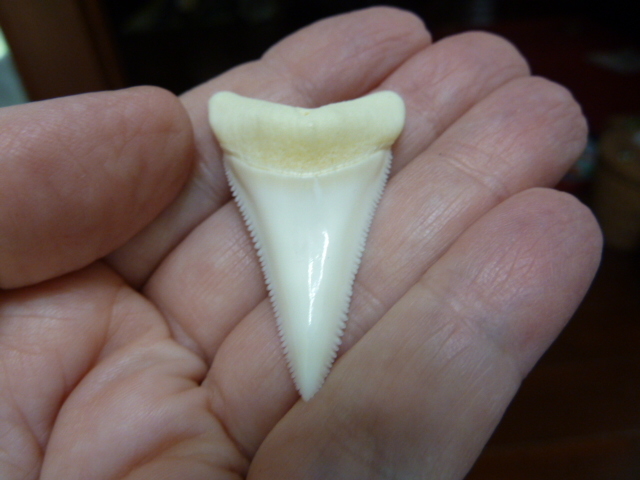 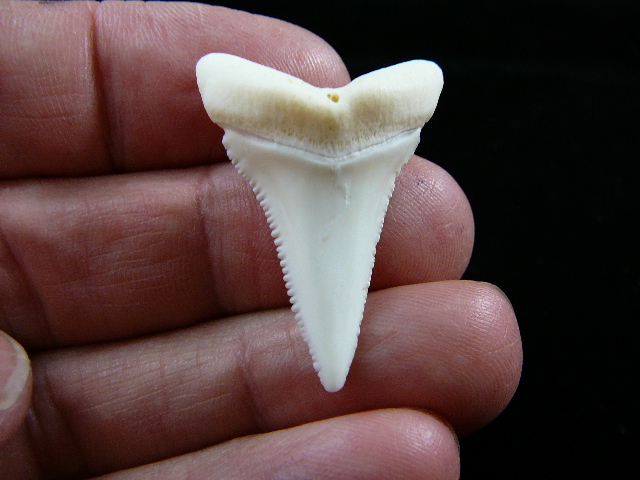 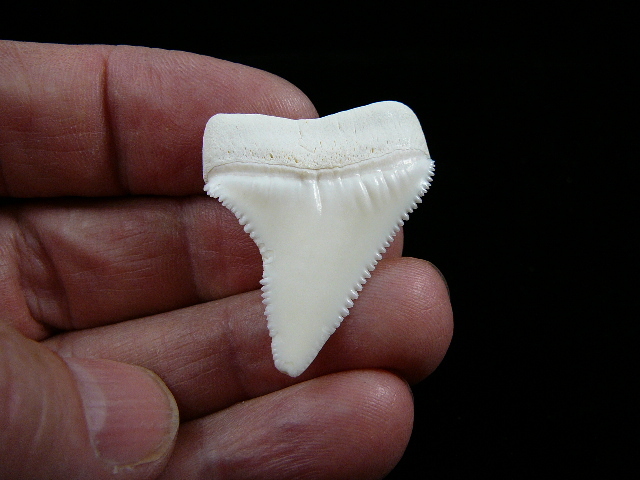 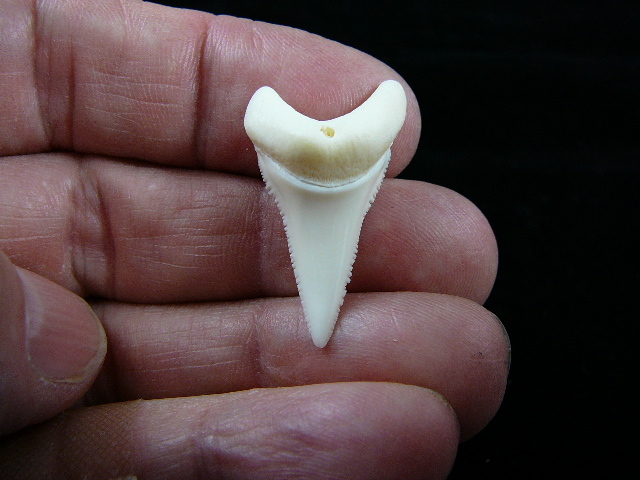 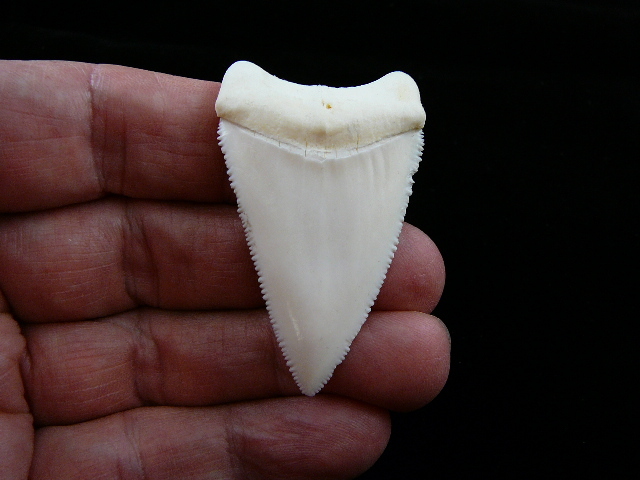 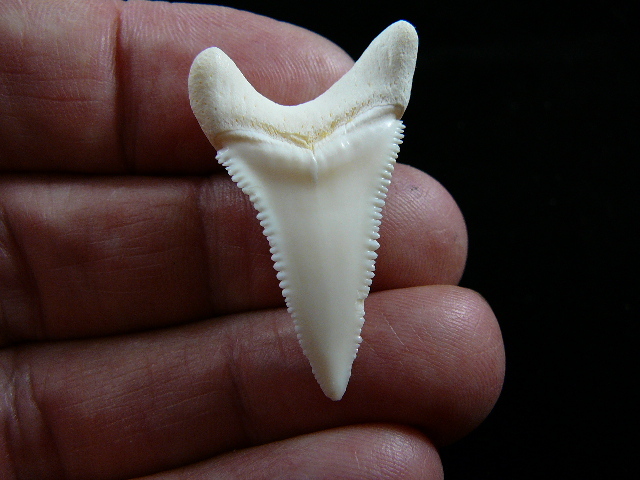 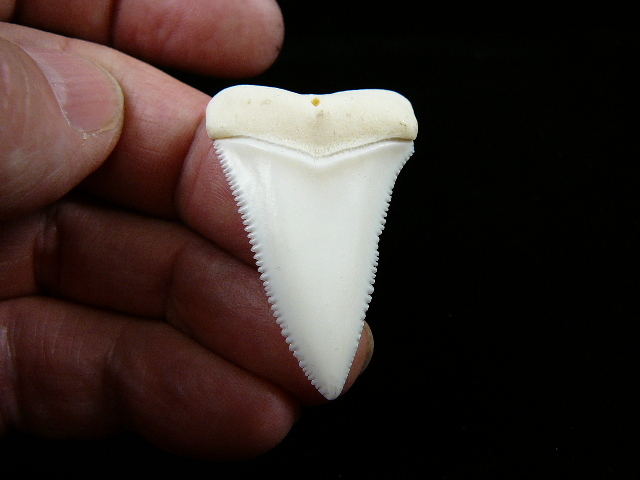 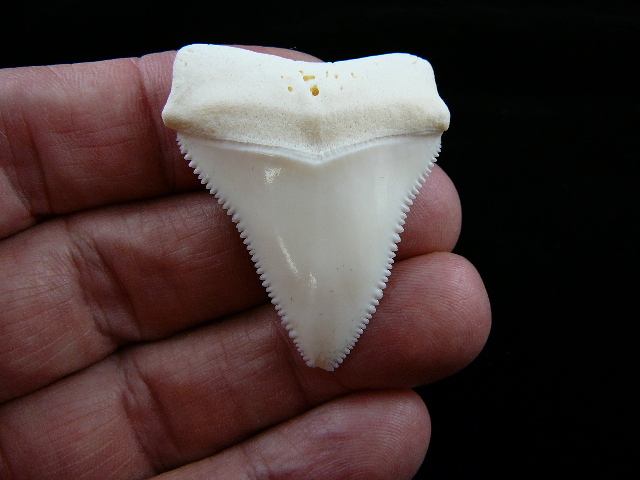 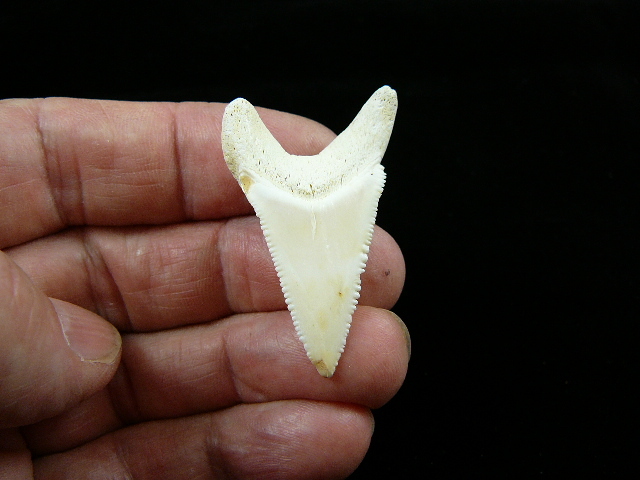 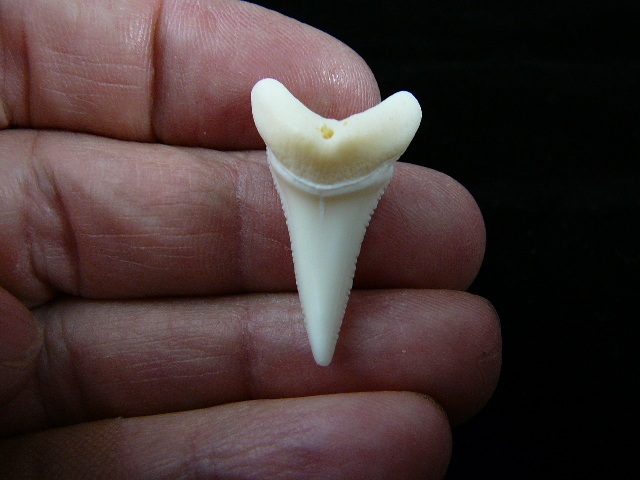 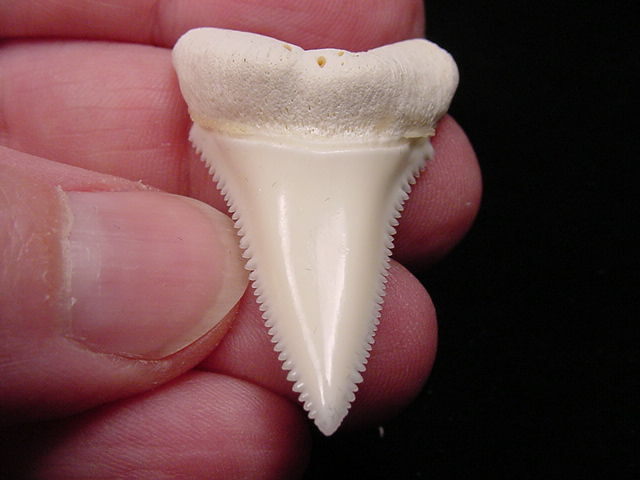 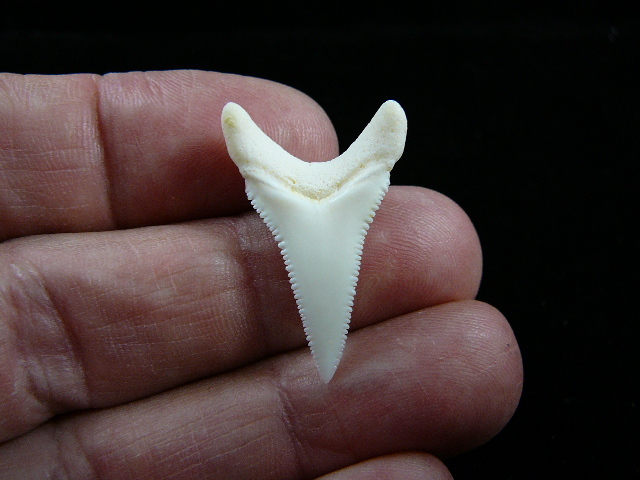 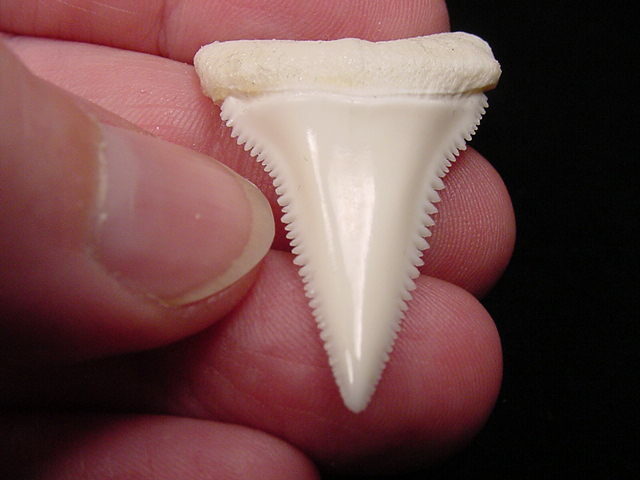 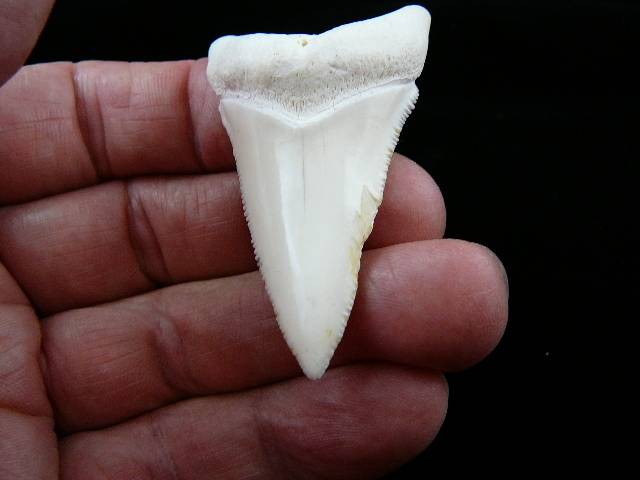 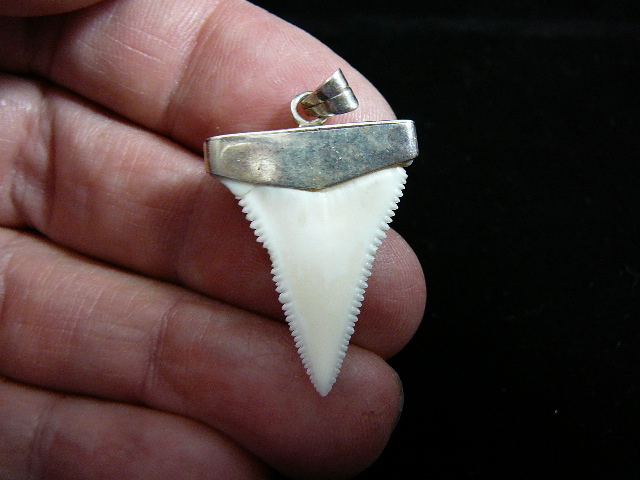 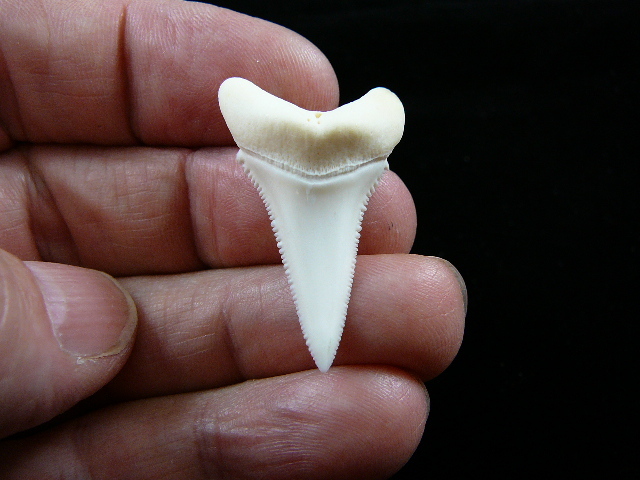 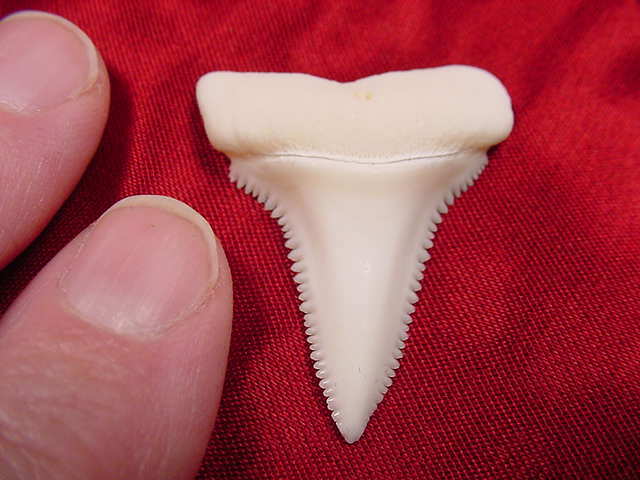 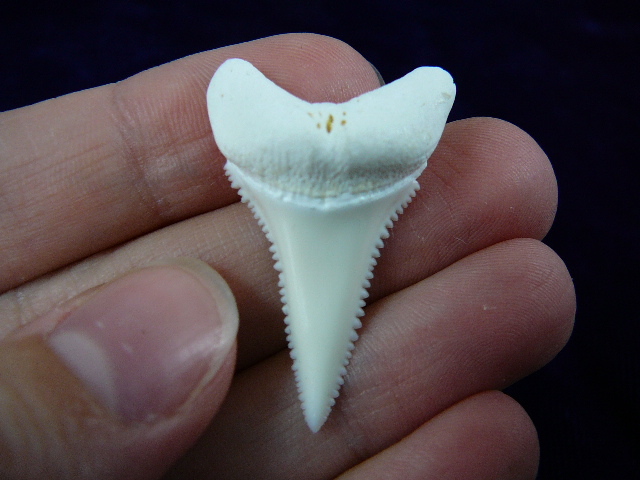 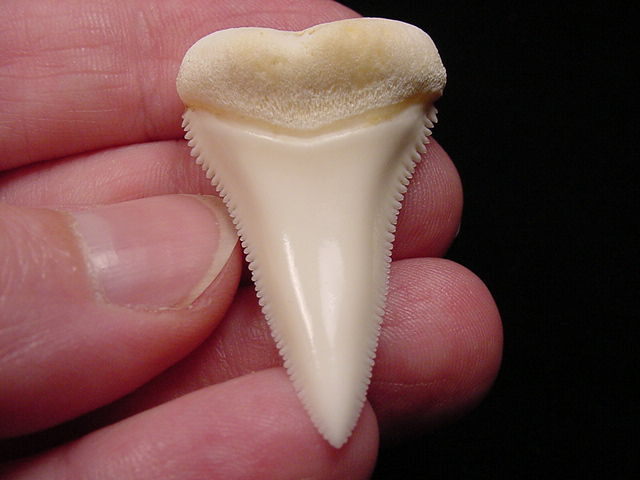 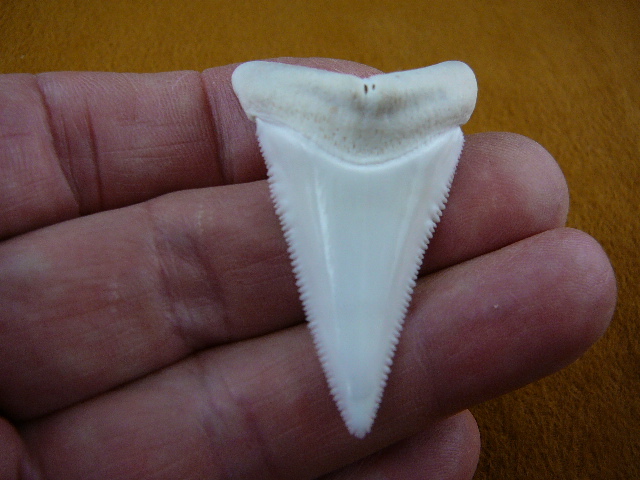 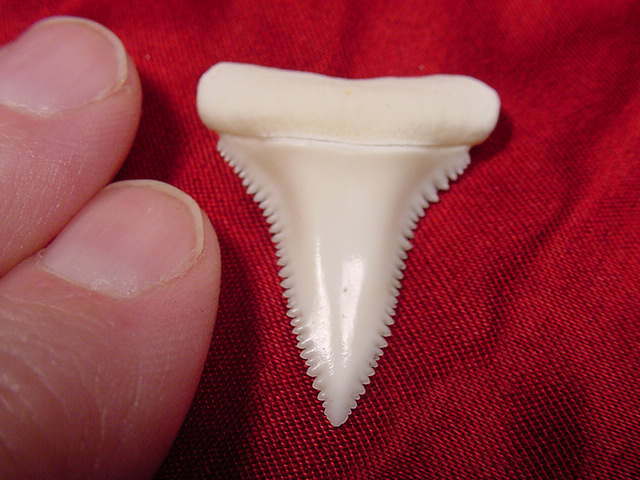 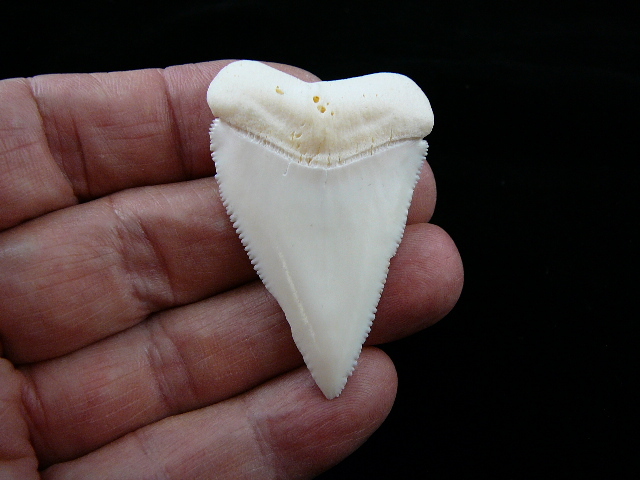 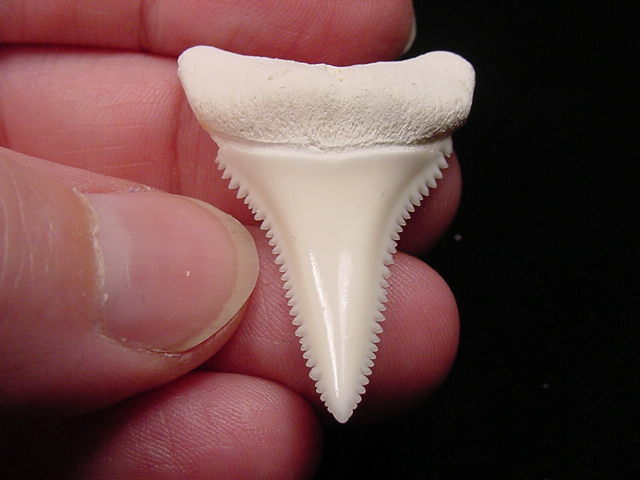 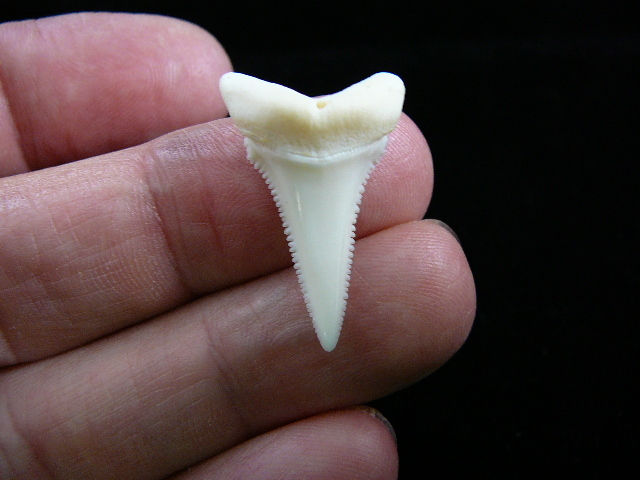 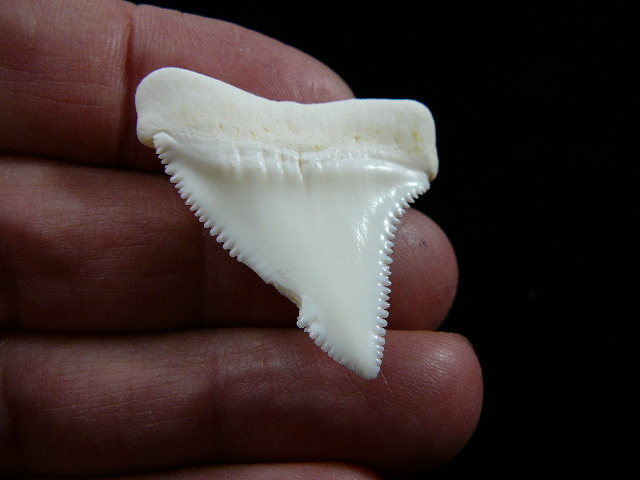 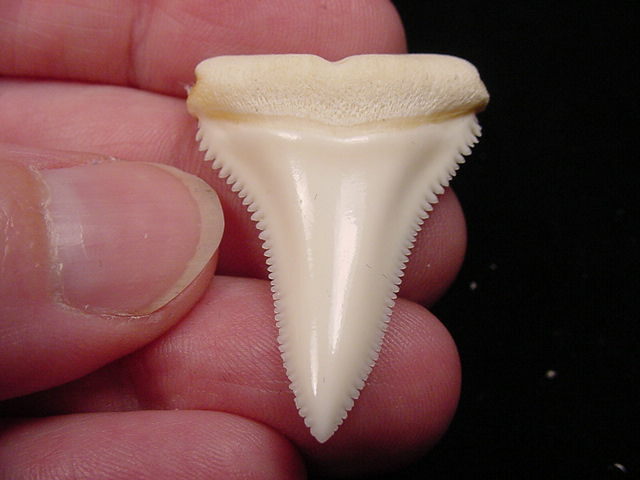 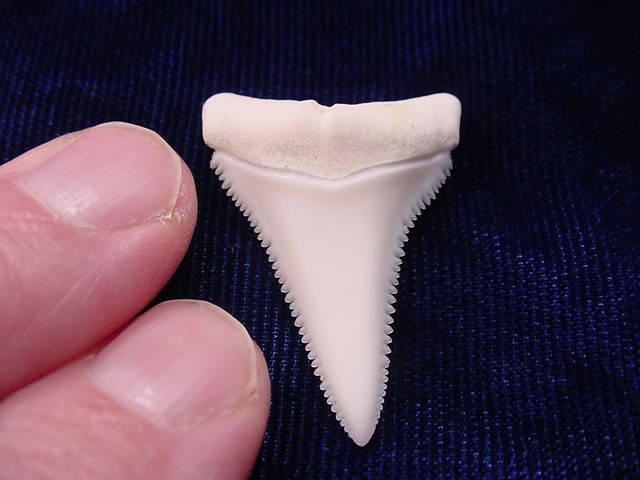 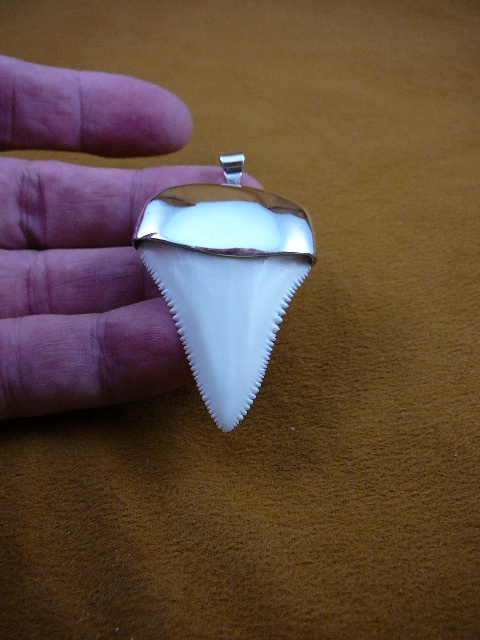 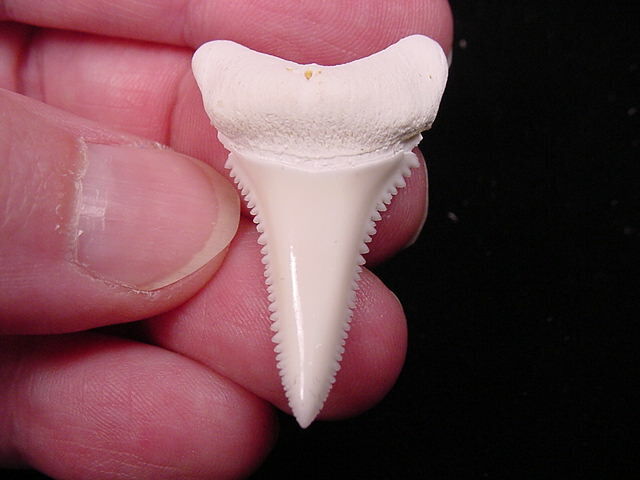 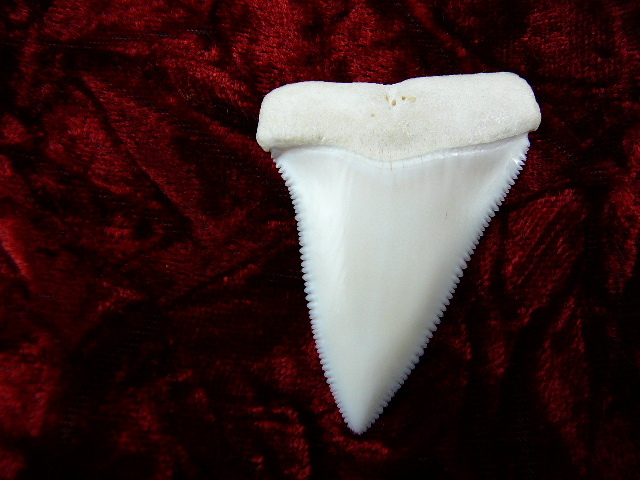 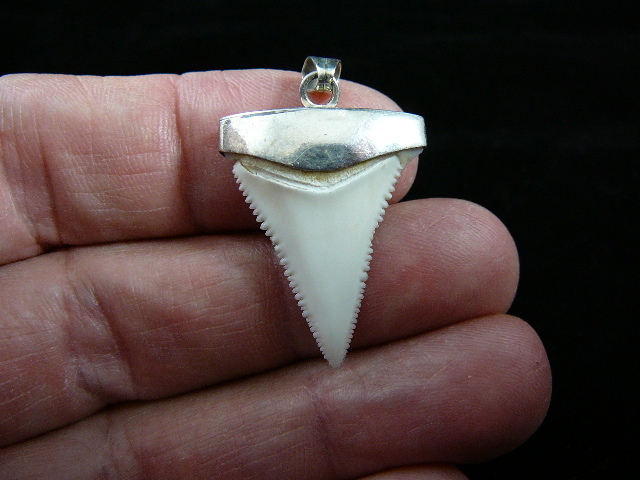 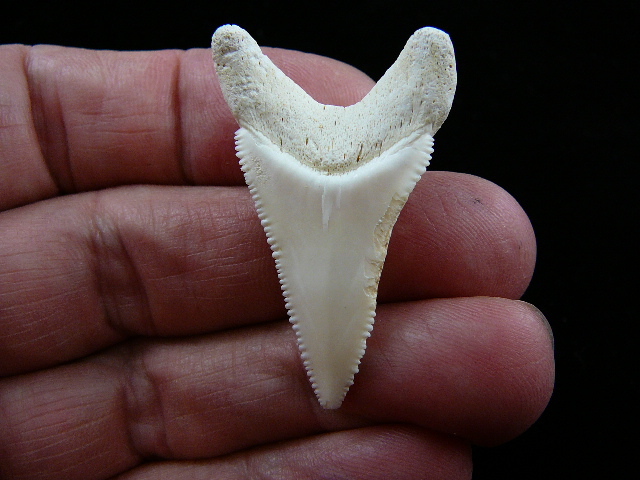 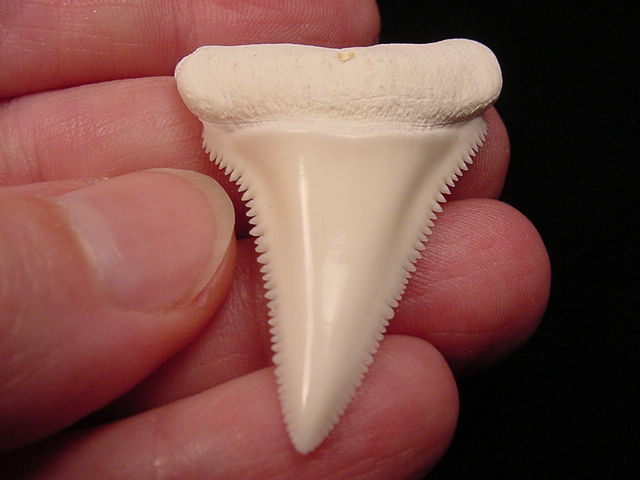 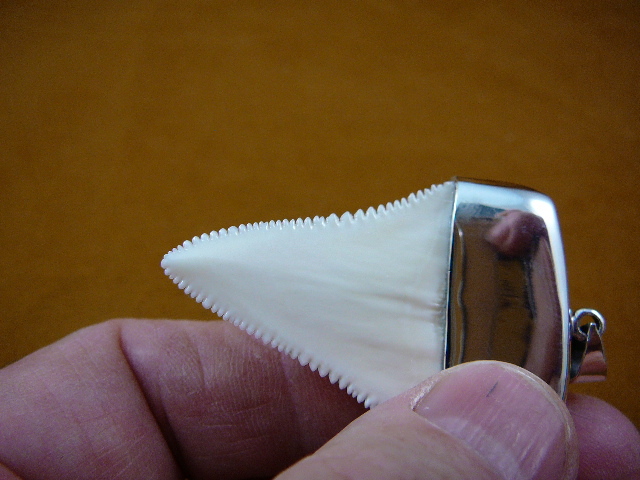 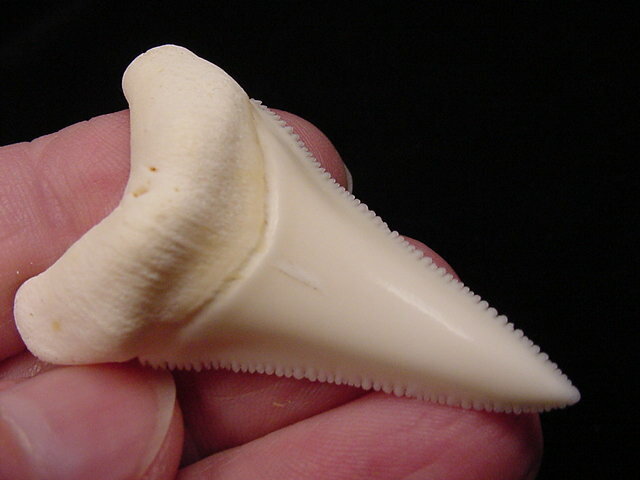 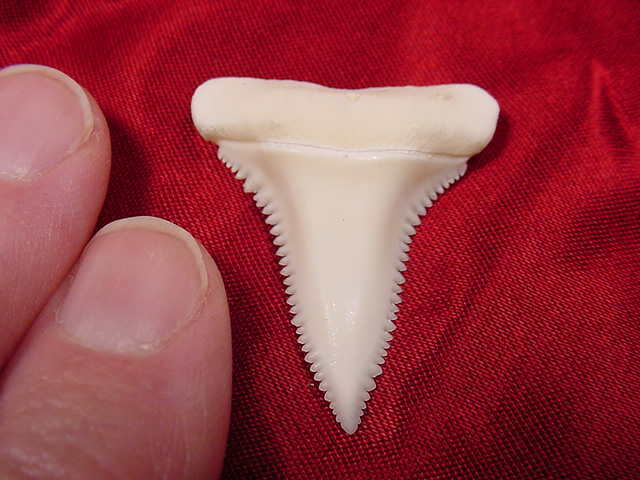 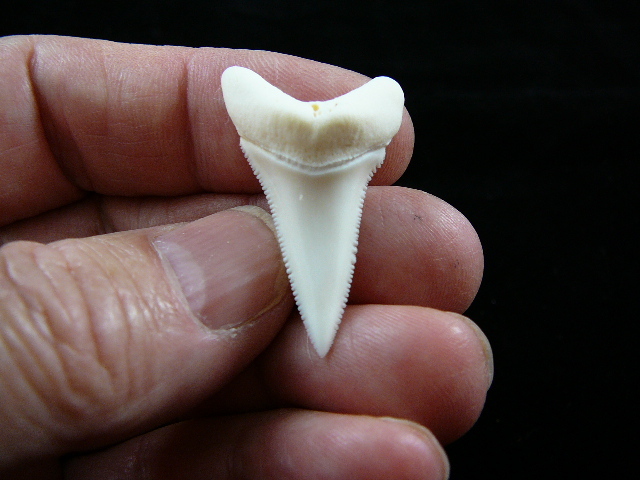 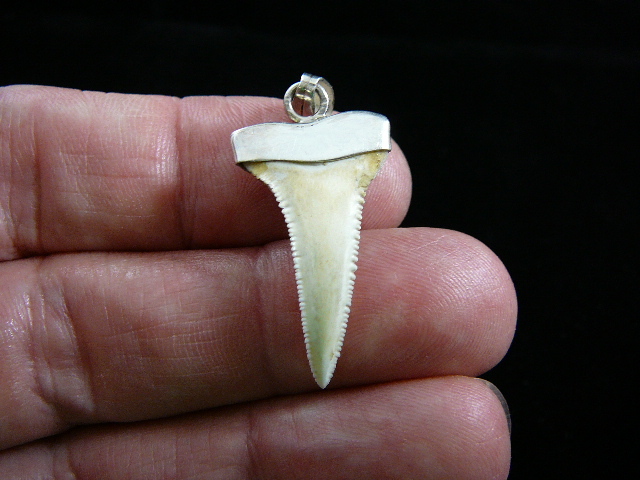 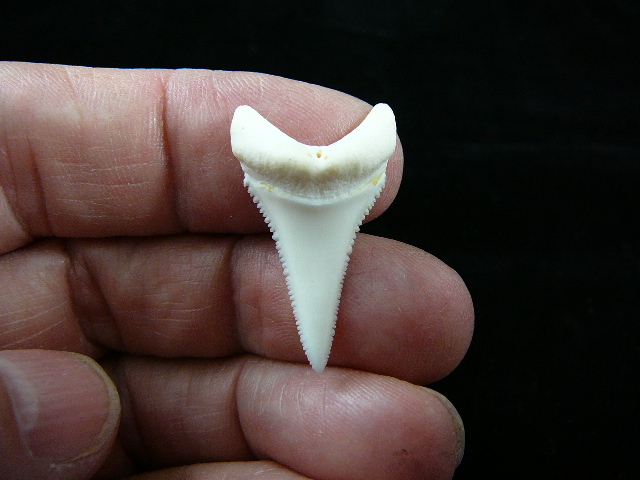 Free USPS Express mail insured shipping anywhere in the U.S.
Genuine Modern GREAT WHITE SHARK TEETH ! 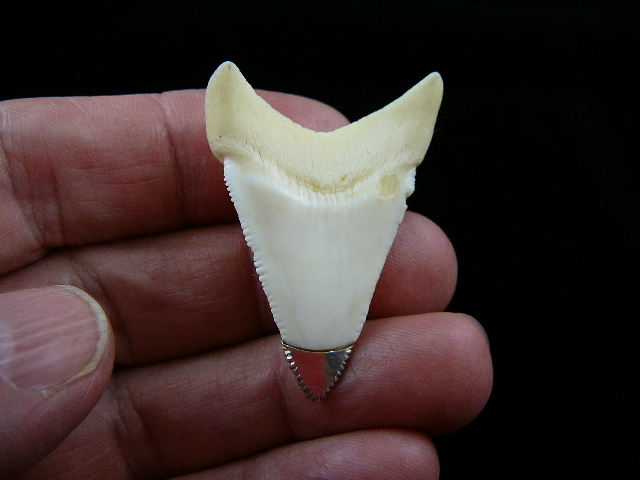 One collection (over 200 teeth) purchased from a West Coast collector we've known for 16 years, due to financial difficulties he has offered the collection to us which we purchased. 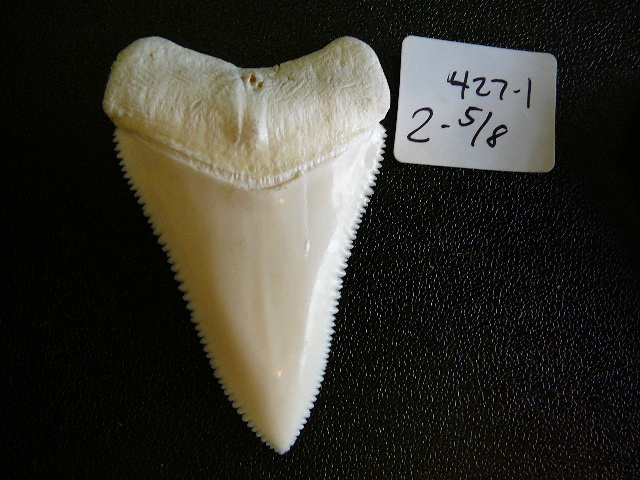 Second collection of 647 teeth was acquired from an East Coast collector who has been in the shark tooth business for 35 years. 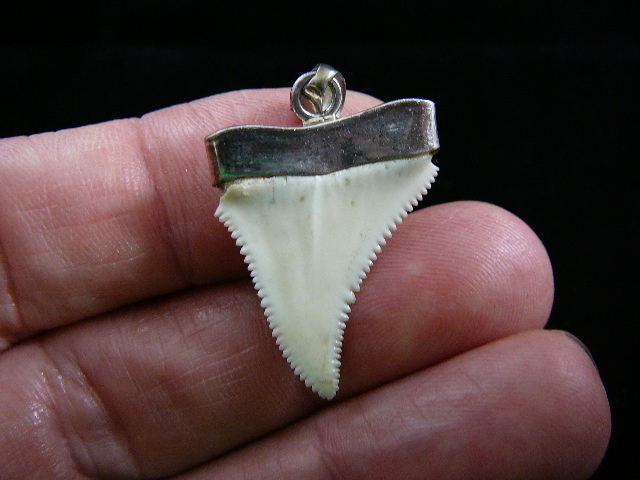 Many are museum quality, any deviations from this are duly noted. 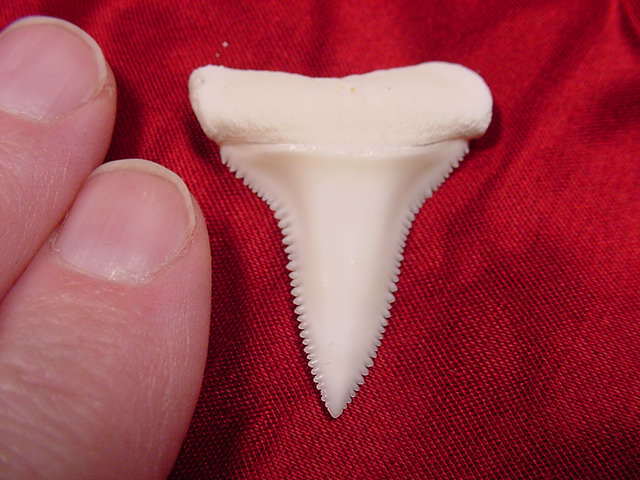 They are below, from largest to smallest. 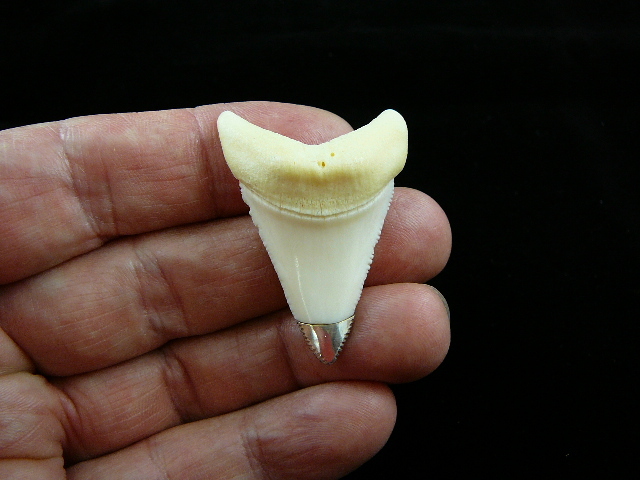 Prices are based on size and perfection of each tooth.TOOTH MEASUREMENTS are from the bottom tip, along the longest side, to the top of the root. 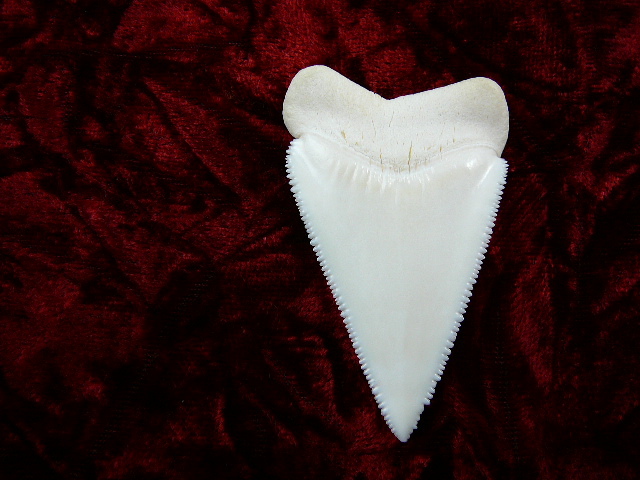 Every collection we buy is higher priced than the last because large collections have already been sold off; to our knowledge there is one remaining collection of 200+ teeth by a private California collector that we are continuing to negotiate with. 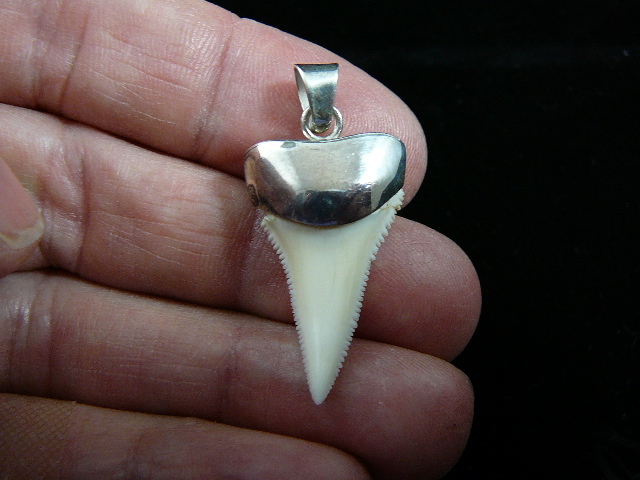 We do not gold or silver cap teeth, the ones available below this group have been already capped for us. 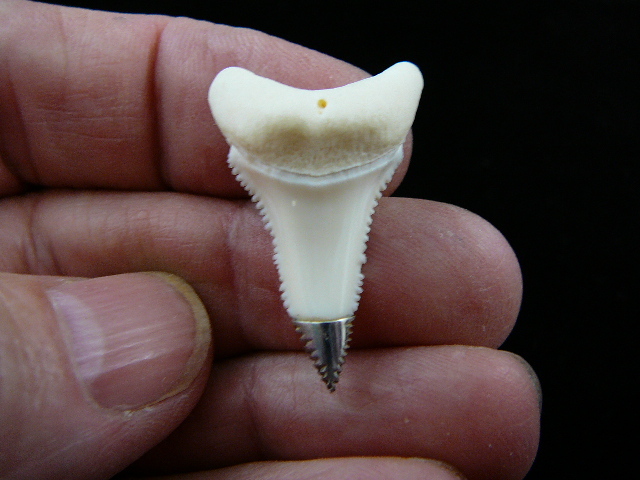 If you want one of the natural teeth capped, you can: 1) take it to a local jeweler, 2) take it to your local dentist for capping, or 3) contact Gary Olt in the blue box near the bottom of the page for a quote. 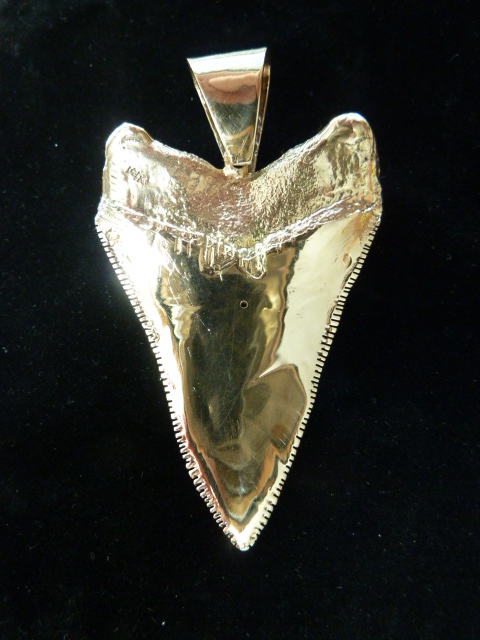 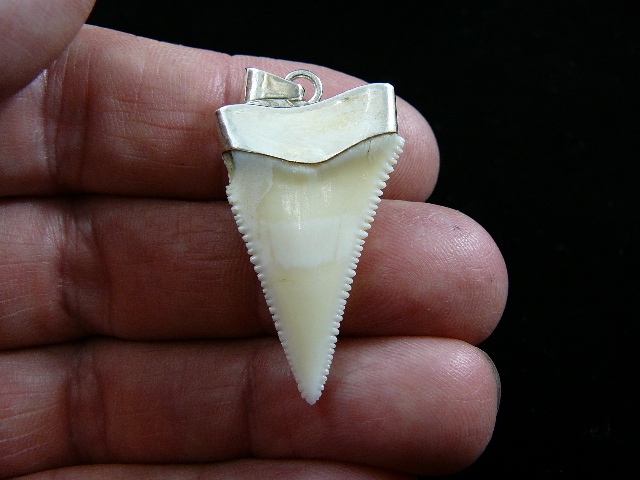 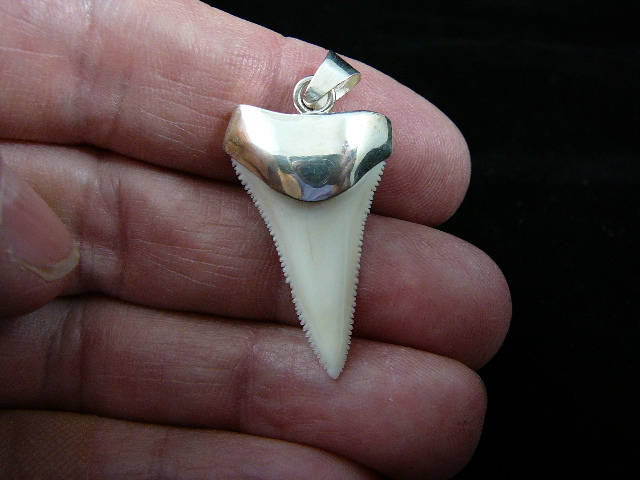 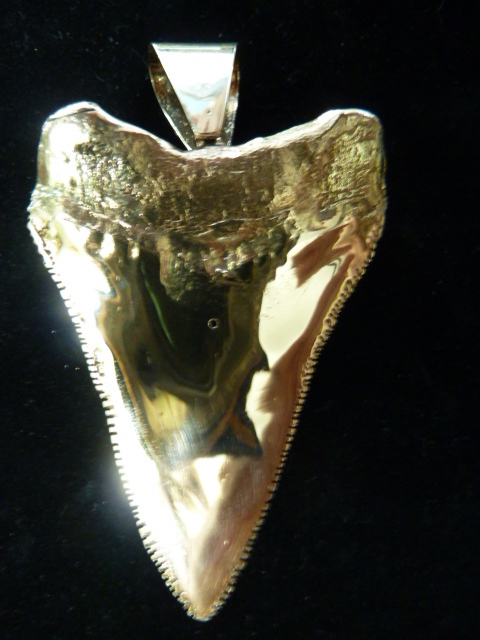 Teeth can be wired as a pendant for an additional $6 charge for silver, $10 for gold, and would include a 20" black suede necklace. 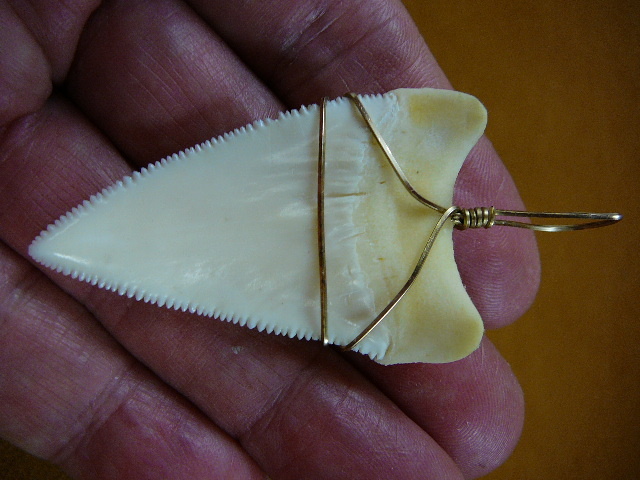 OR, BUILD A NECKLACE, see details on SHARKS PAGE 1 . 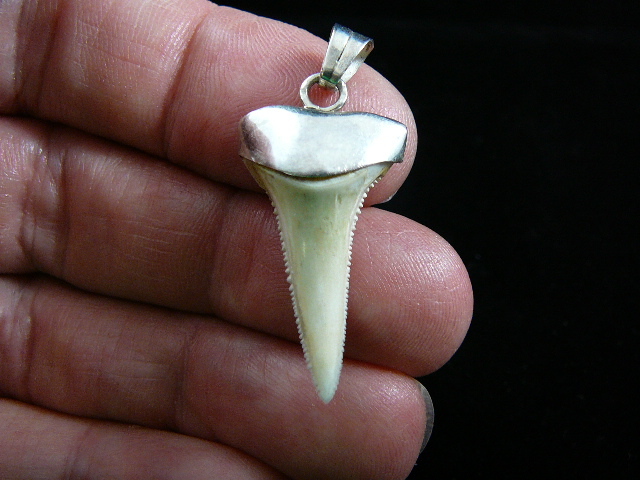 All inventory is UPDATED EVERY 24 HOURS. 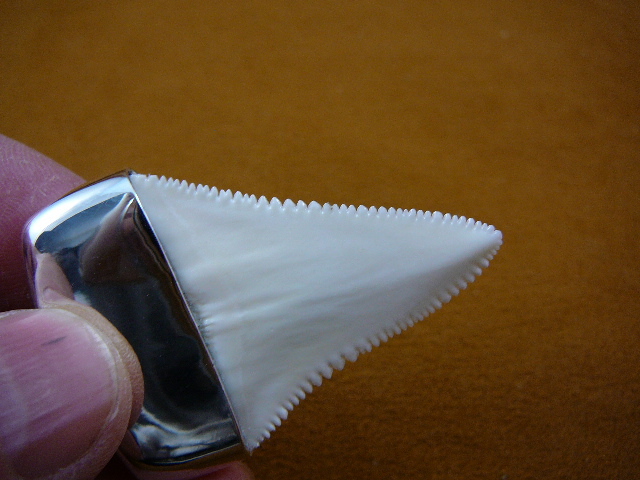 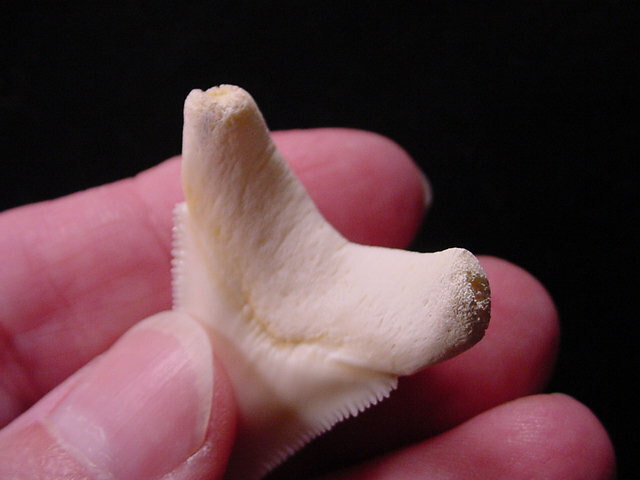 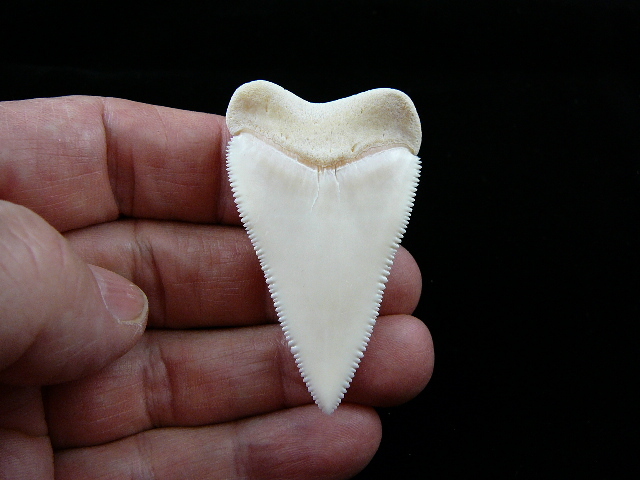 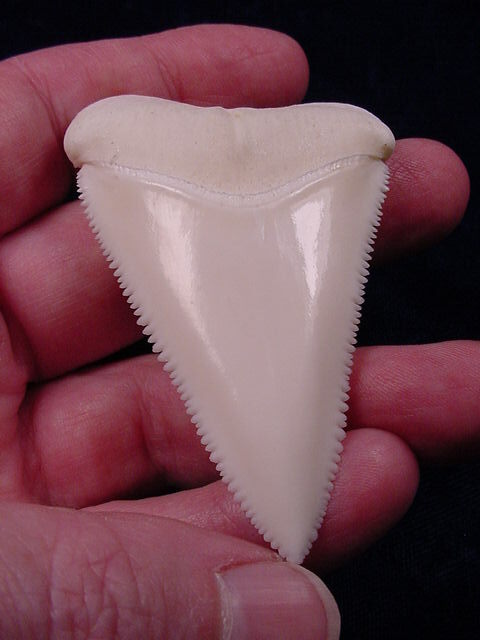 This entire page is dedicated to genuine GREAT WHITE SHARK TEETH. 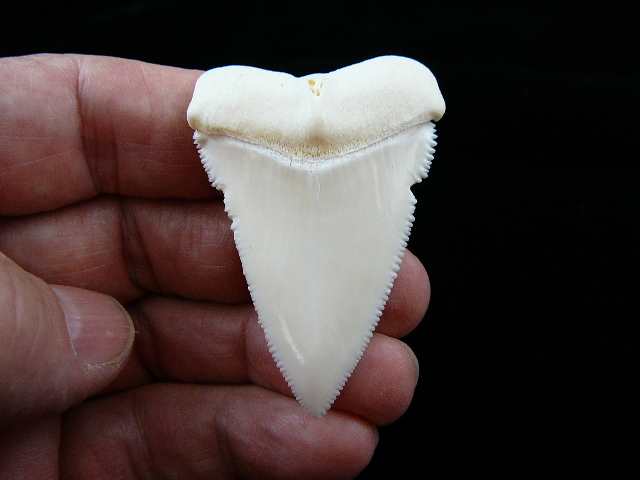 The teeth have come from a large great white (genuine Carcharodon Carcharius) caught before December of 1998; after this time they were declared protected, then endangered, so no great whites have been caught since that time. 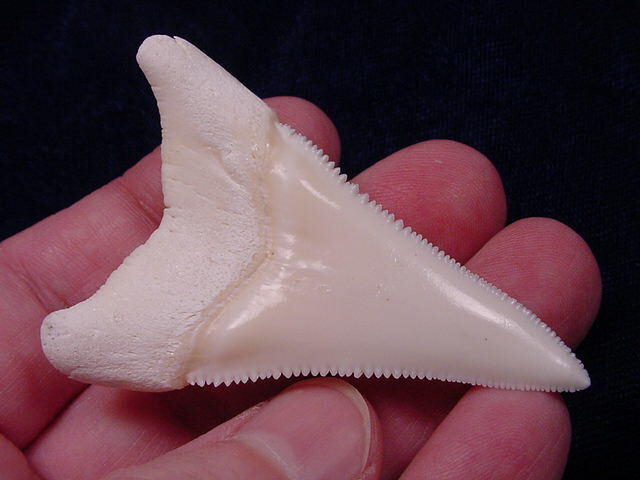 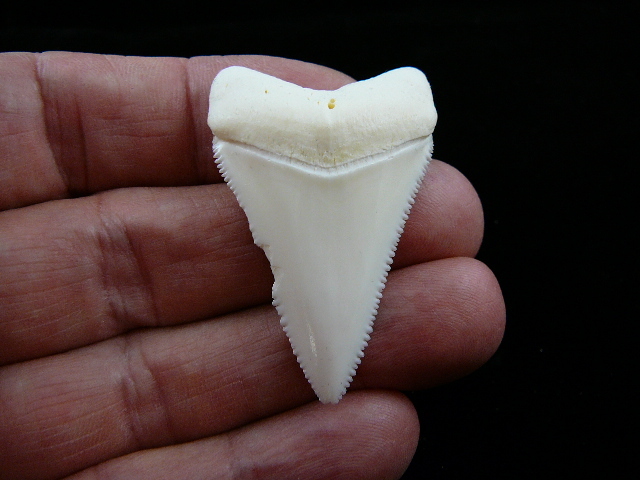 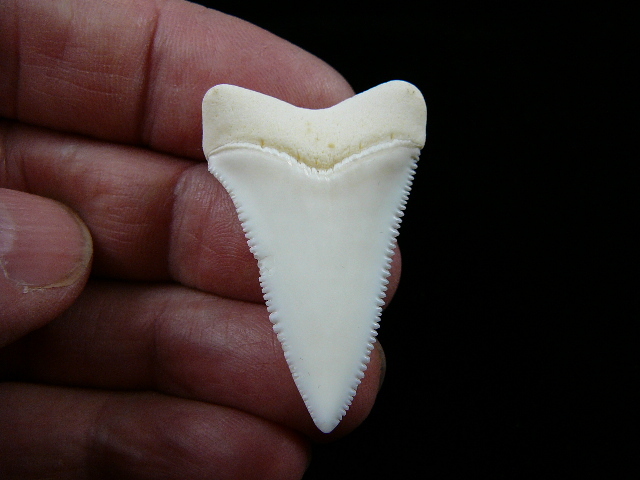 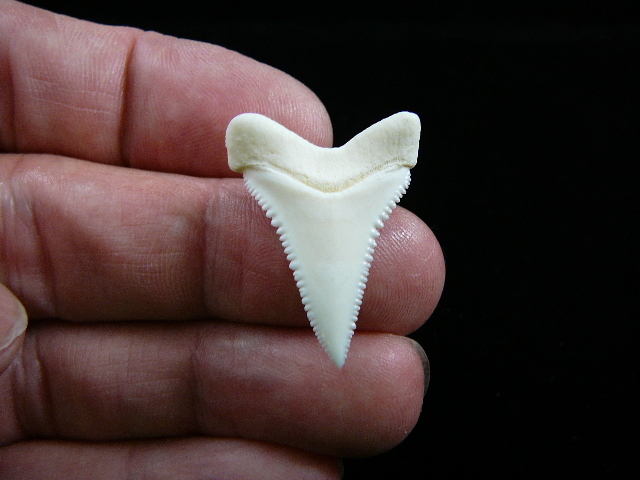 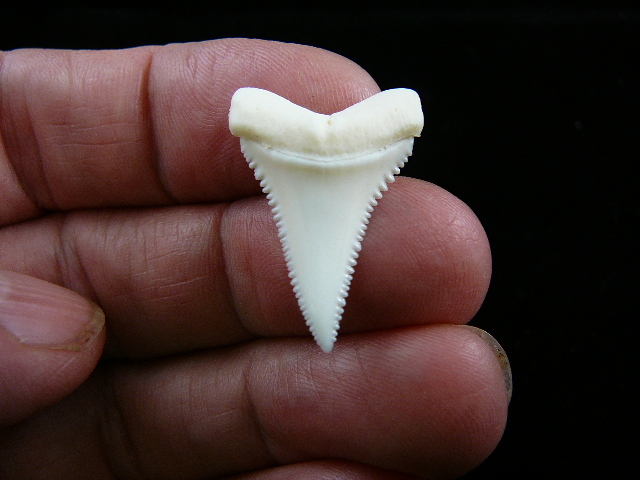 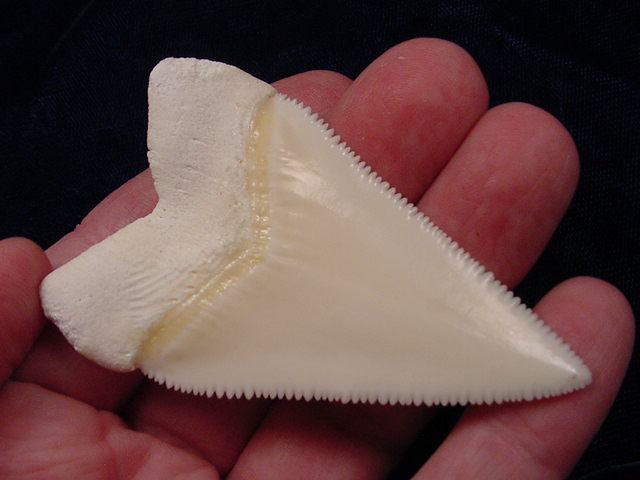 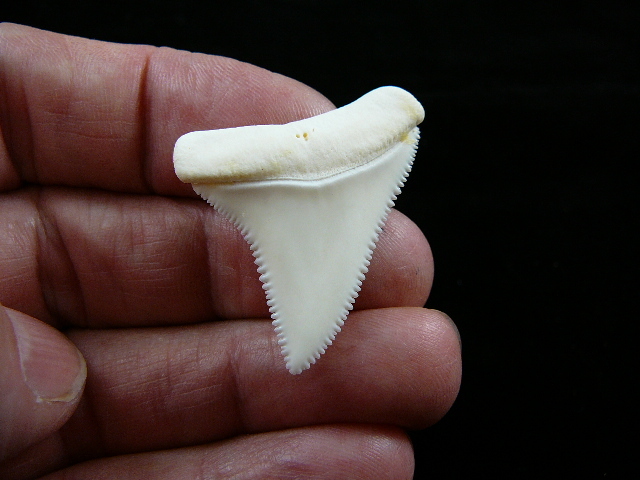 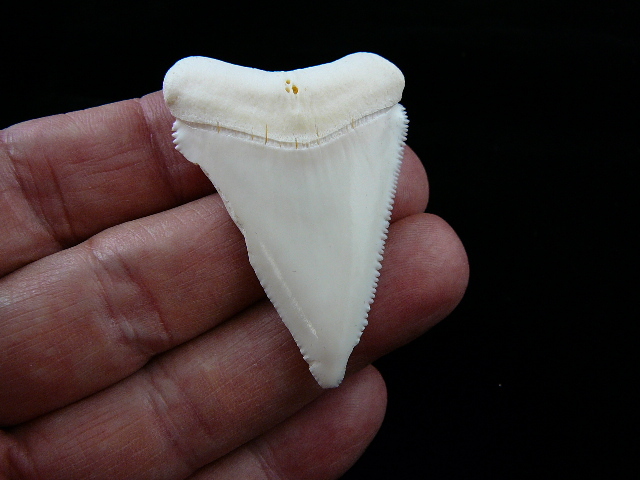 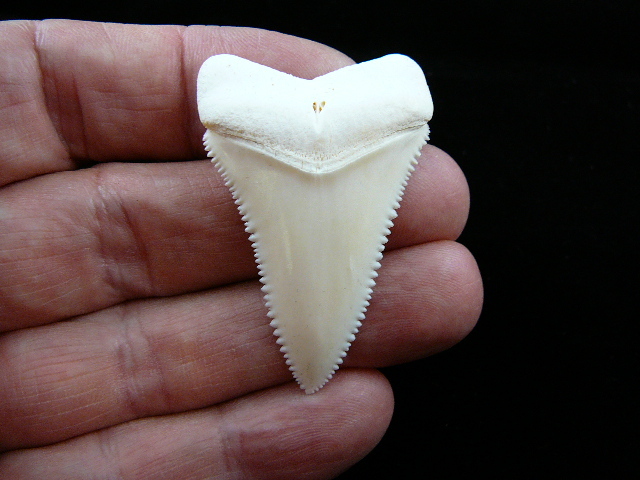 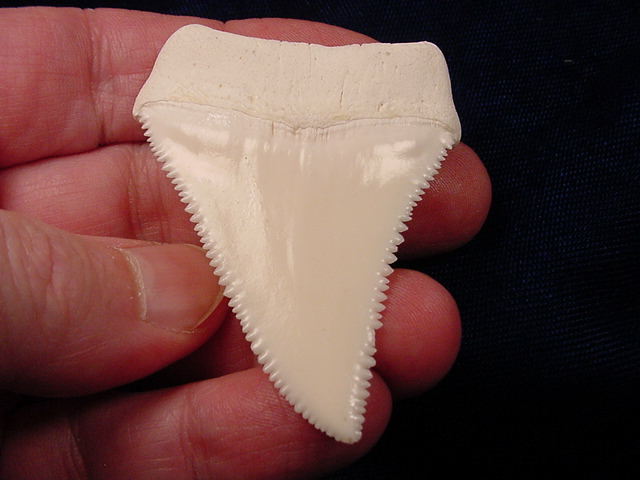 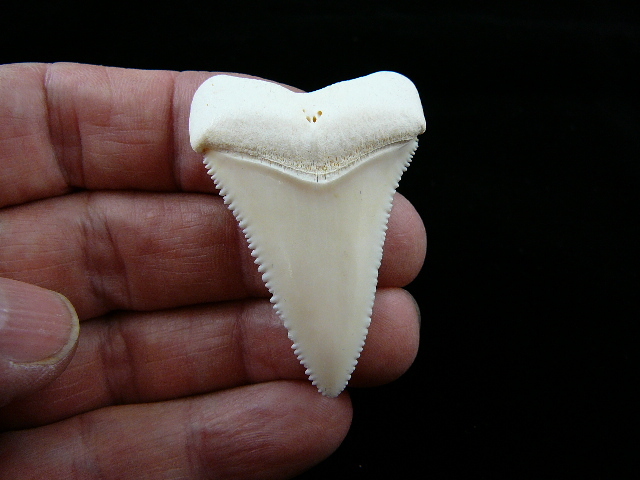 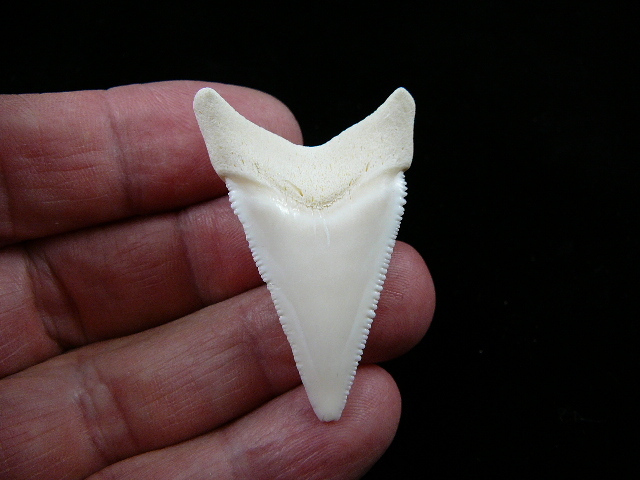 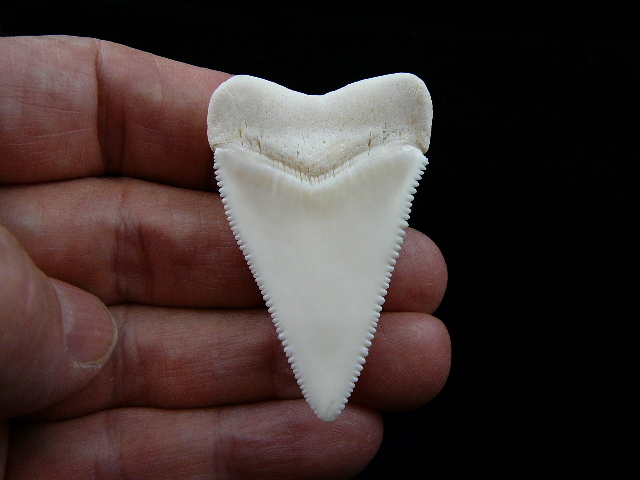 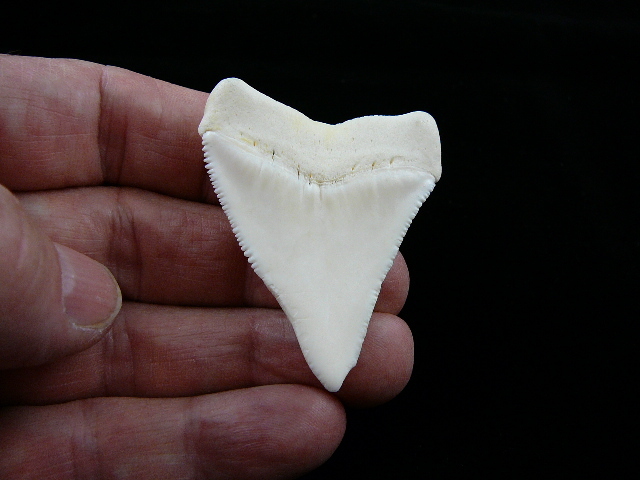 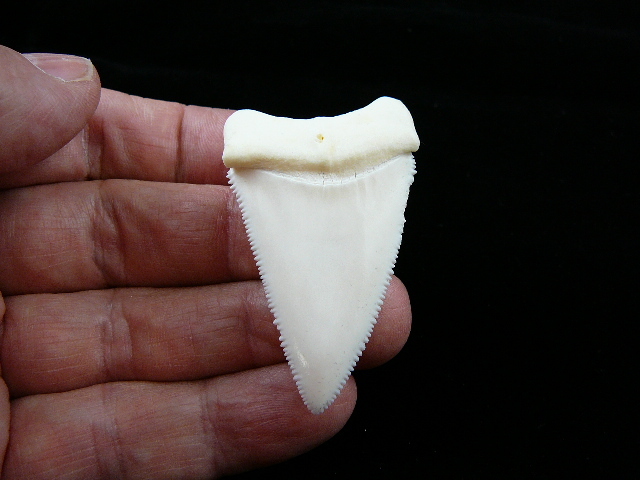 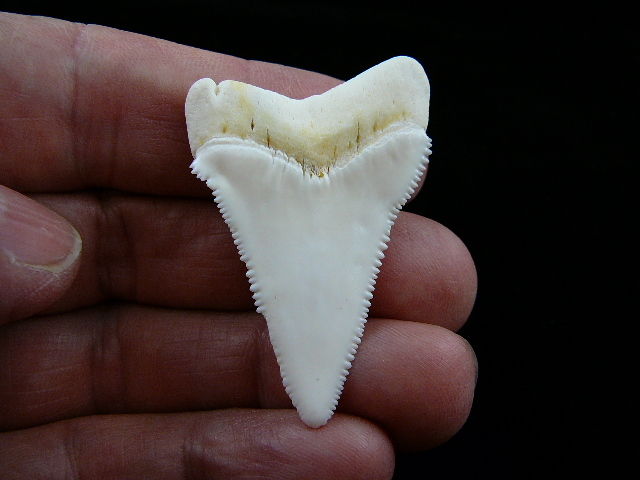 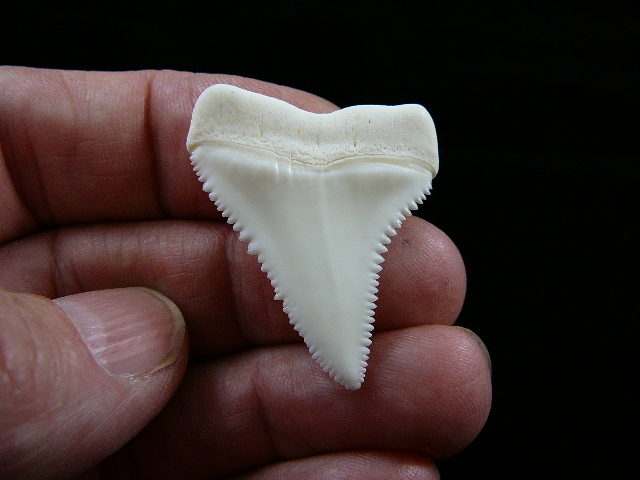 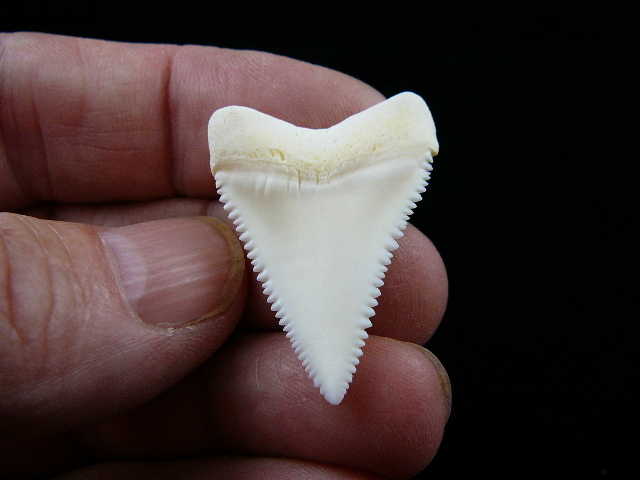 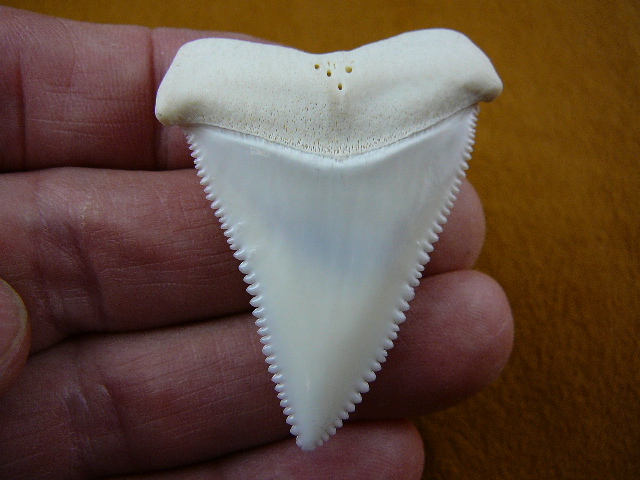 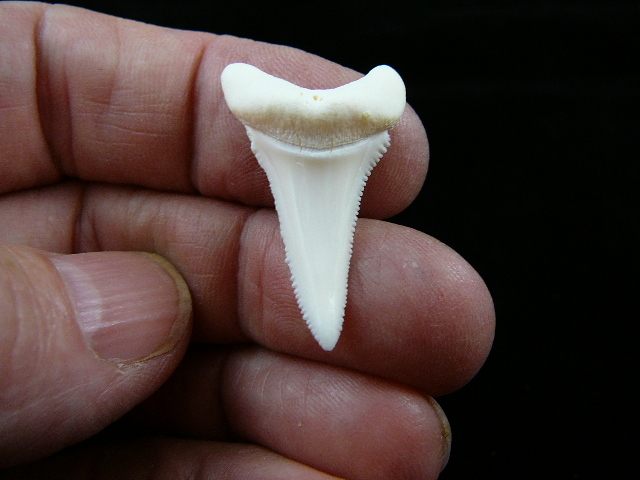 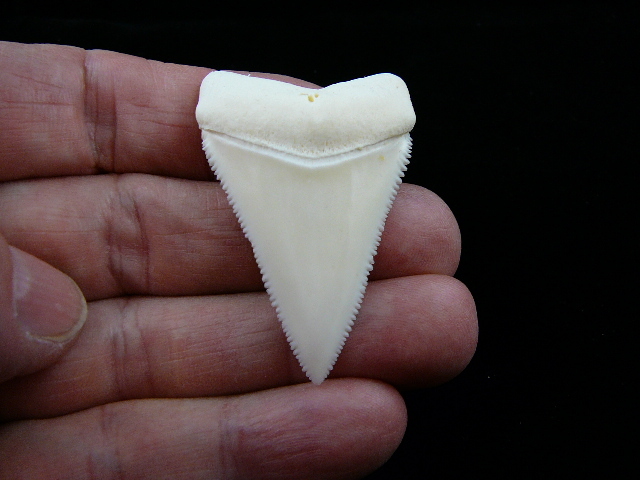 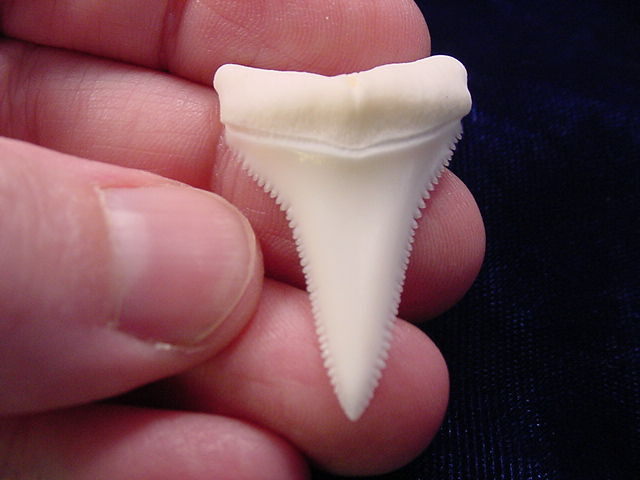 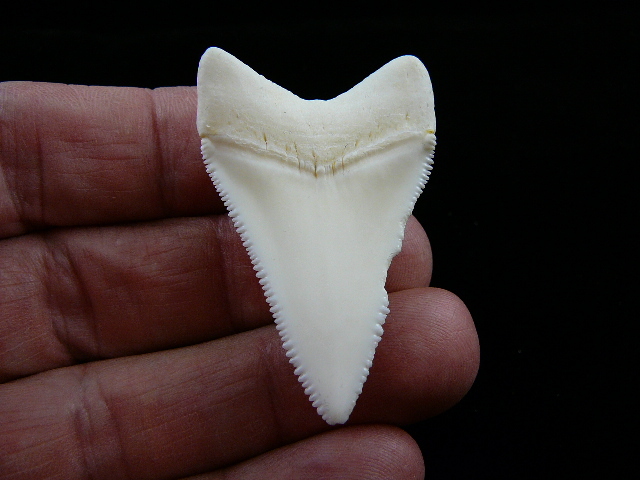 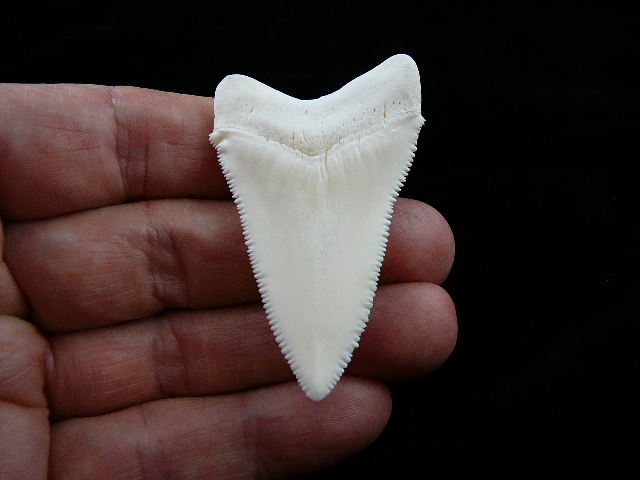 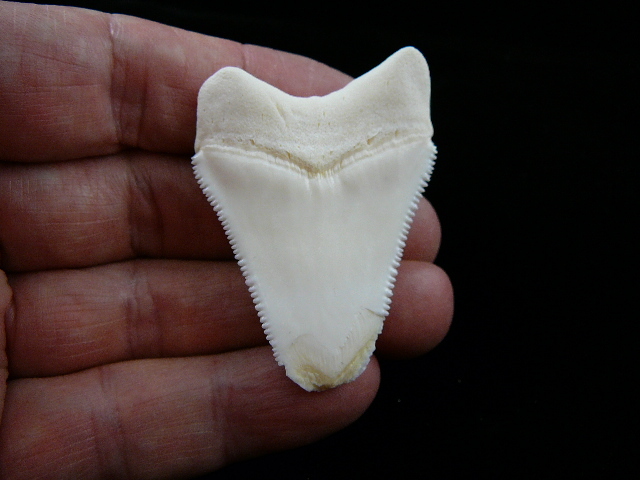 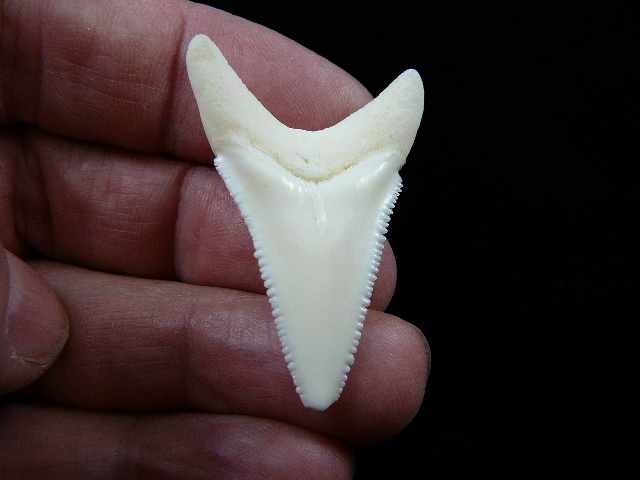 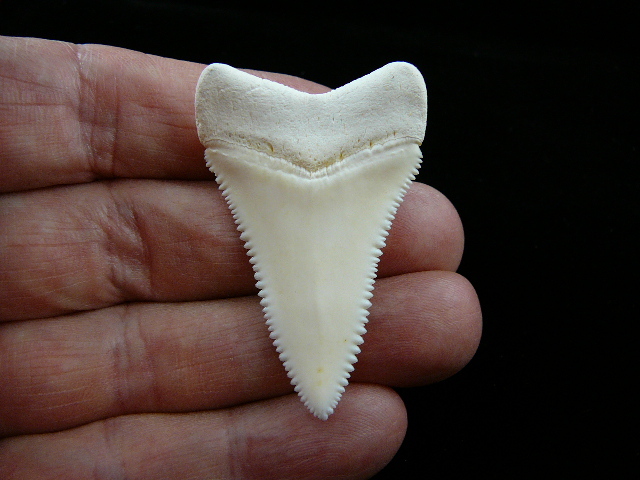 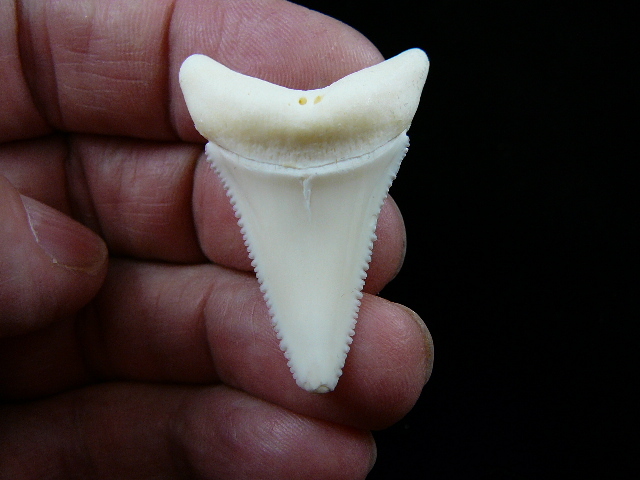 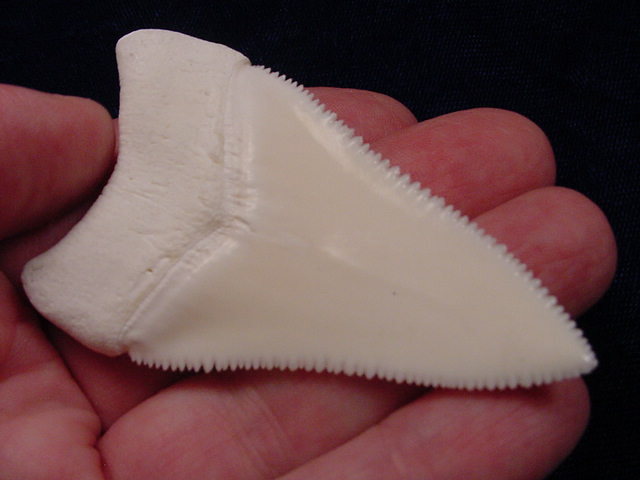 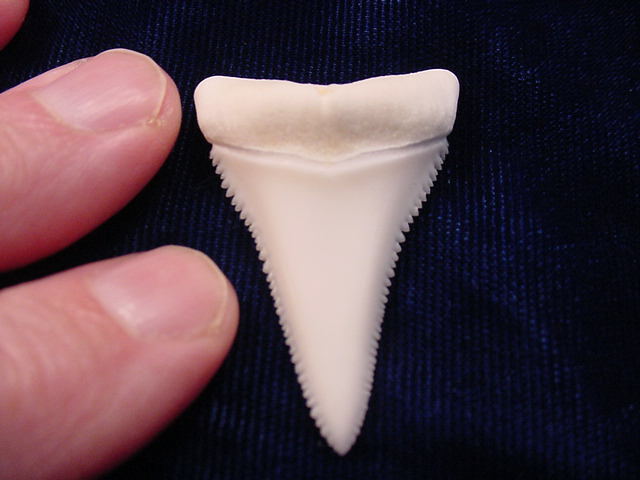 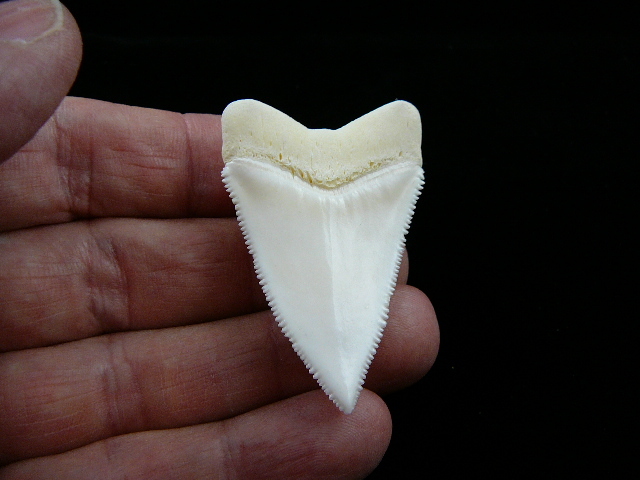 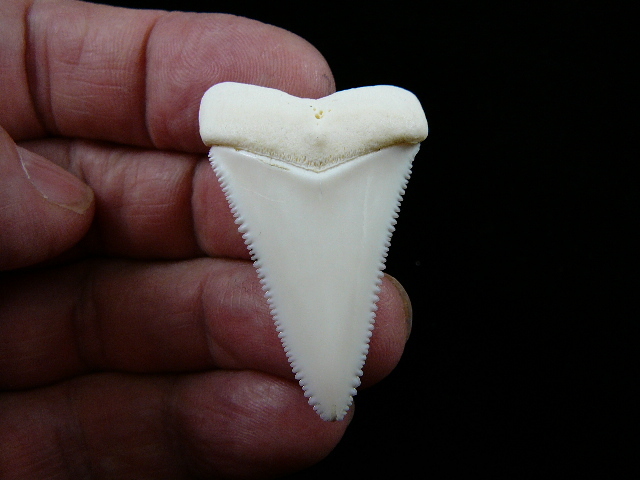 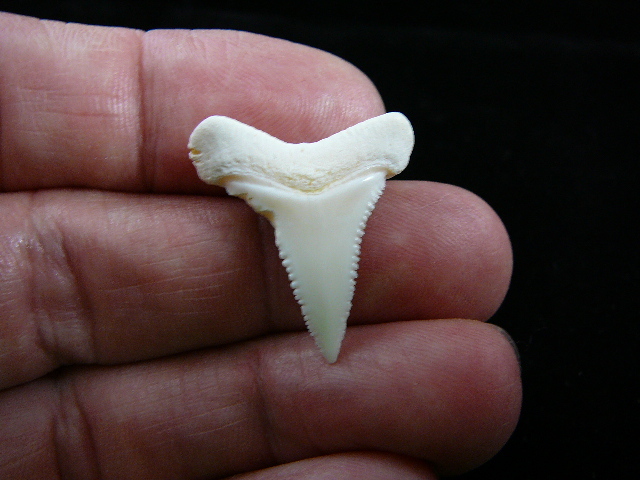 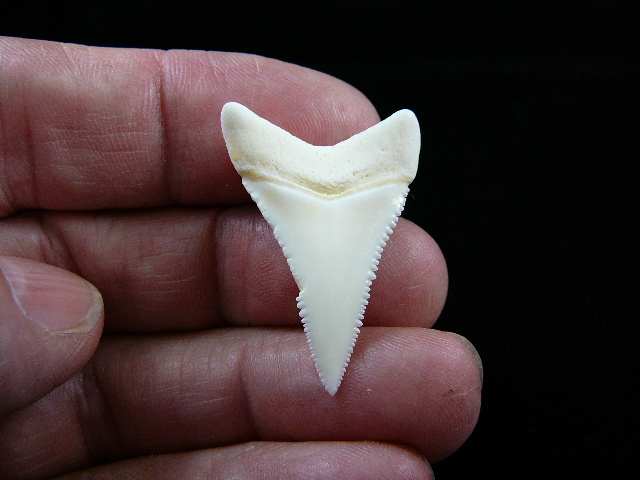 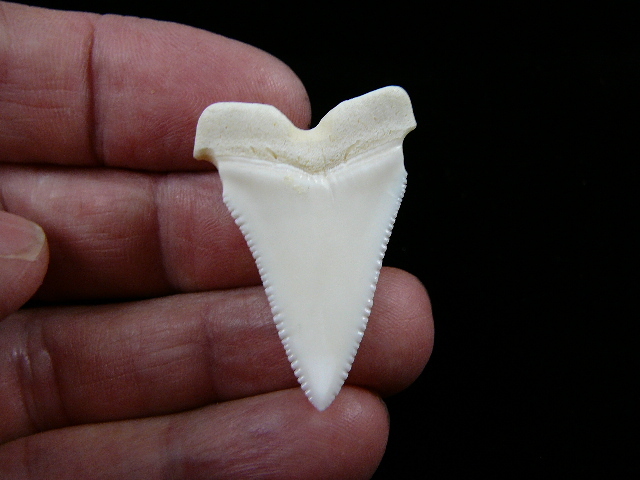 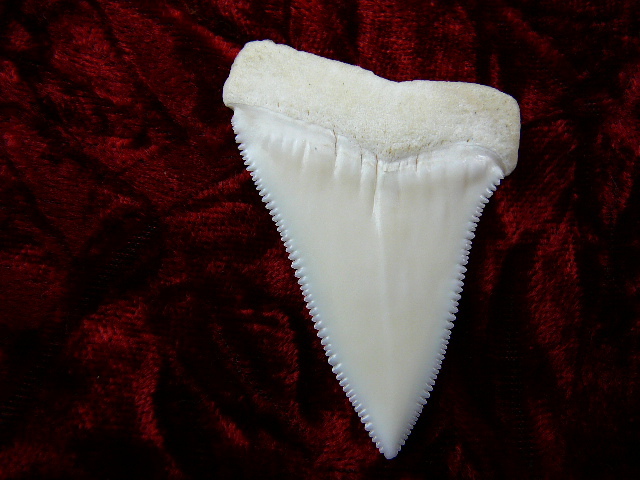 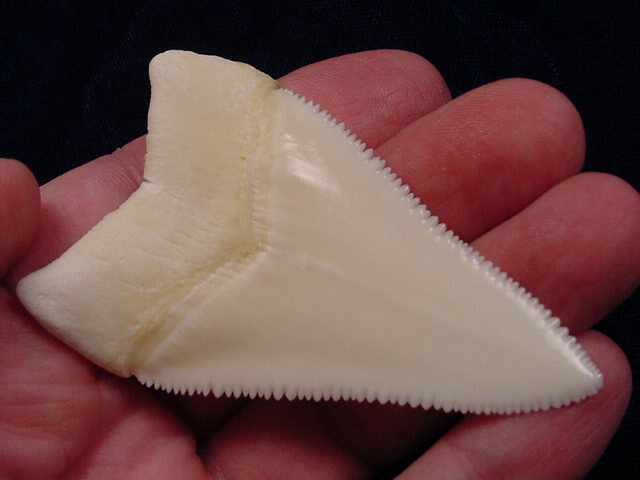 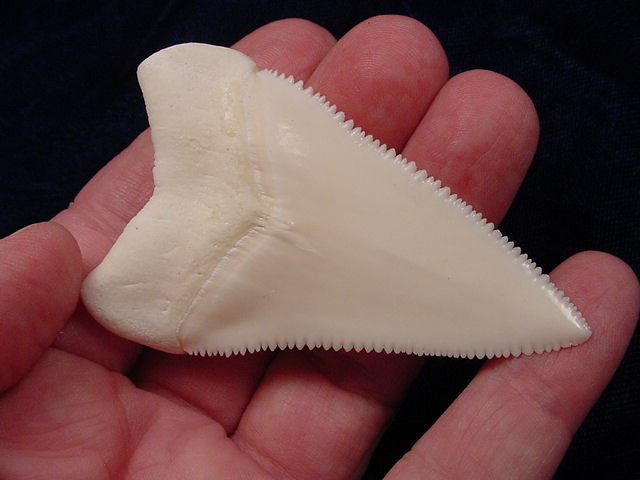 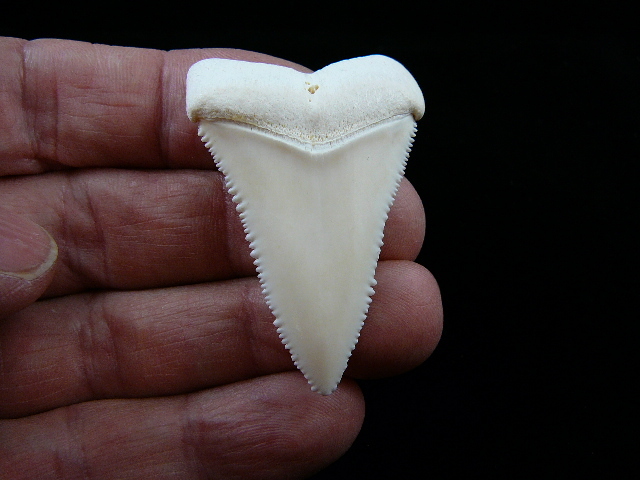 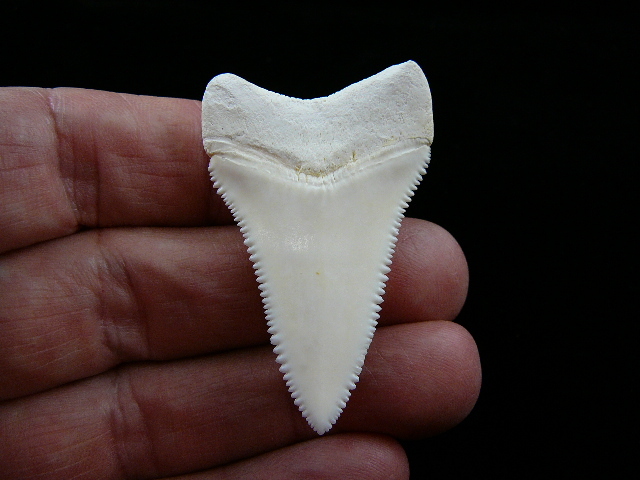 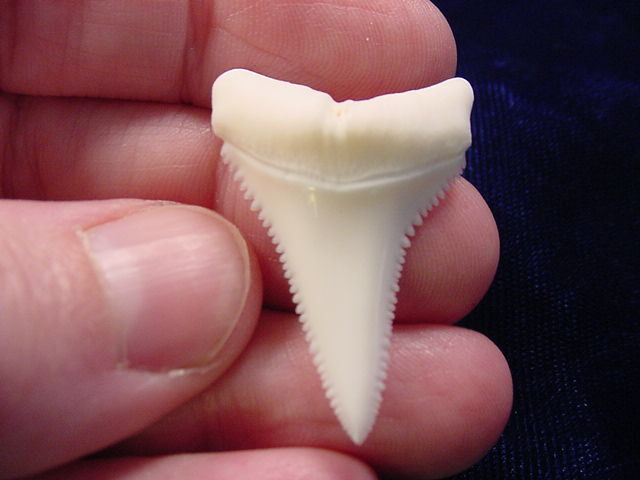 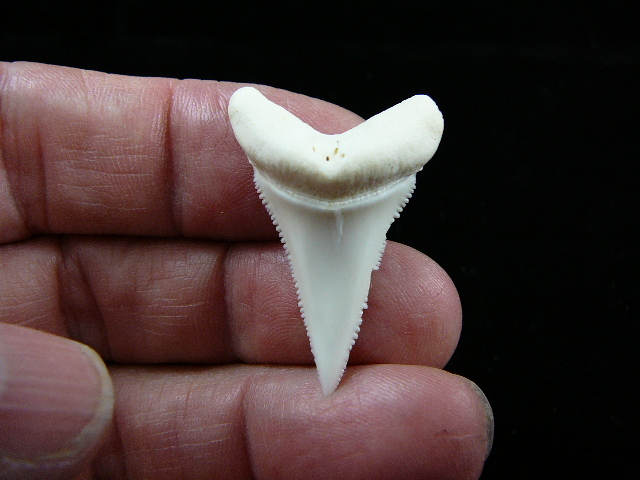 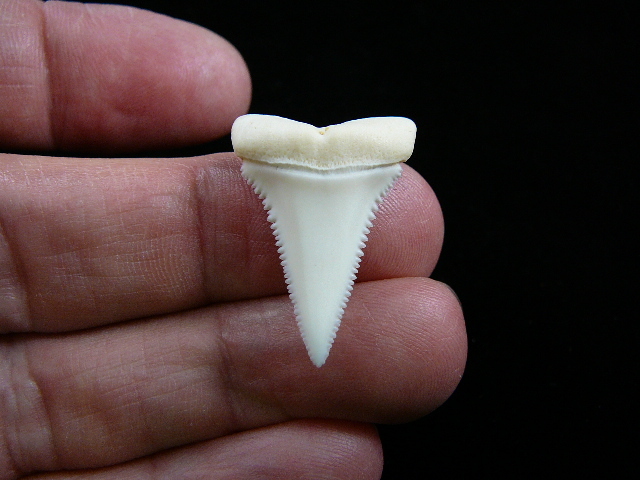 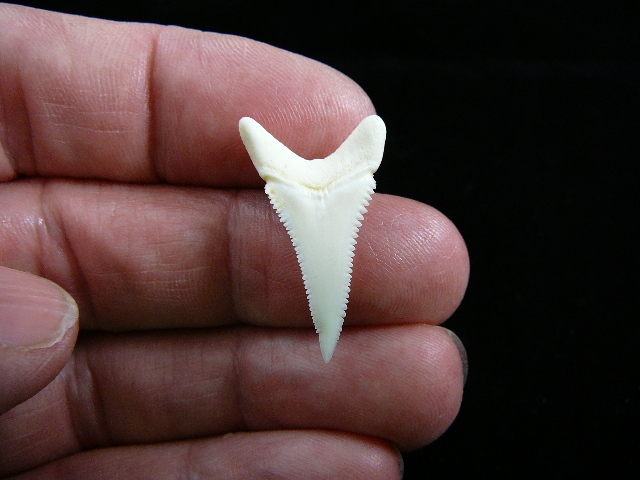 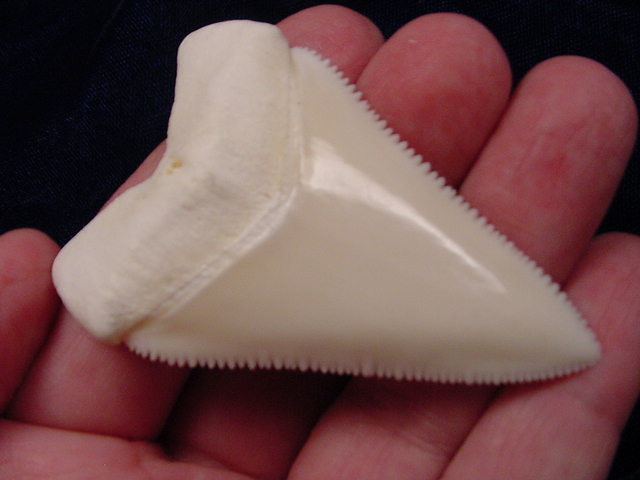 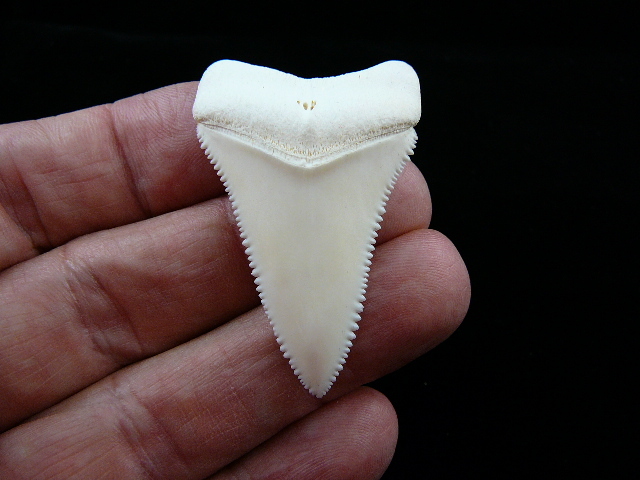 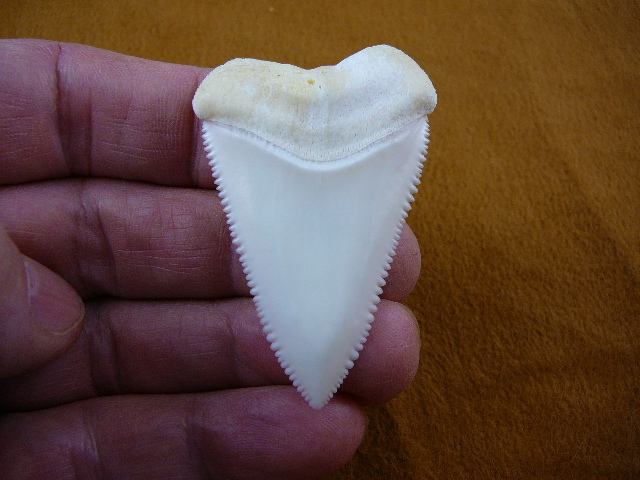 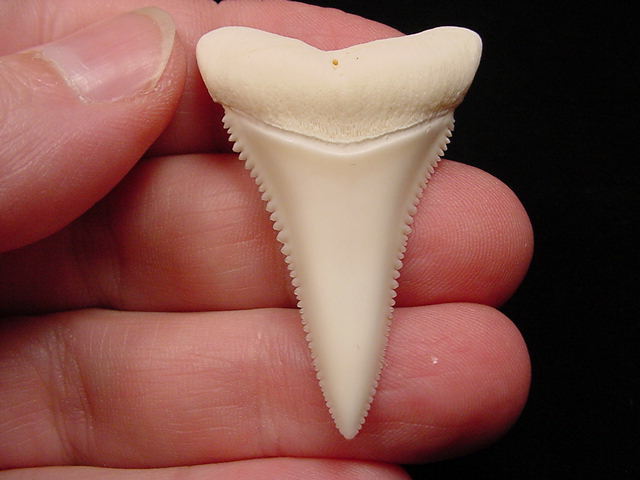 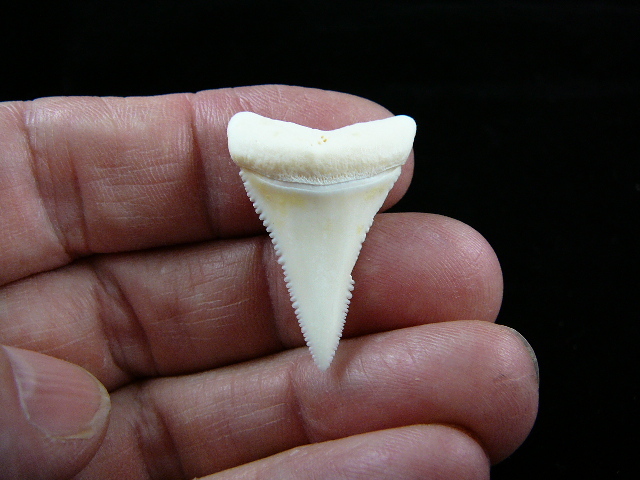 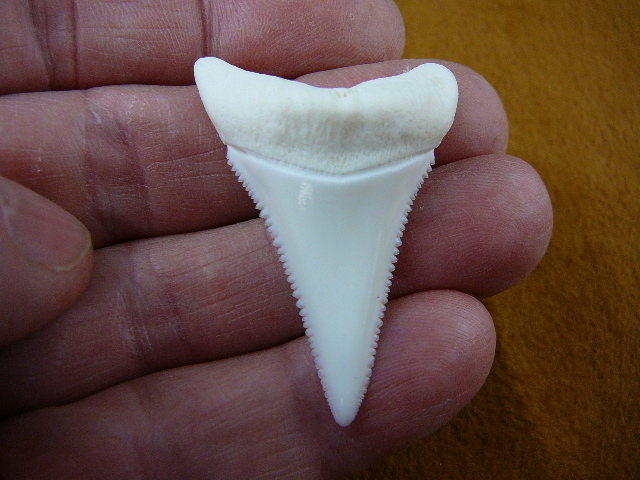 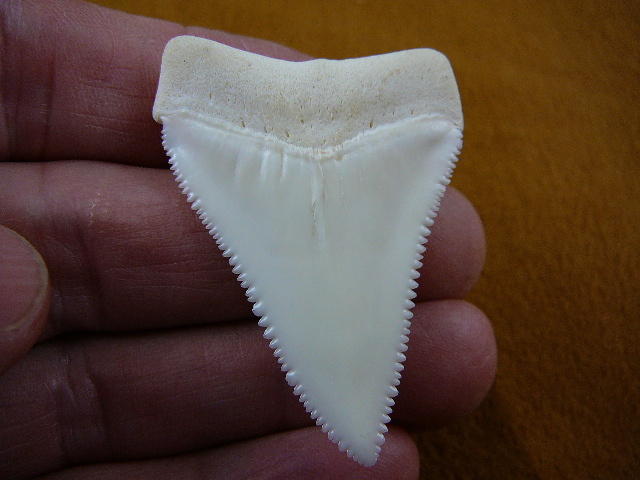 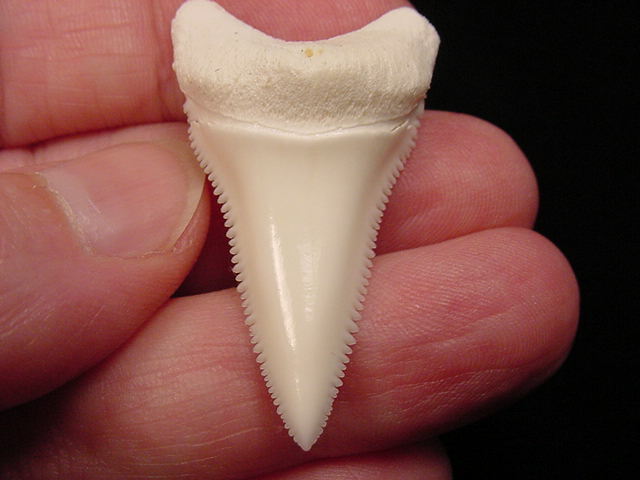 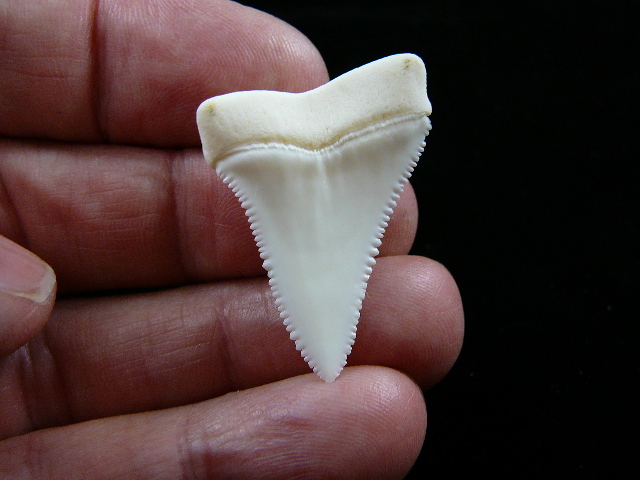 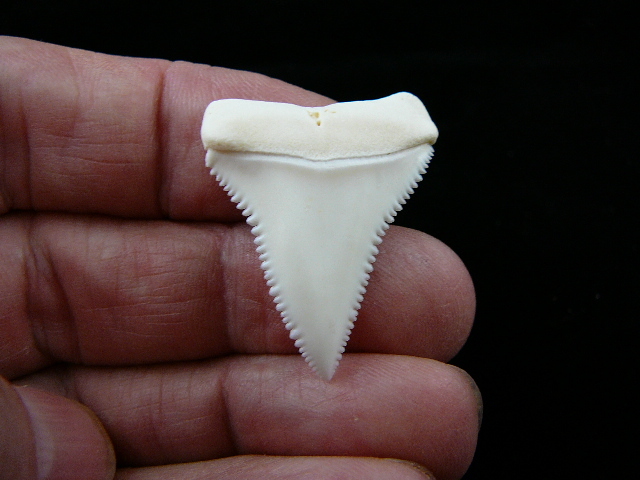 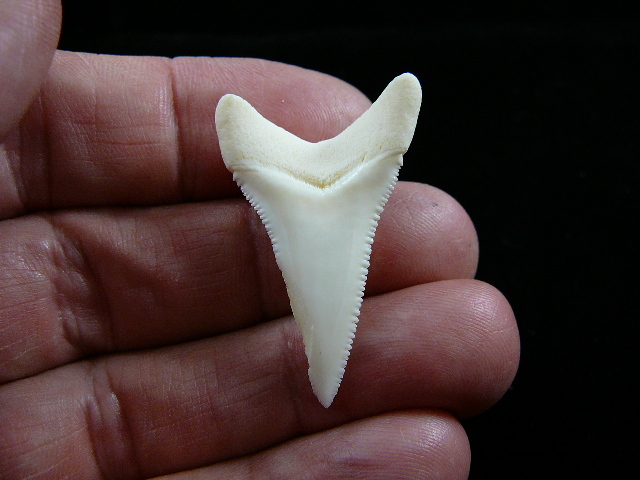 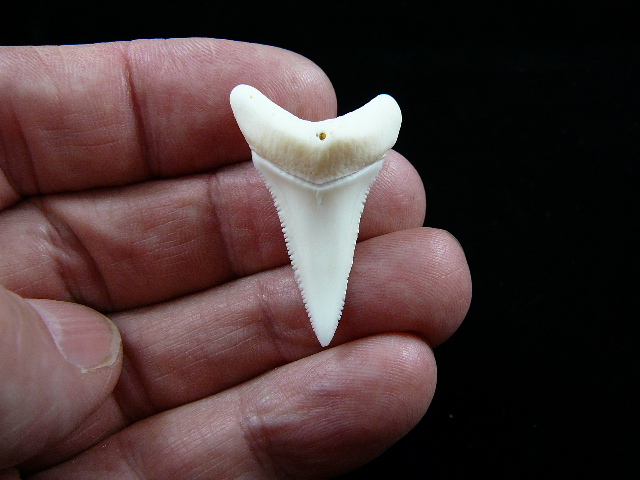 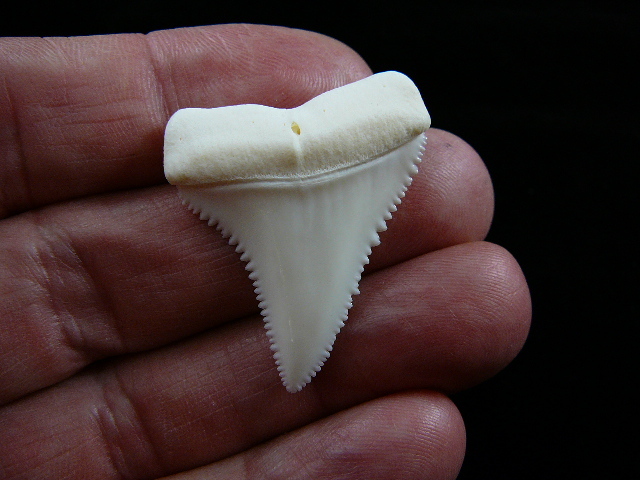 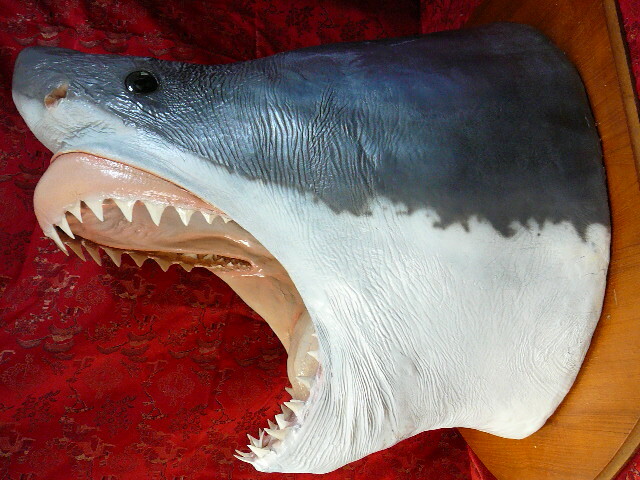 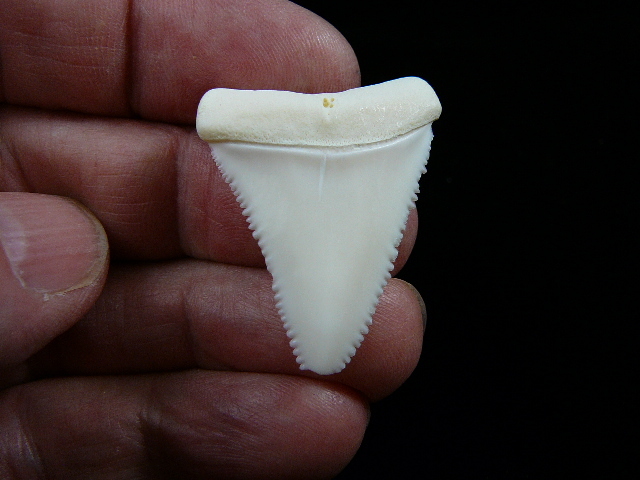 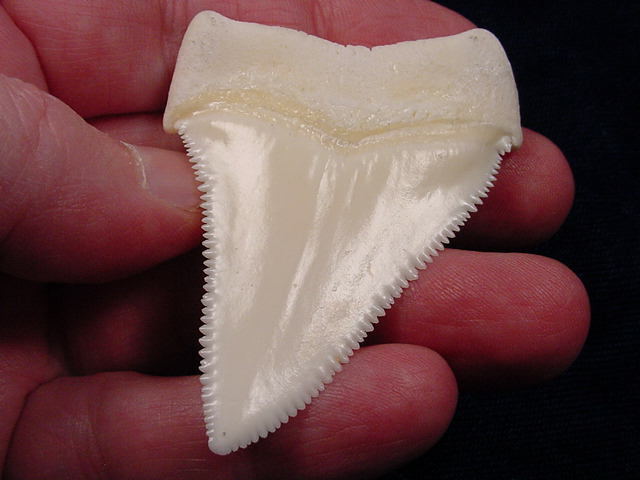 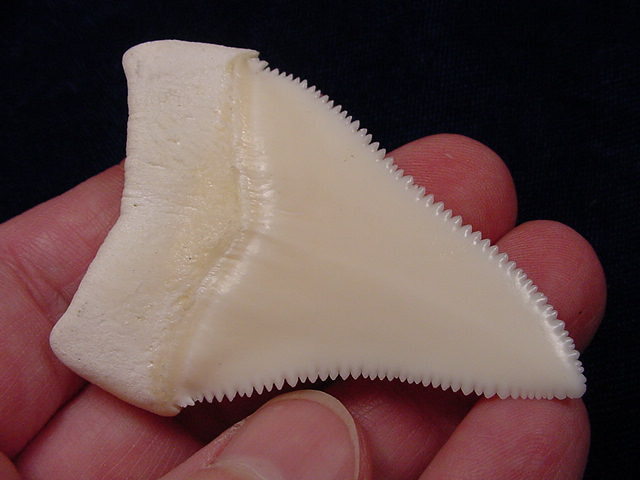 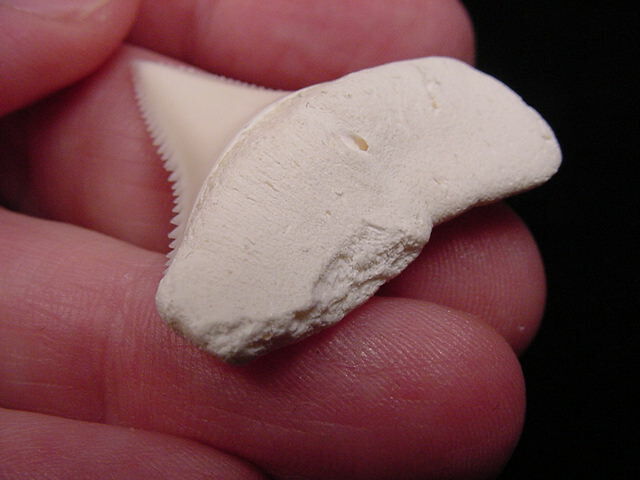 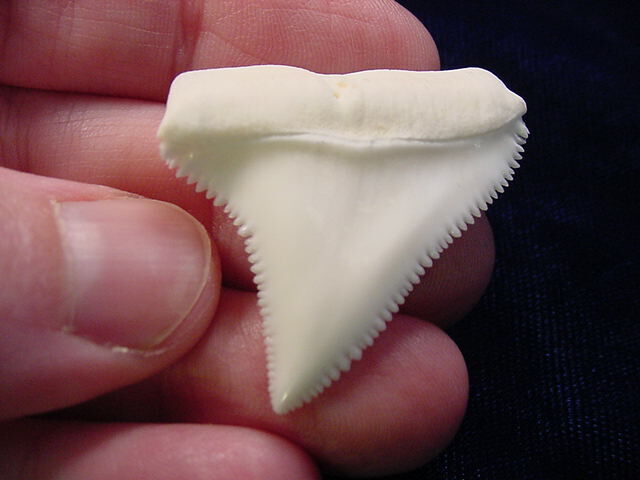 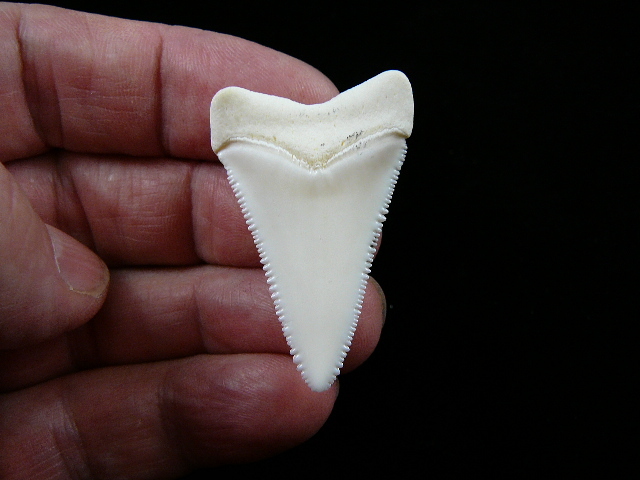 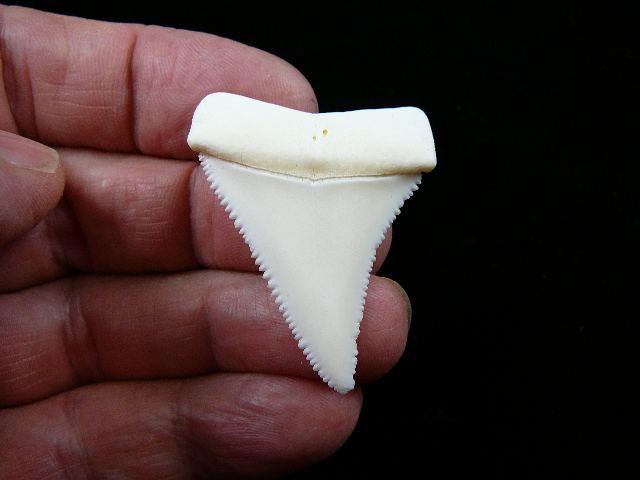 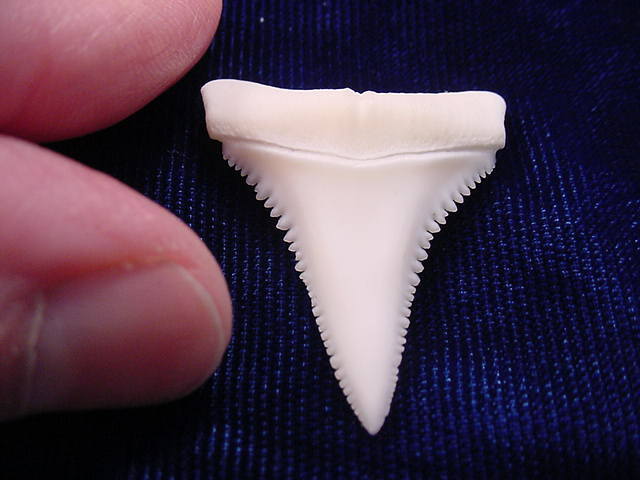 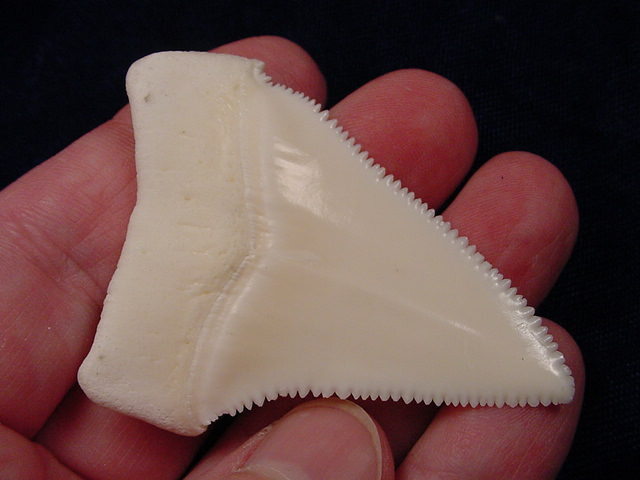 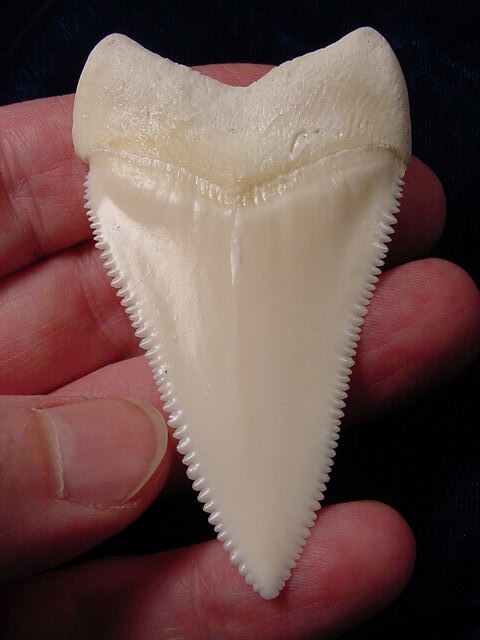 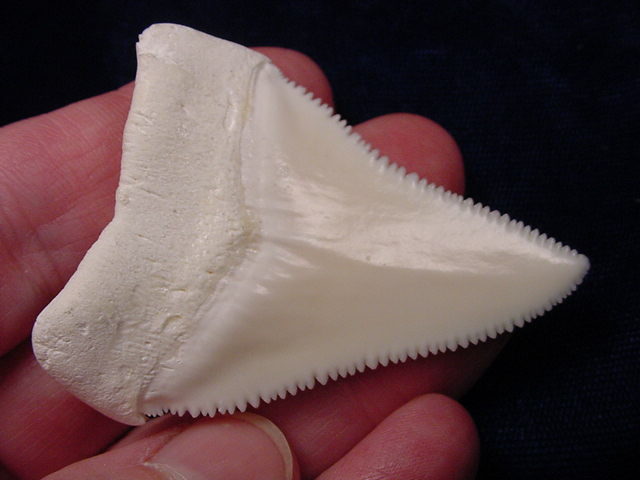 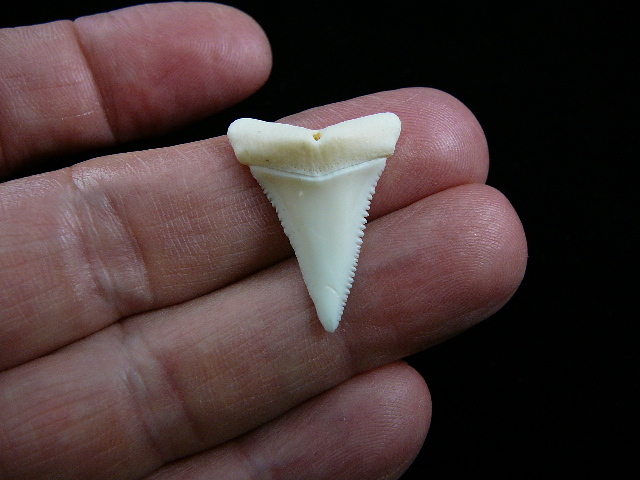 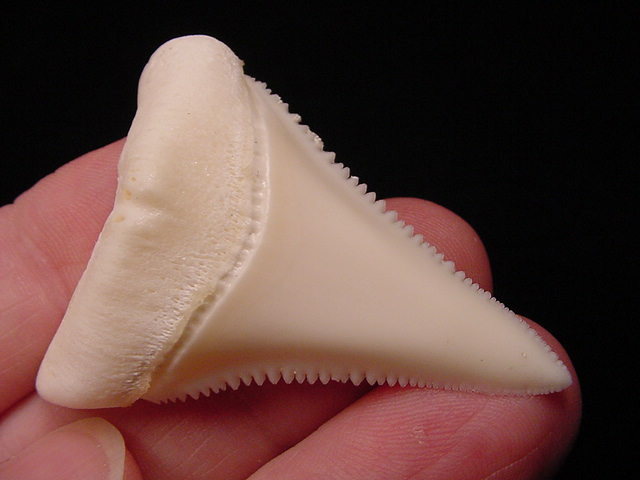 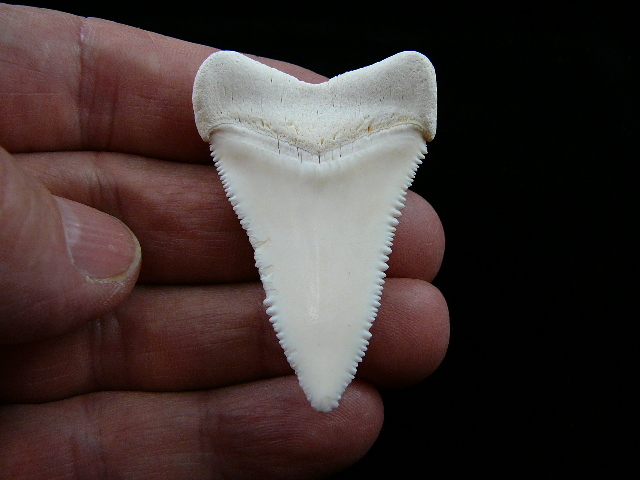 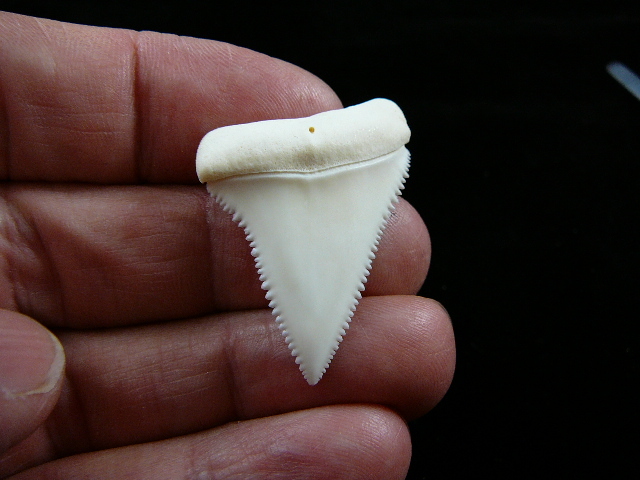 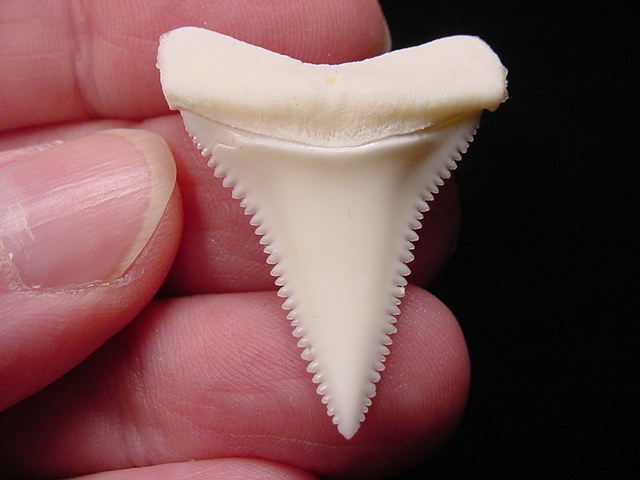 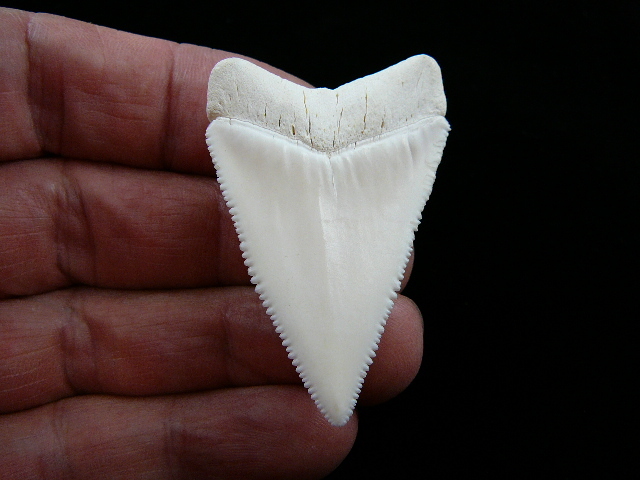 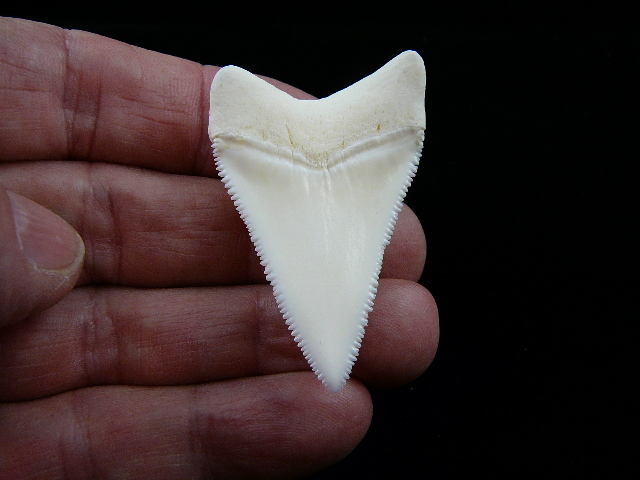 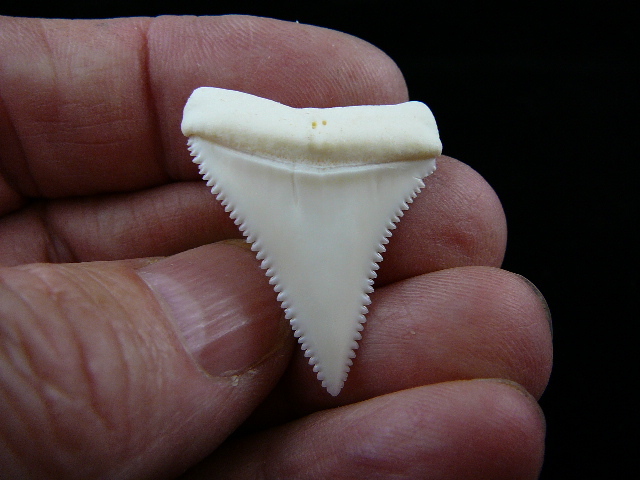 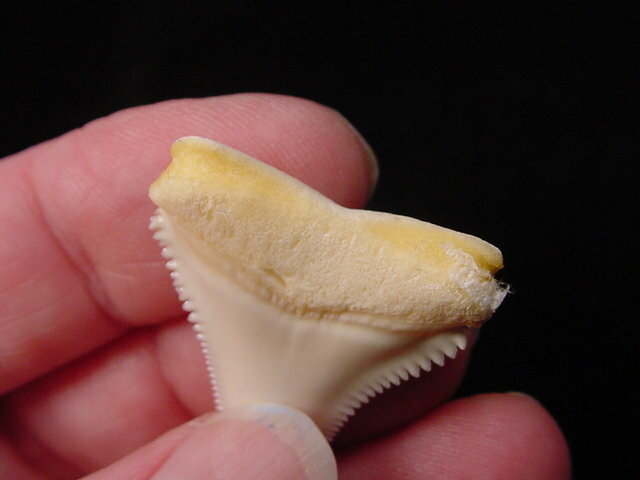 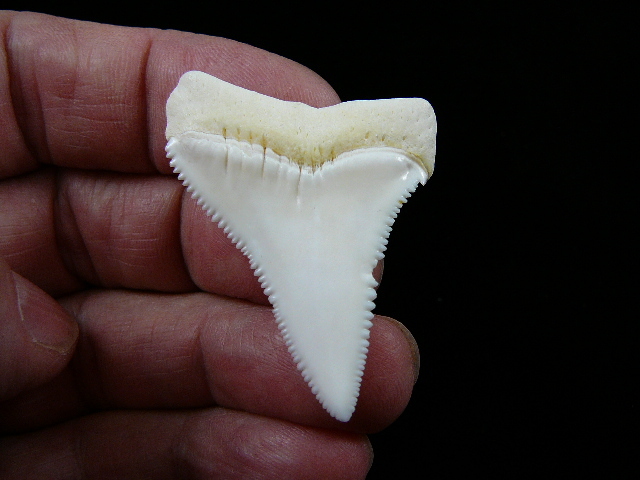 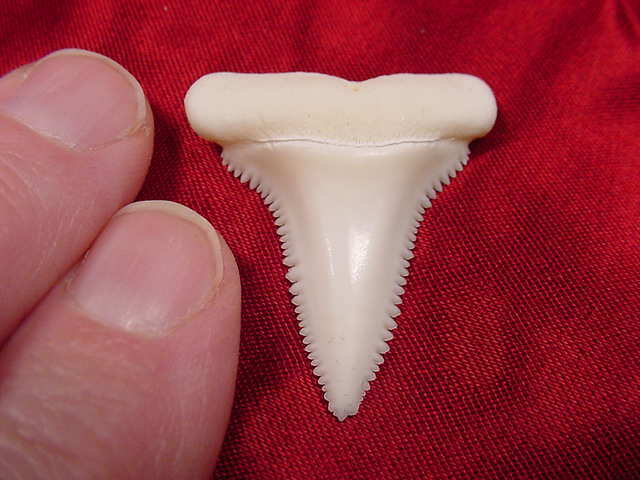 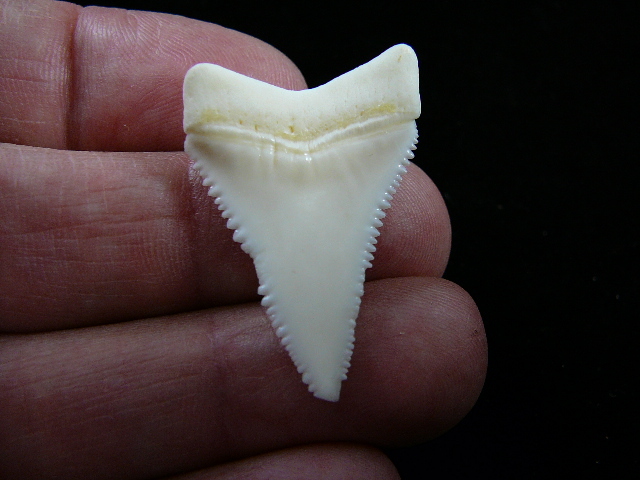 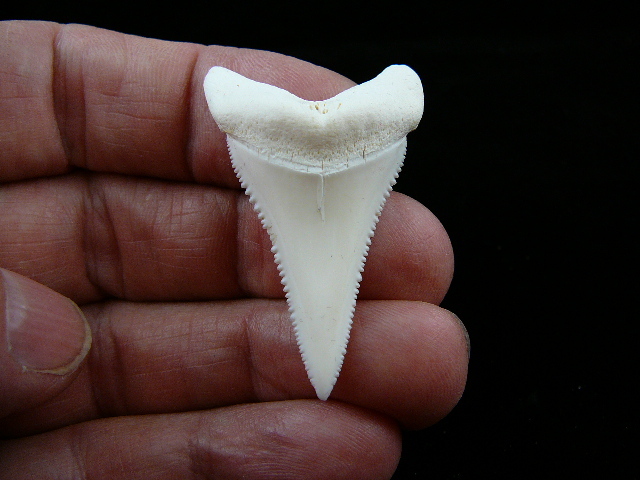 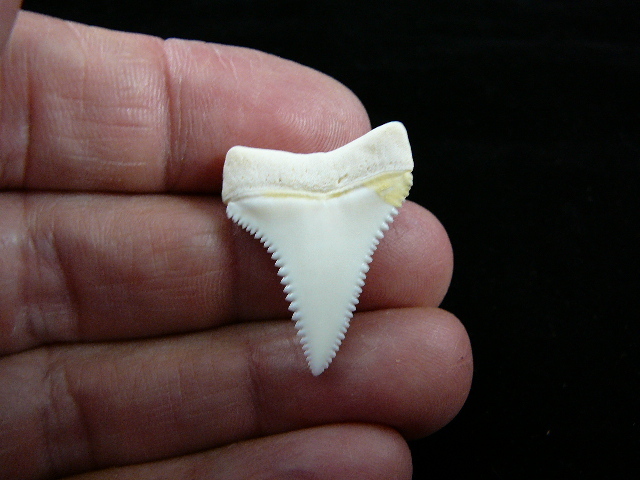 PLEASE NOTE: Great white shark teeth & jaws can be shipped only within the U.S..
THAT IS WHY THE PRICES OF THE GREAT WHITE SHARK TEETH ARE MUCH HIGHER THAN ANY OTHER SHARK TEETH IN THE WORLD. 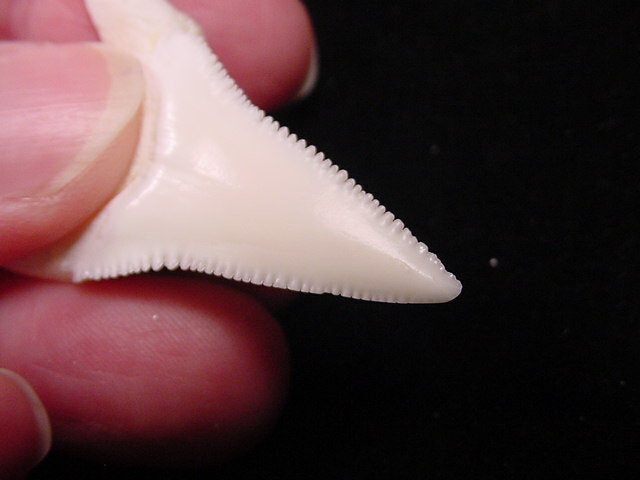 We do not go out and catch sharks for their teeth! 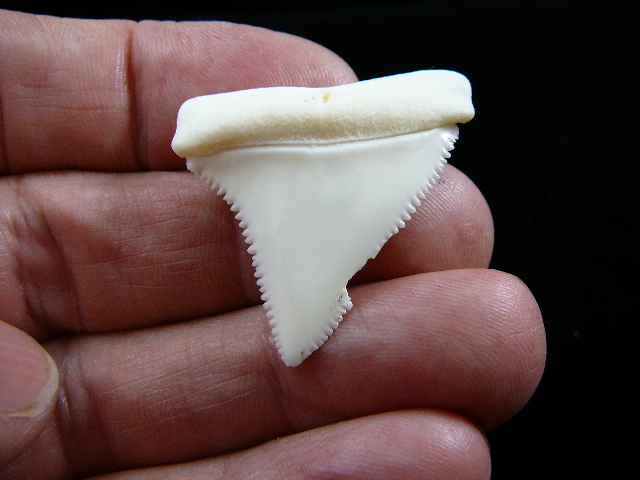 Great whites were declared endangered since December 1998 so it is ILLEGAL to catch them now. 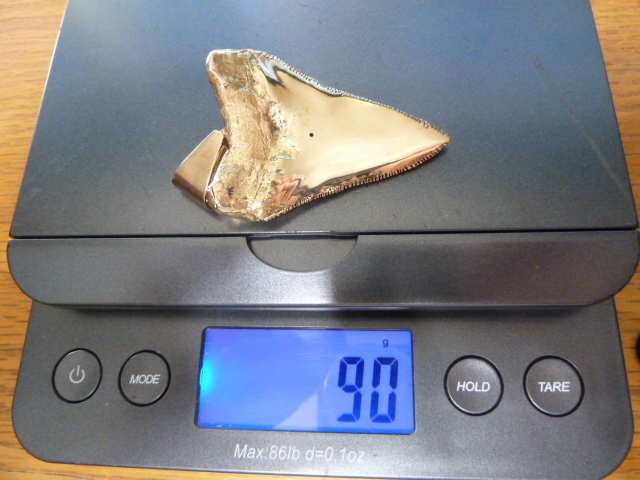 But they are NOT ILLEGAL TO OWN OR SELL. 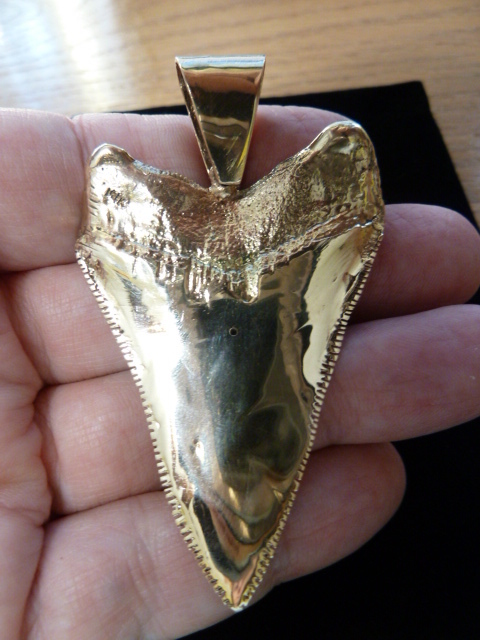 So what are people supposed to do with the ones that are already in circulation? 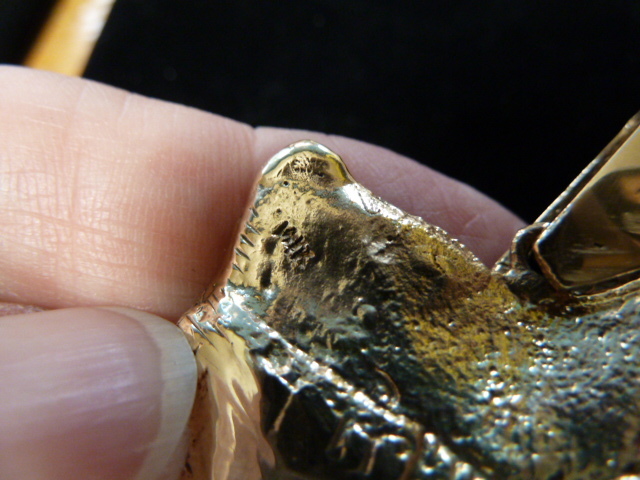 Hide them? 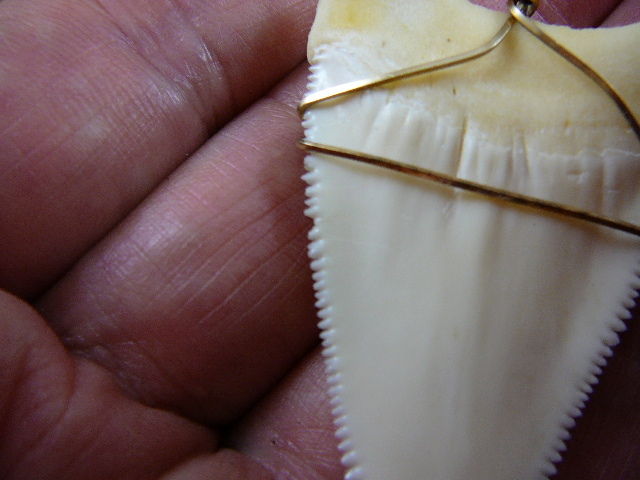 Throw them away? 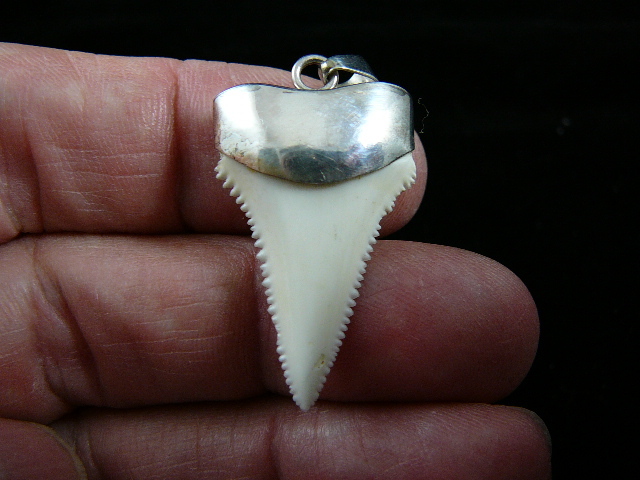 No, those that are in circulation are allowed to be traded, sold, resold, collected, displayed, bragged upon, showed off. 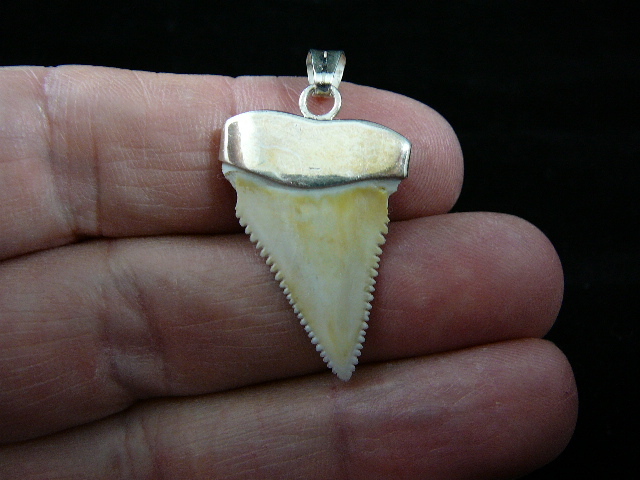 So because there are a limited amount of these specimens in circulation.....the value has only one place to go....UP (just like elephant ivory products). 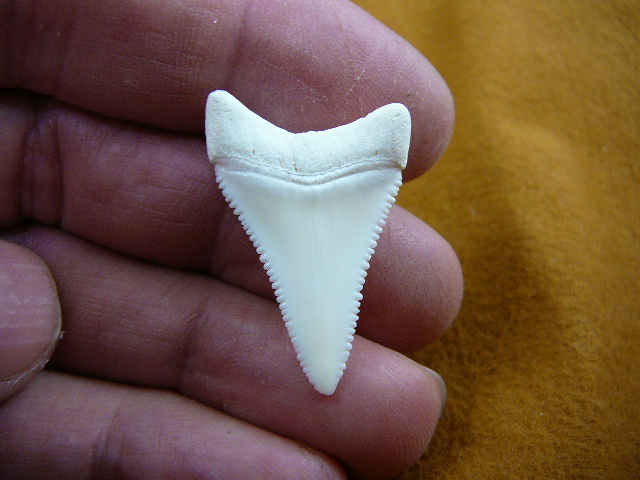 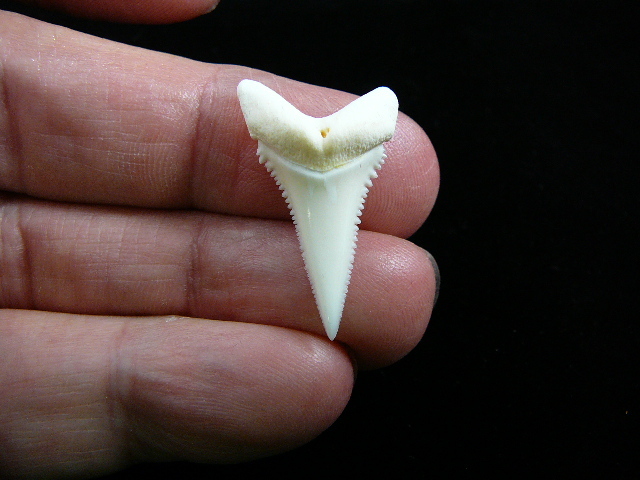 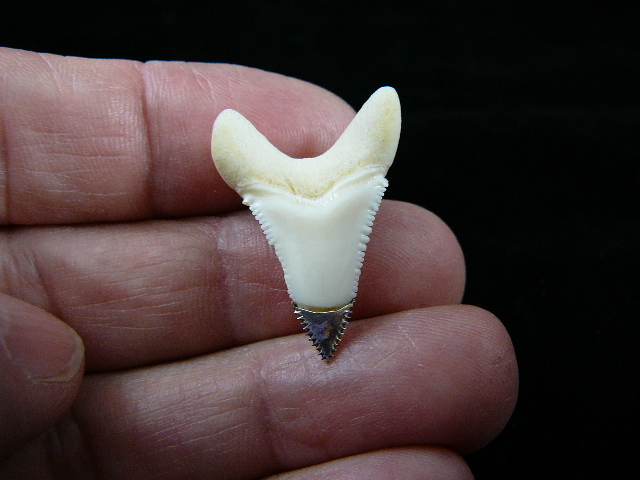 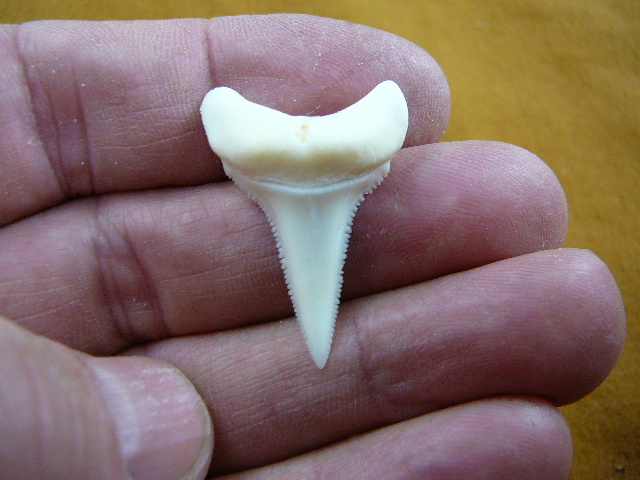 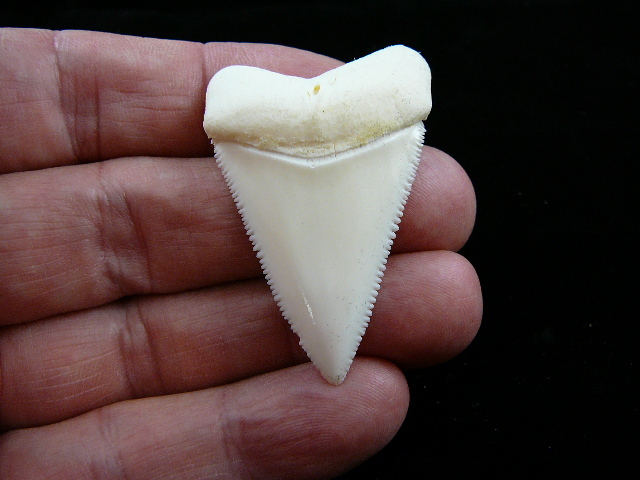 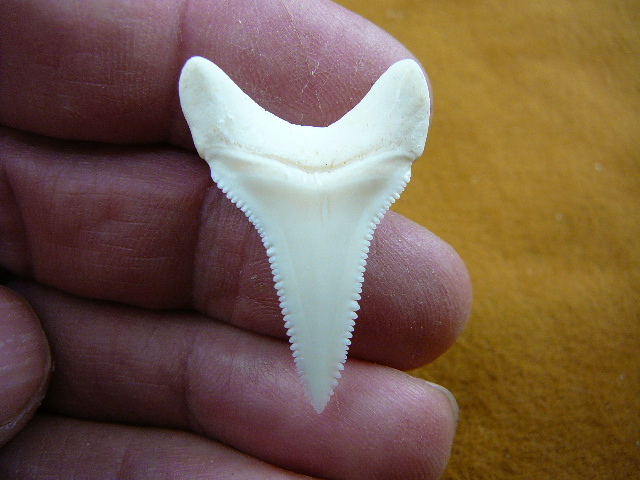 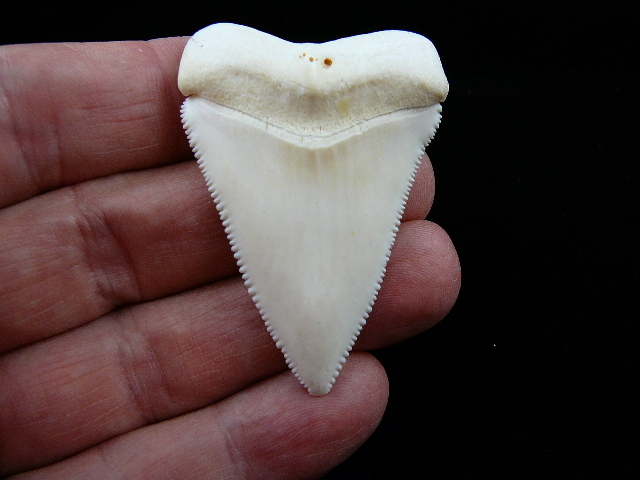 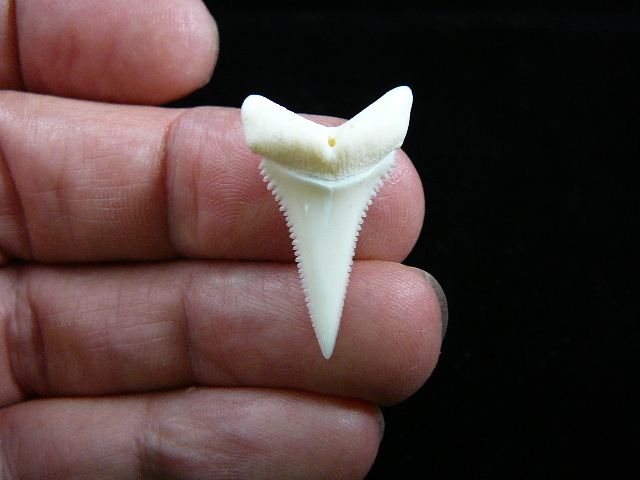 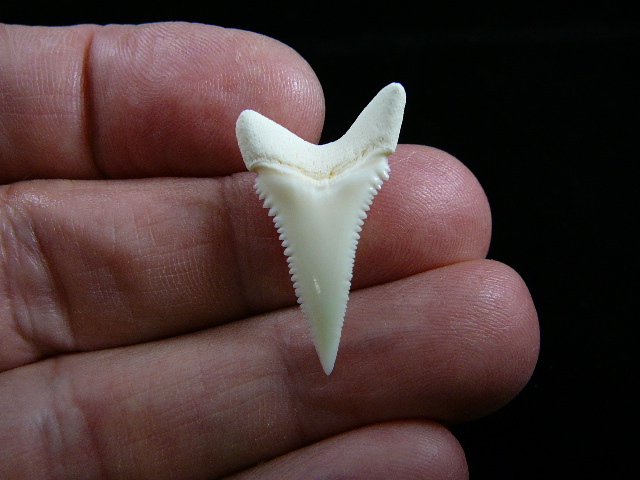 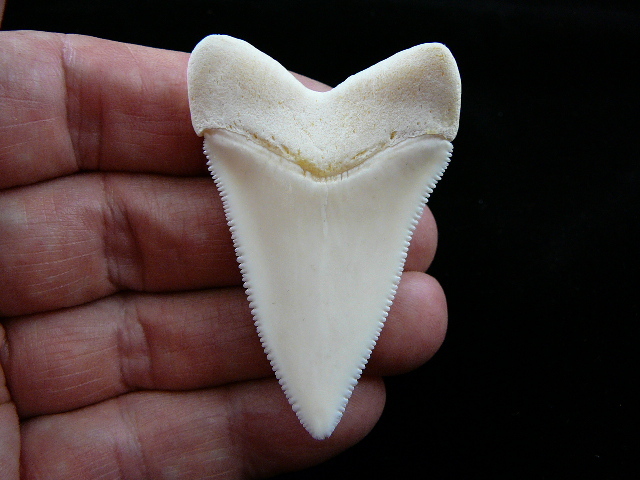 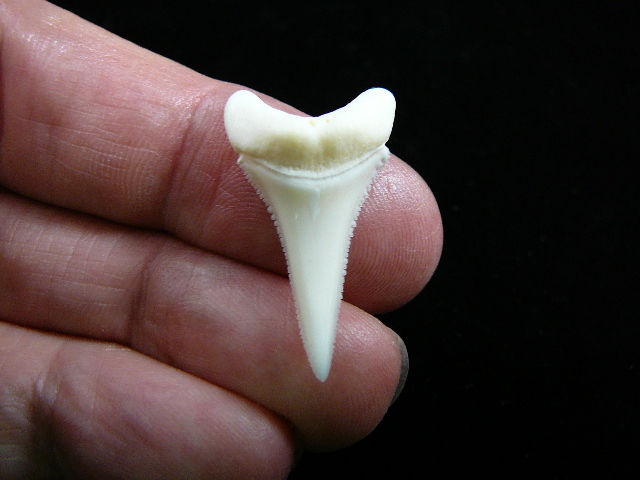 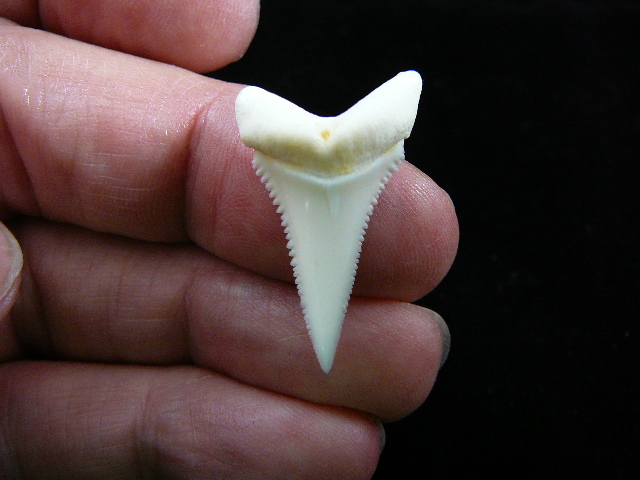 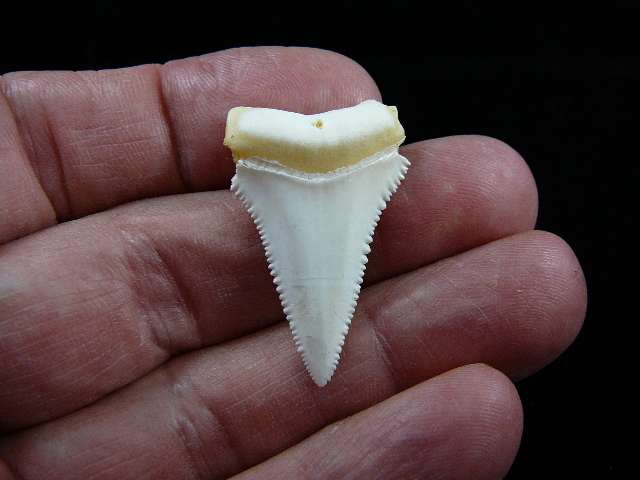 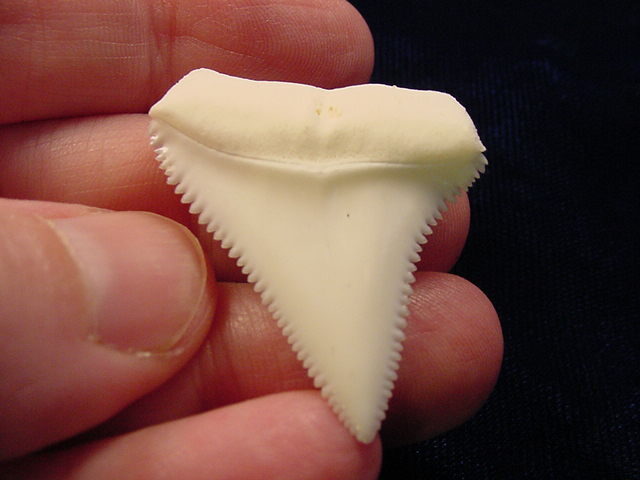 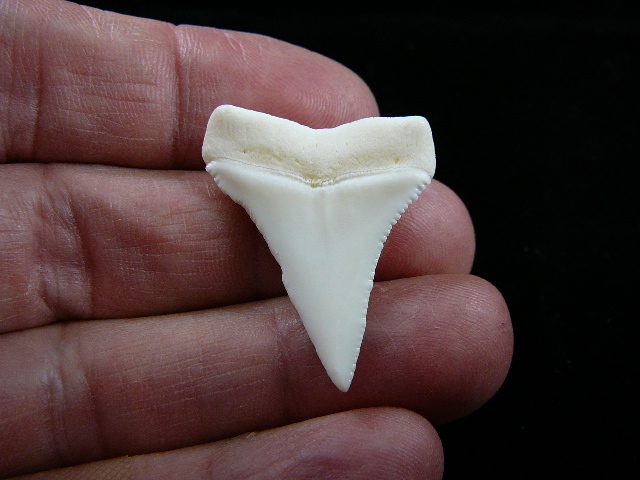 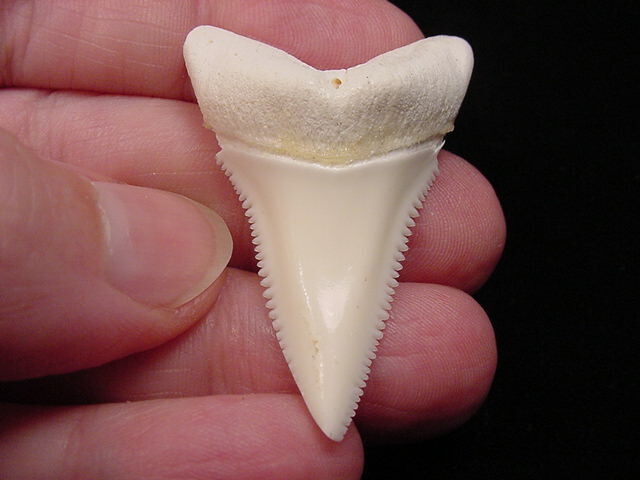 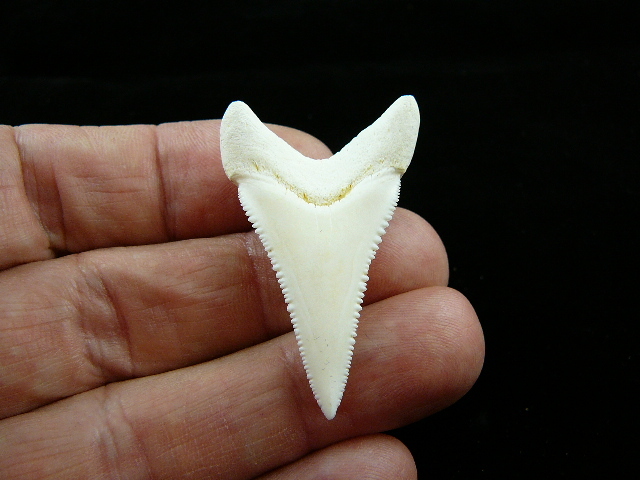 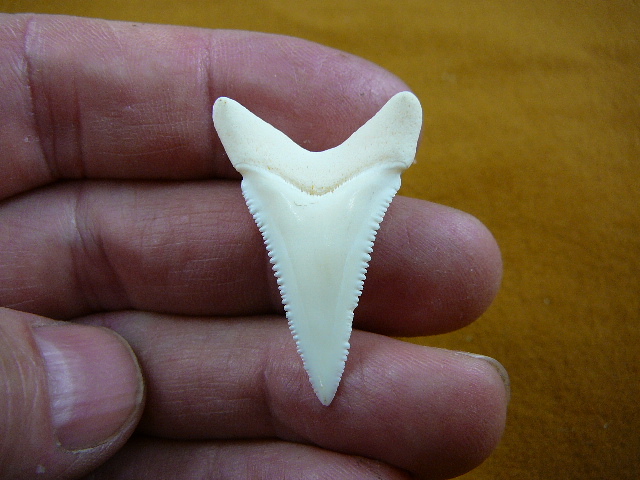 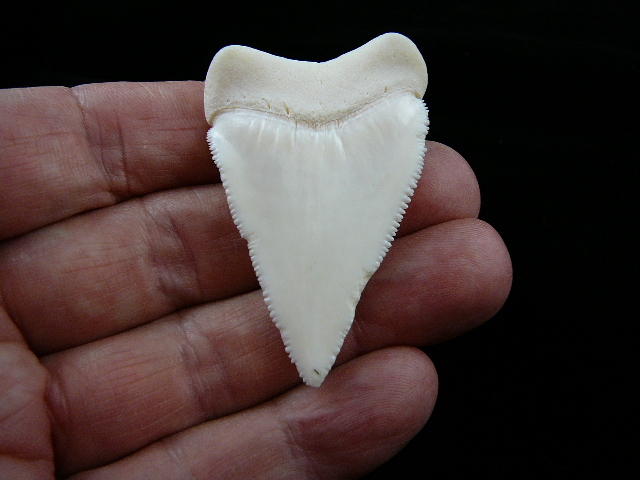 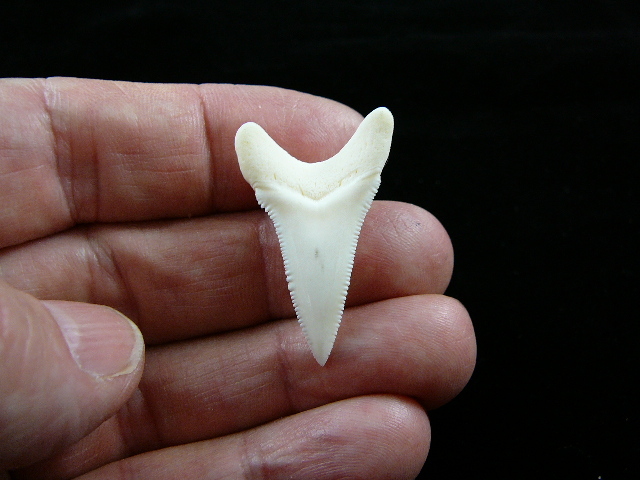 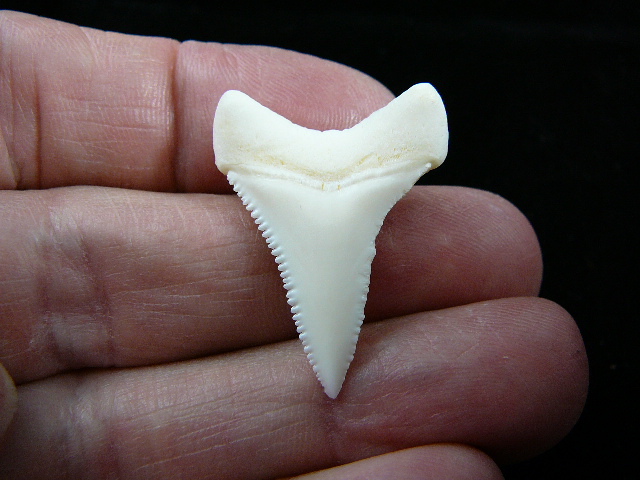 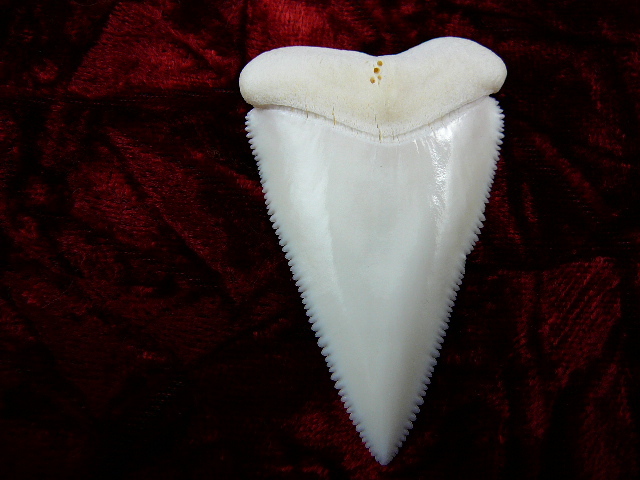 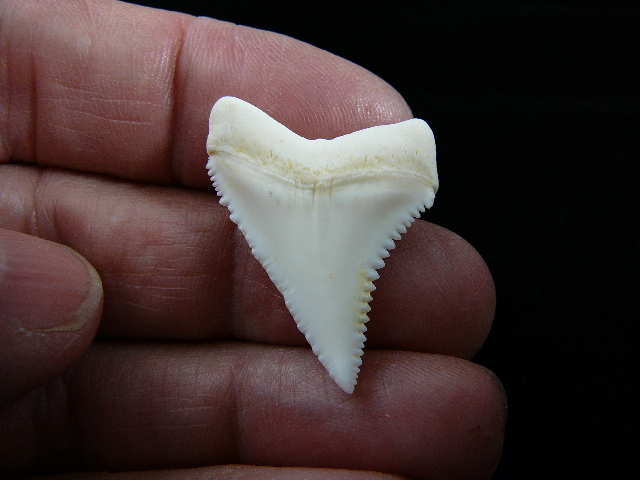 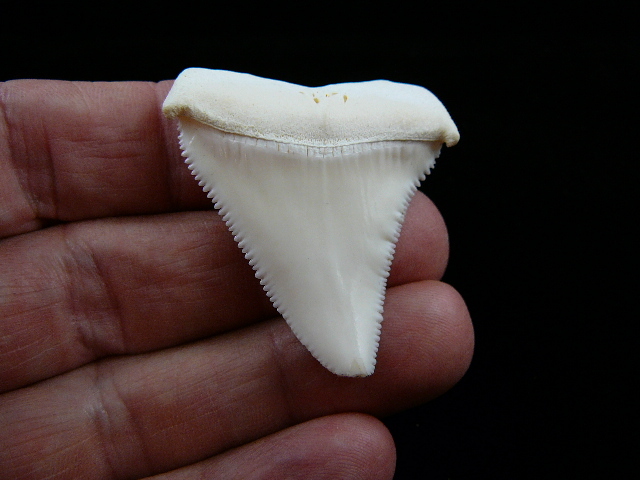 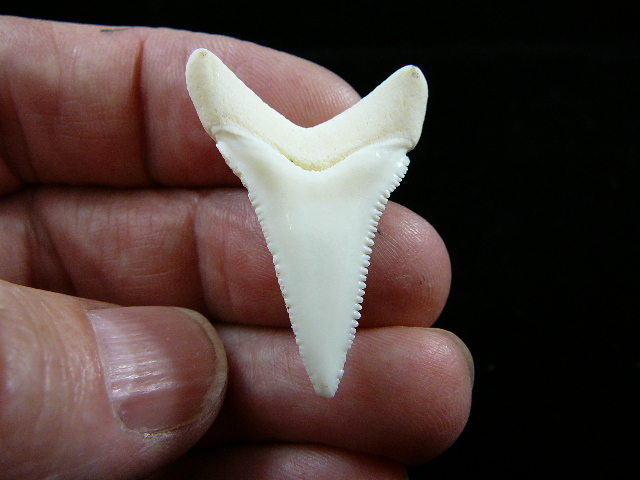 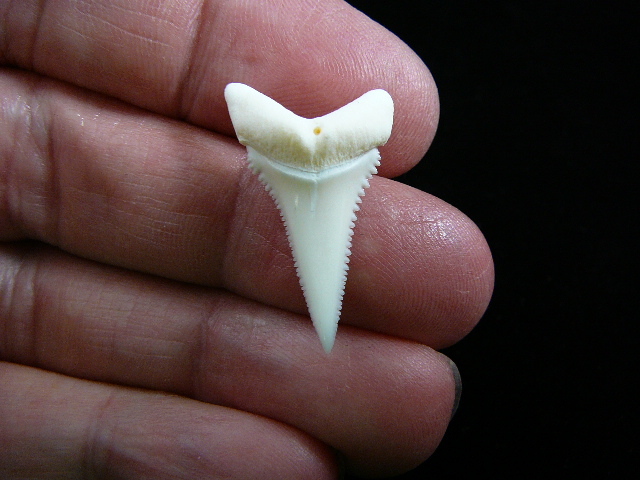 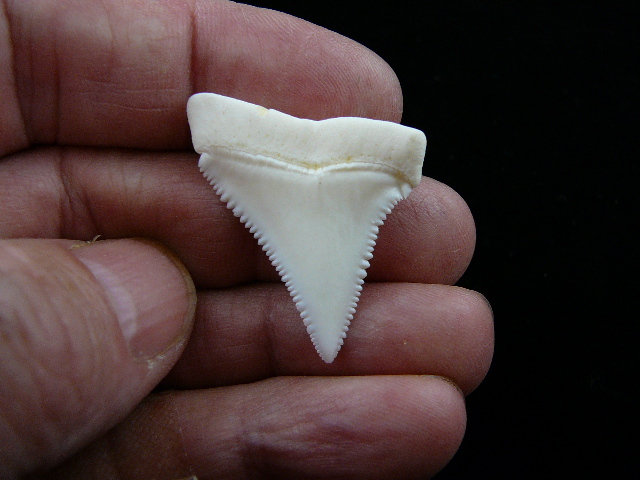 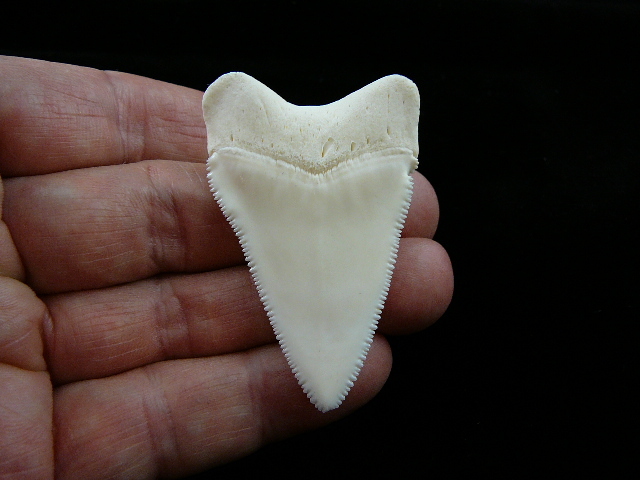 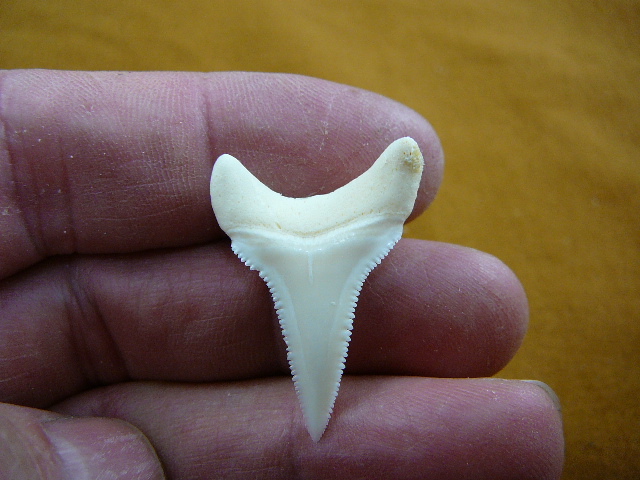 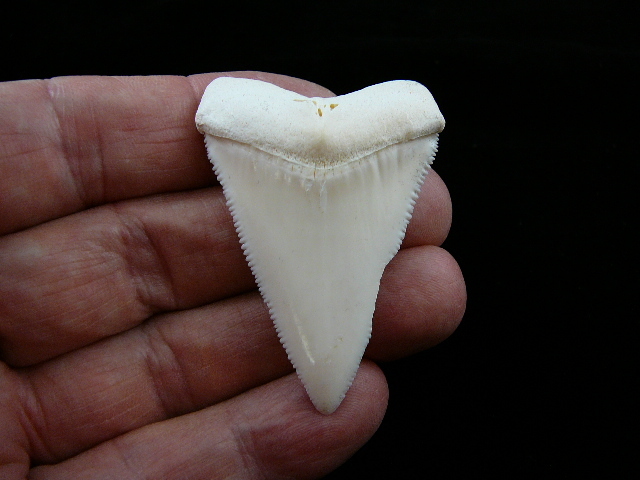 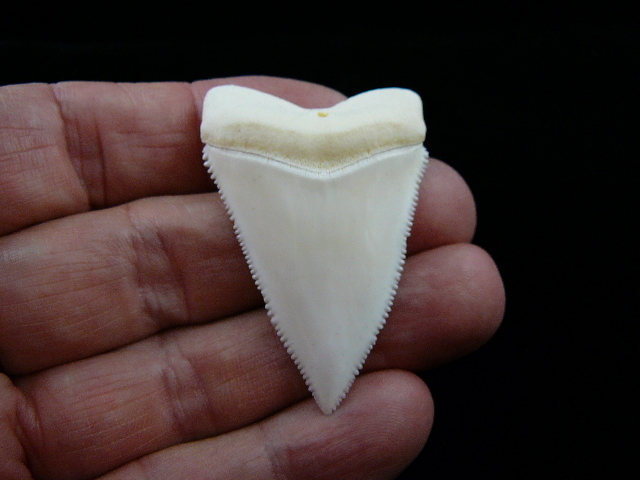 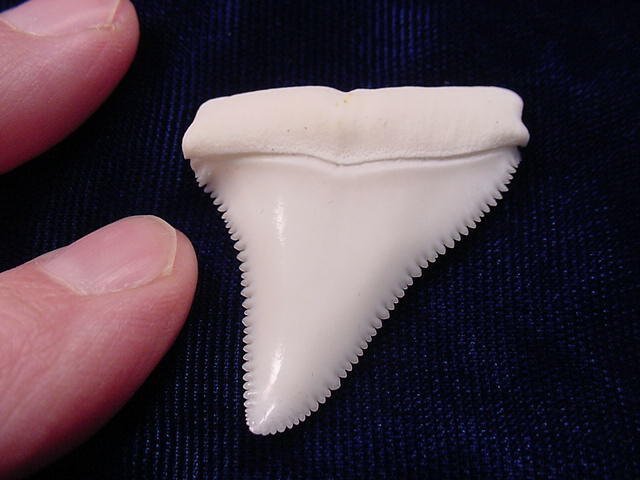 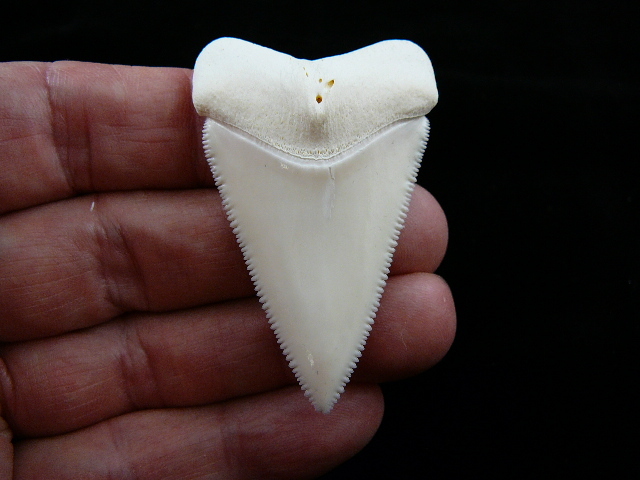 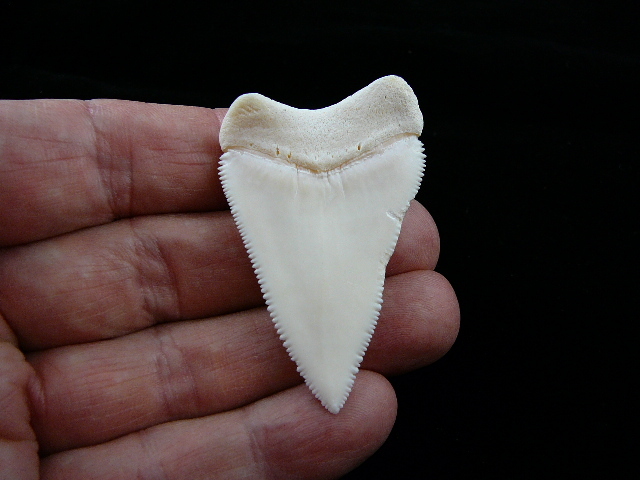 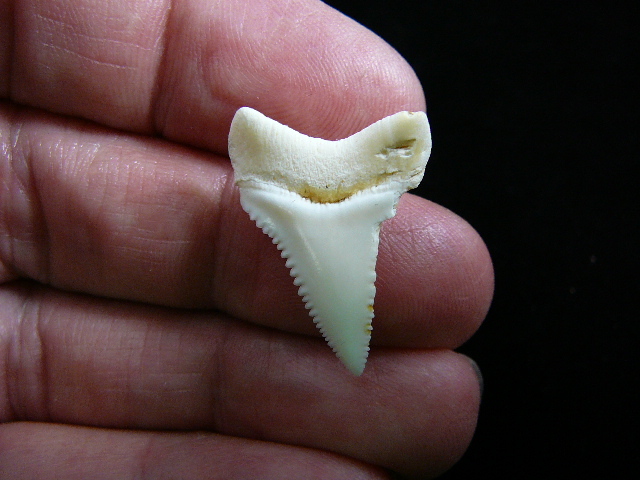 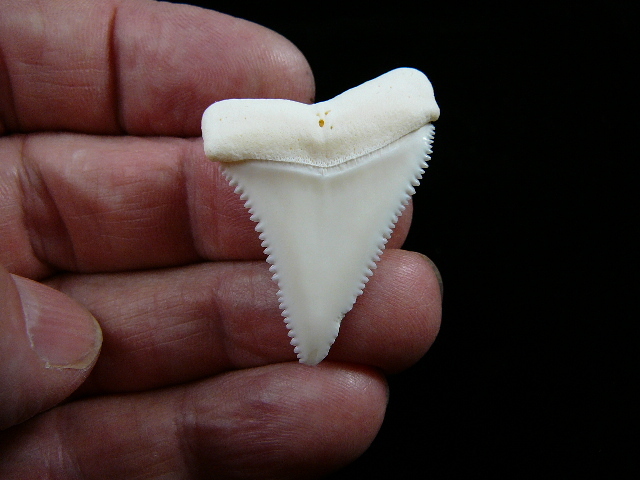 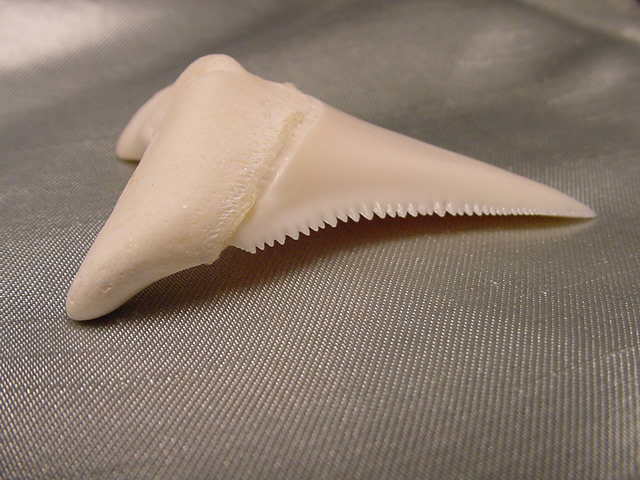 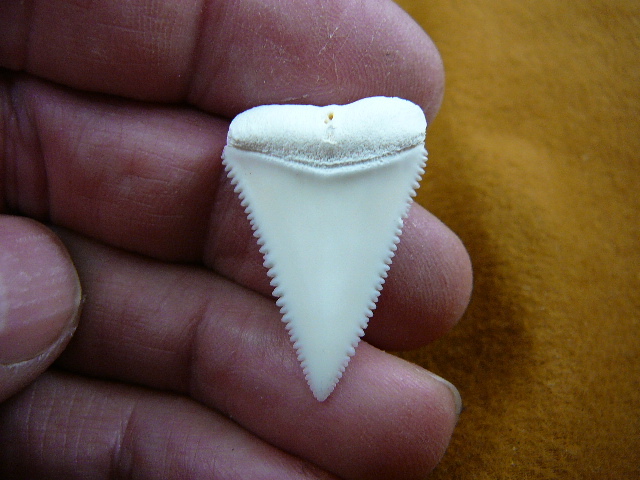 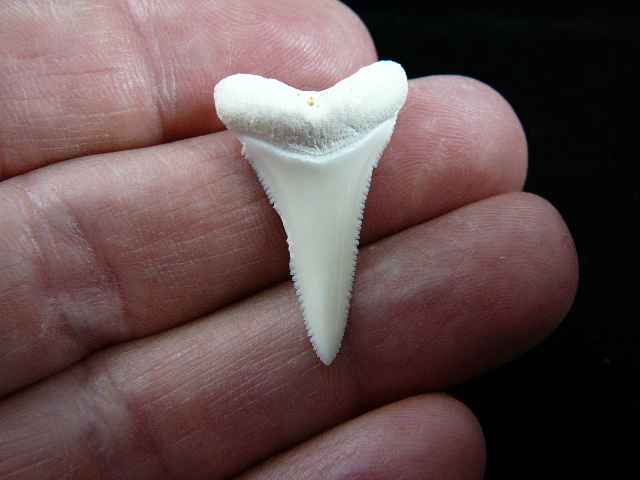 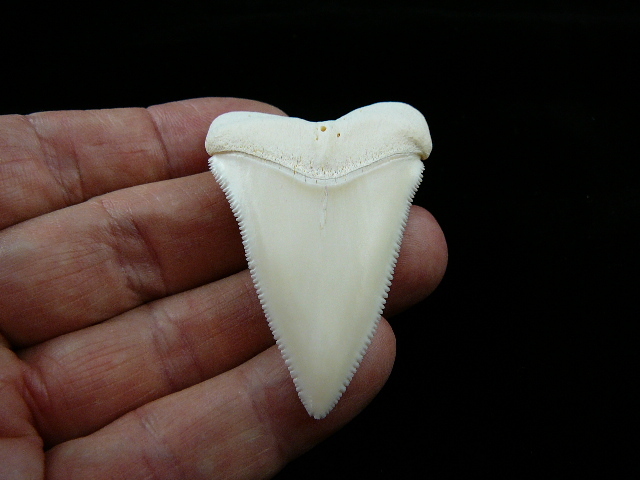 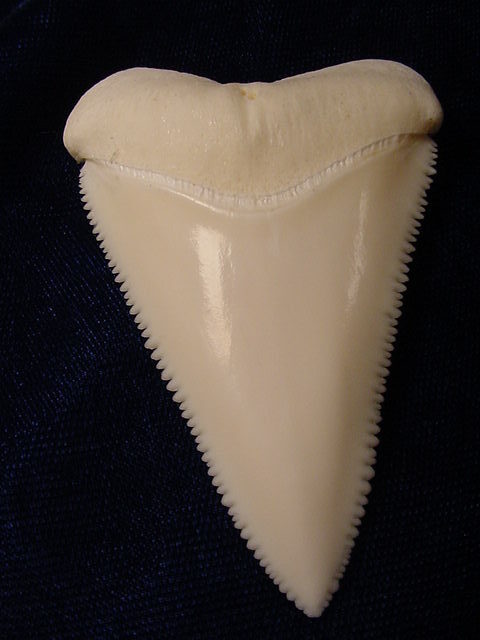 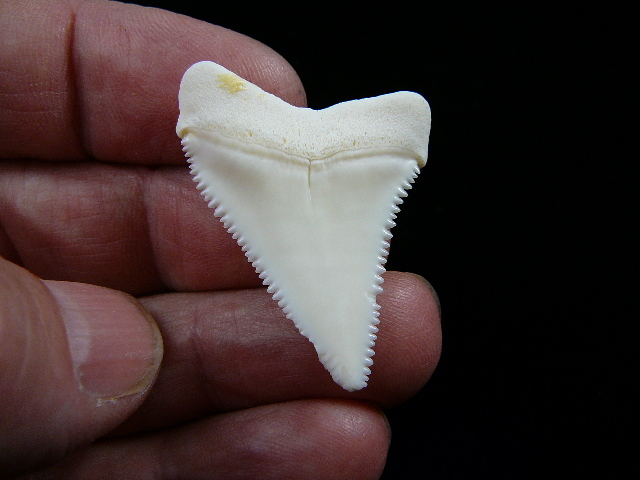 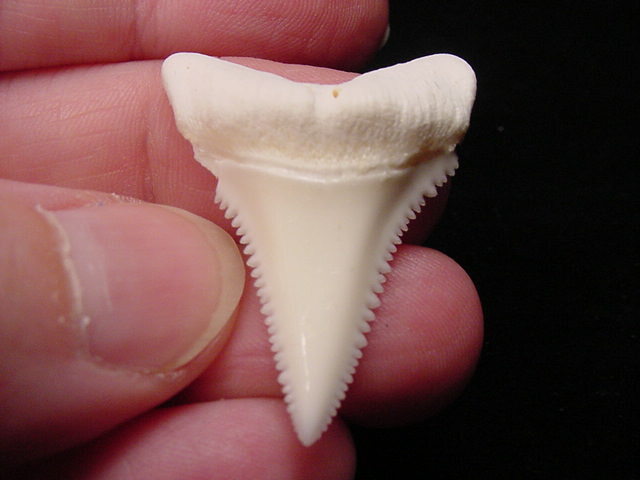 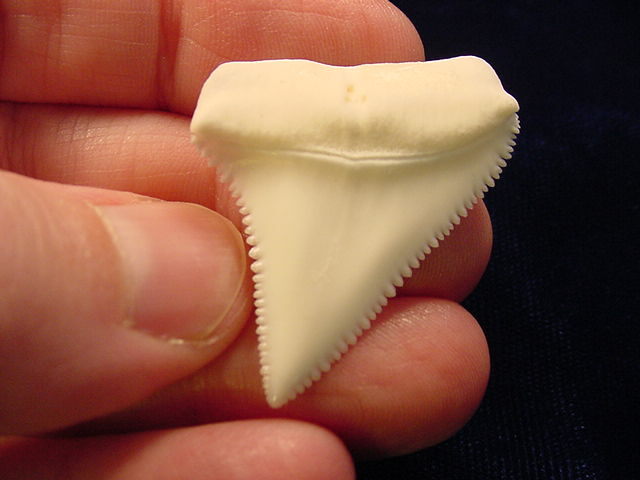 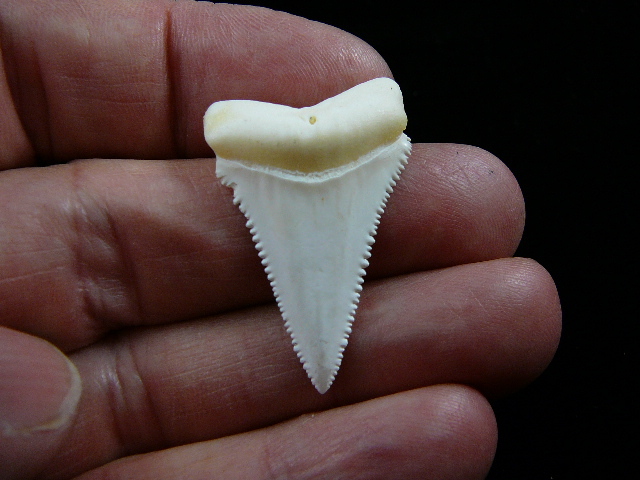 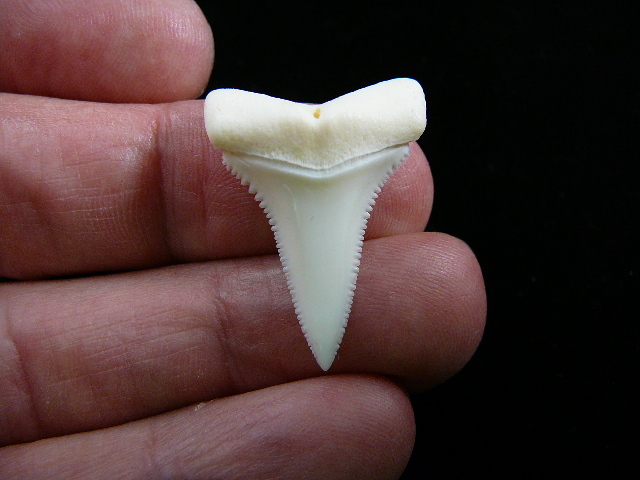 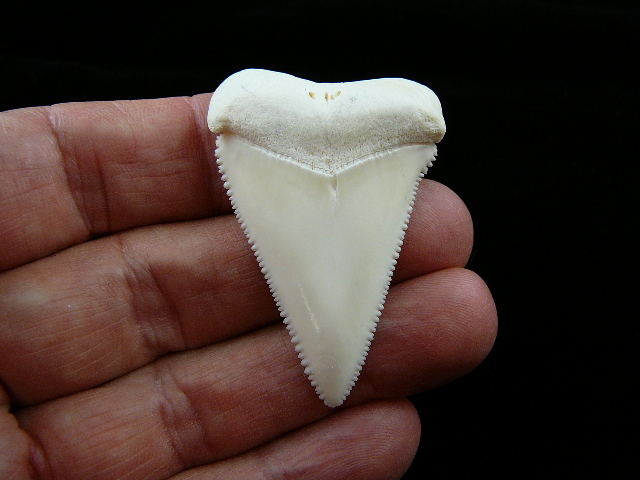 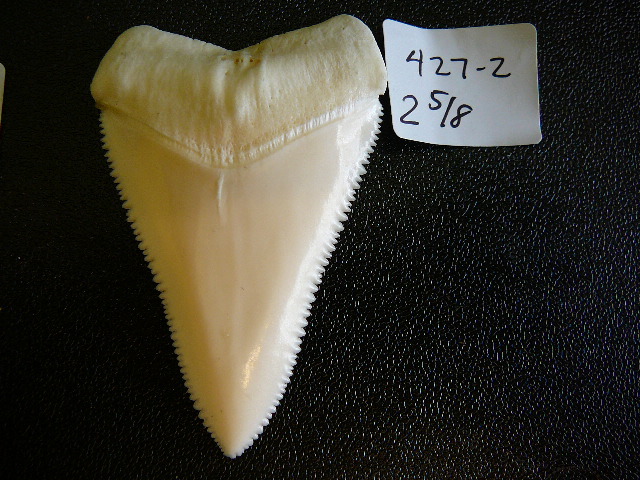 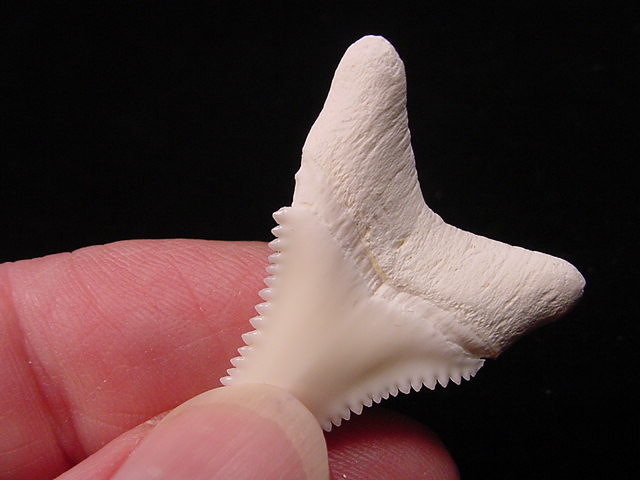 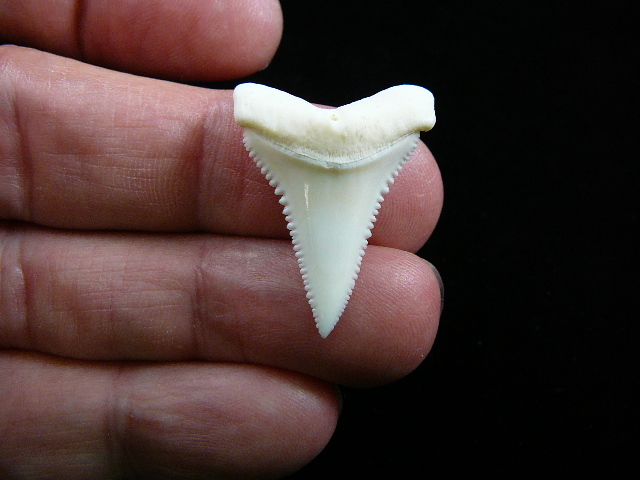 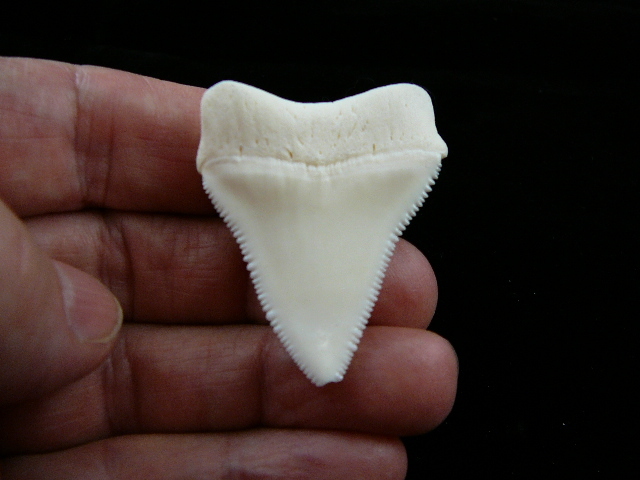 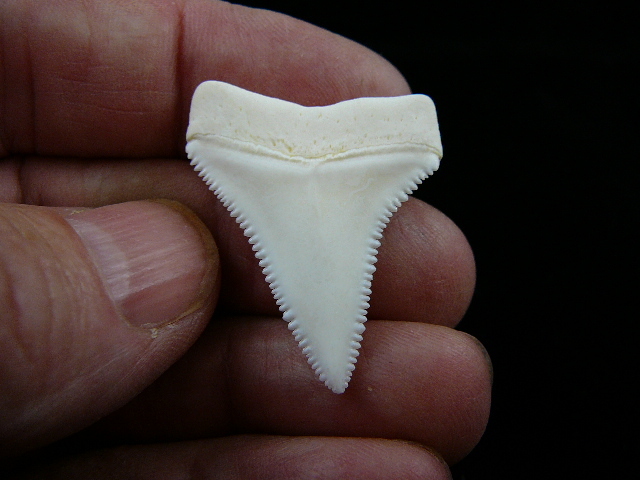 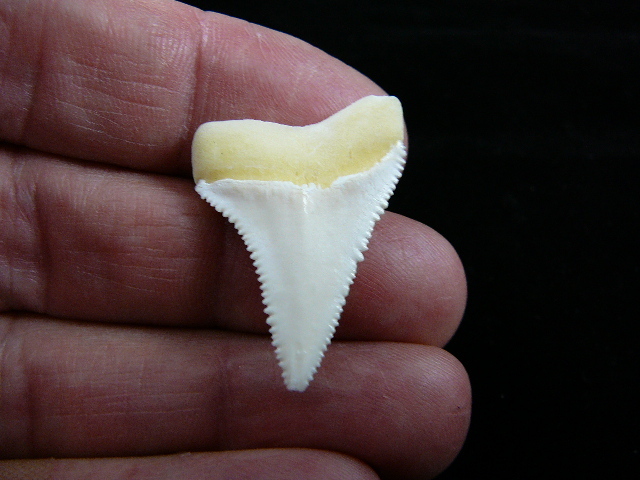 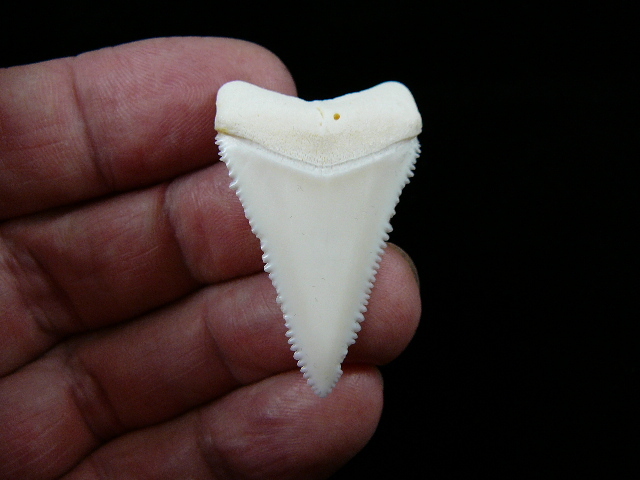 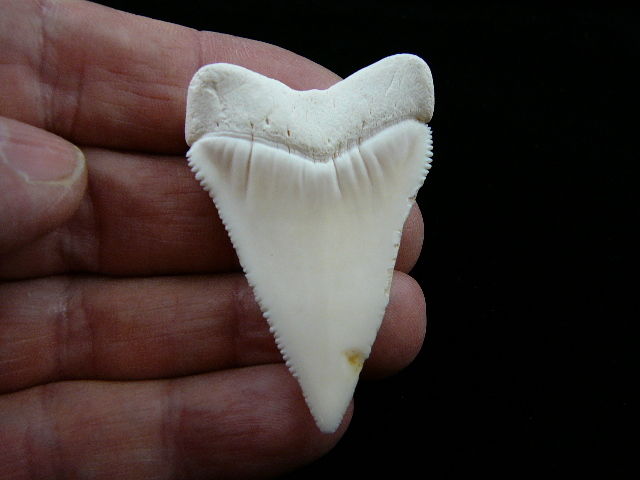 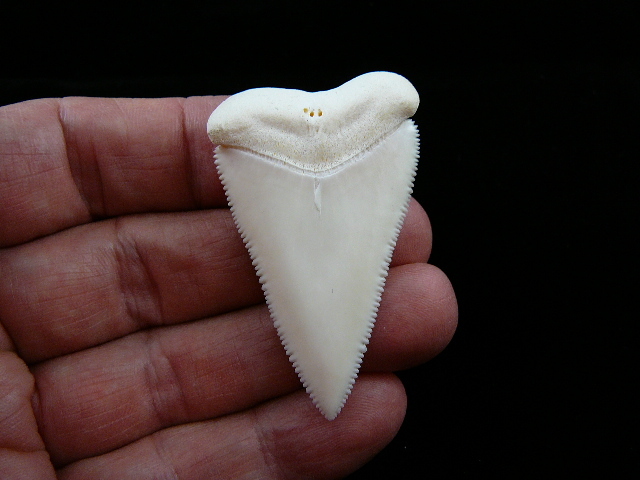 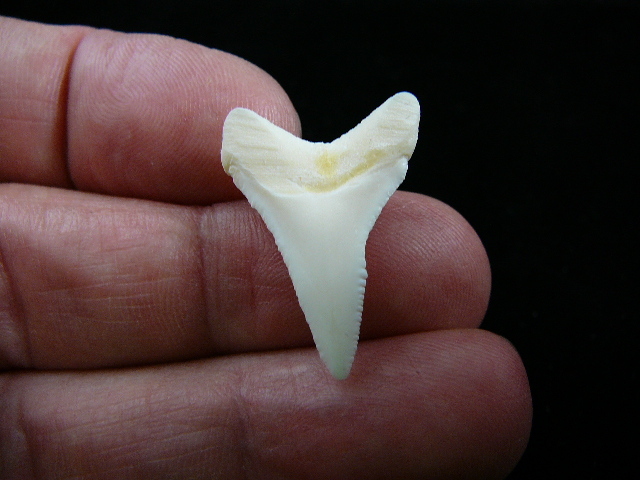 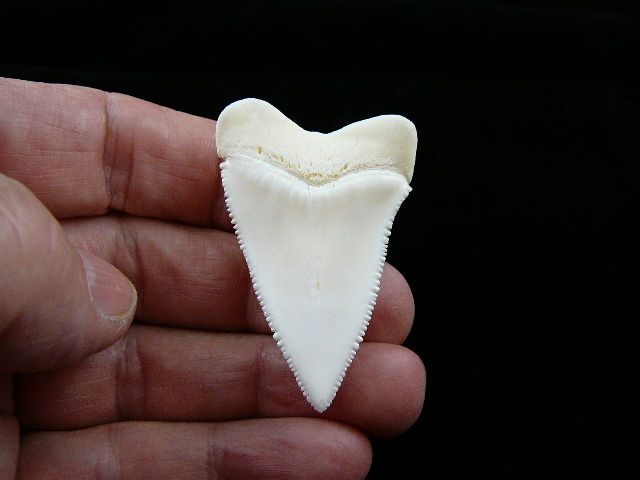 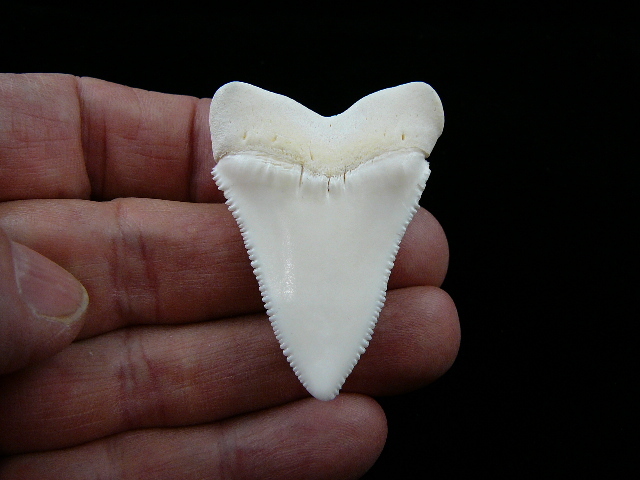 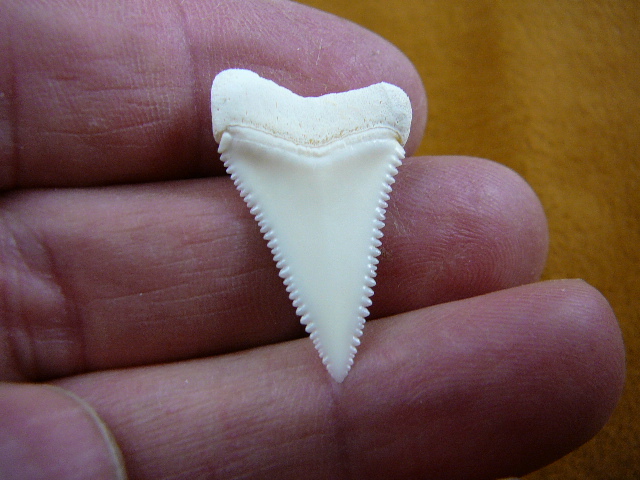 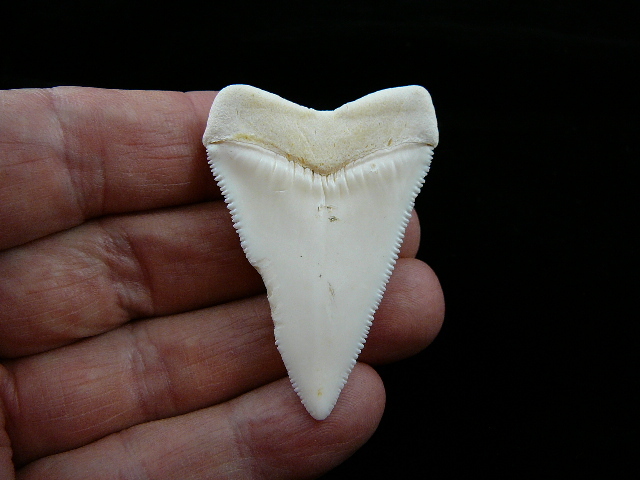 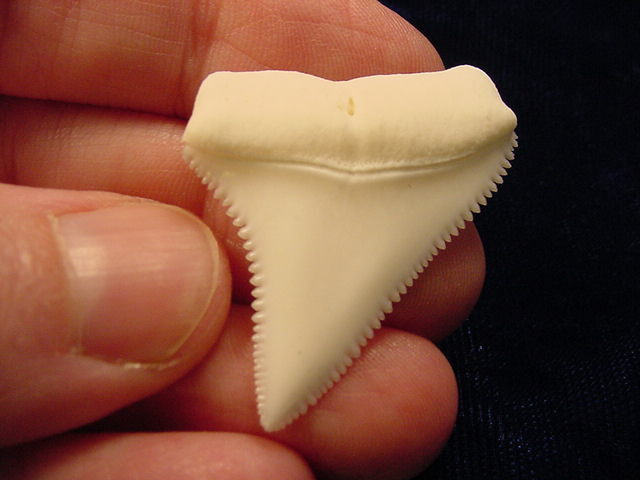 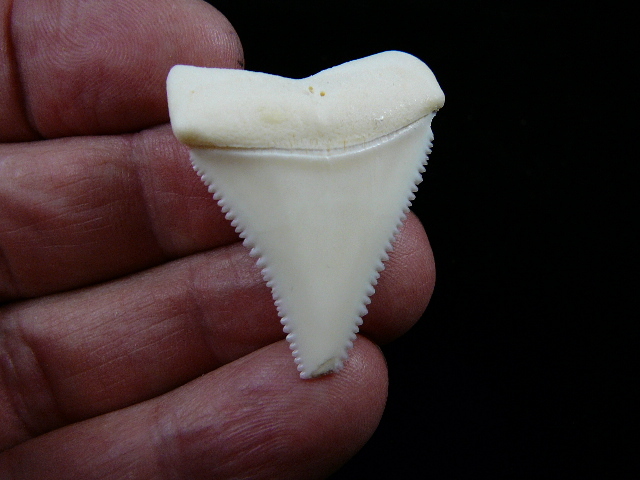 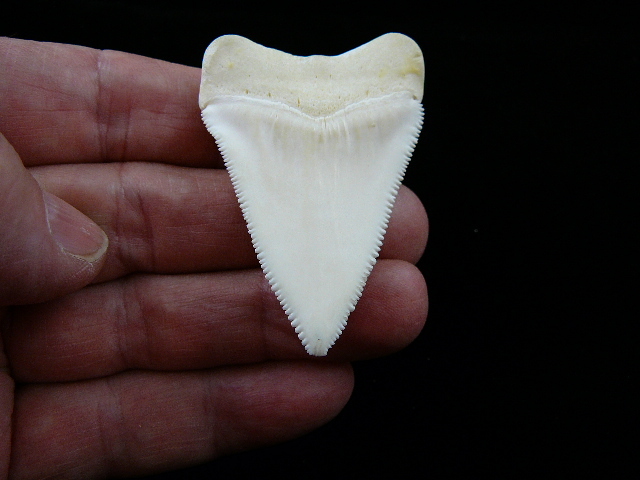 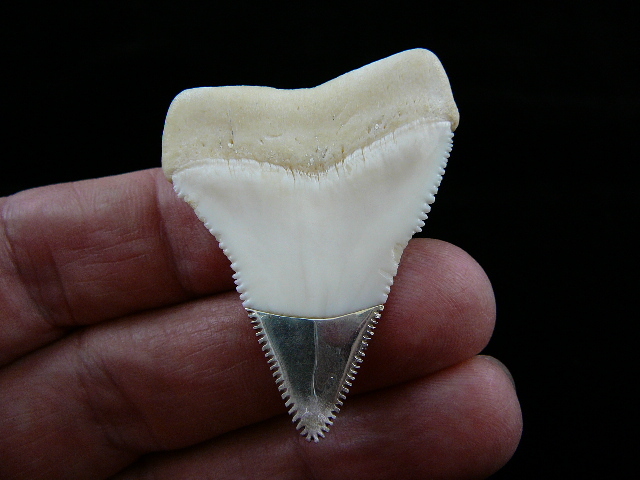 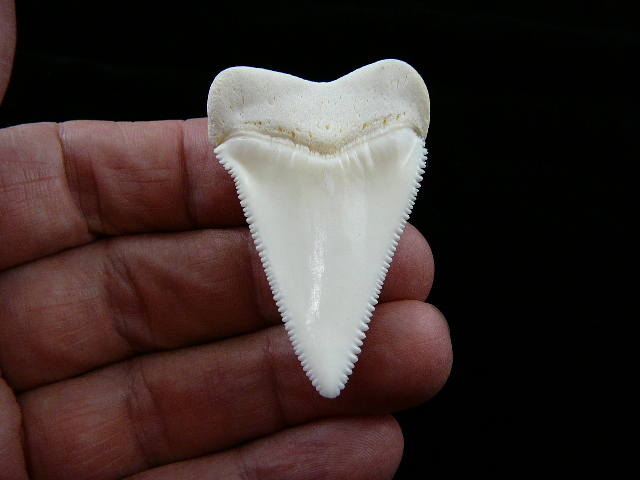 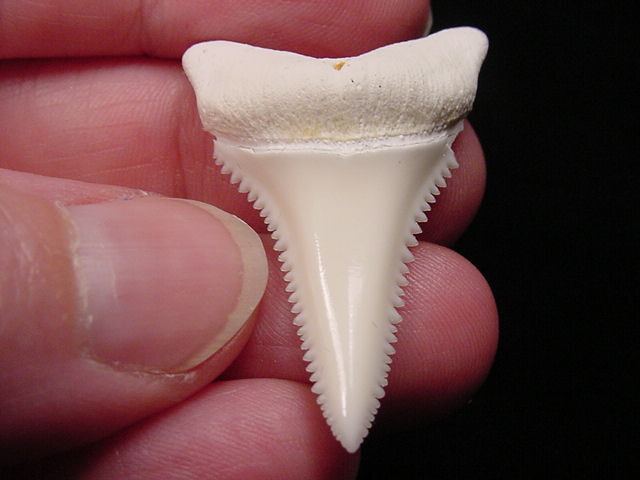 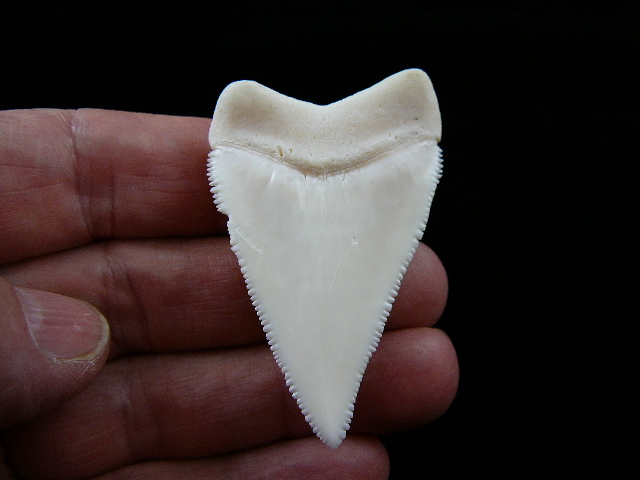 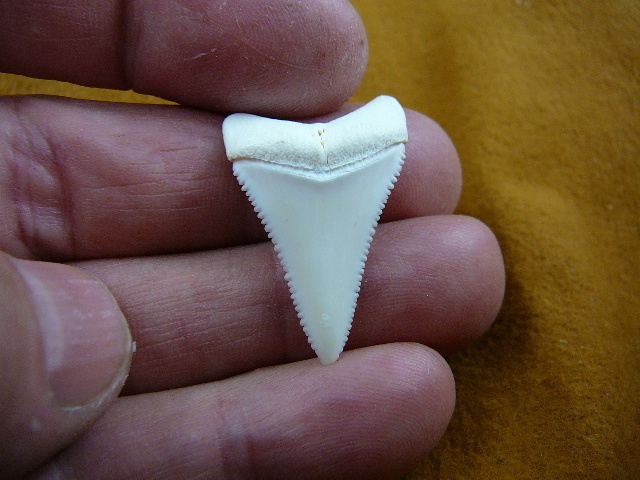 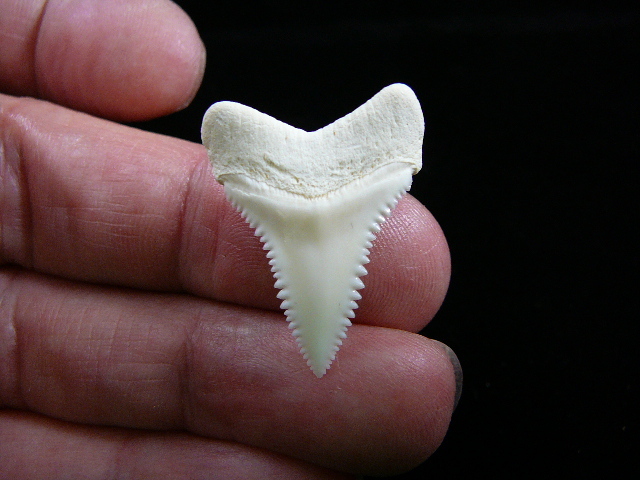 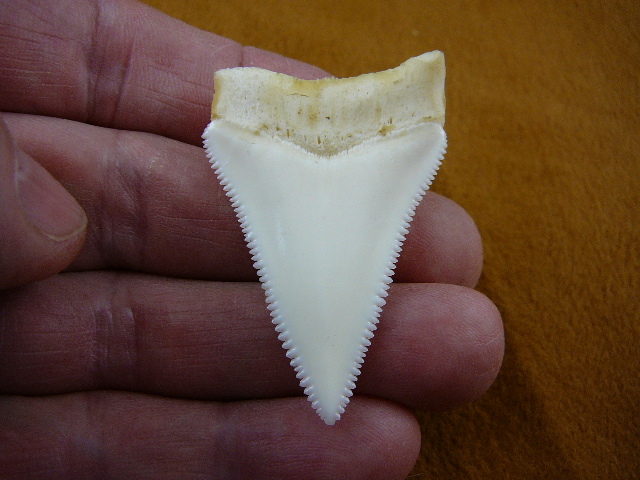 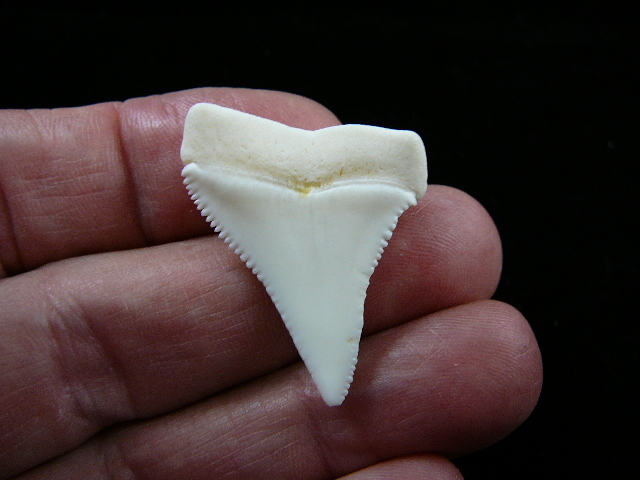 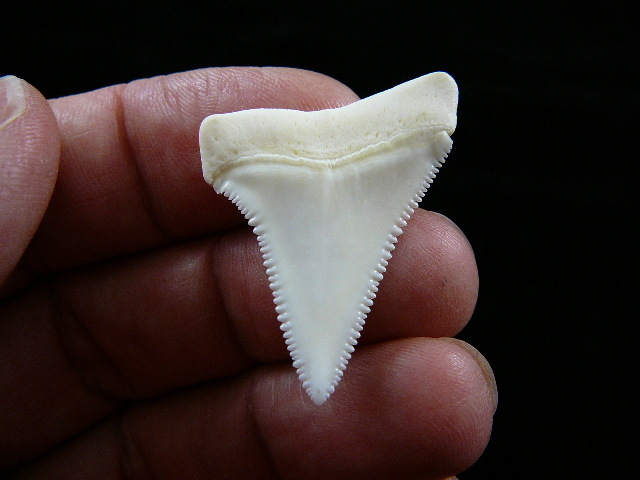 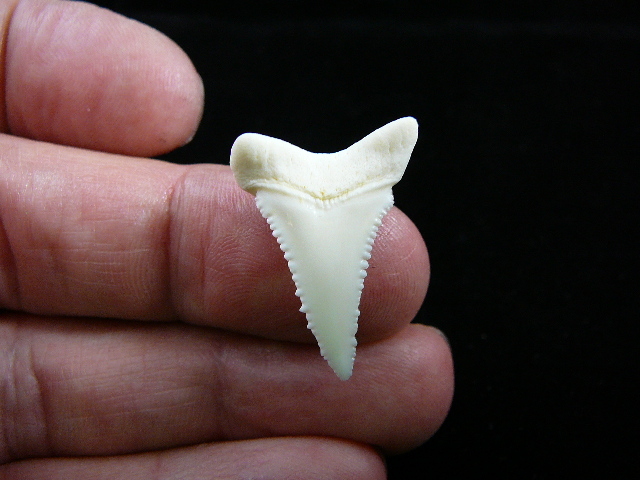 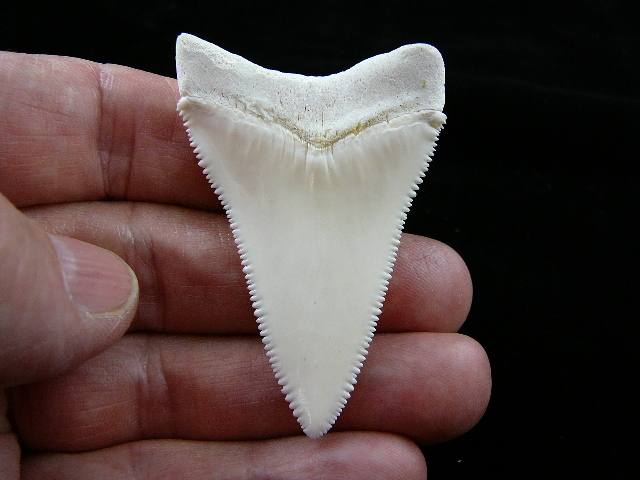 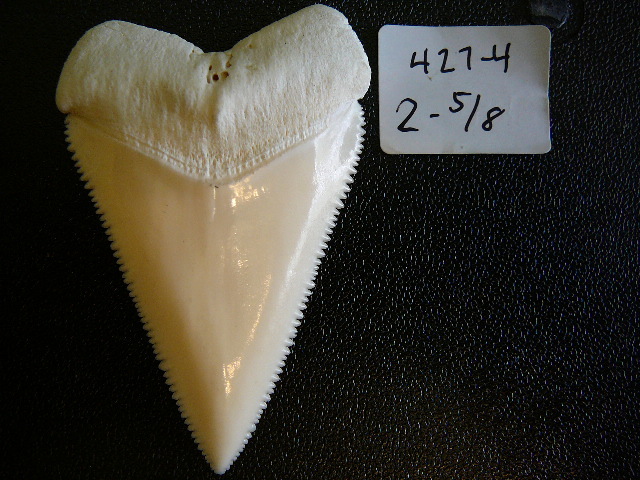 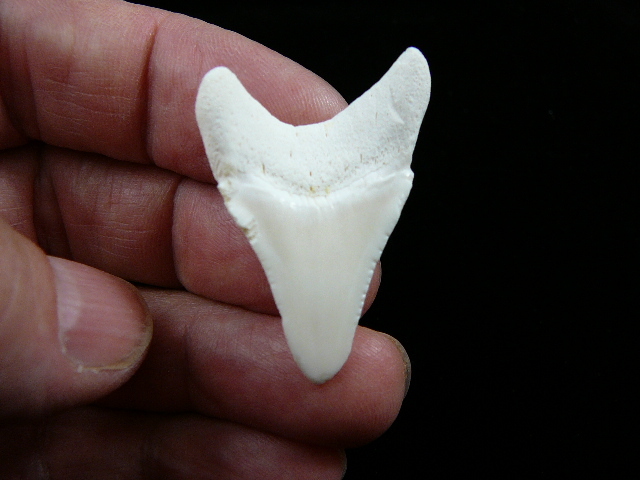 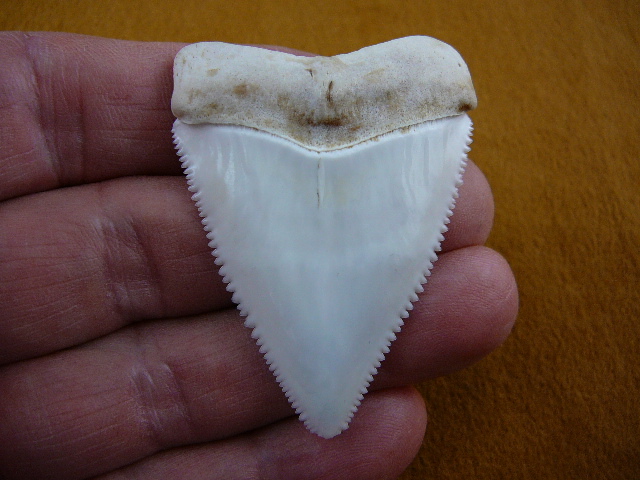 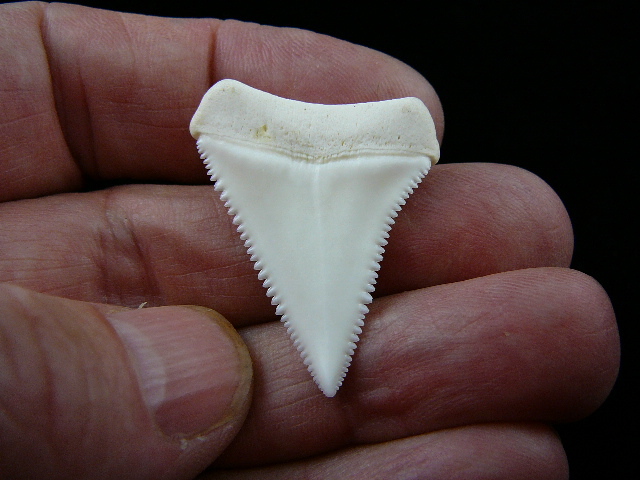 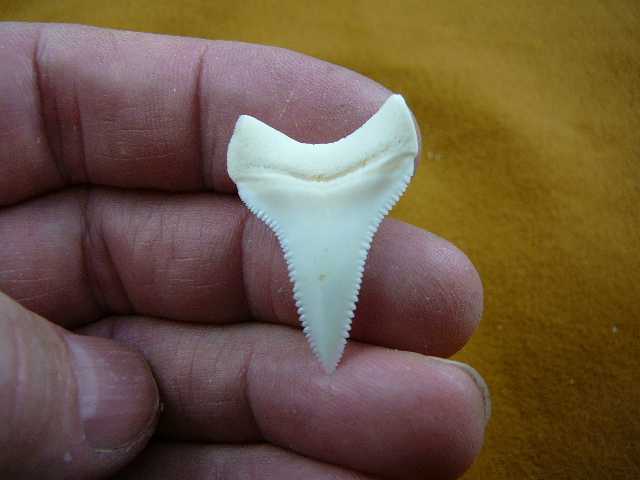 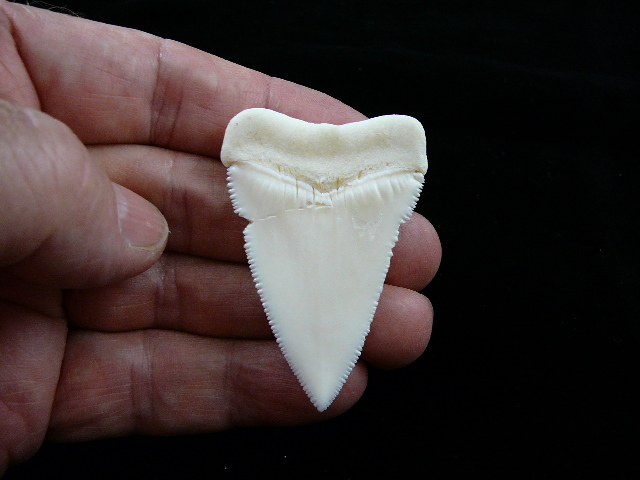 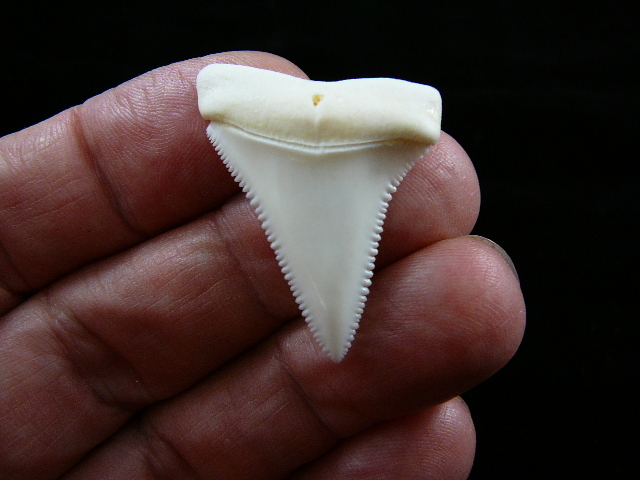 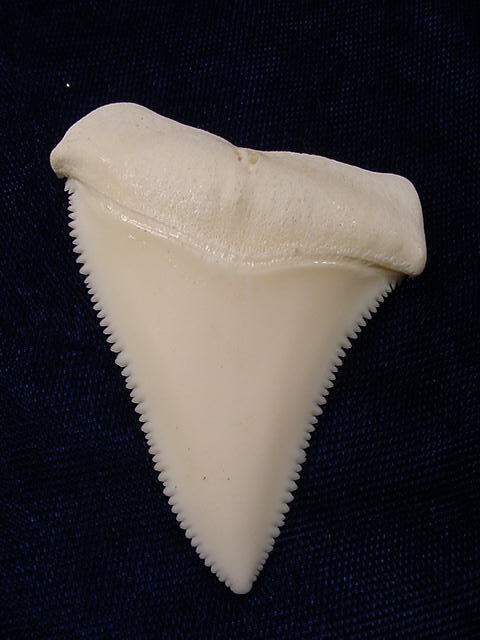 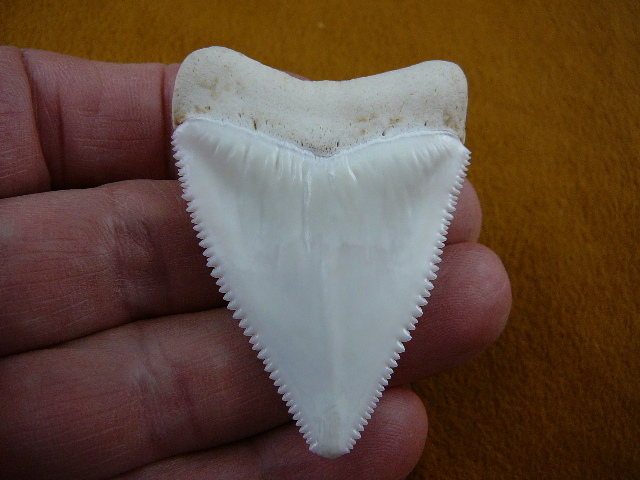 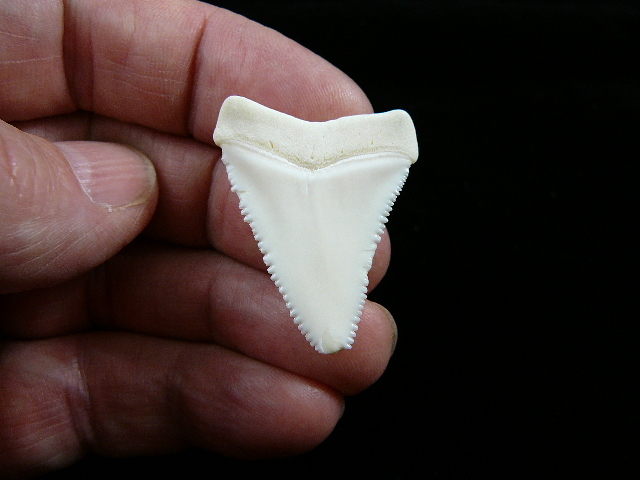 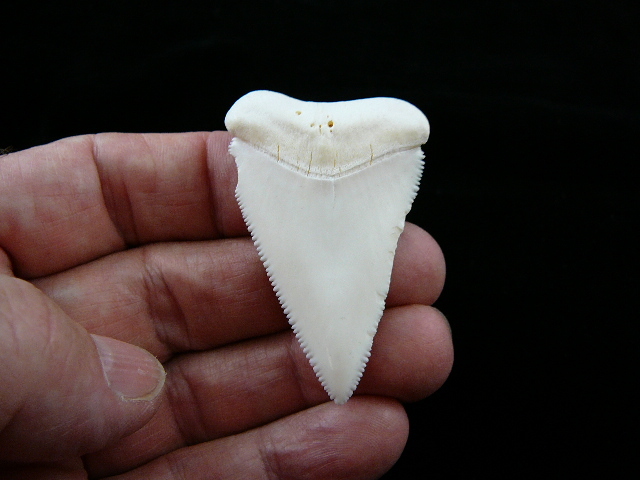 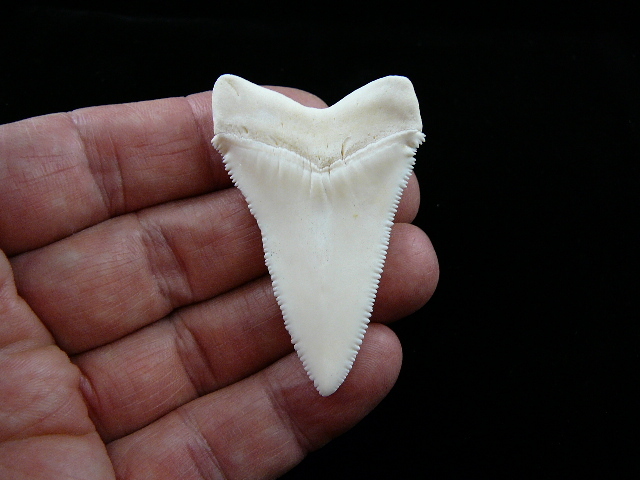 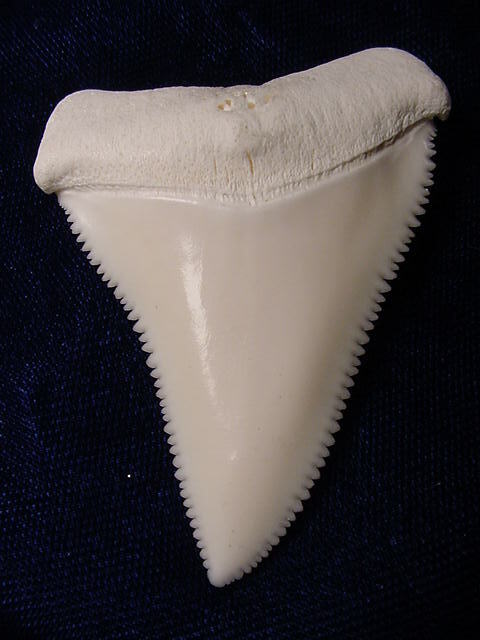 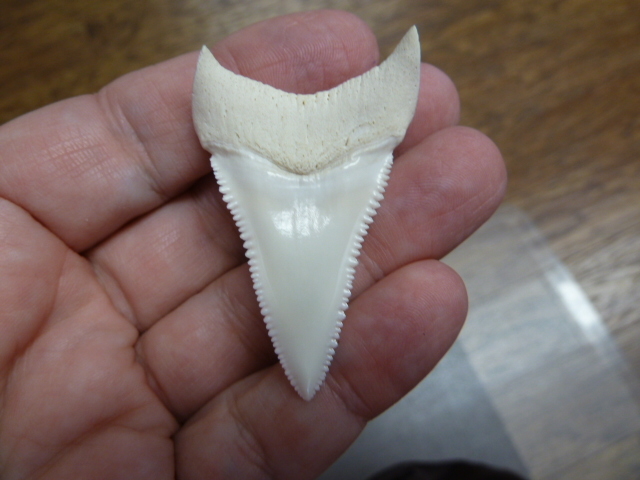 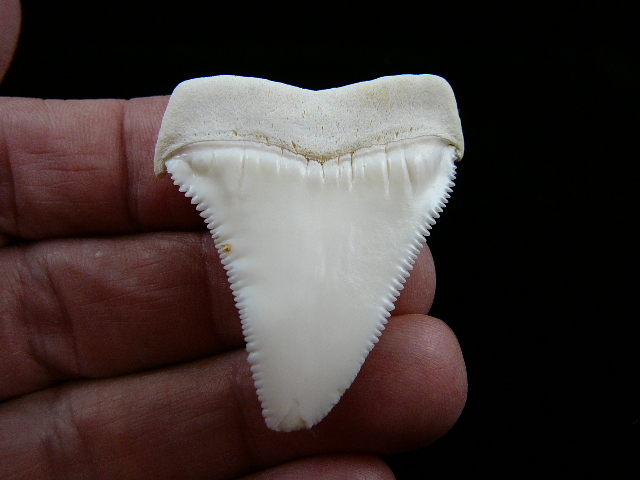 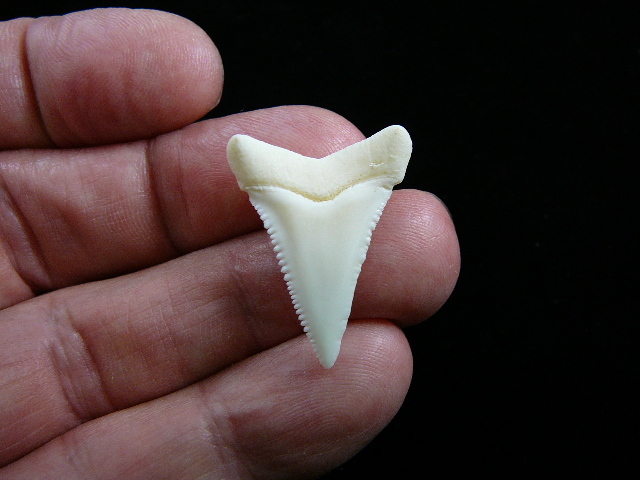 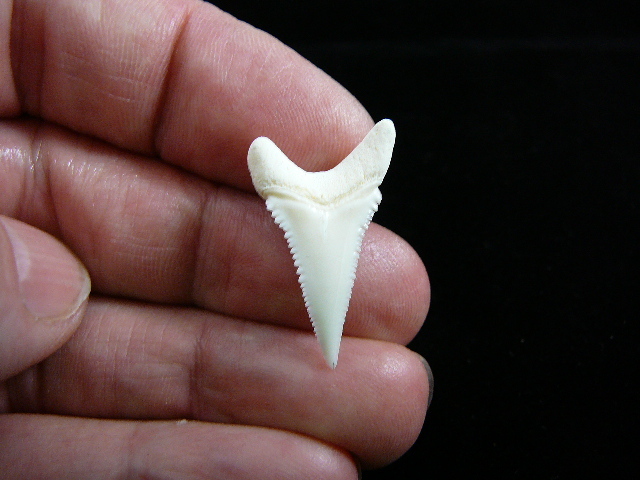 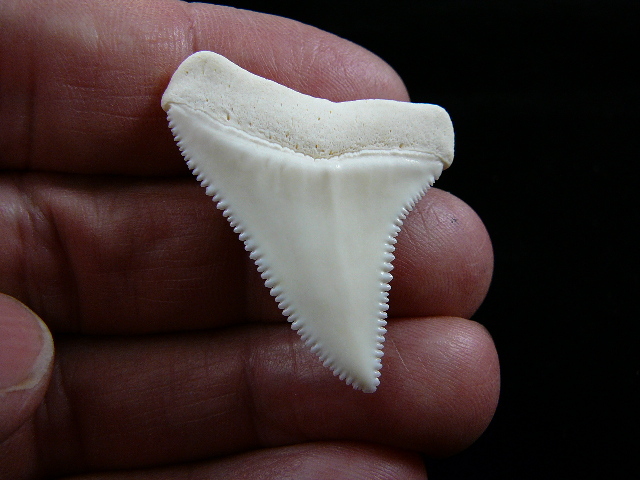 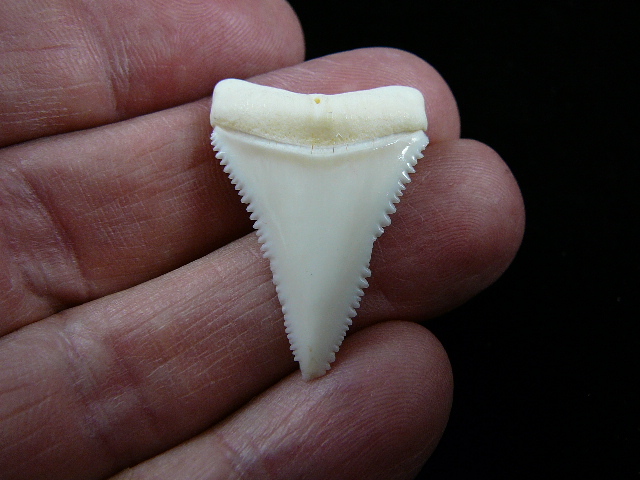 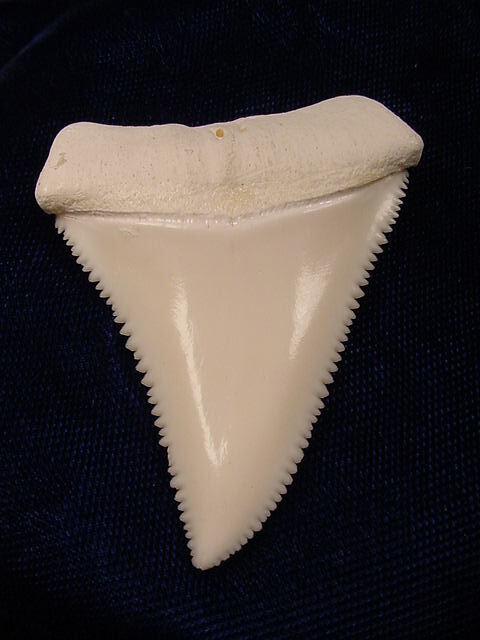 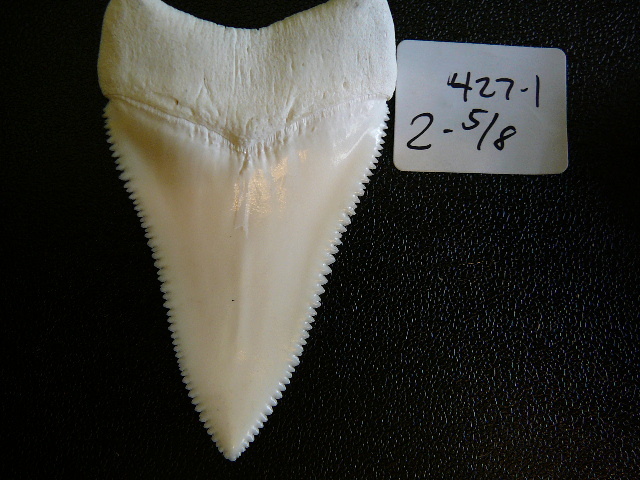 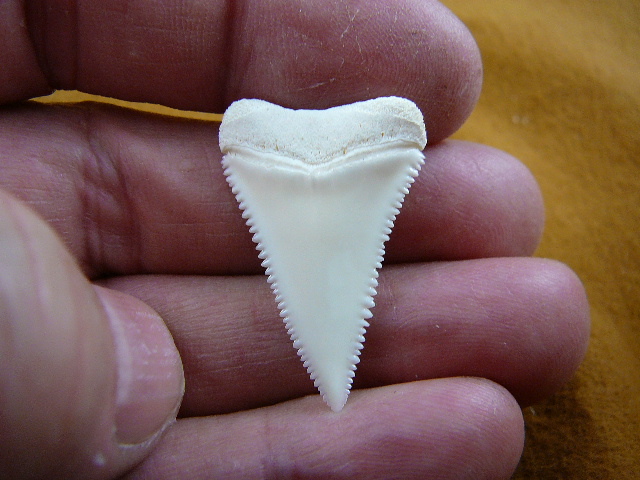 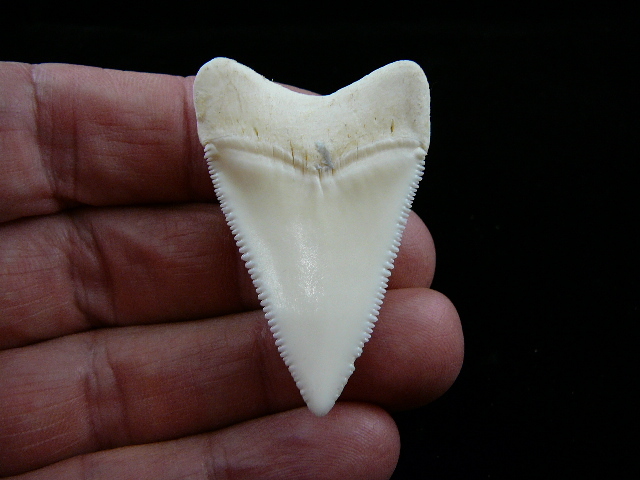 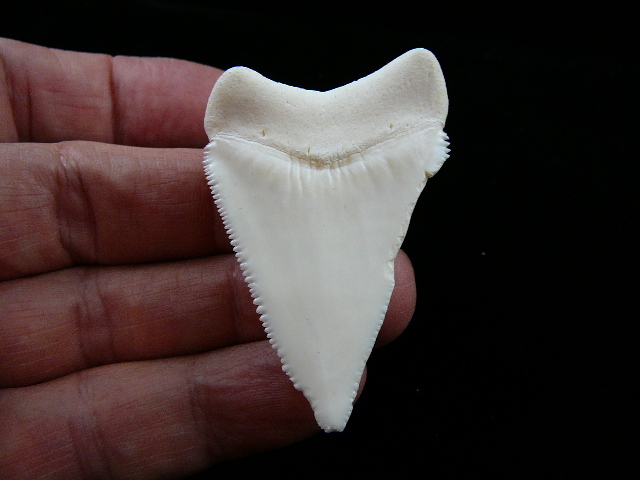 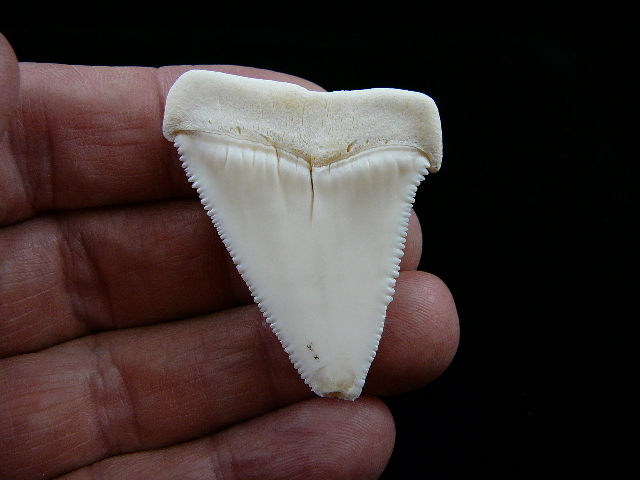 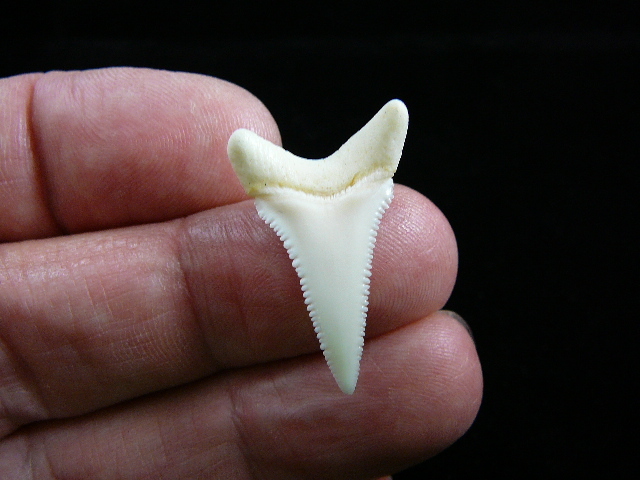 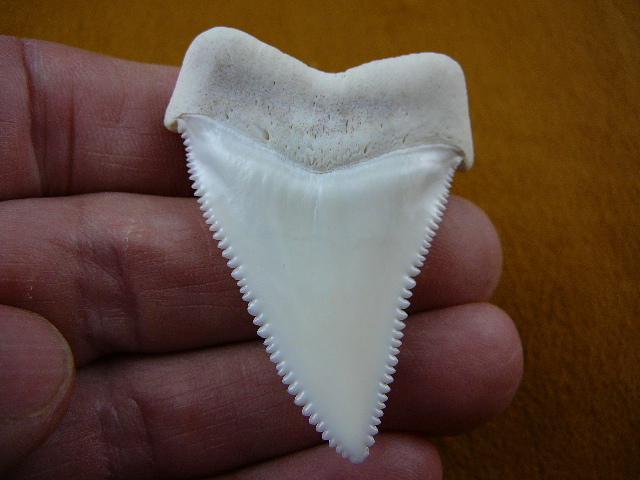 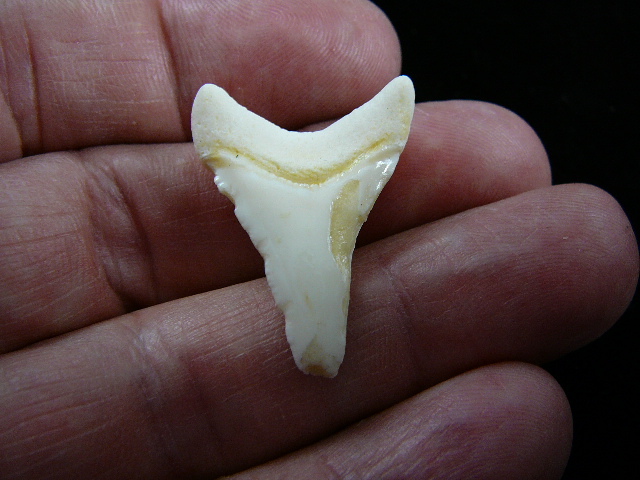 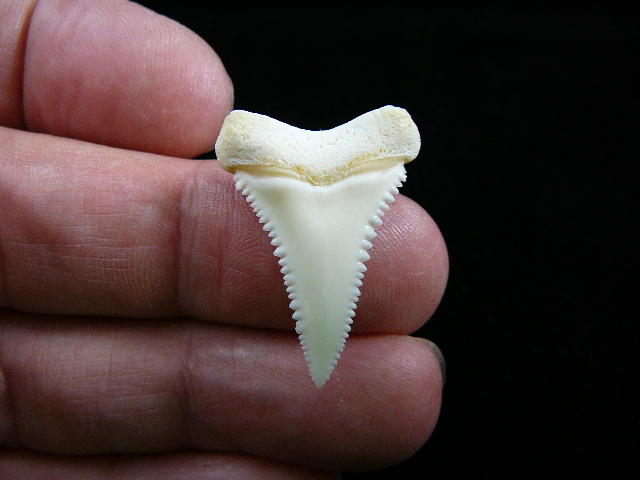 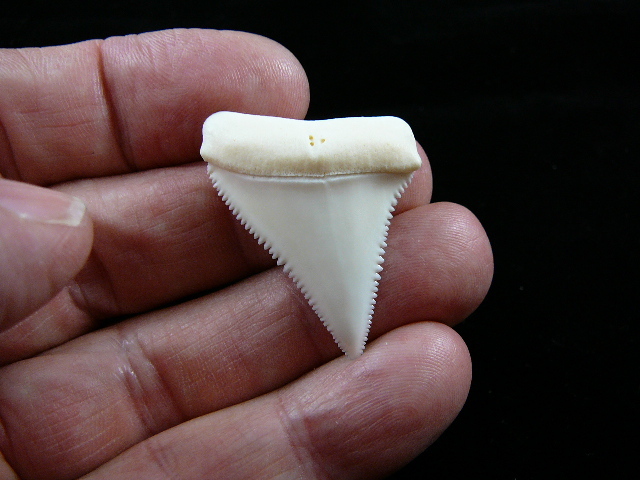 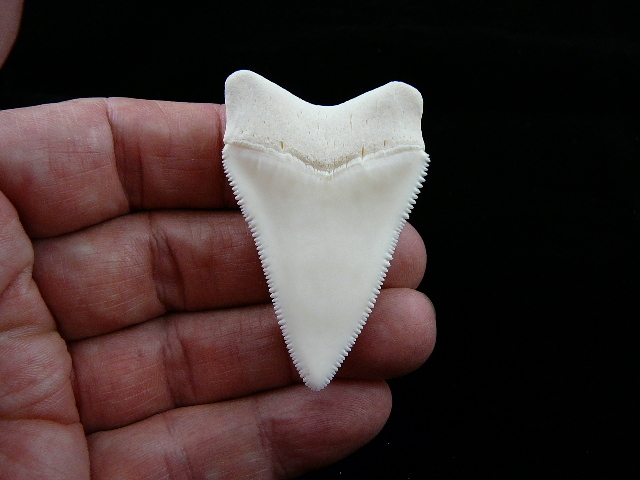 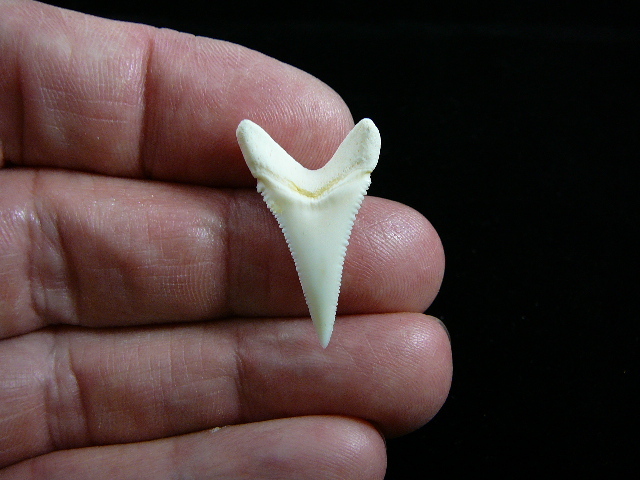 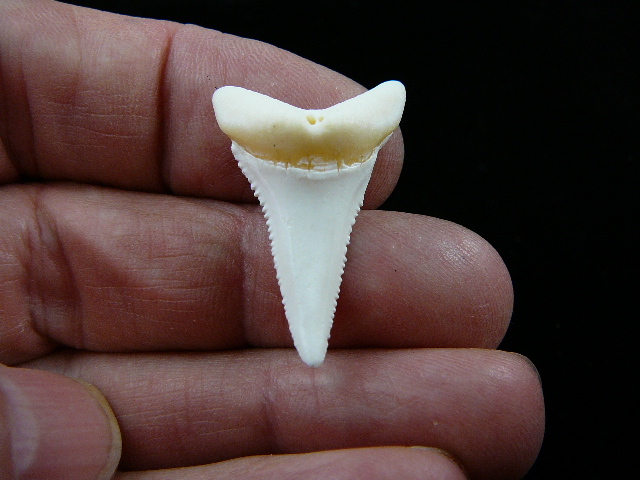 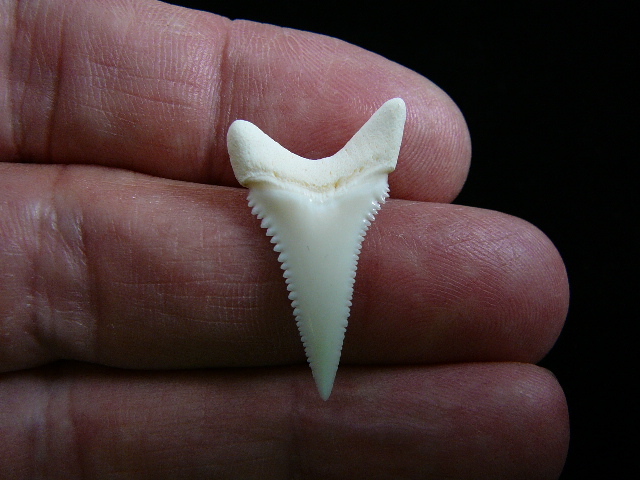 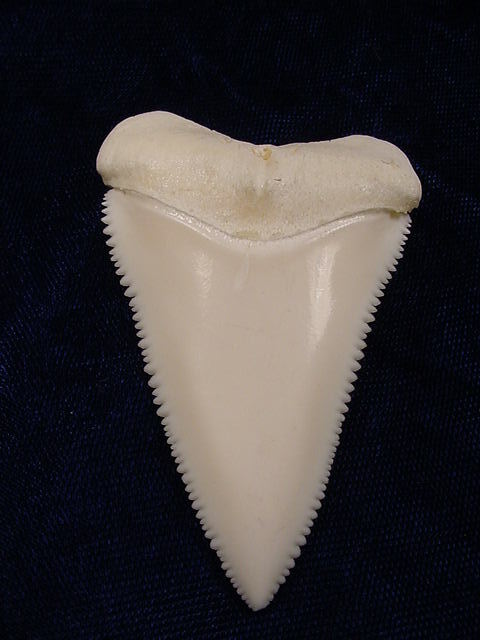 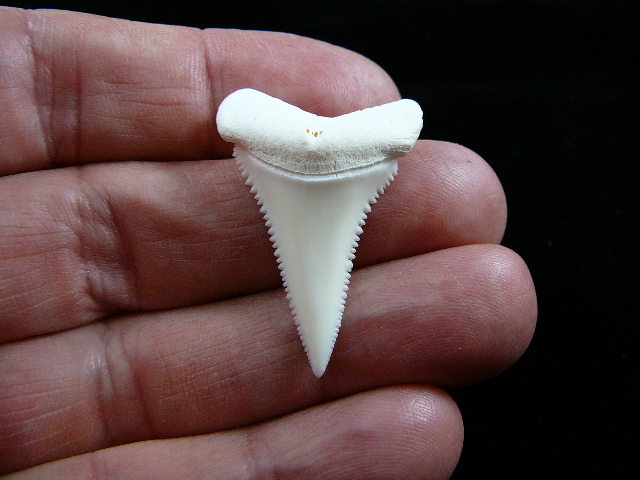 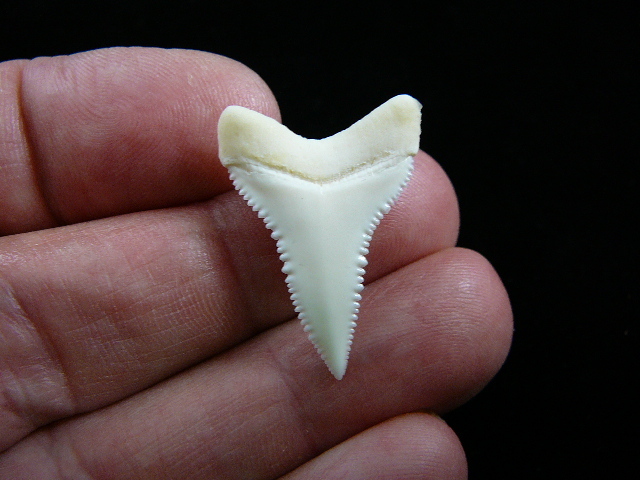 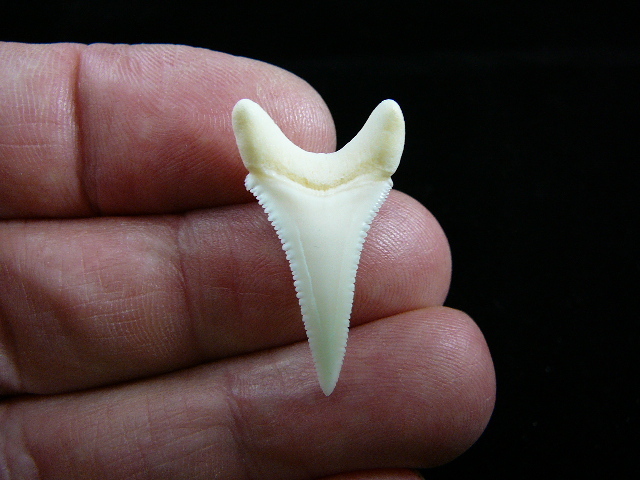 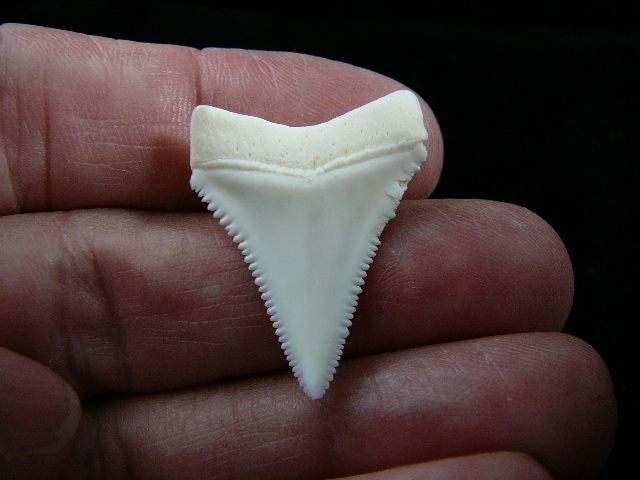 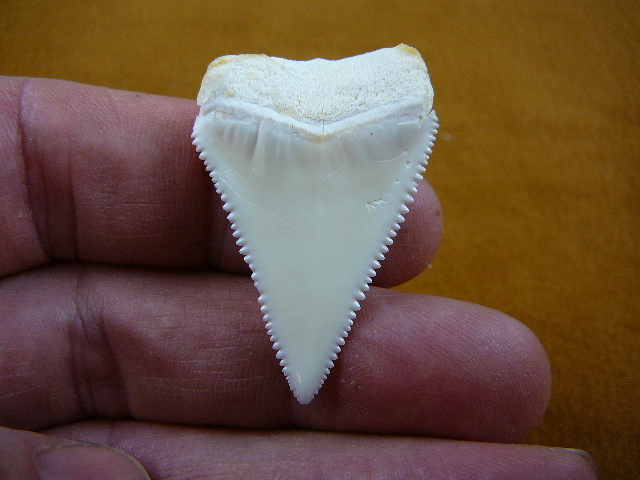 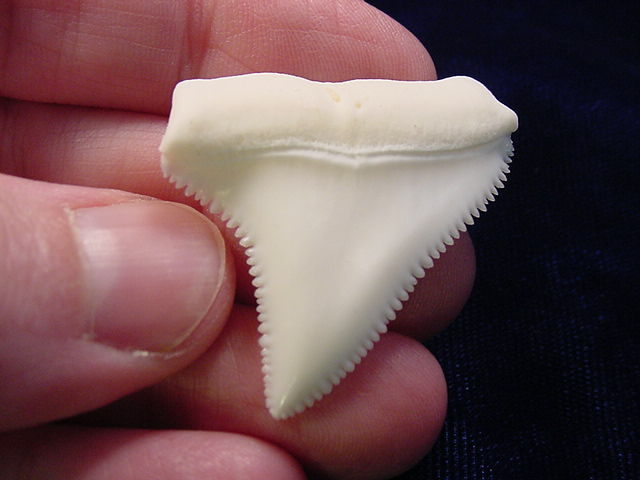 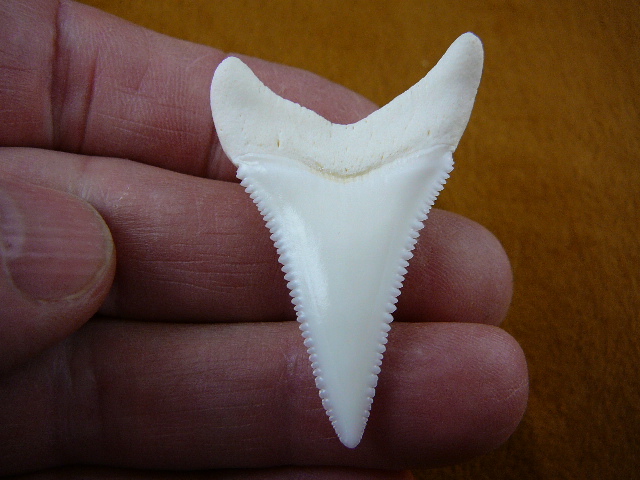 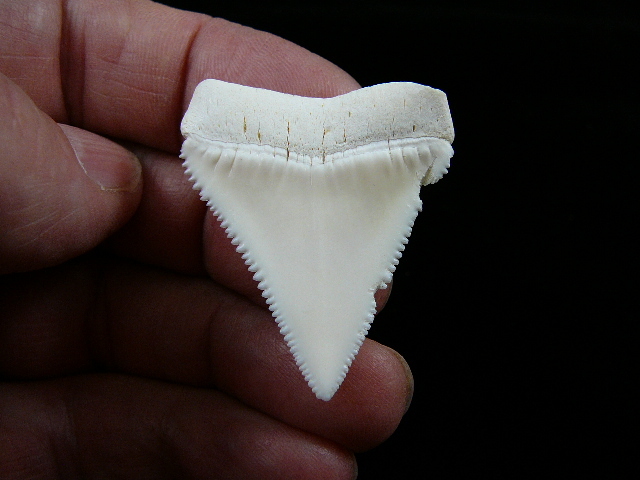 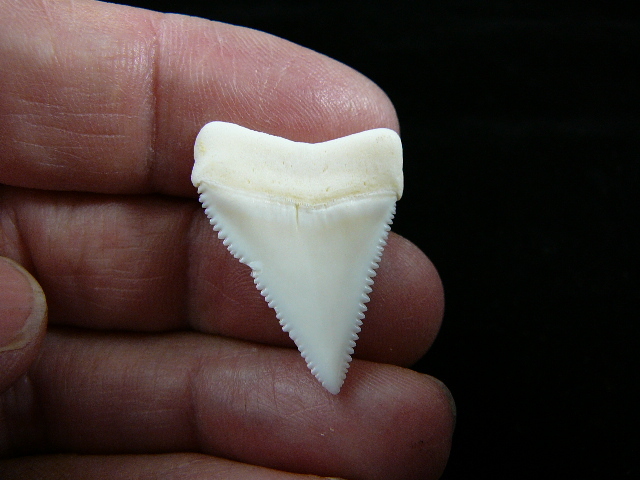 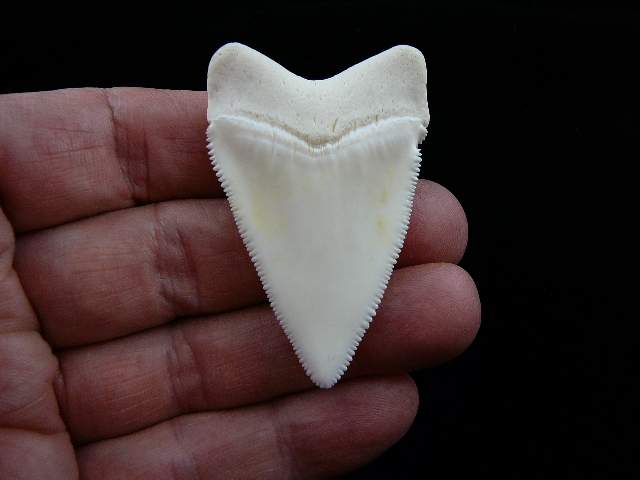 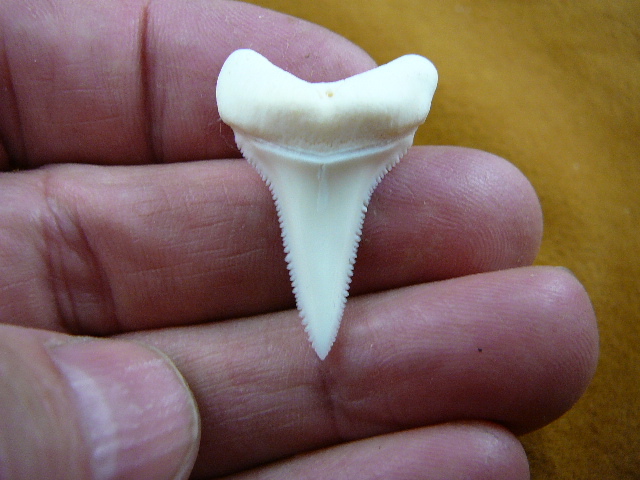 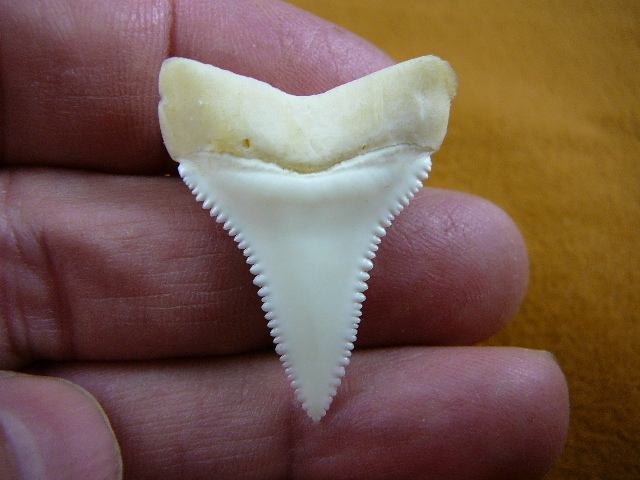 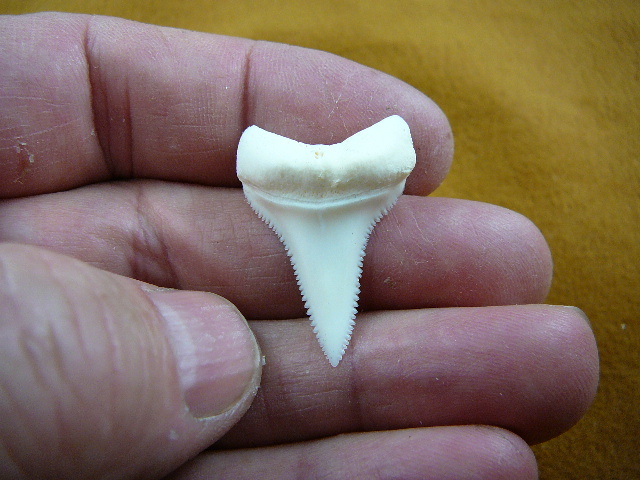 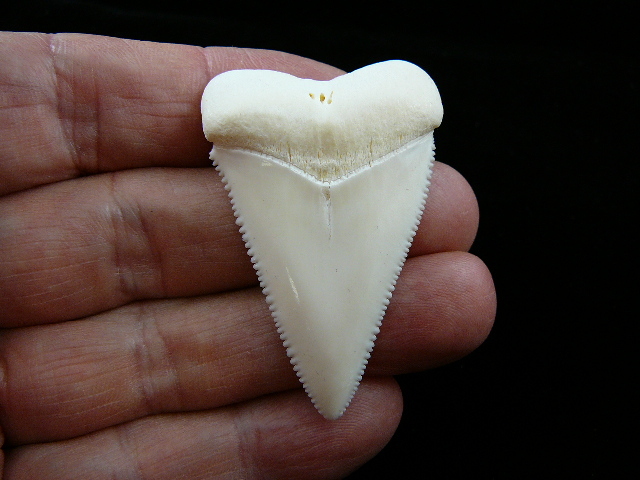 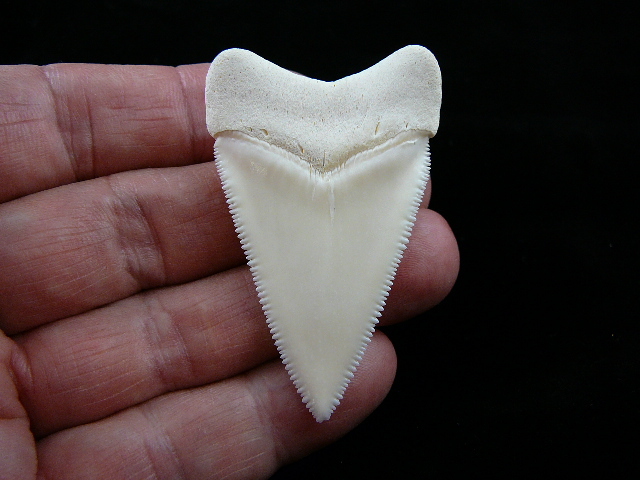 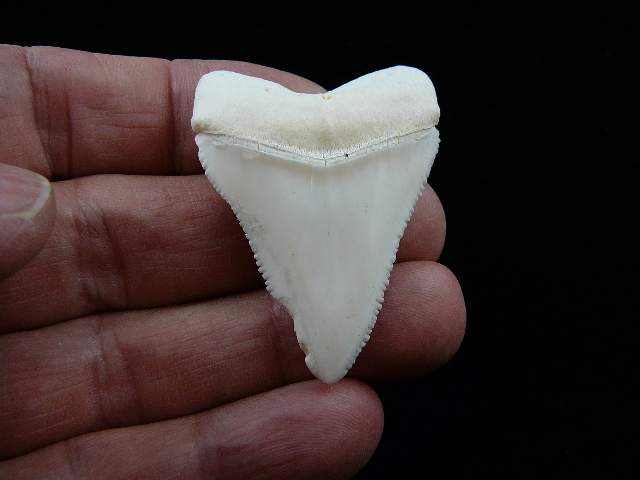 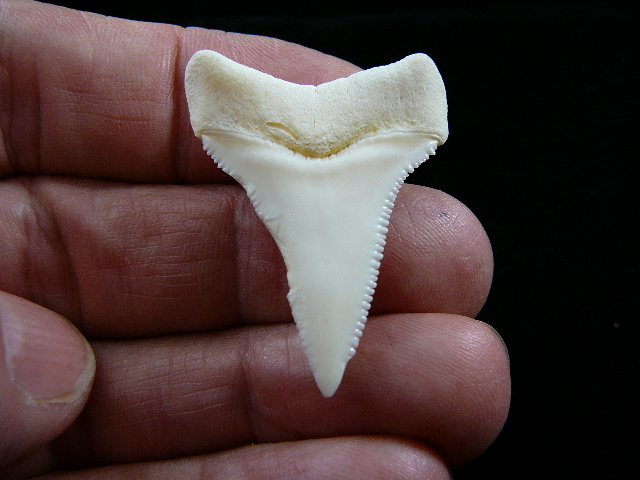 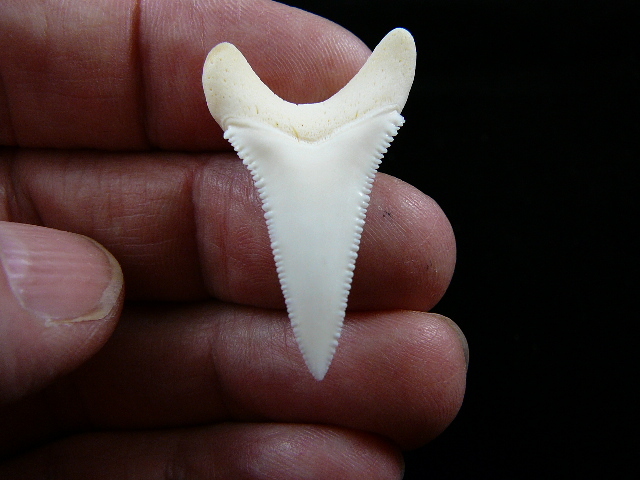 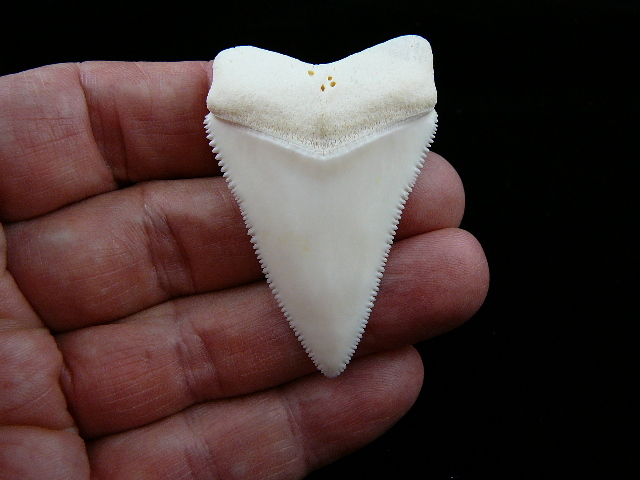 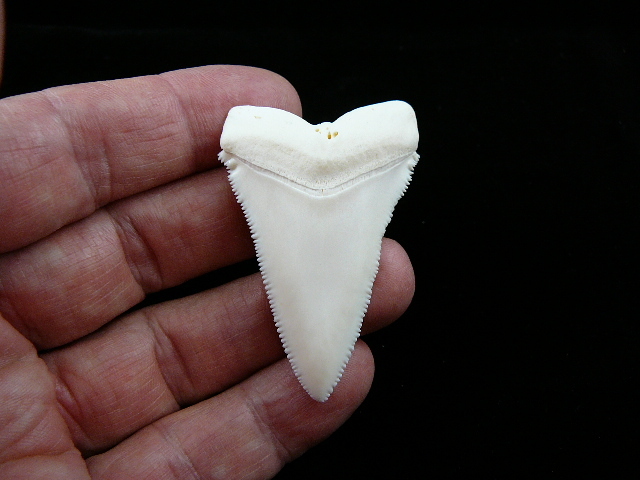 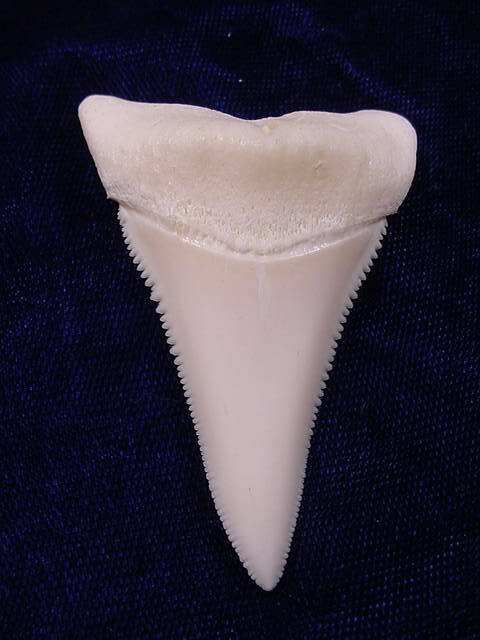 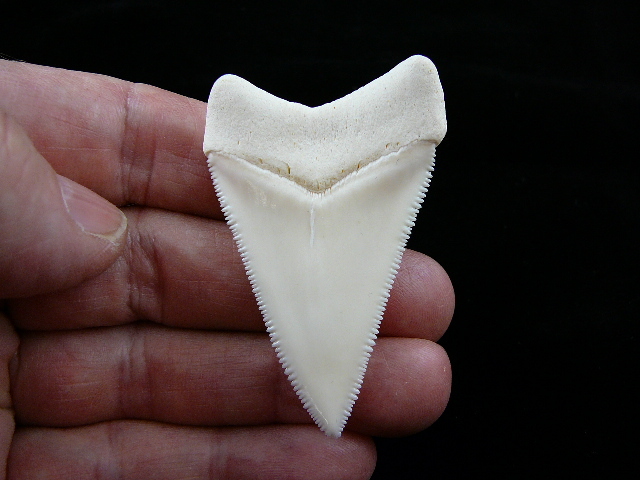 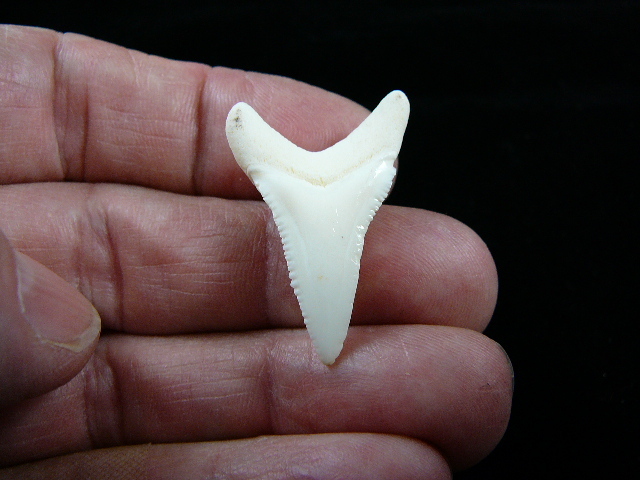 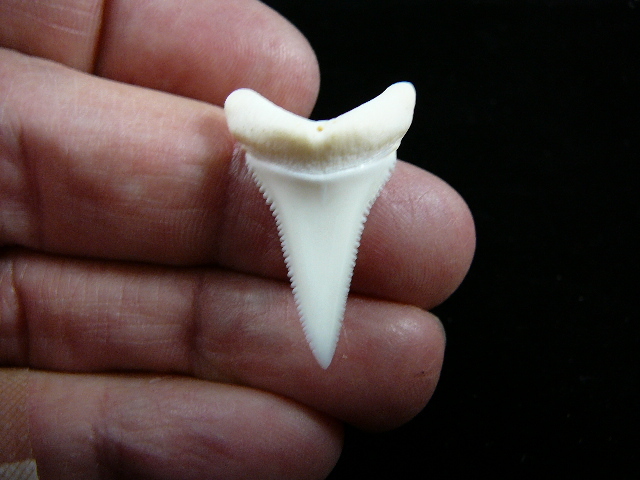 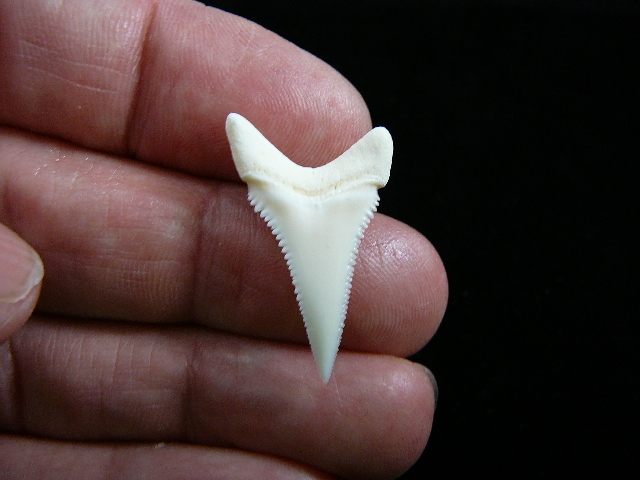 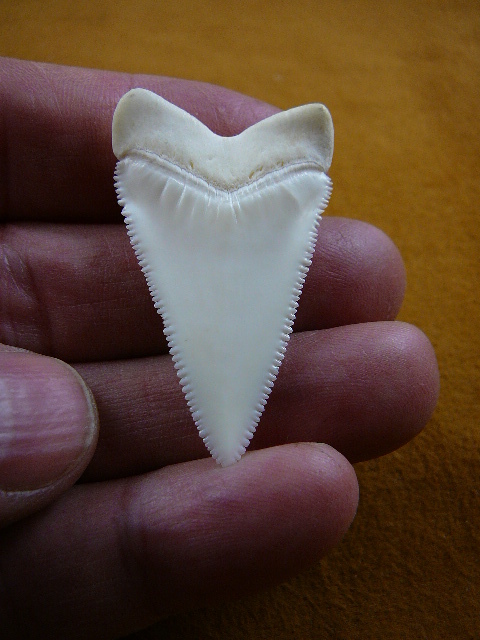 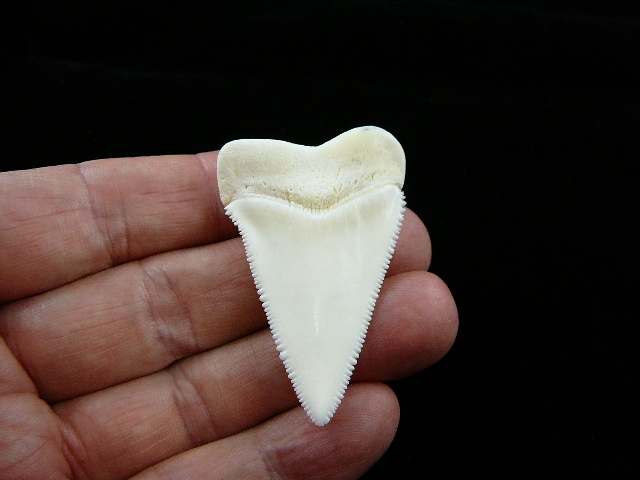 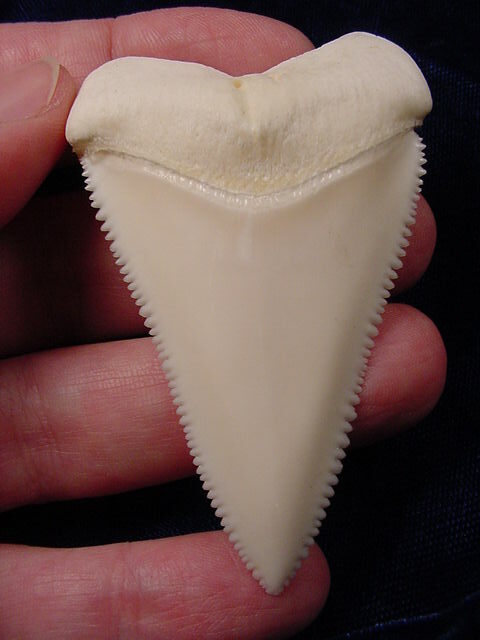 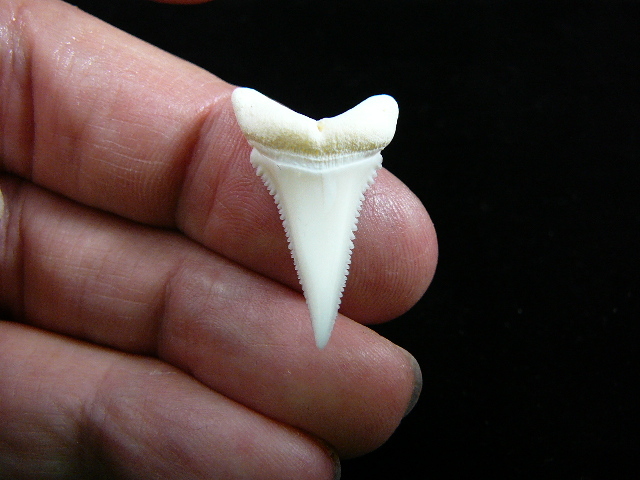 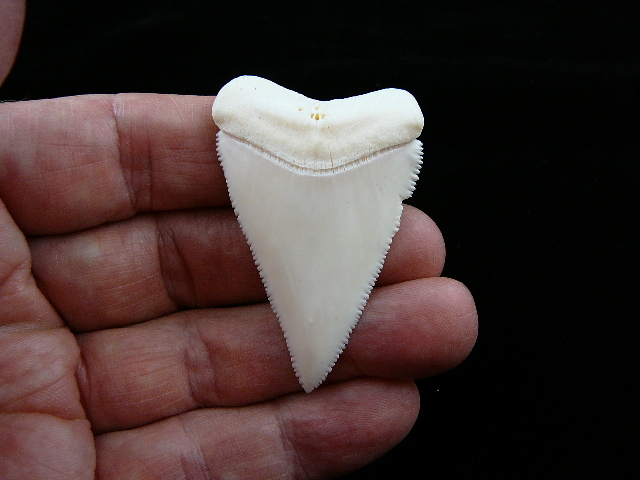 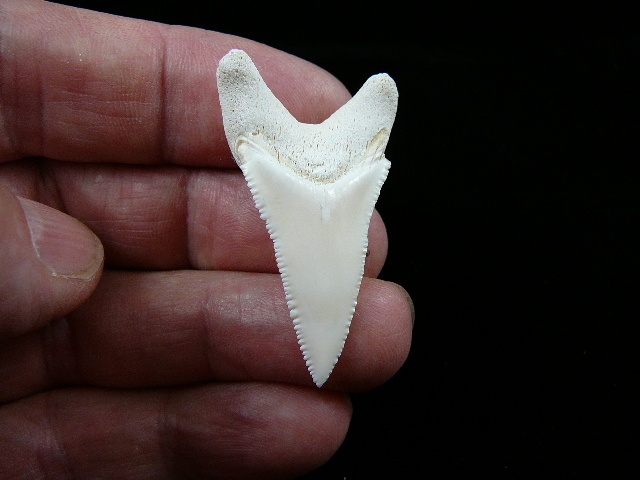 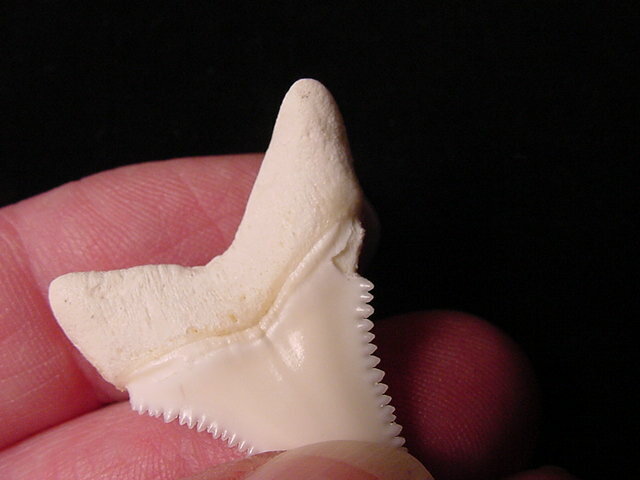 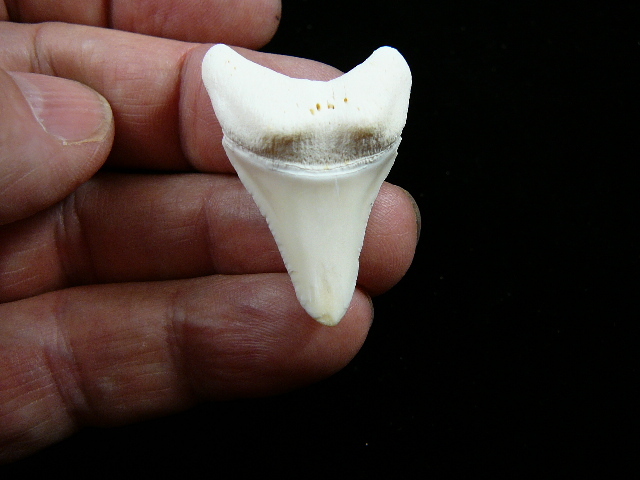 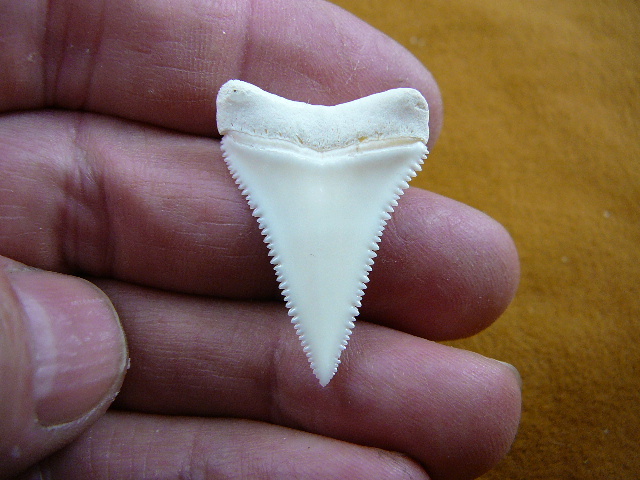 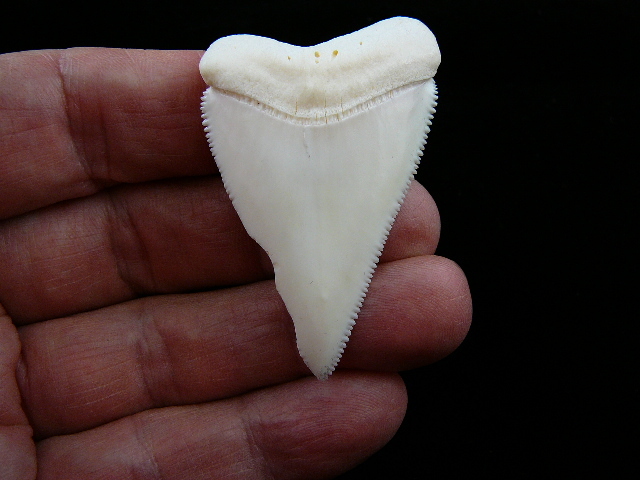 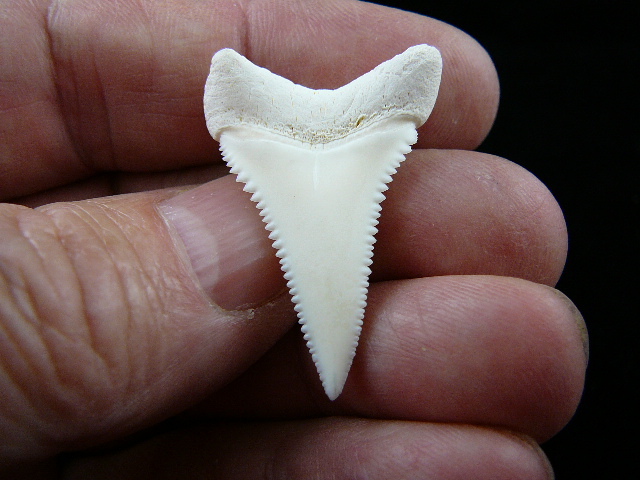 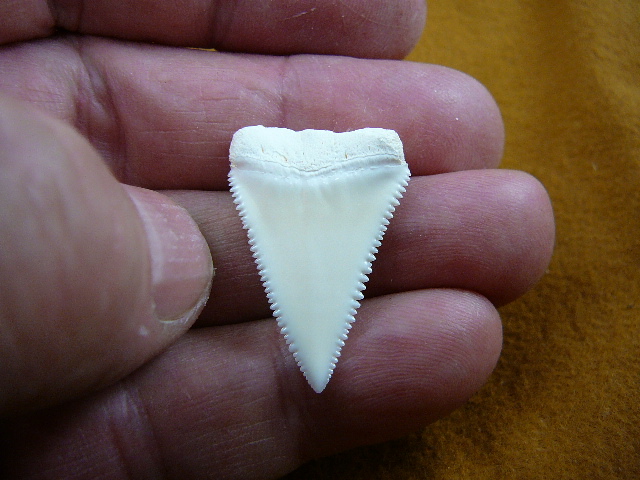 Modern Great White shark teeth are not found while diving or digging. 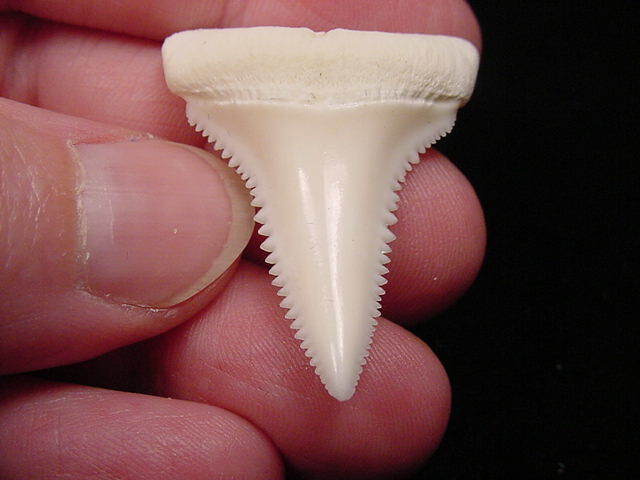 They now only come from existing collections. 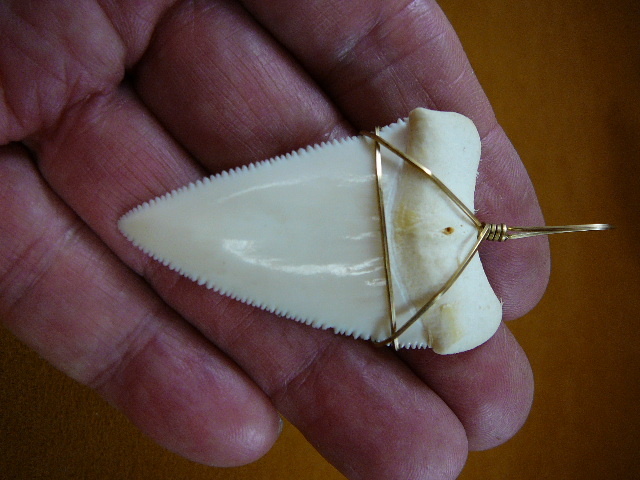 If you wear the tooth as jewelry, brush it with white toothpaste periodically to remove body oils & dirt. 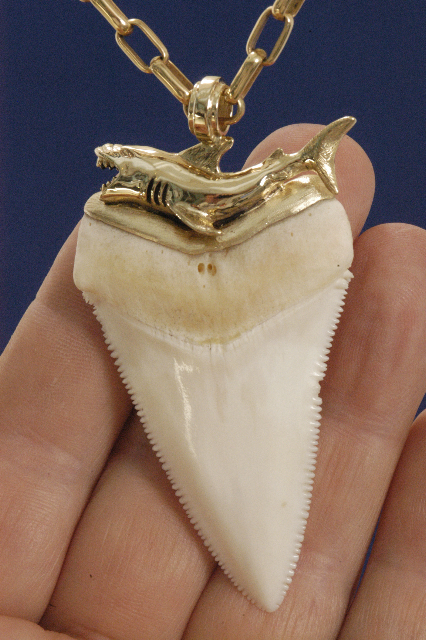 We do not recommend that the tooth be worn in water (shower, ocean, pool). 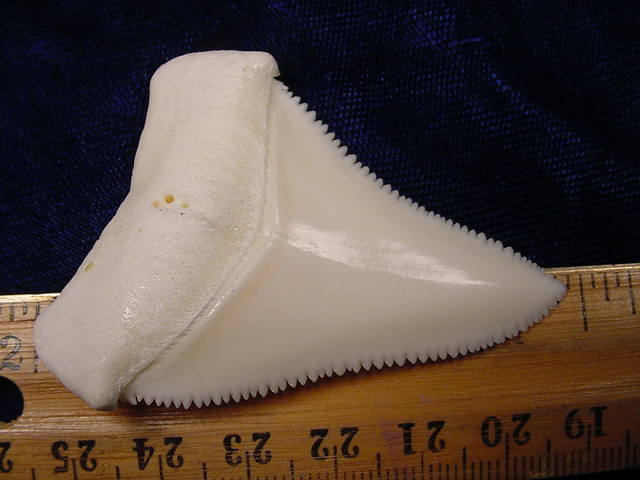 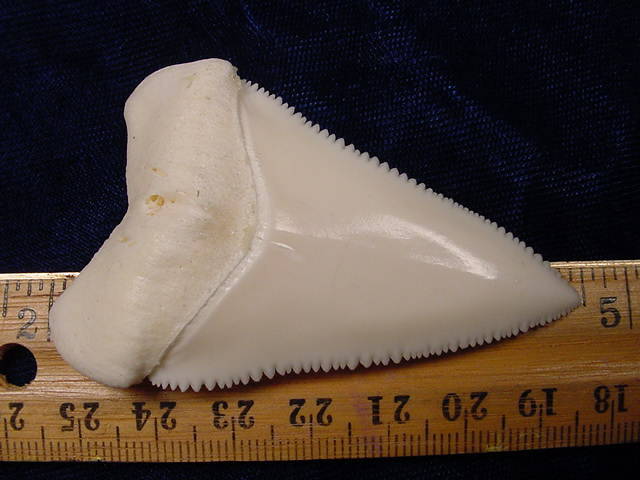 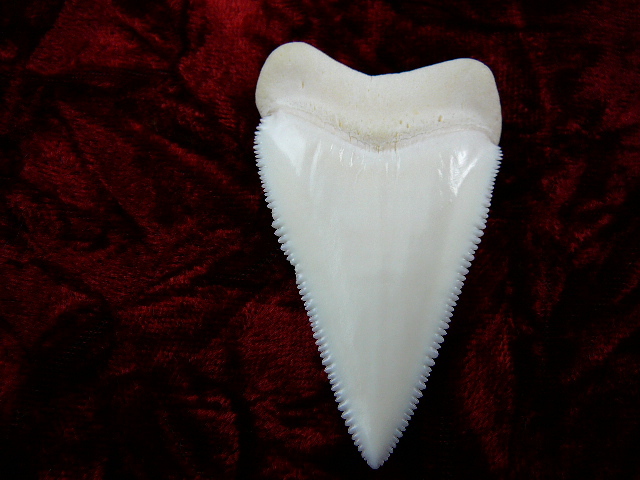 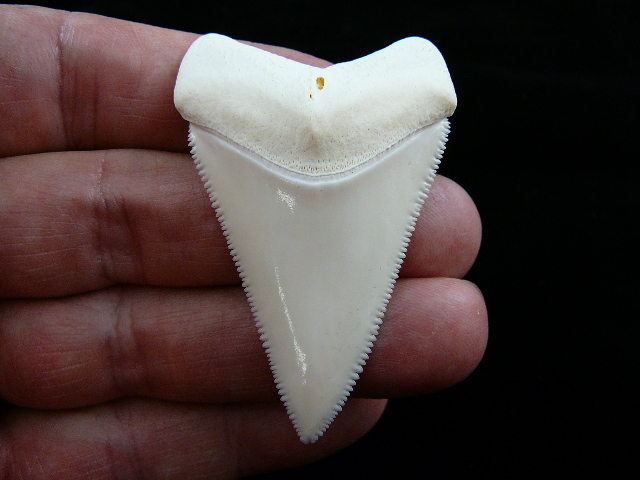 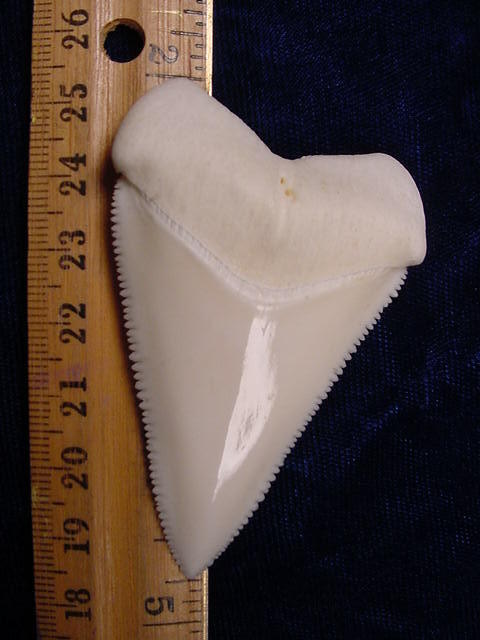 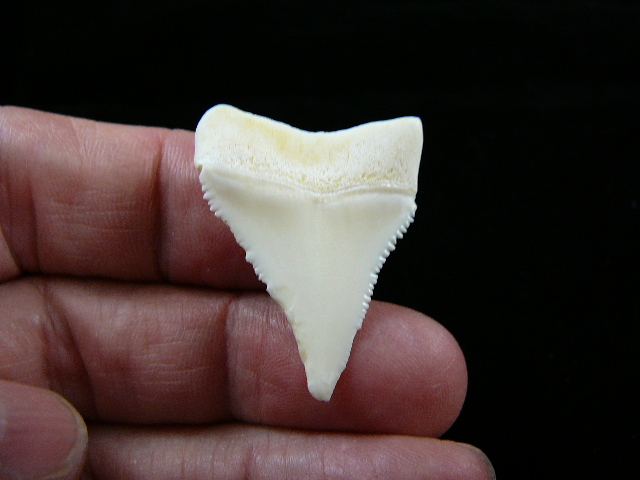 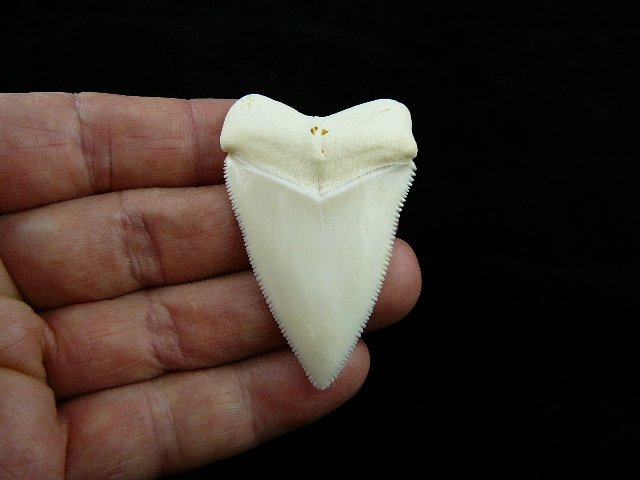 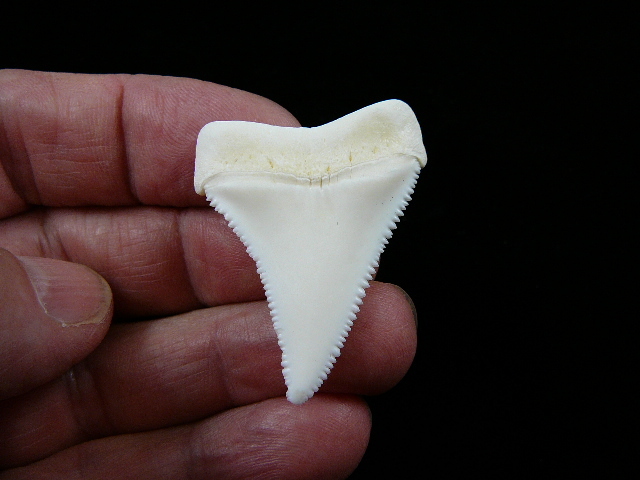 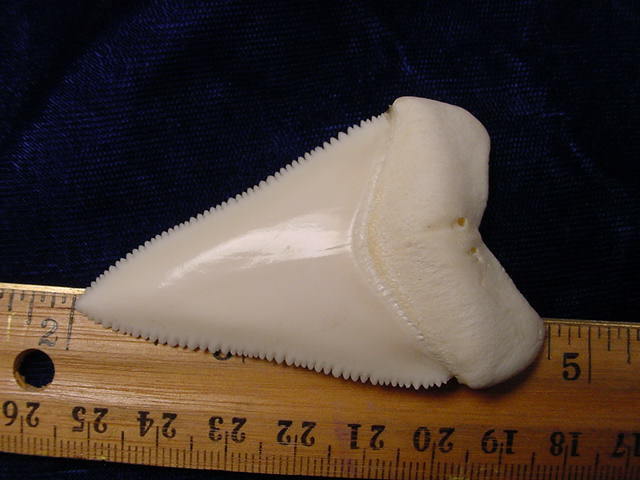 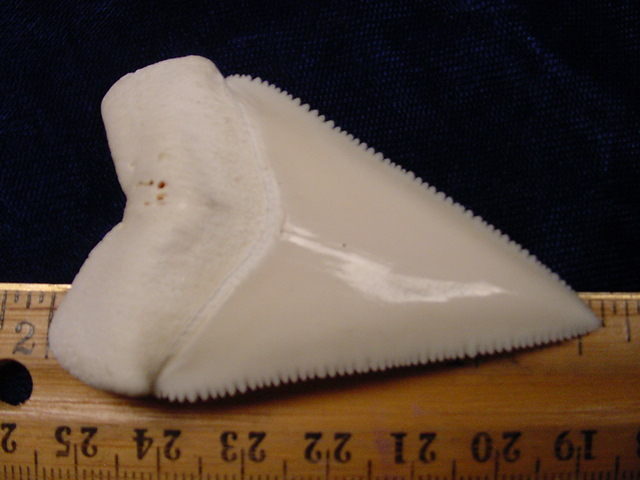 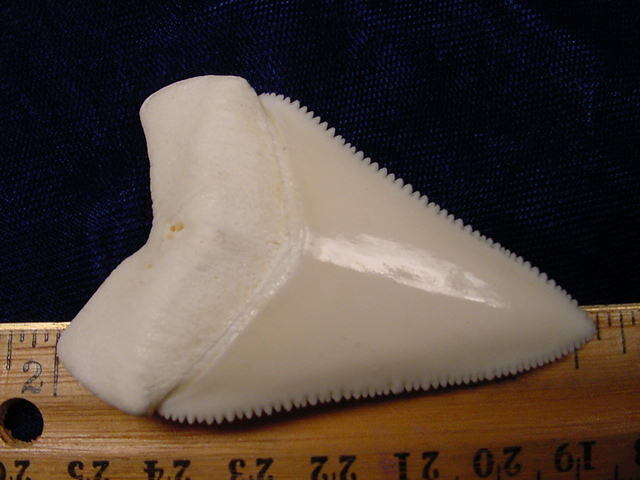 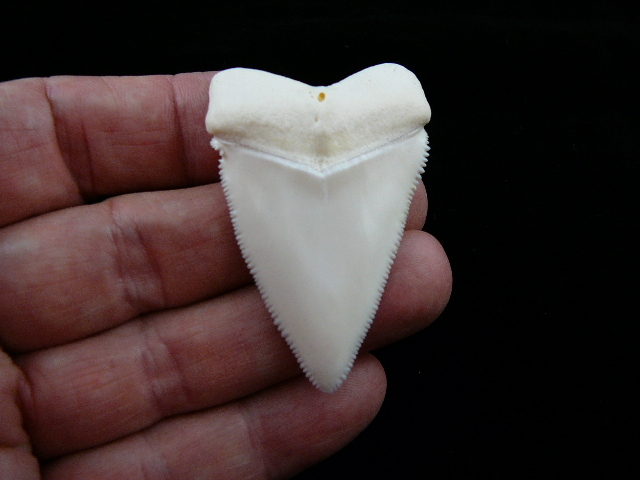 This tooth is no longer in the mouth of a living shark and must be treated differently to maintain its white color (would you wear your leather shoes in the shower?... 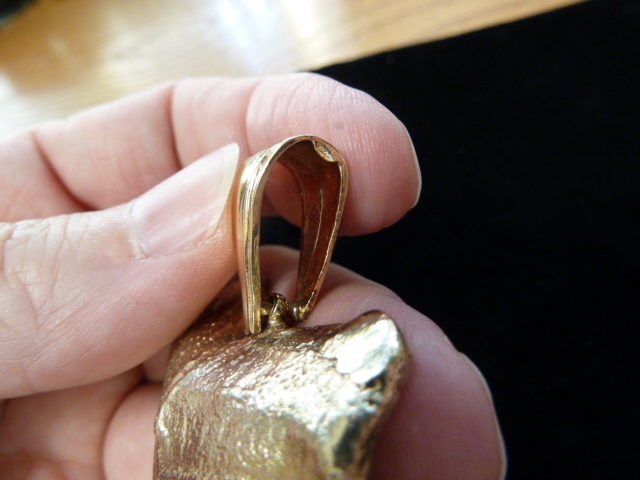 same principle). 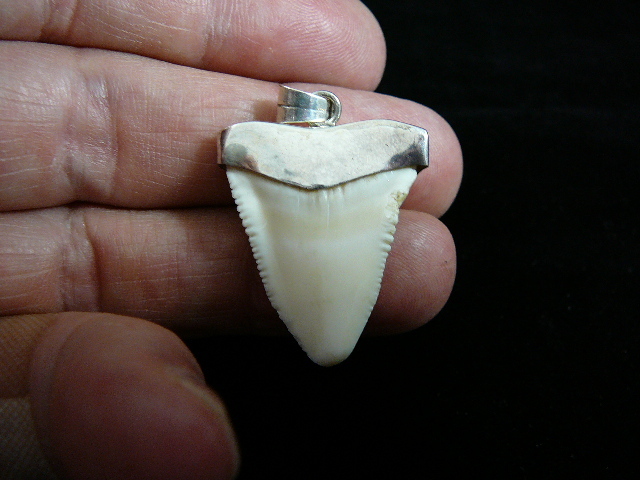 Either the tooth will be kept in a display box as a collector tooth, or worn on a regular basis and not be of collector quality after being worn. 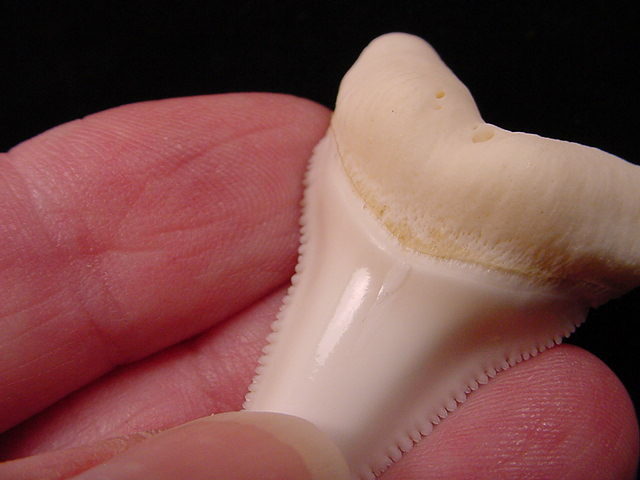 So, for daily wear, you may want to treat the root (the porous top of the tooth) so it will not discolor from body oils, and to prevent moisture from getting into the tooth tissue and discolor it. 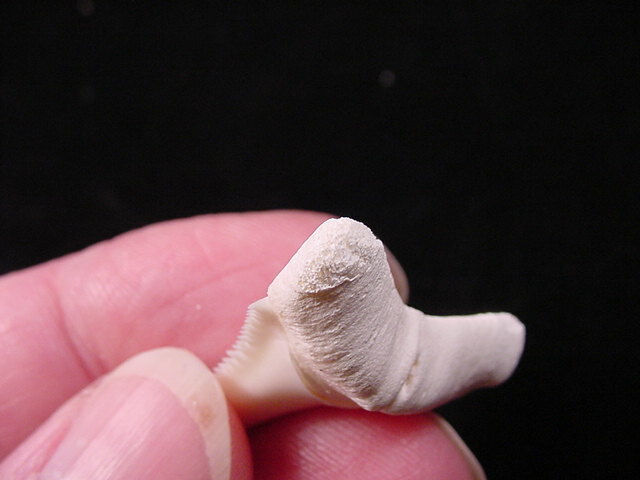 Treatment: brush on clear finger nail polish (from a pharmacy) or polyurethane (from a hardware store paint department - from a can you can brush it on, not spray),and the root will stay white without the need to clean it again. 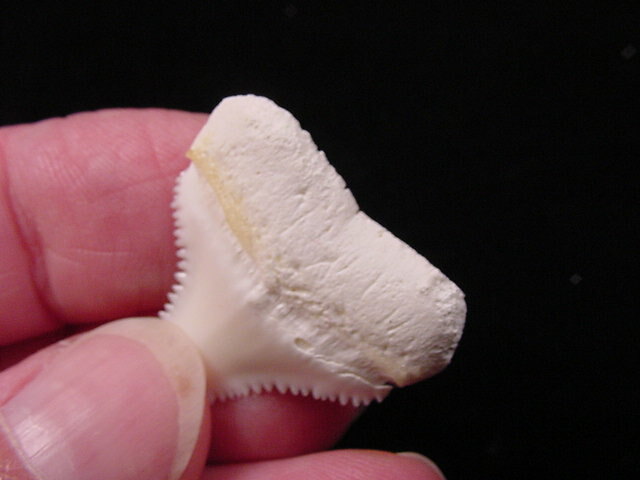 gum to turn yellow and flake off. 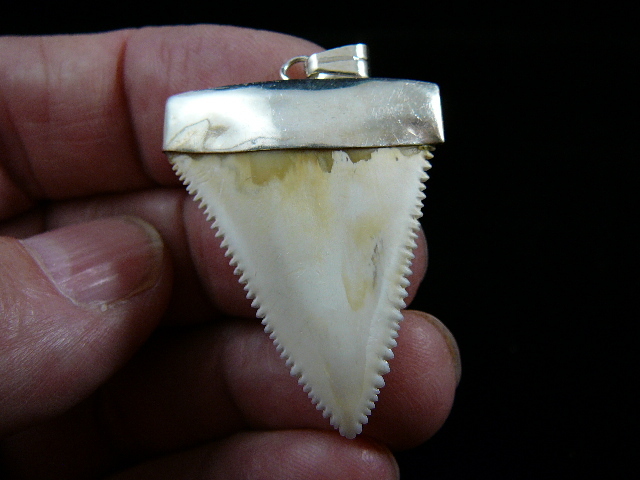 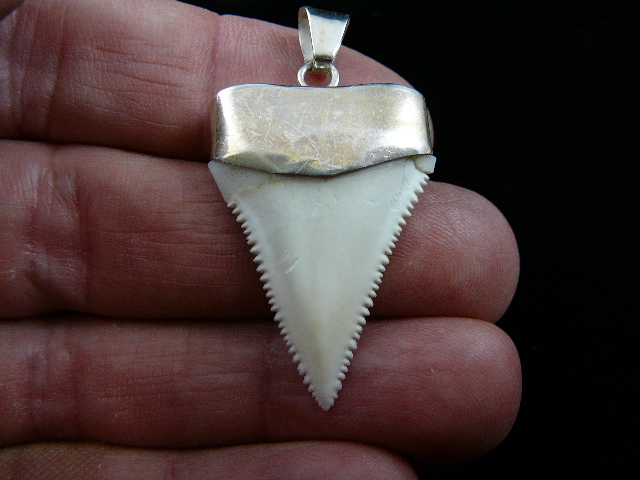 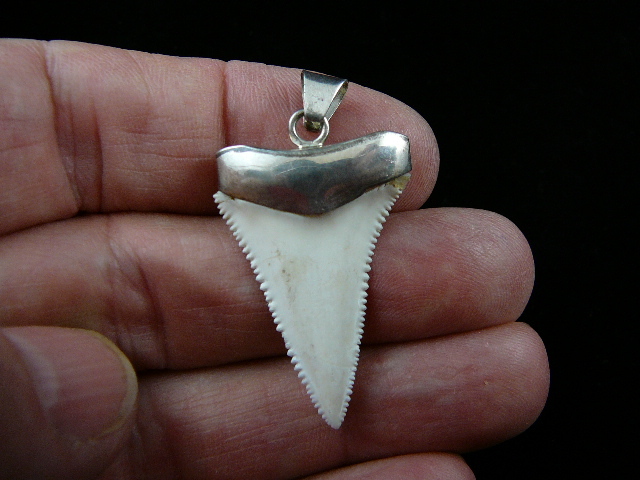 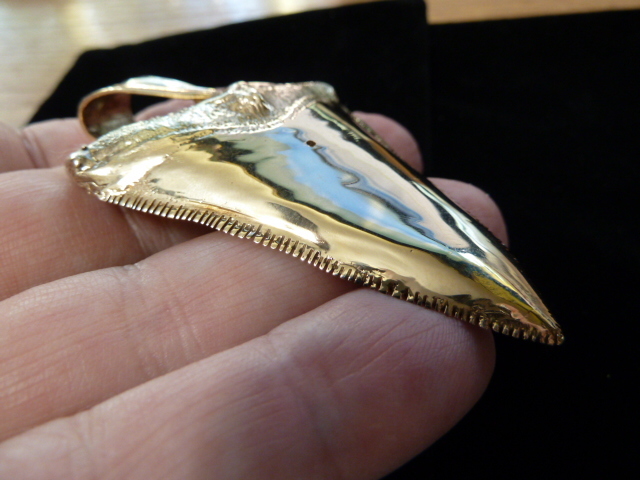 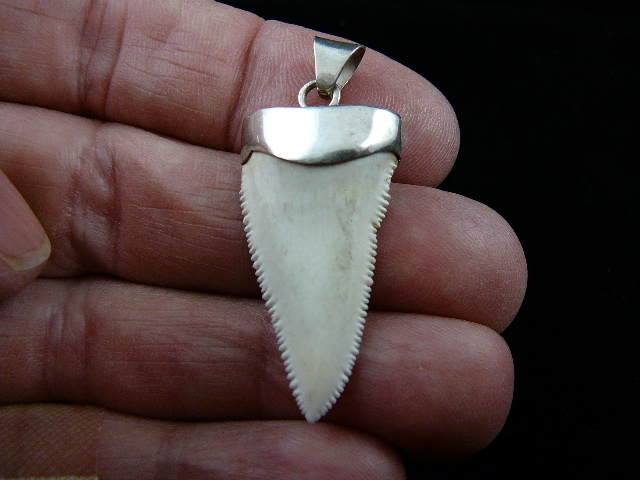 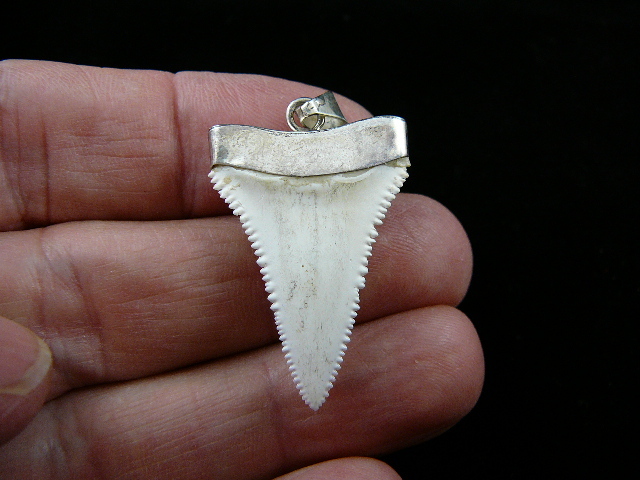 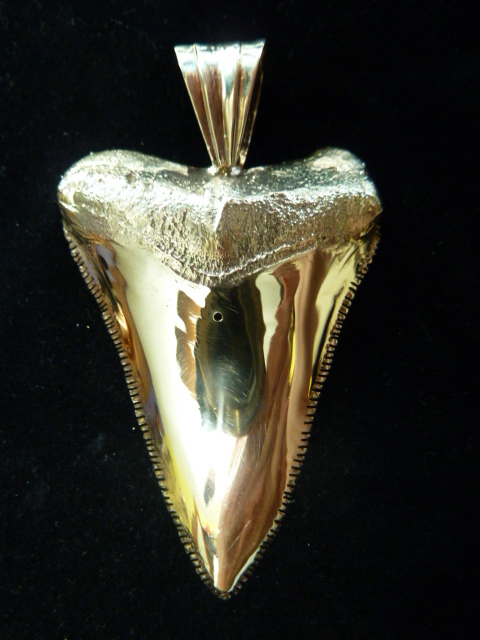 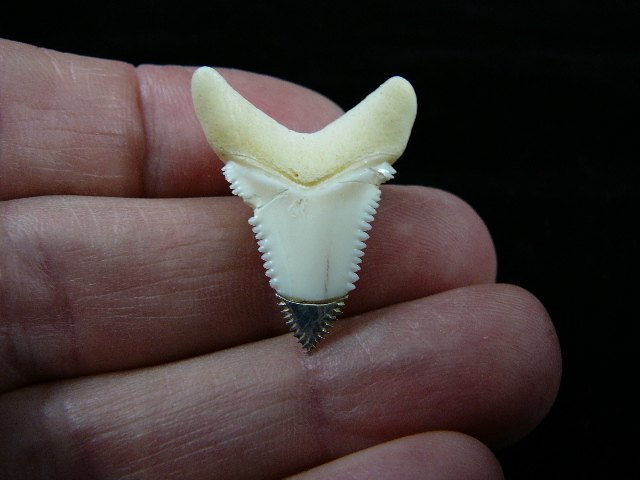 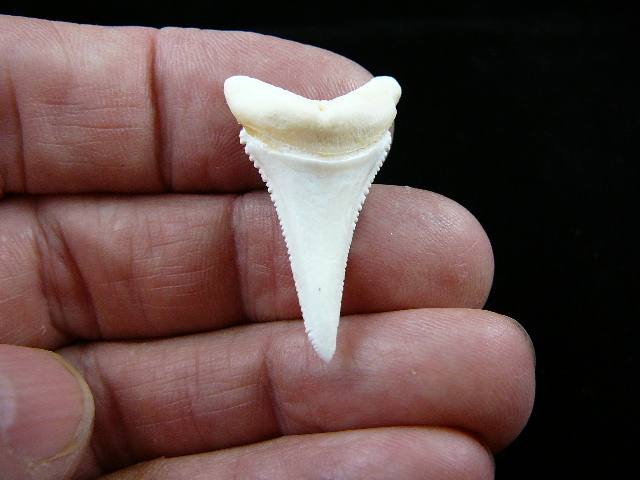 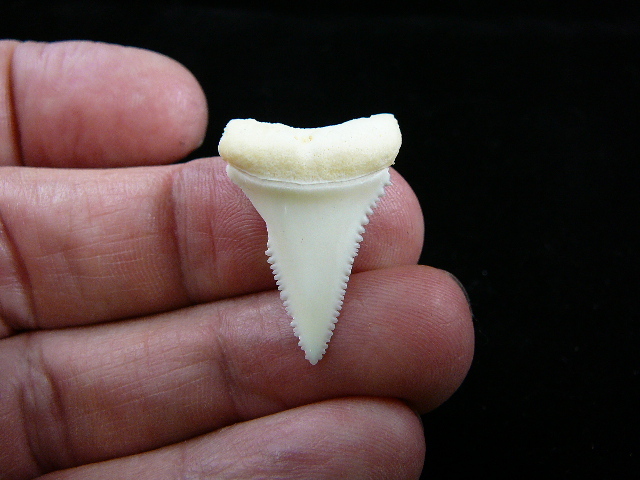 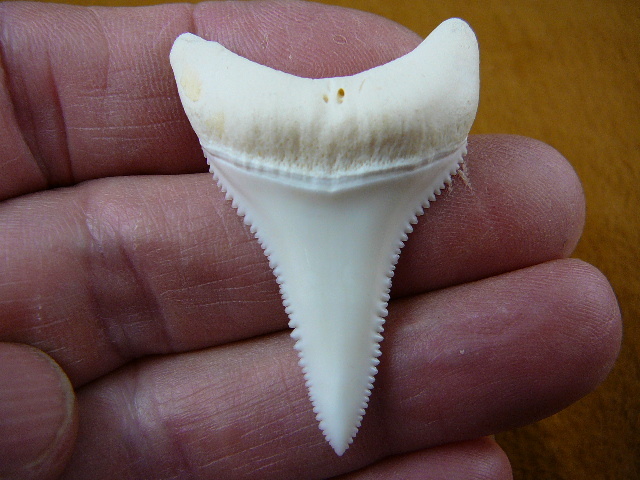 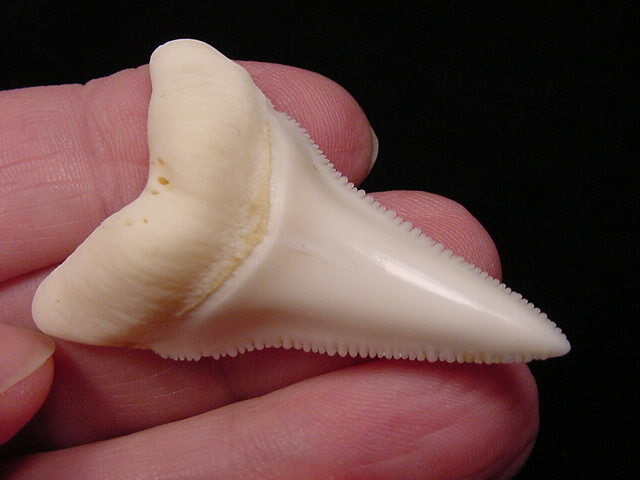 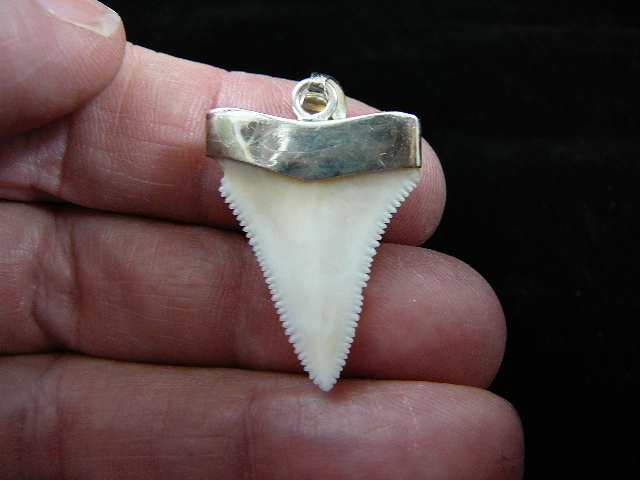 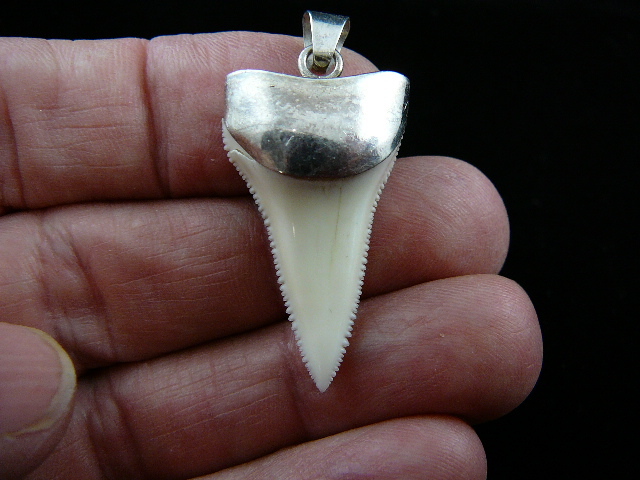 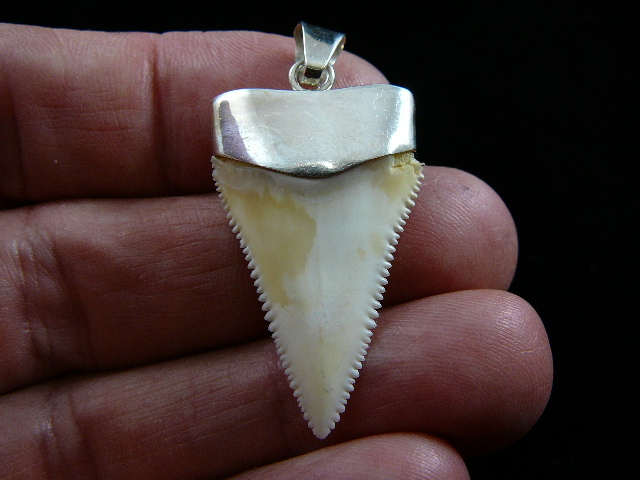 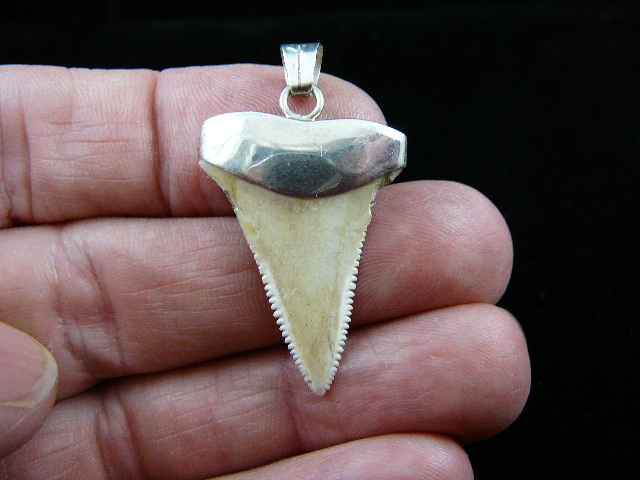 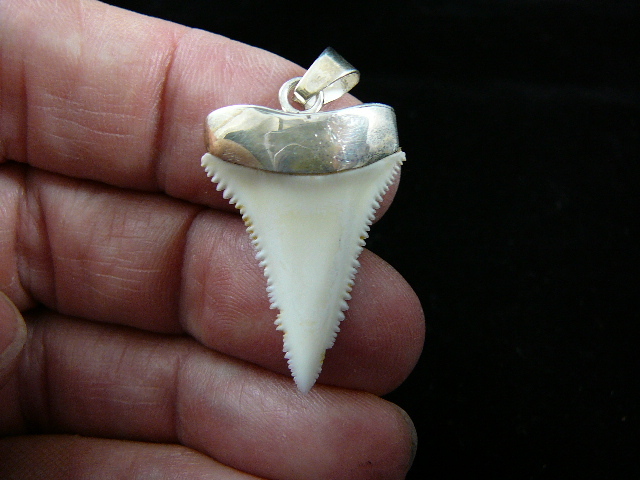 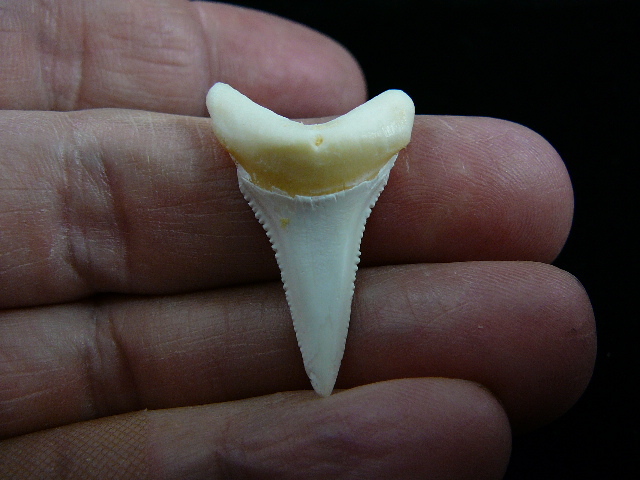 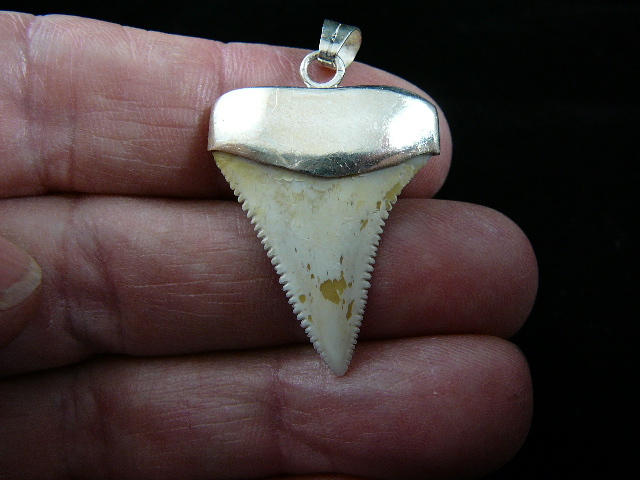 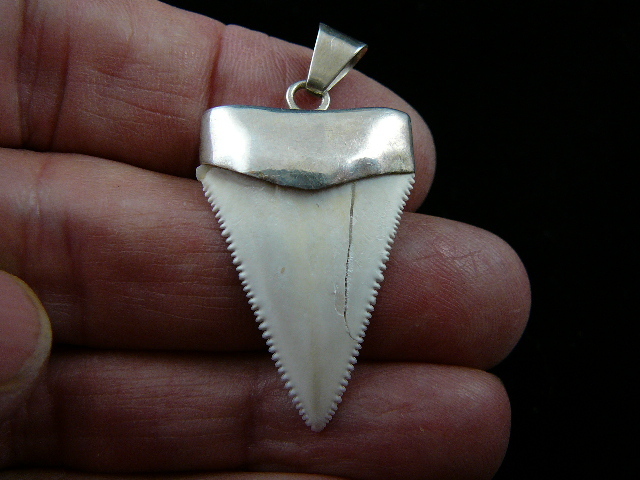 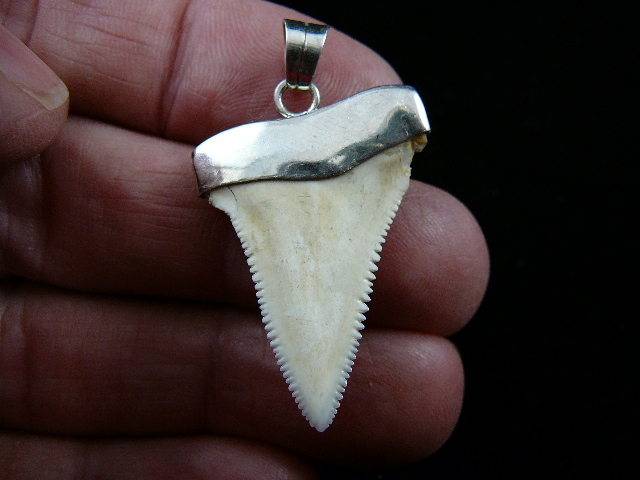 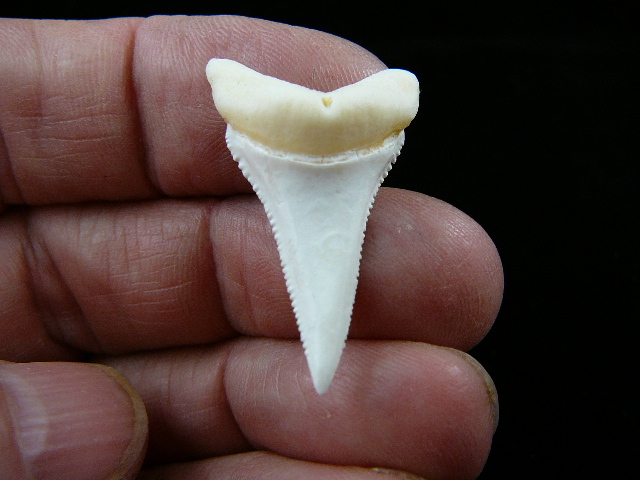 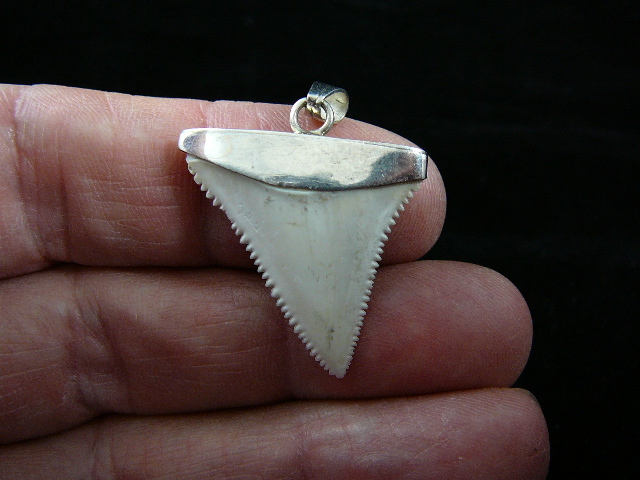 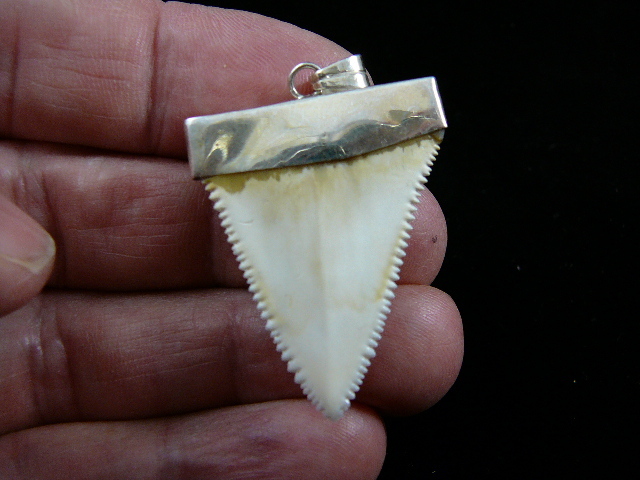 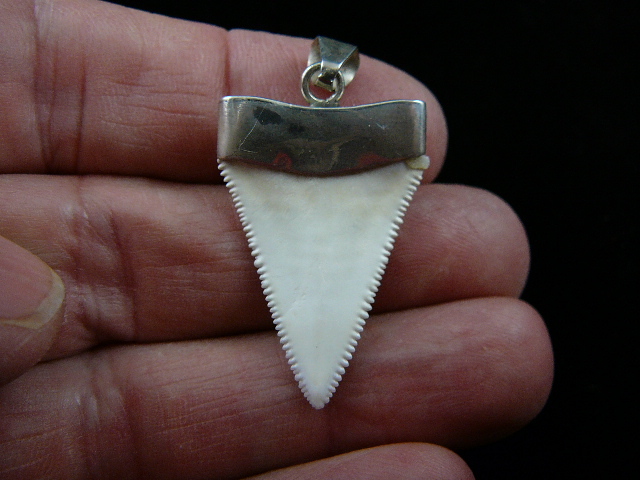 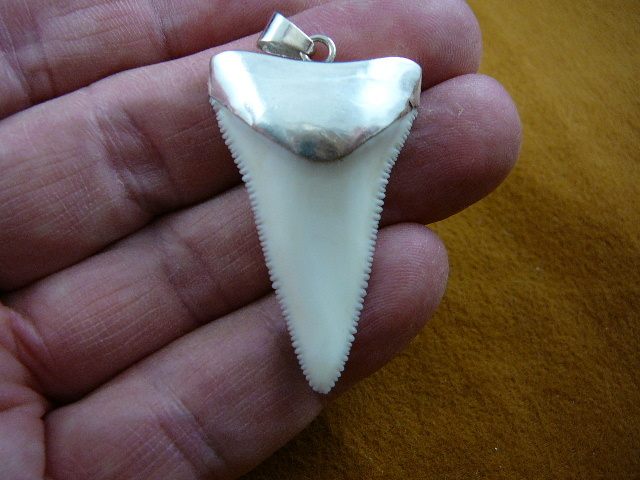 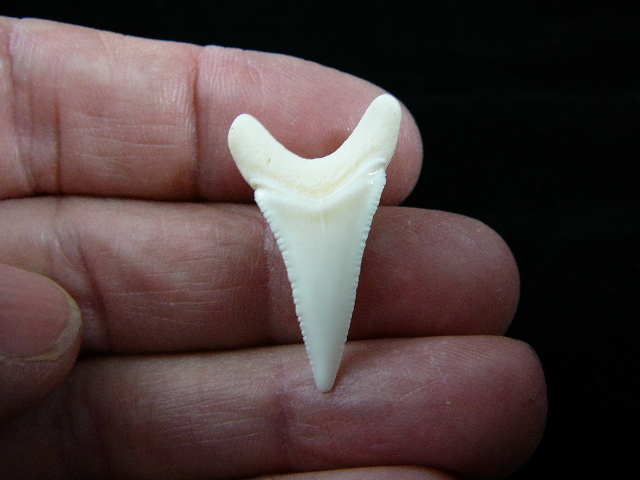 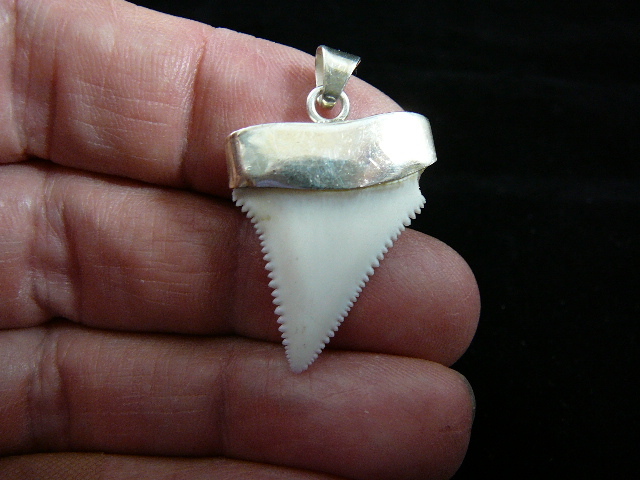 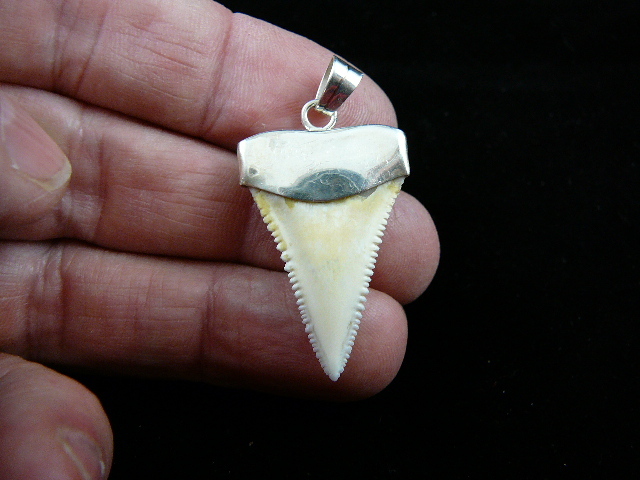 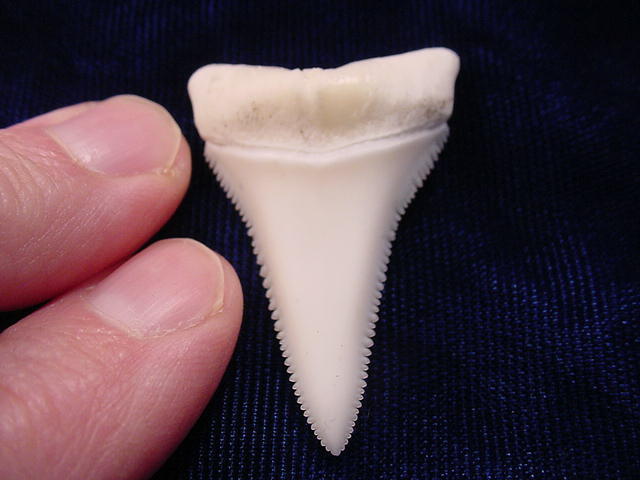 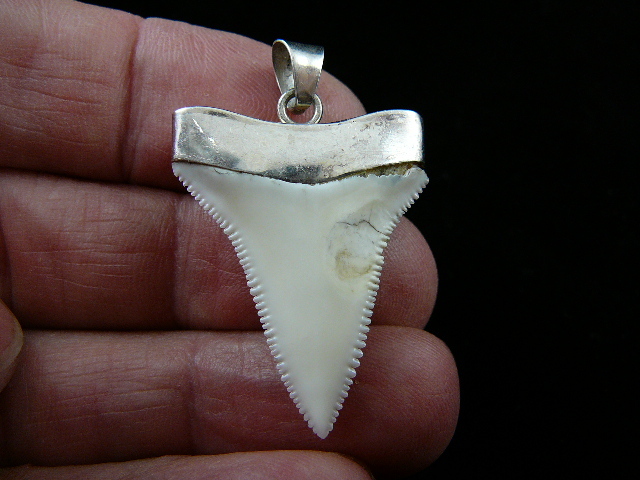 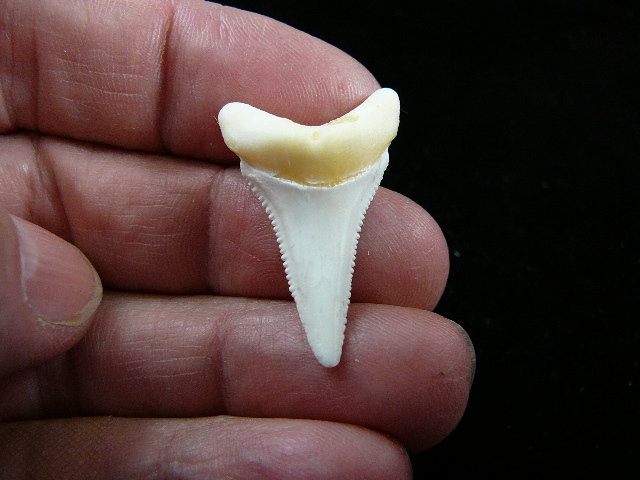 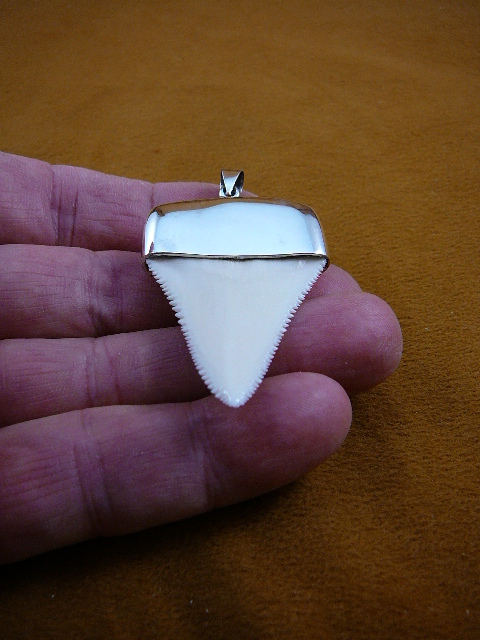 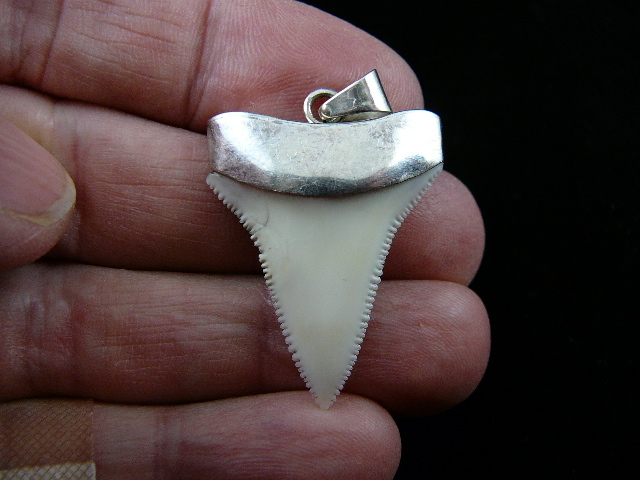 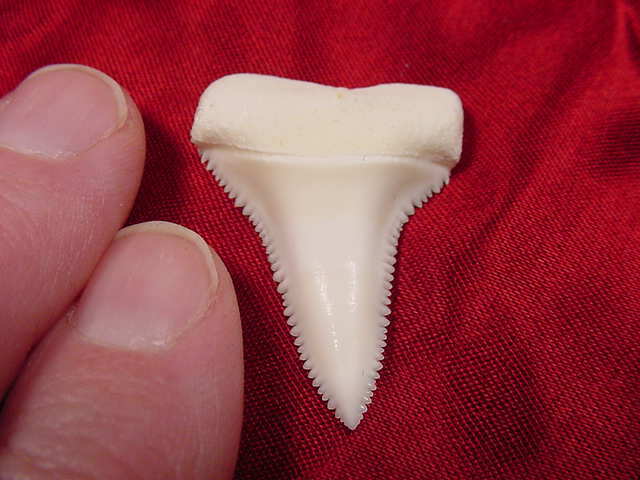 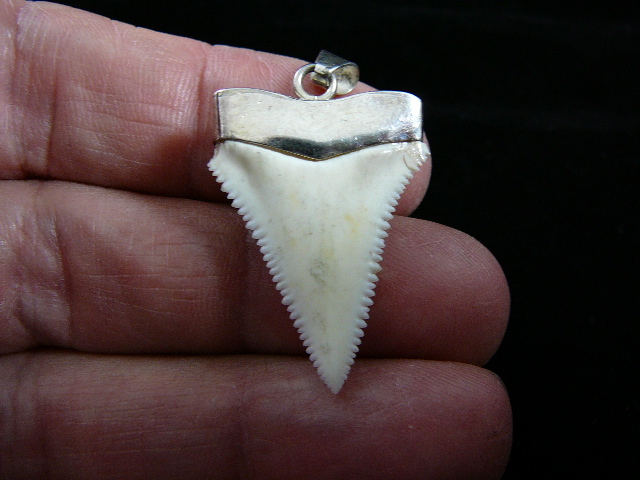 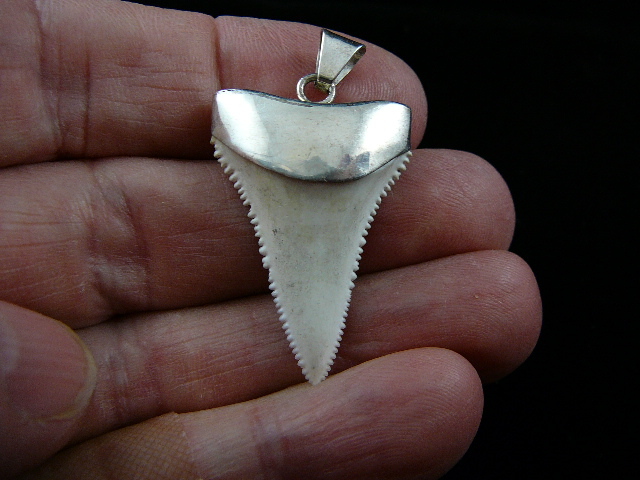 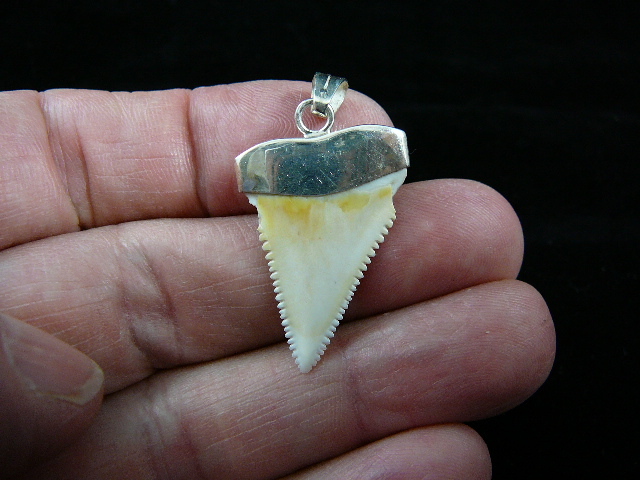 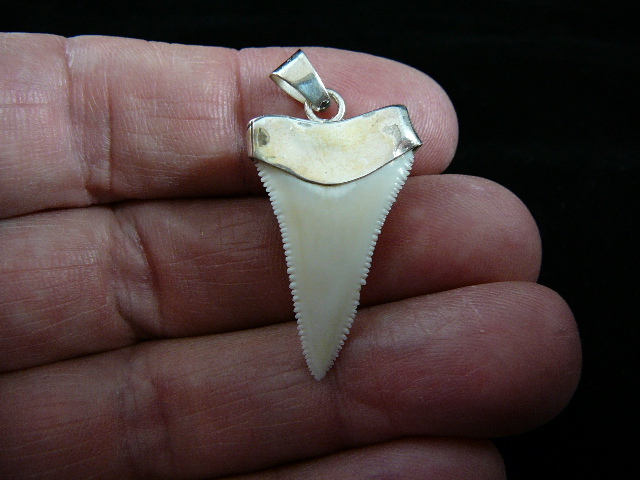 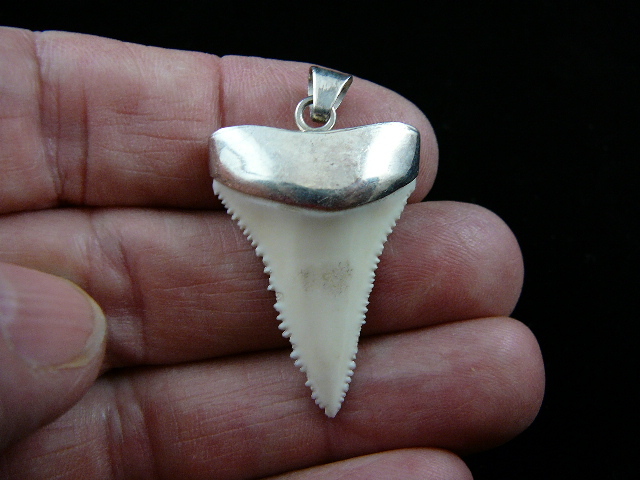 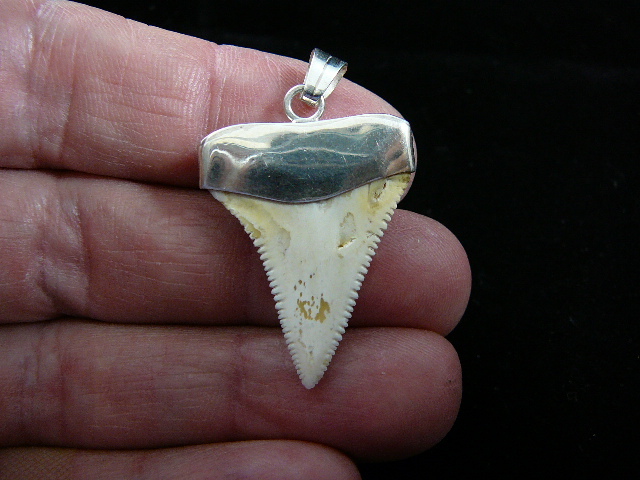 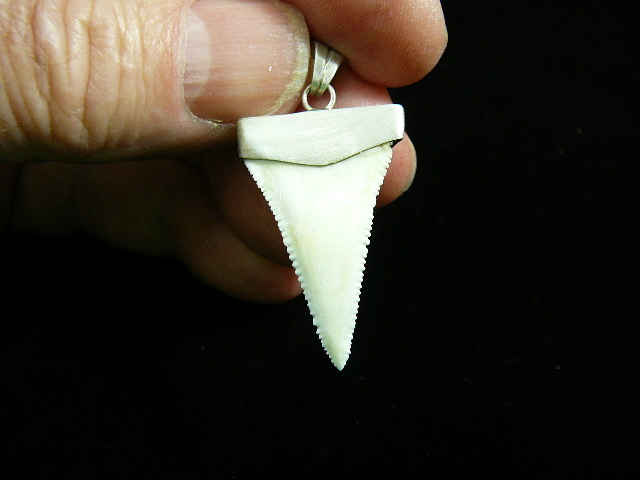 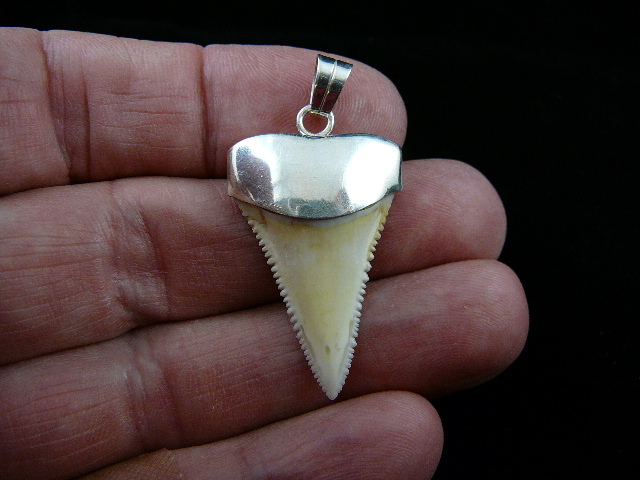 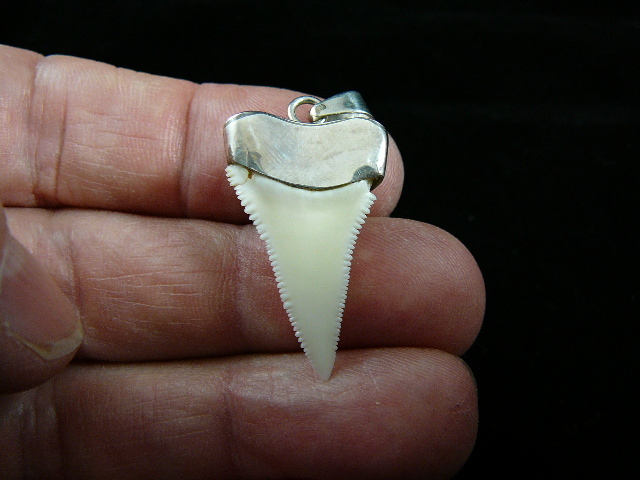 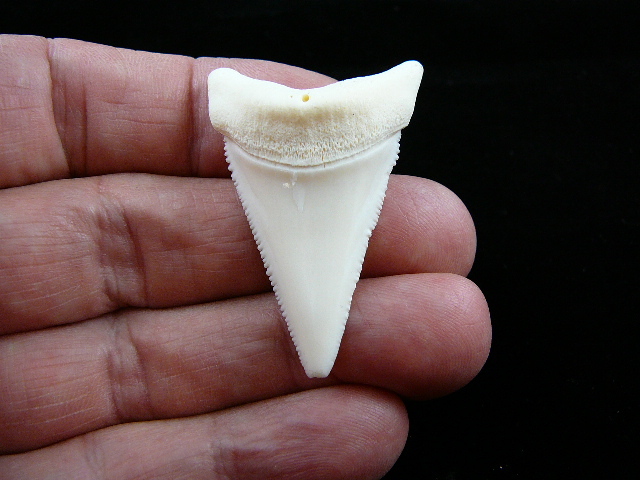 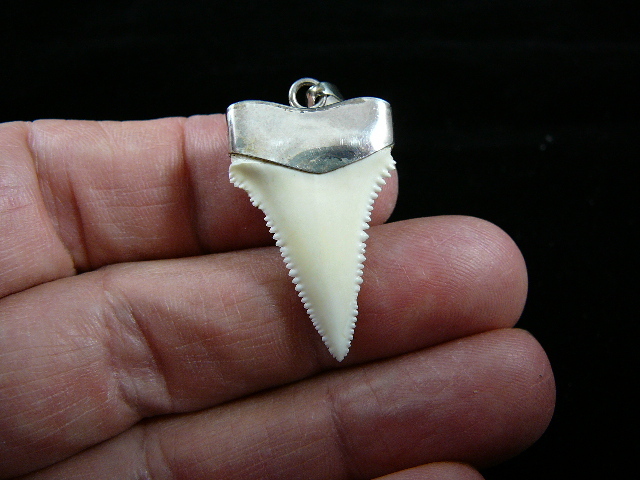 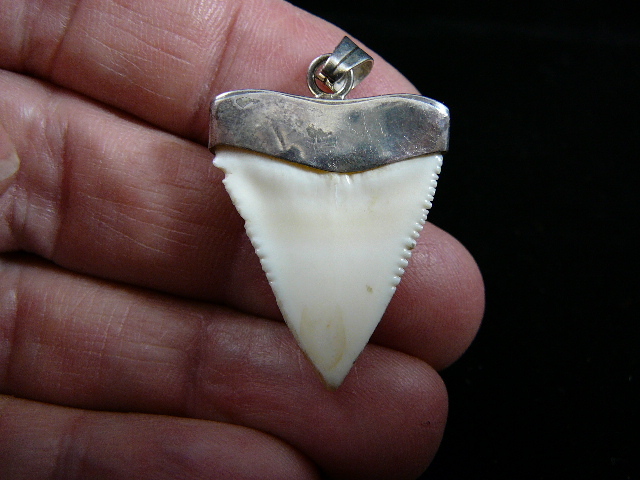 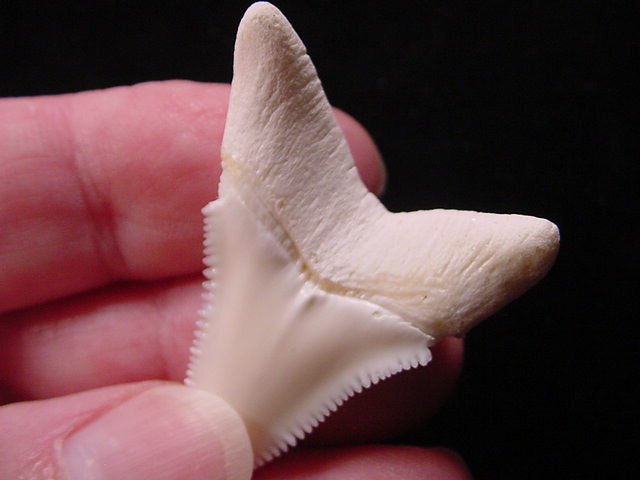 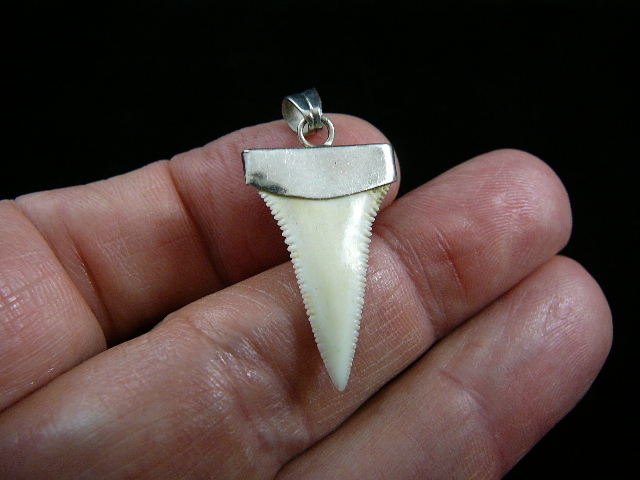 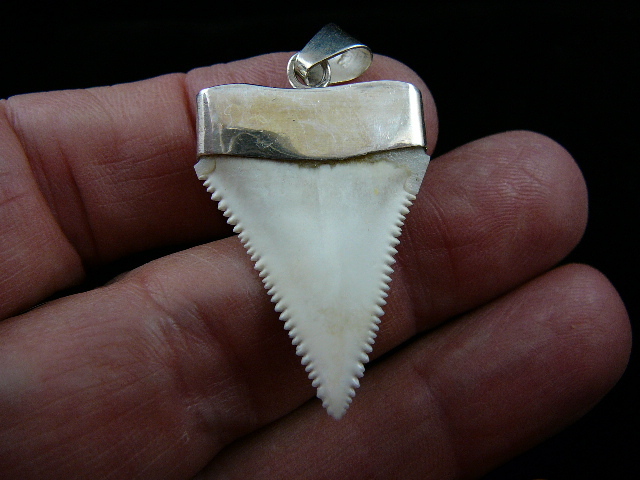 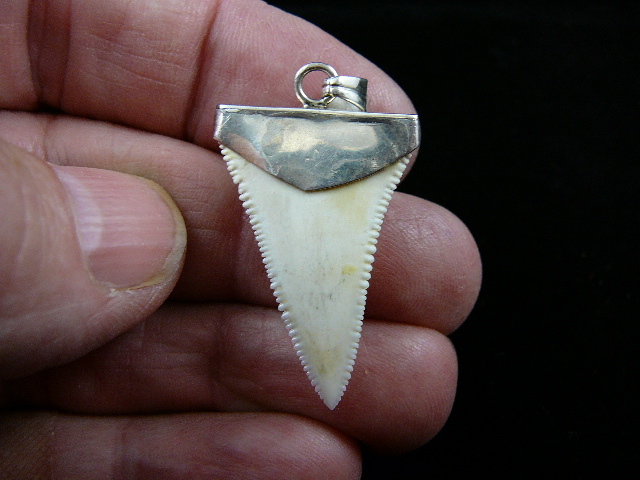 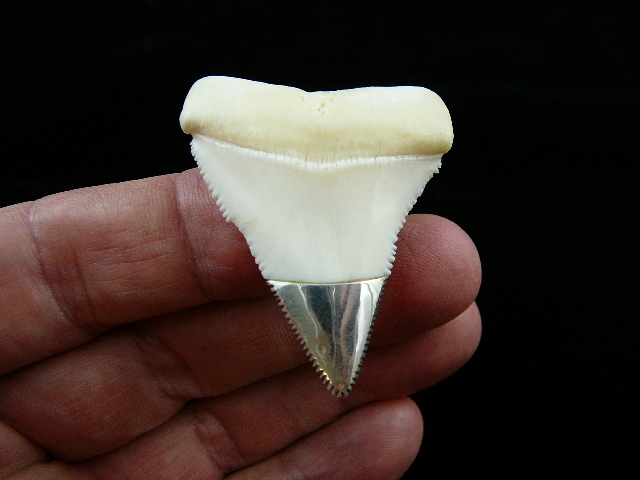 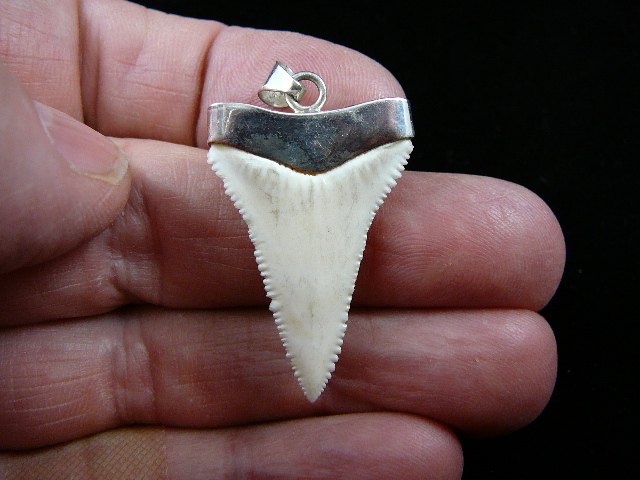 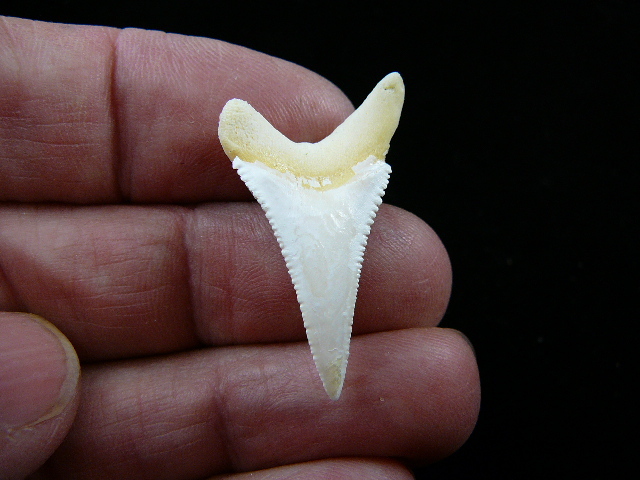 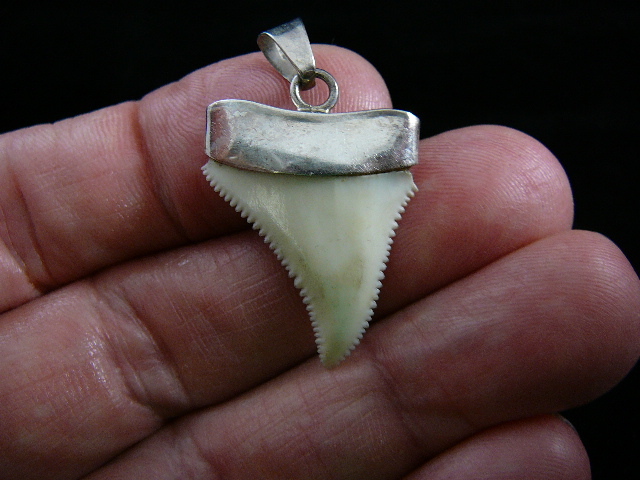 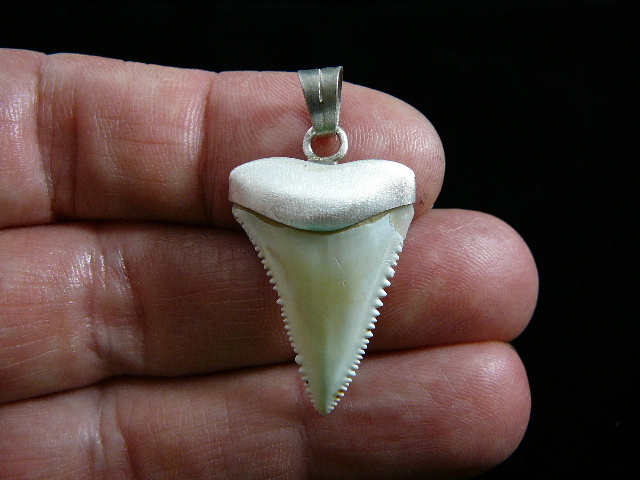 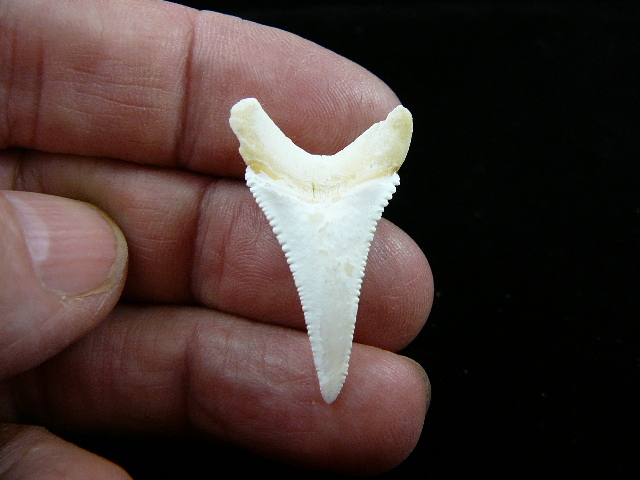 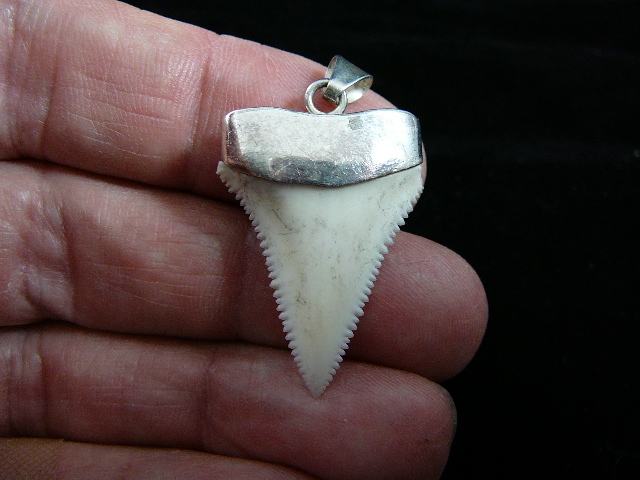 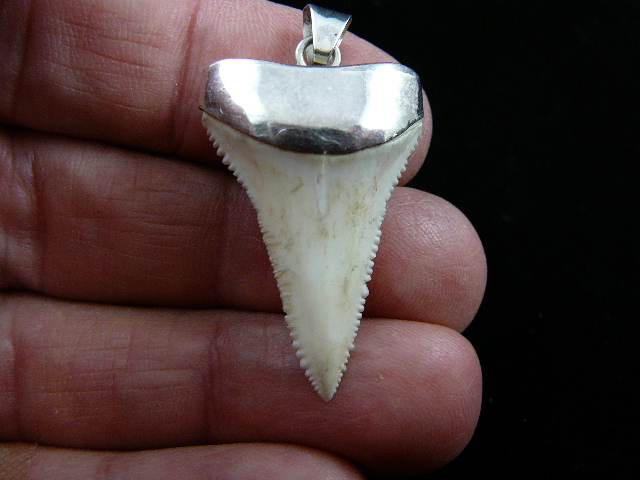 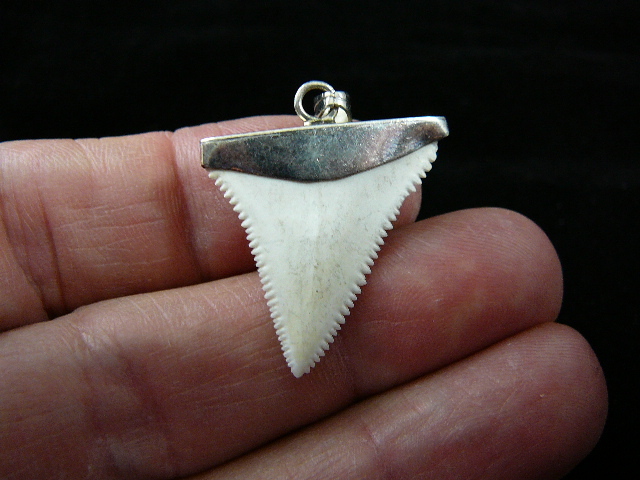 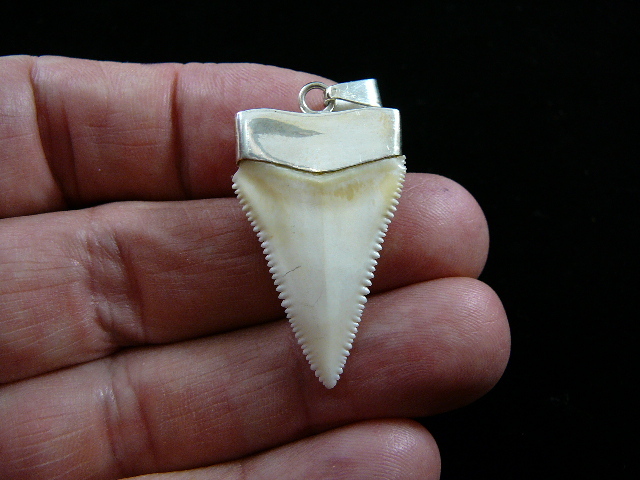 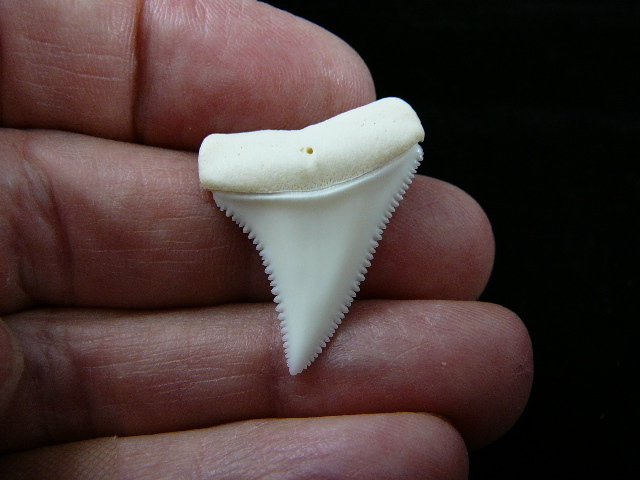 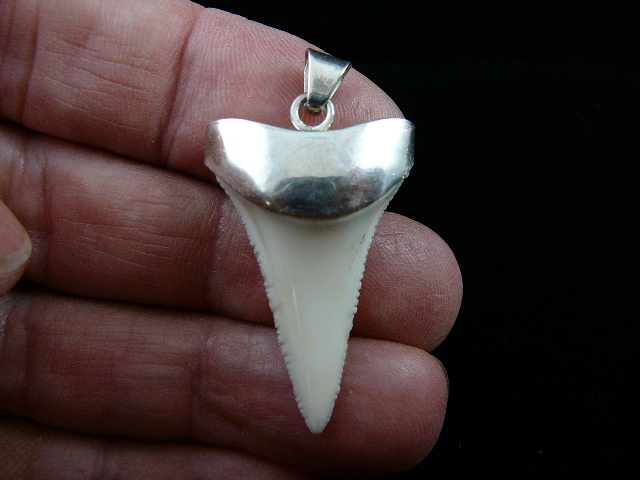 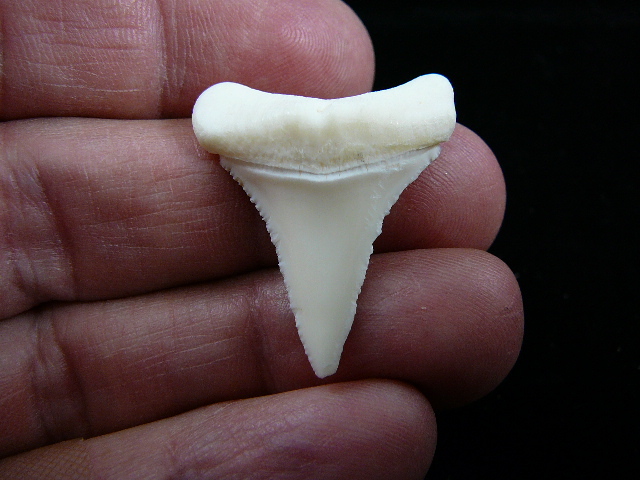 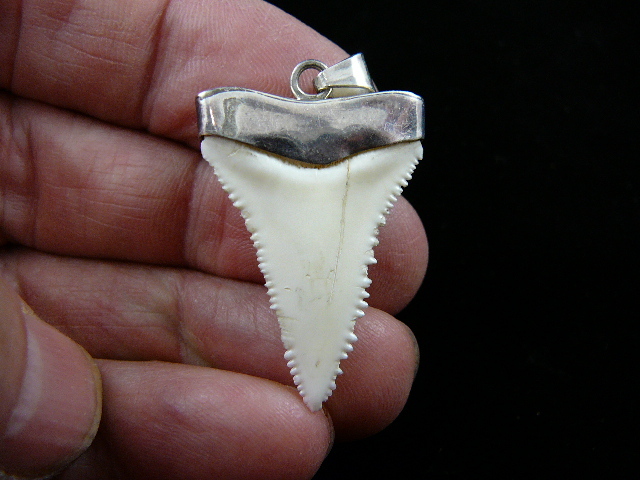 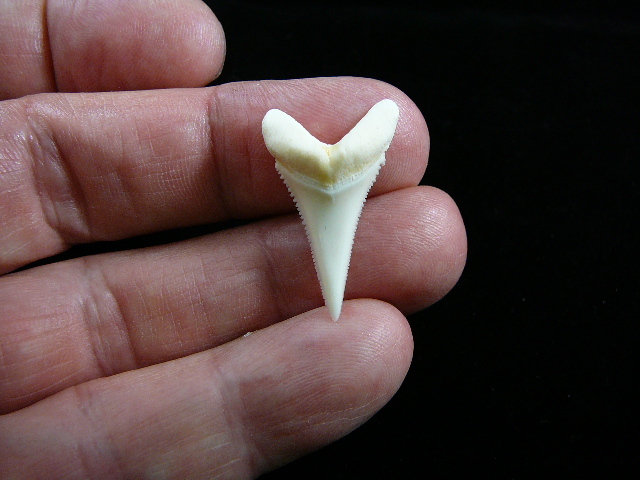 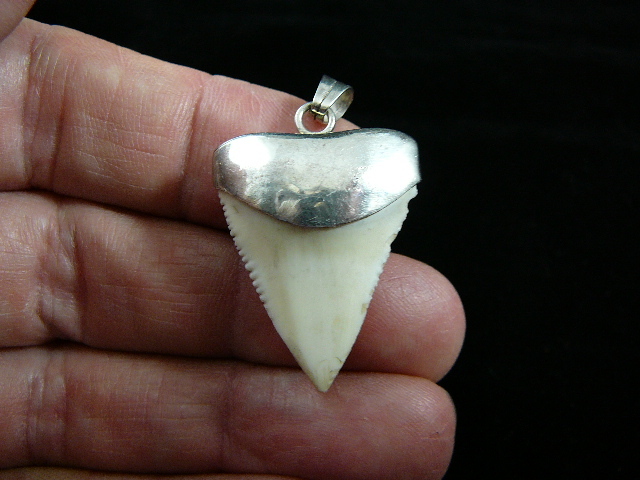 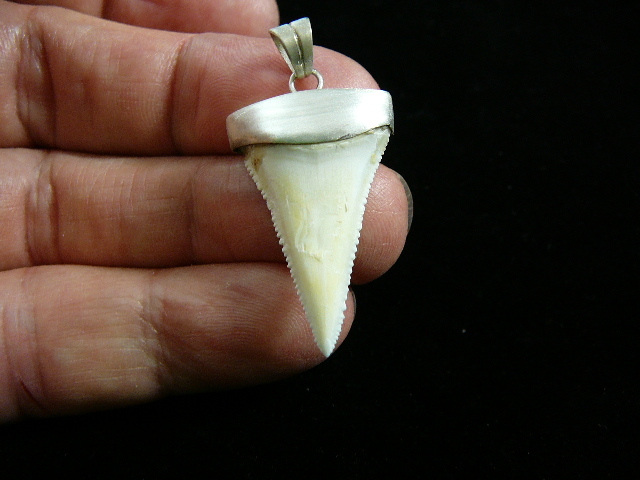 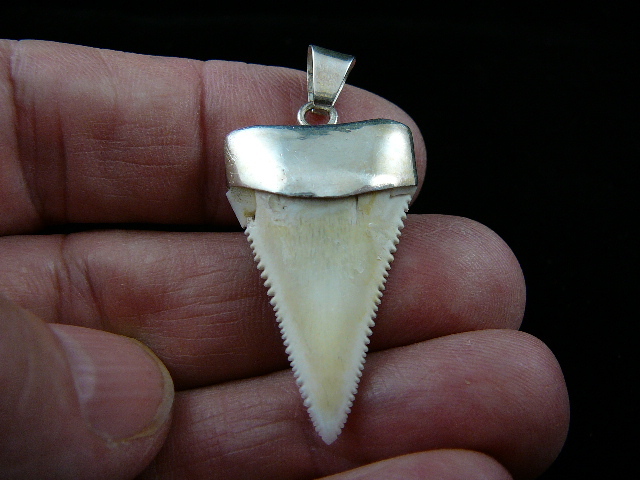 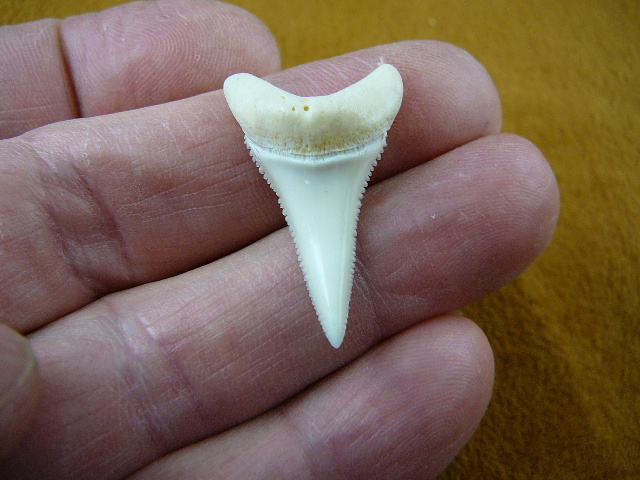 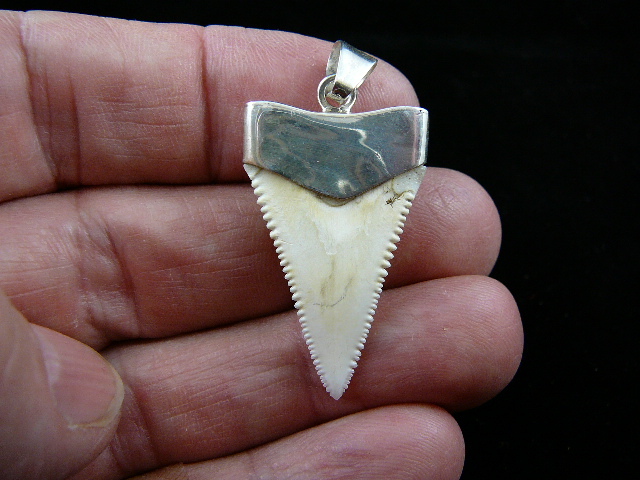 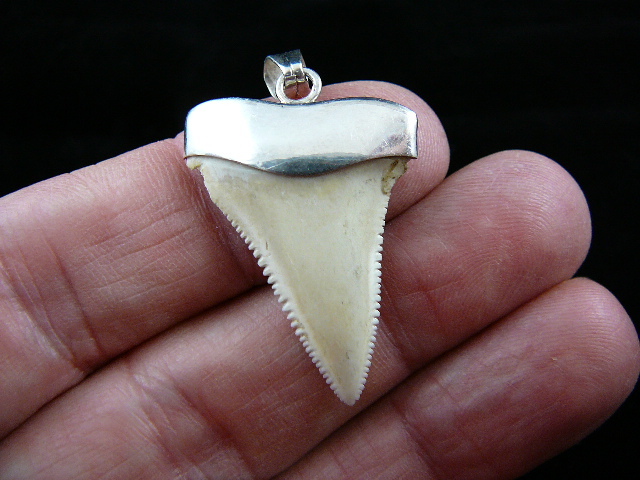 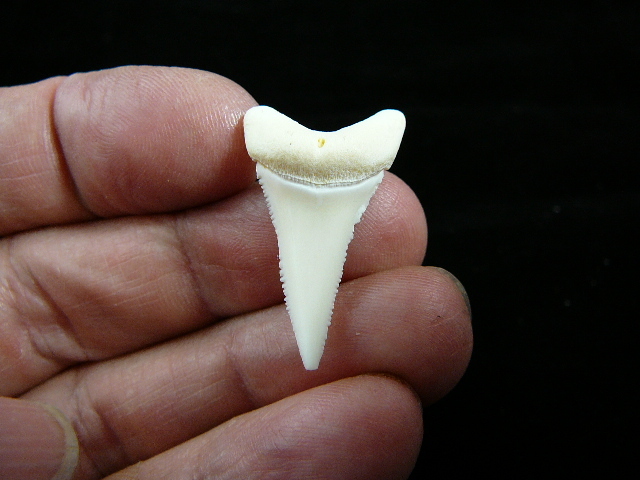 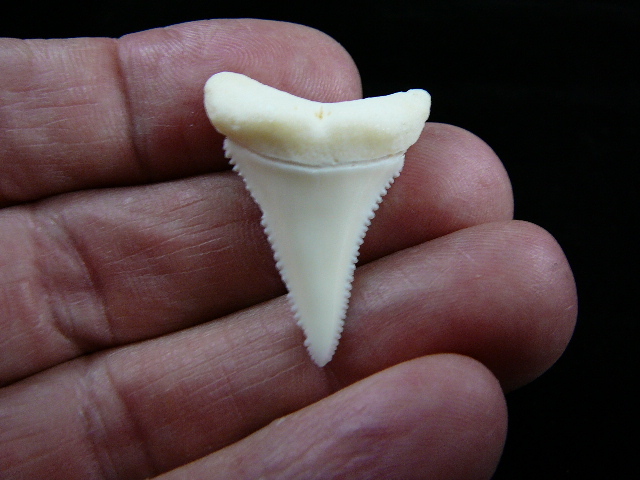 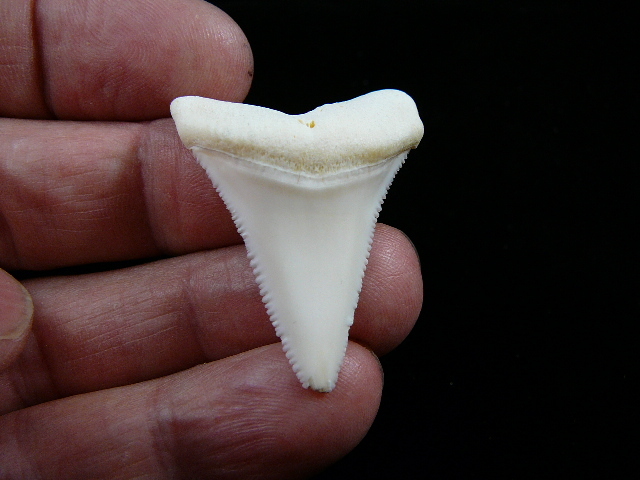 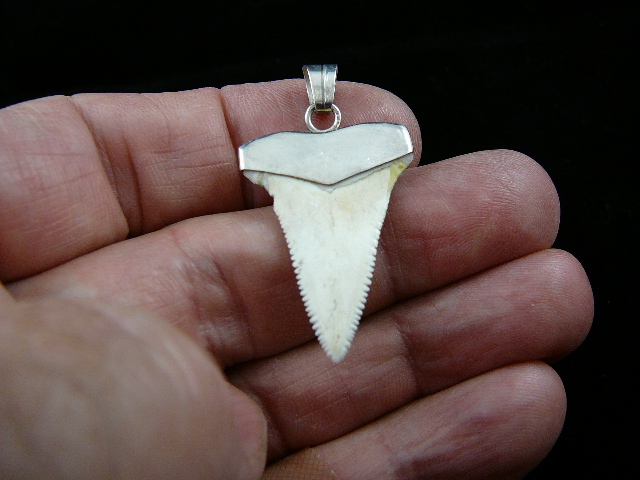 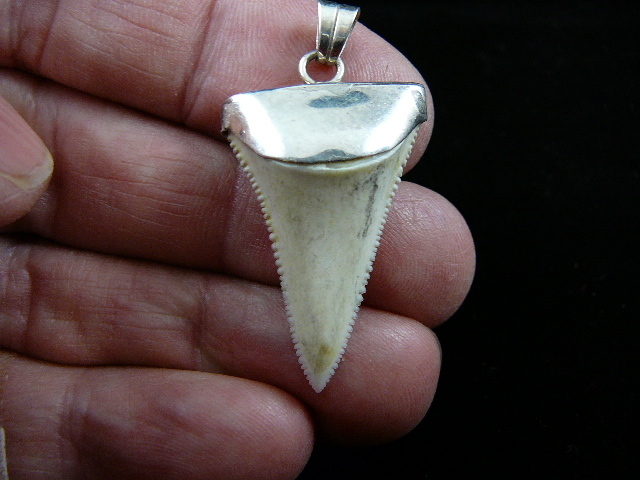 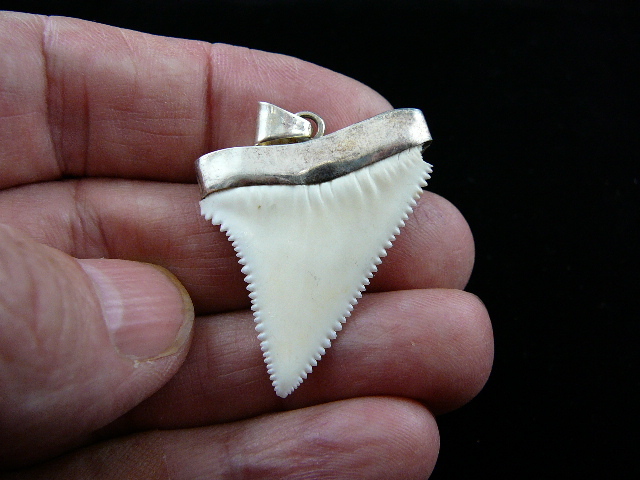 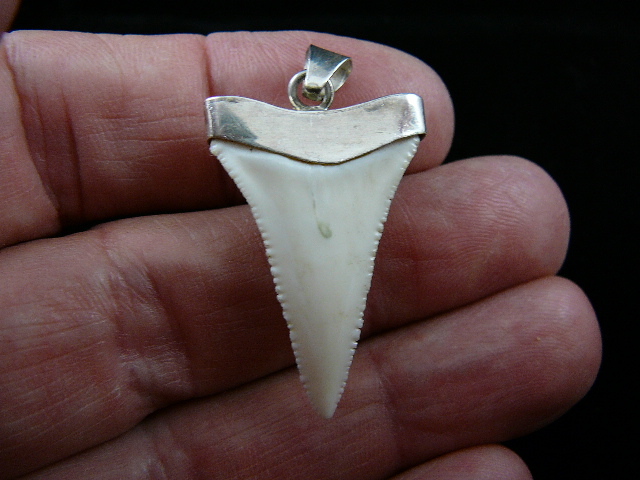 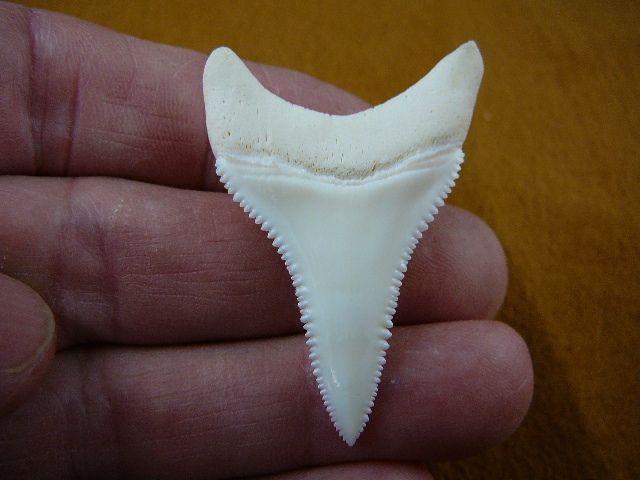 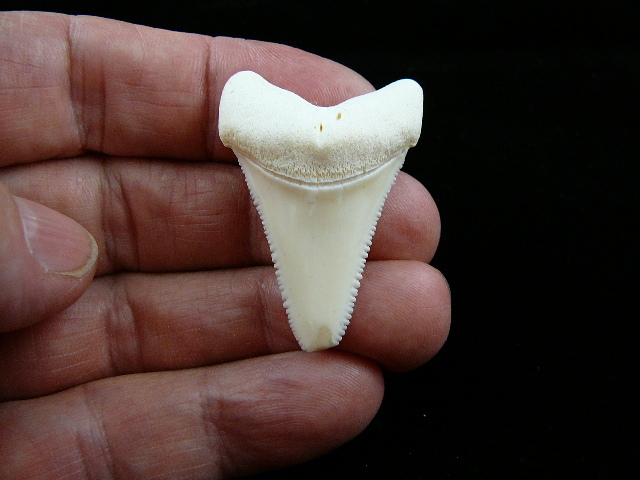 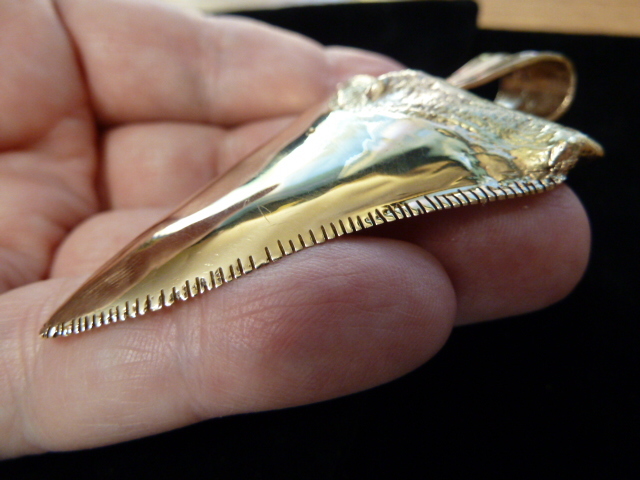 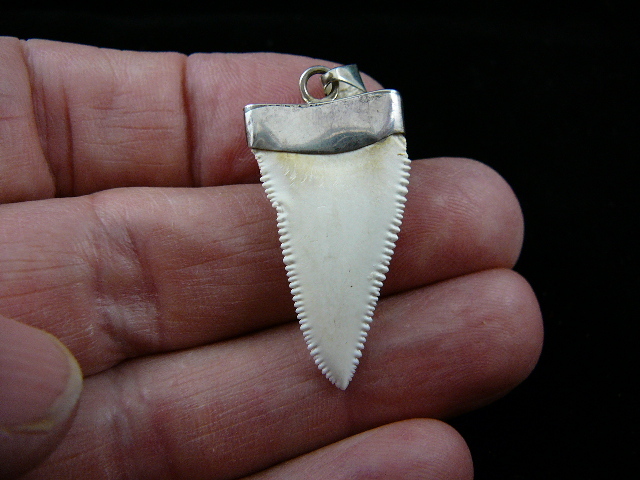 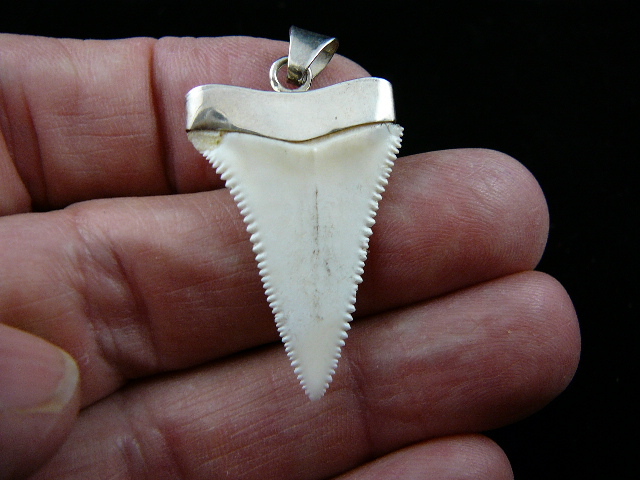 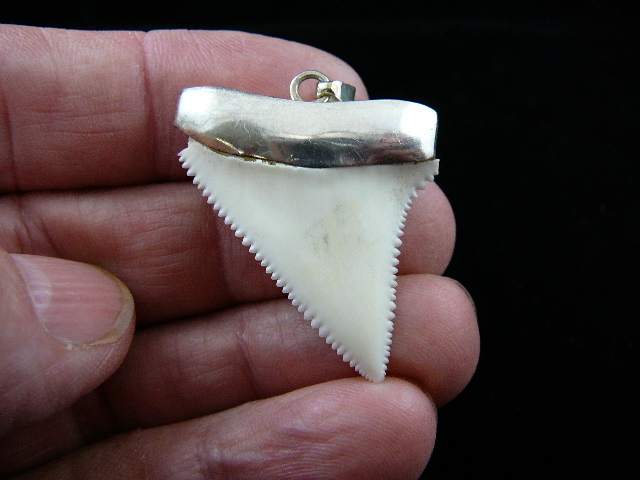 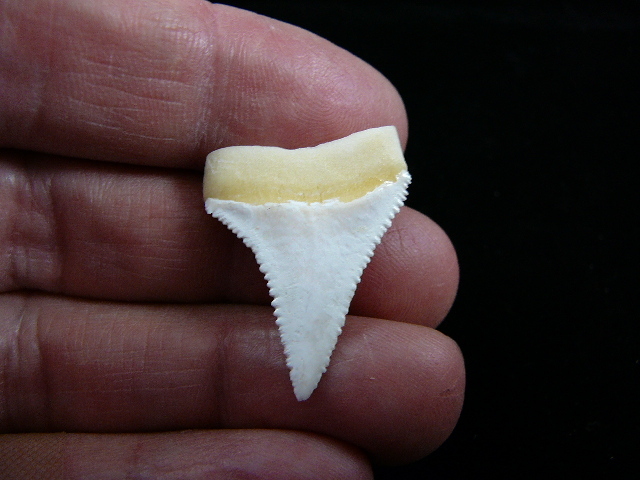 Your shark tooth should last many years and bring much enjoyment to you. 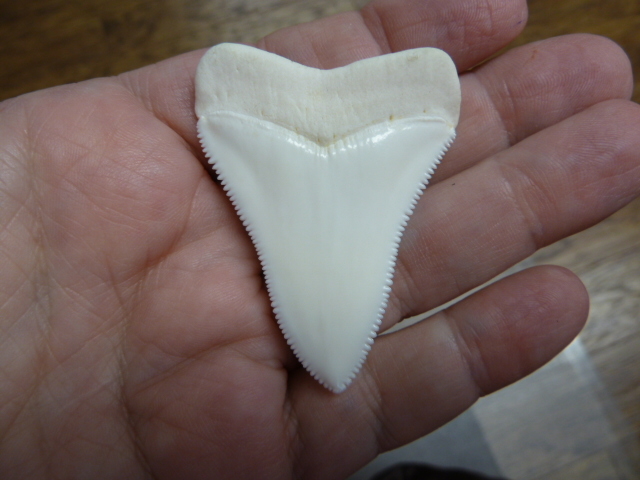 We're calling these "The MAGNIFICENT 7"
Sizes are: 2-5/8", 2-11/16", and YES, a 2-3/4" (upper center of Glenn's hand). 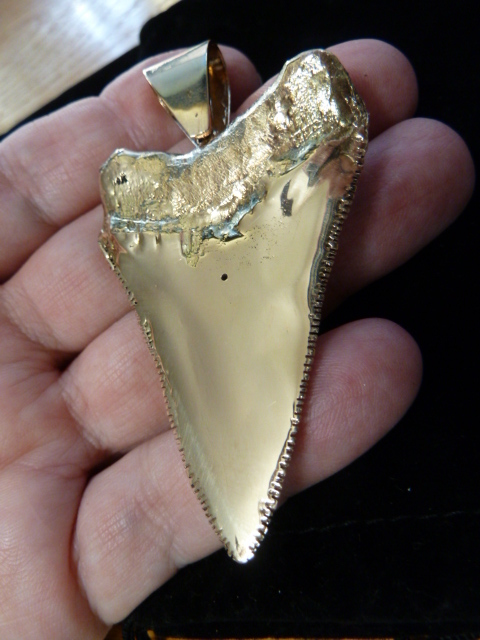 Not for the faint of heart. 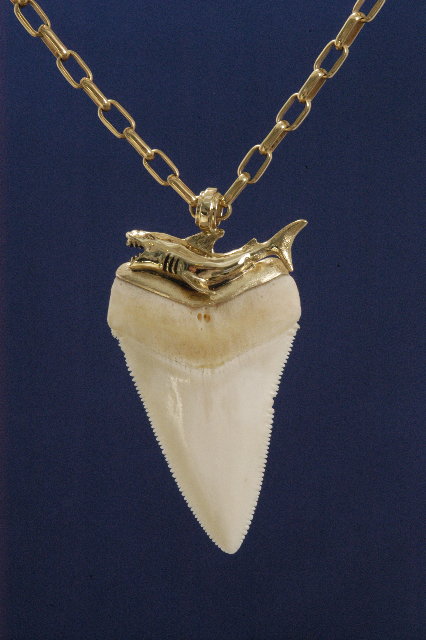 This collection came to us through the settlement of an estate. 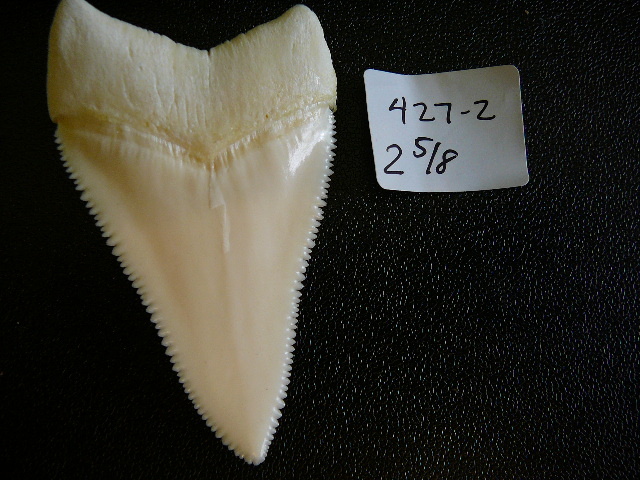 Over the years, the collection has passed through several different hands, so the whereabouts of the particulars of the great white shark these came from are not known. 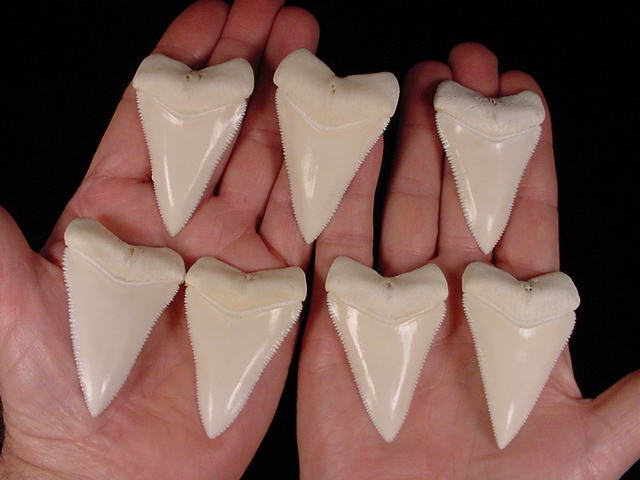 If this information were available, these 7 teeth would all be classified as world record holders. 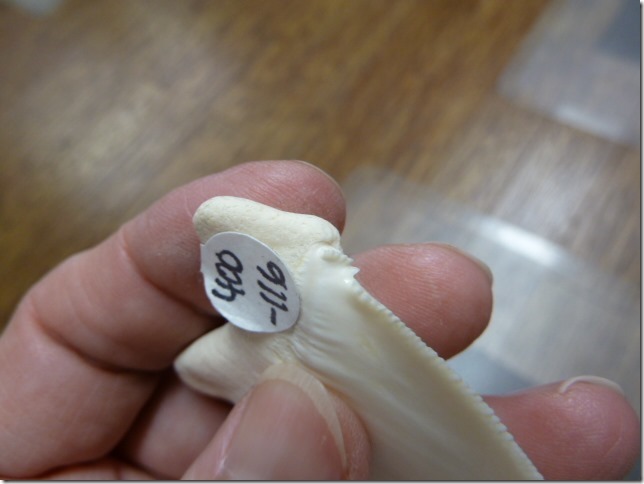 But because we don't have the provenance on these, we are unable to register them as such. 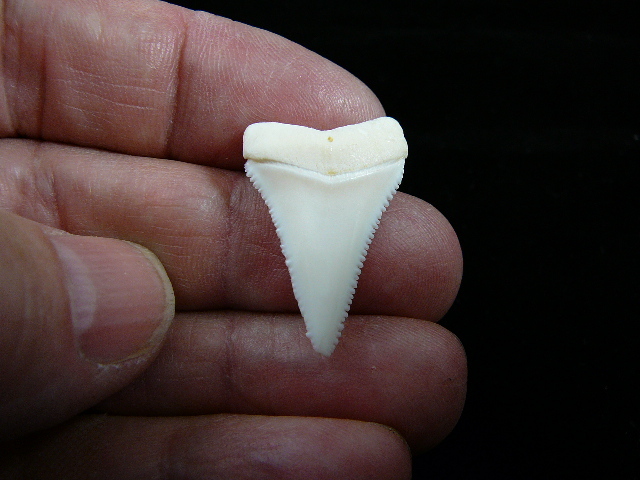 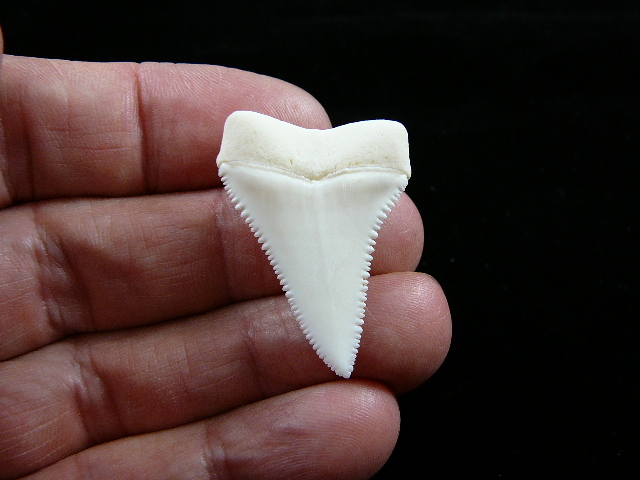 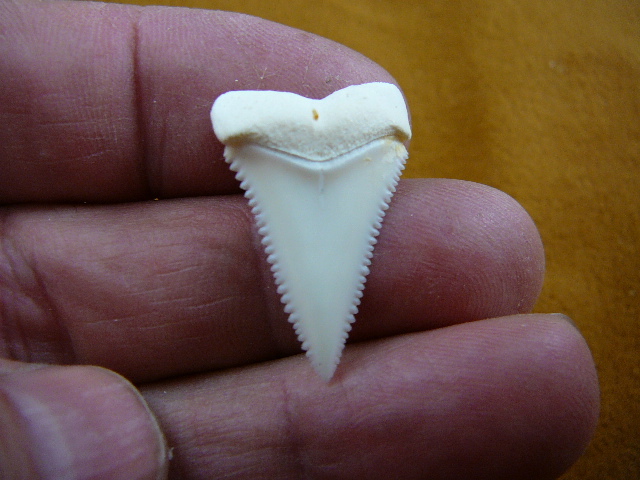 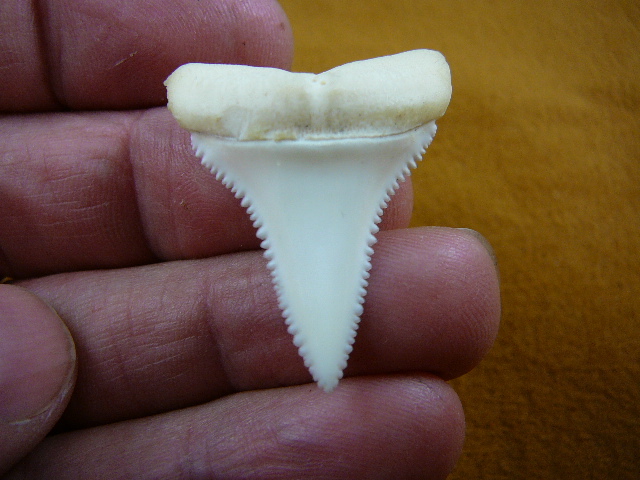 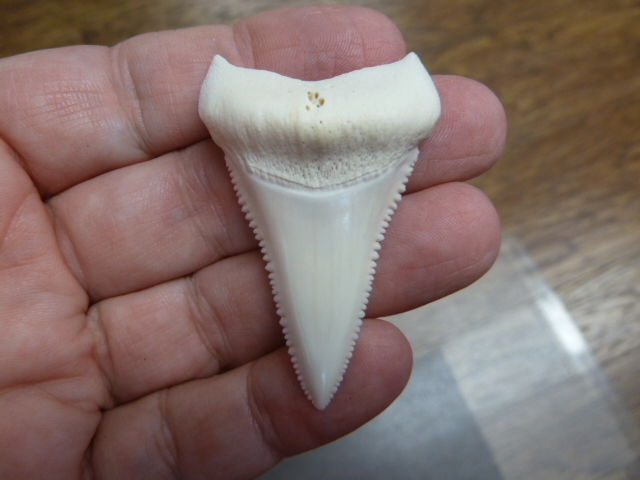 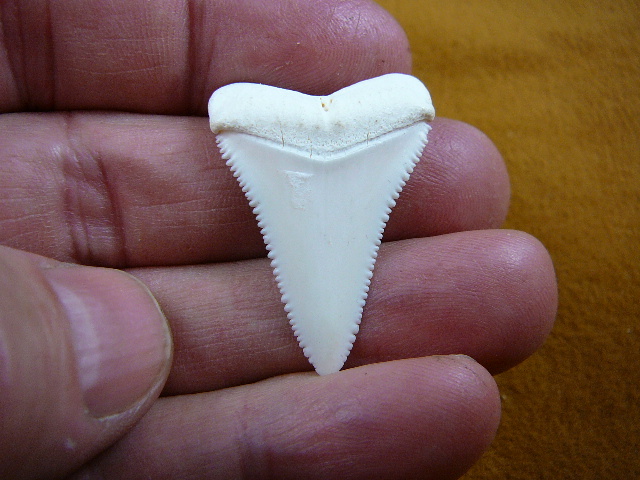 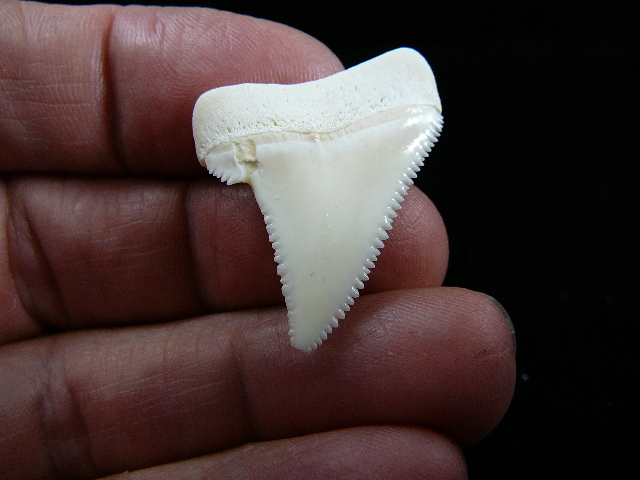 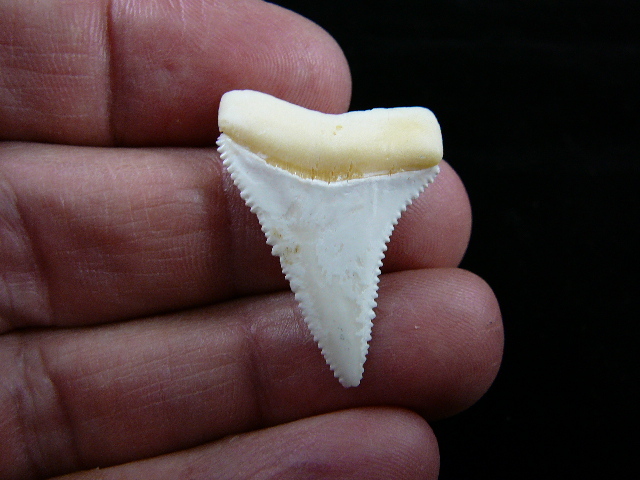 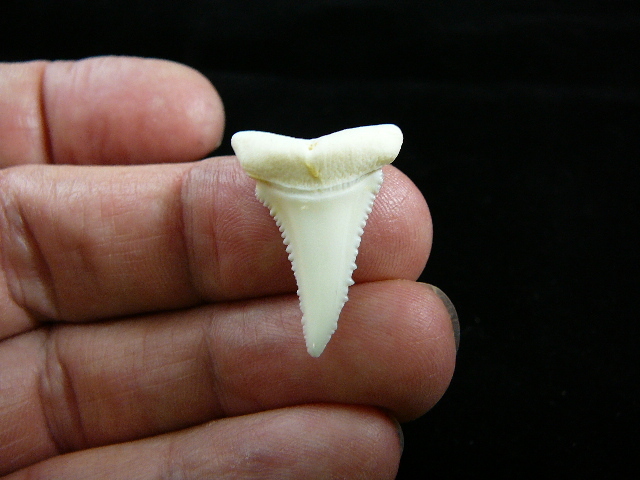 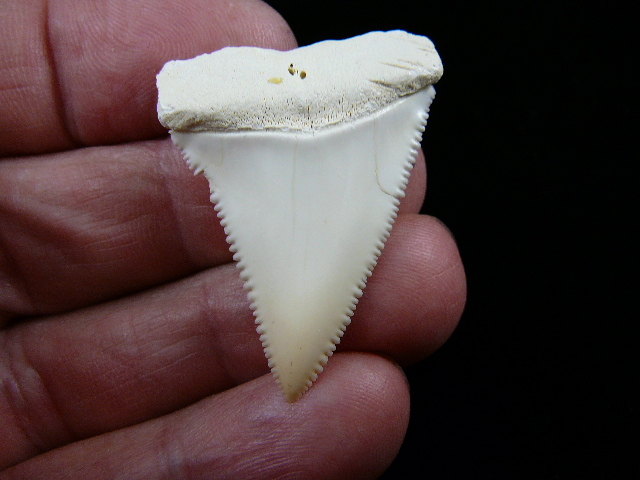 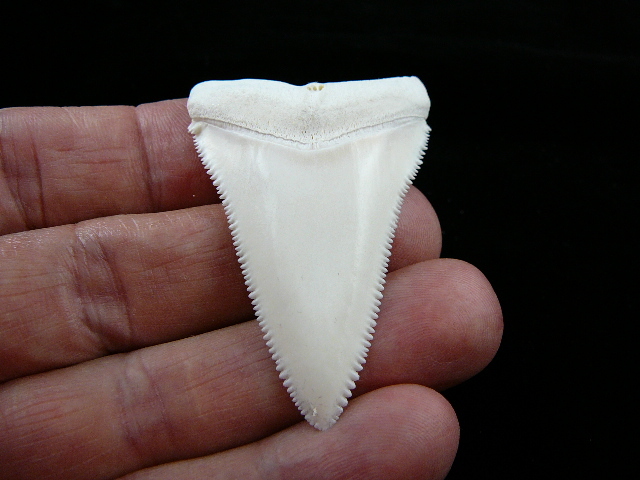 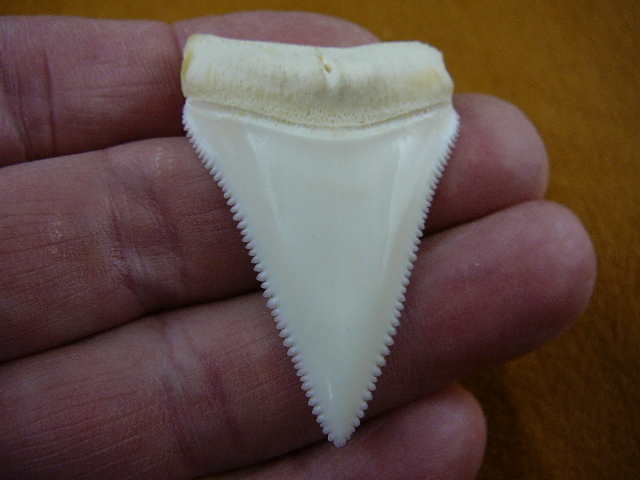 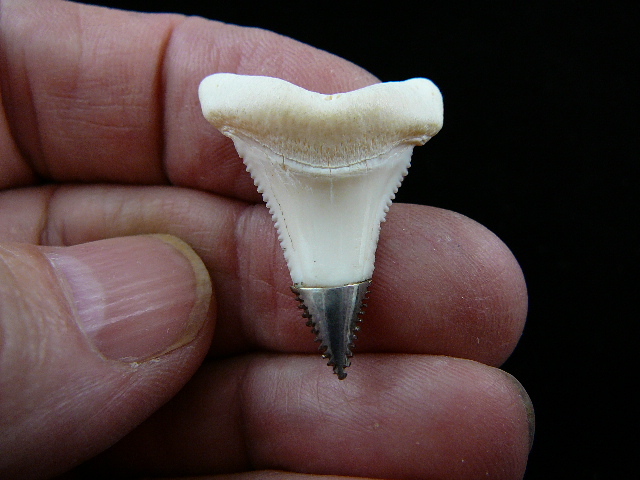 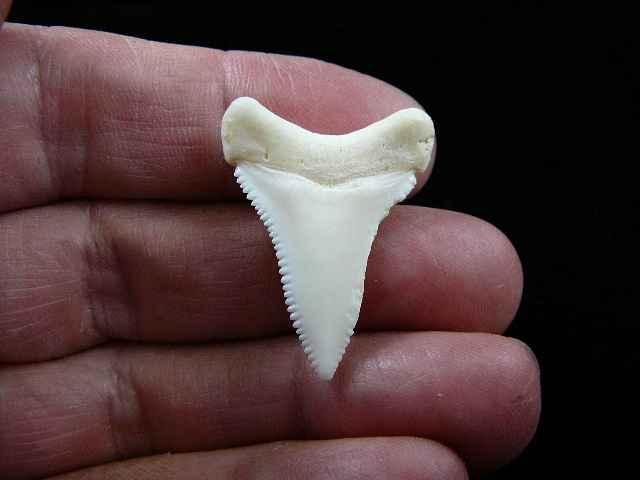 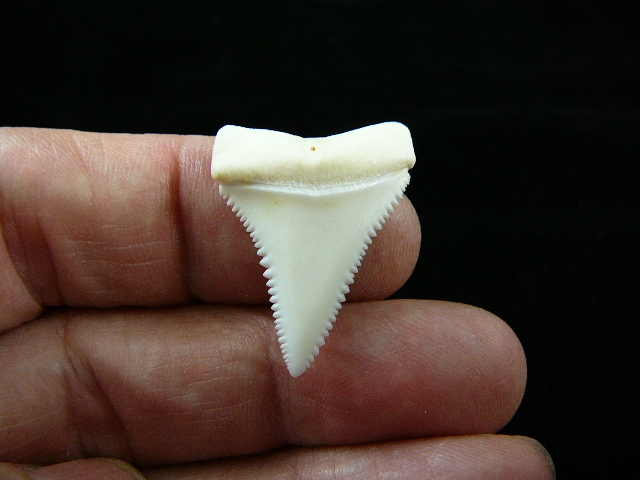 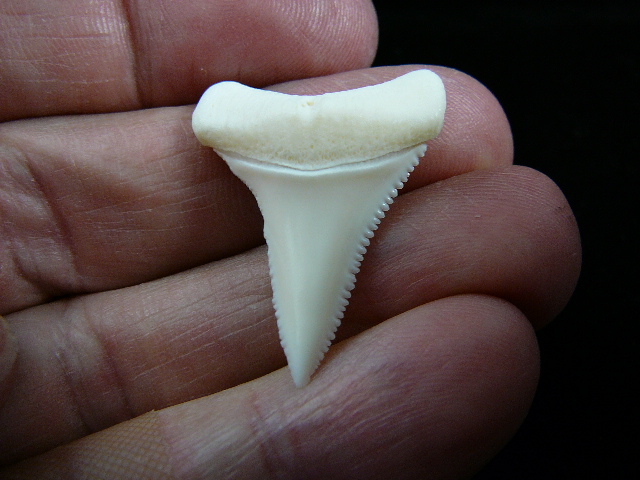 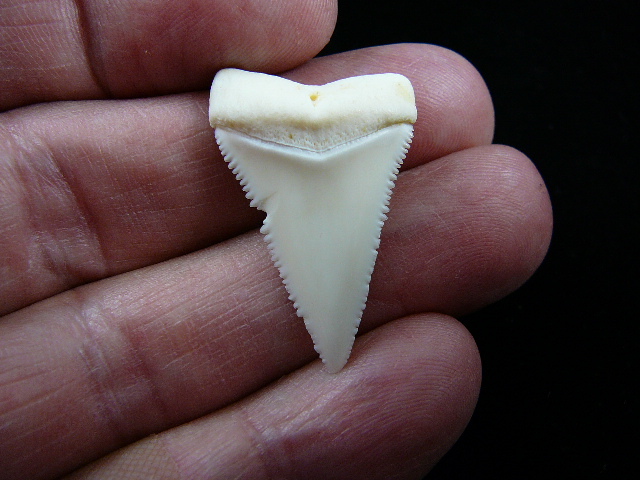 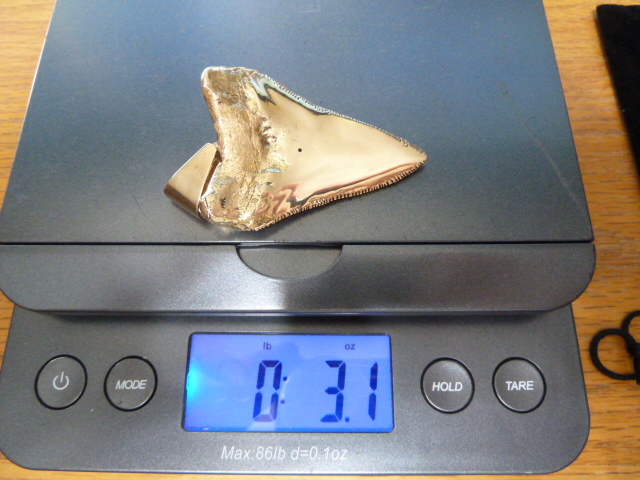 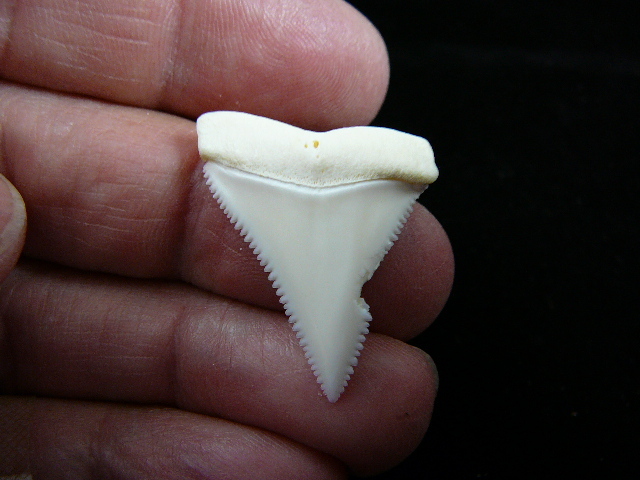 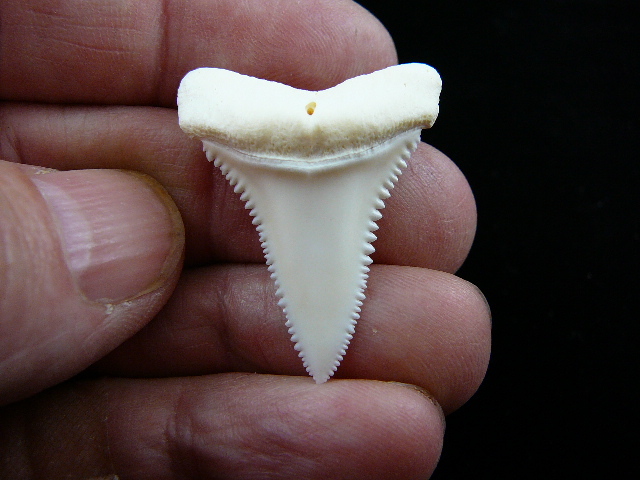 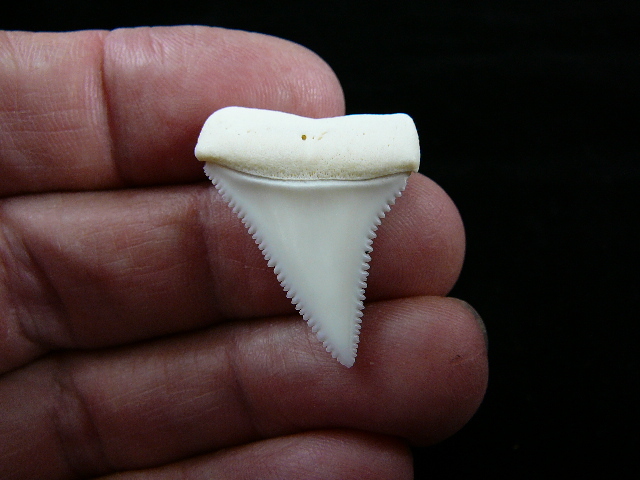 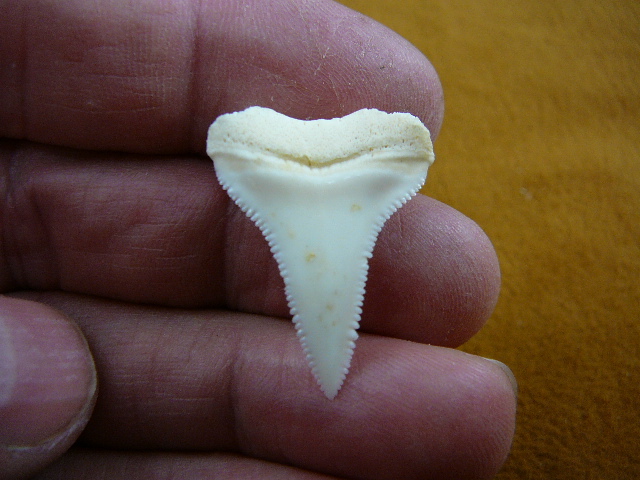 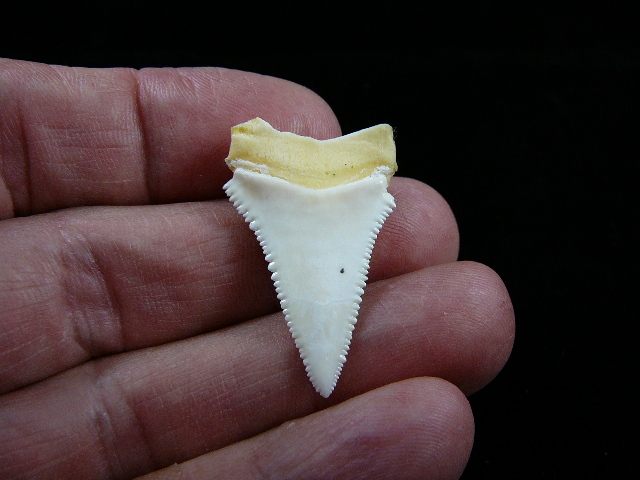 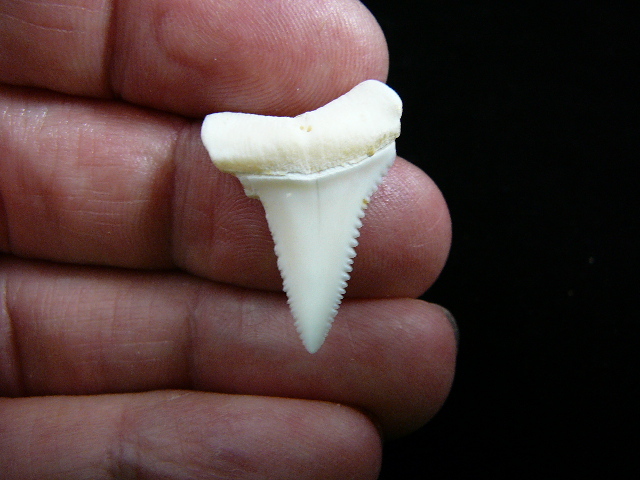 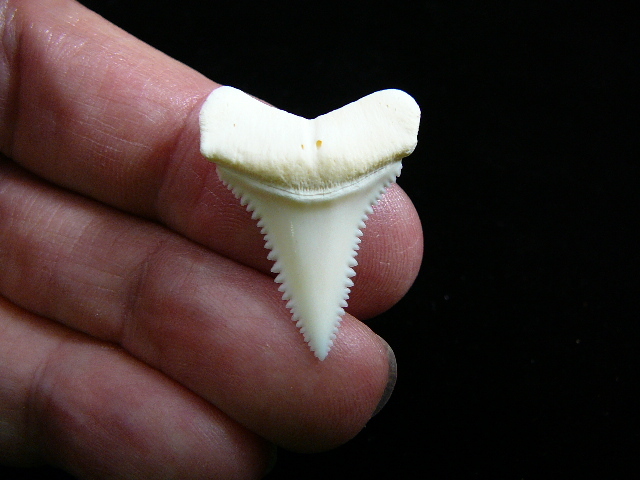 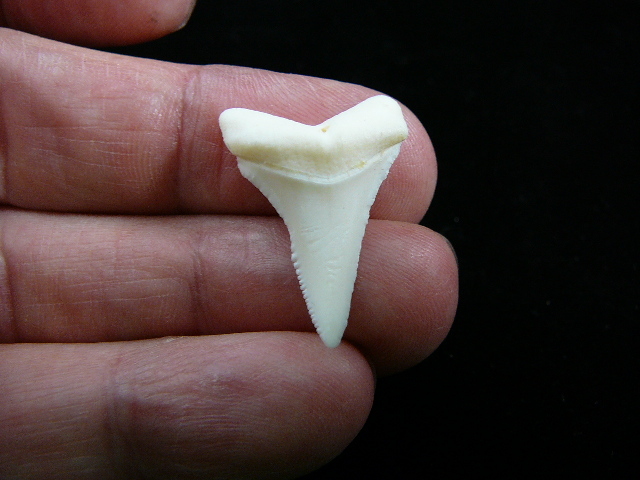 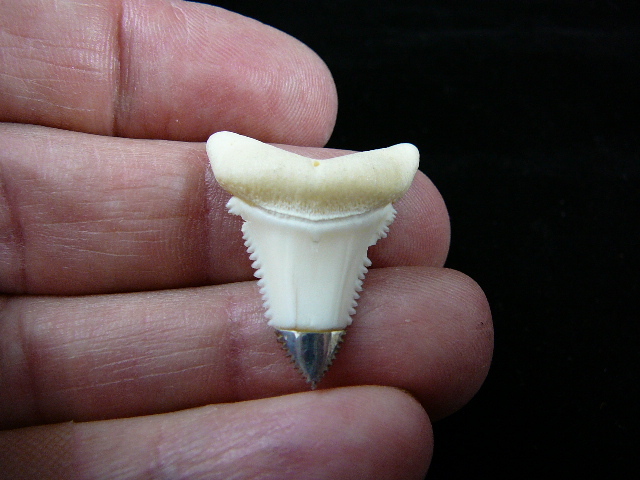 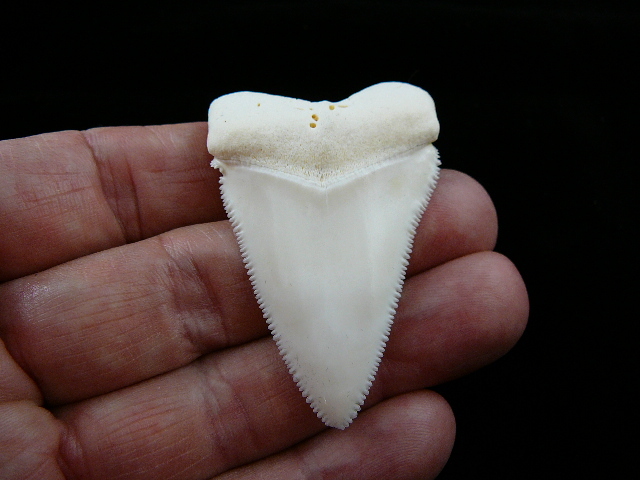 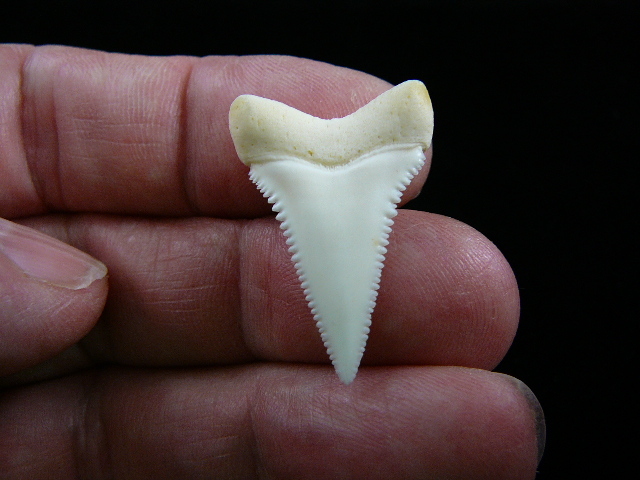 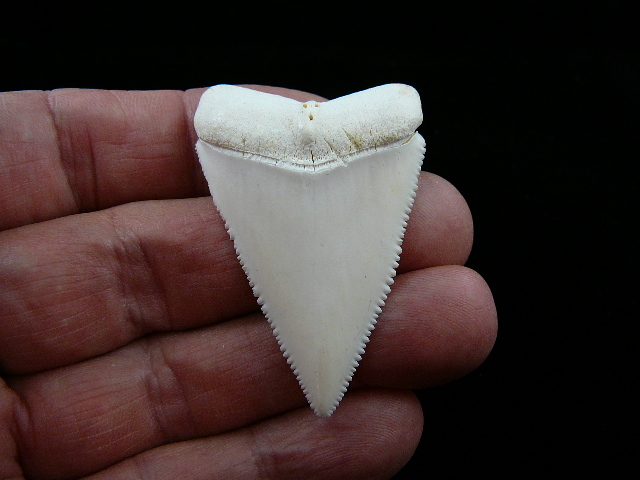 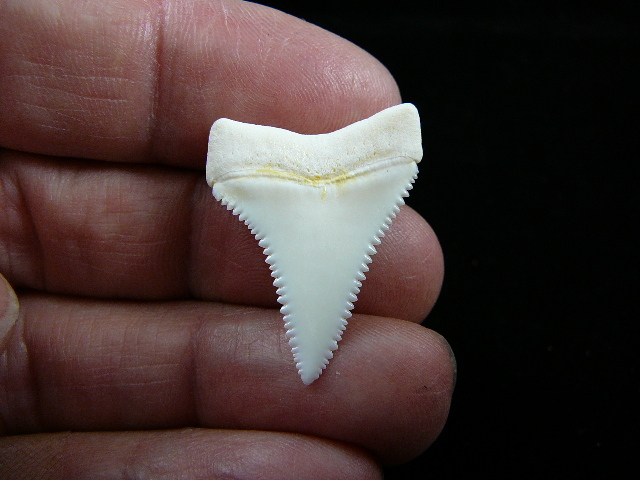 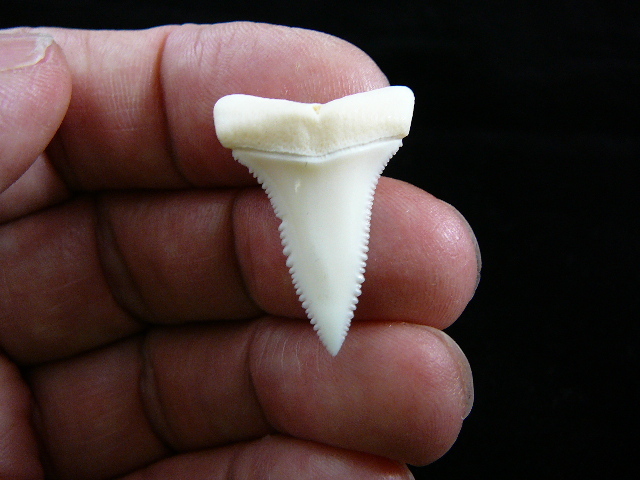 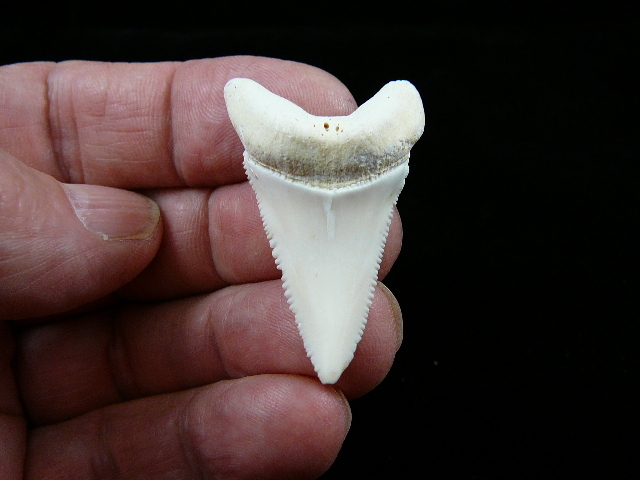 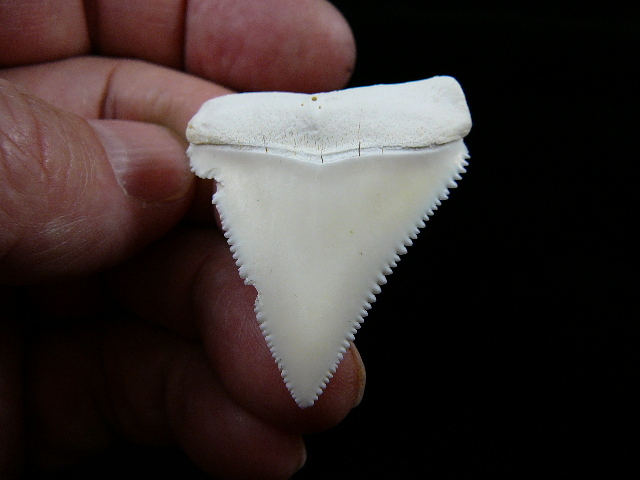 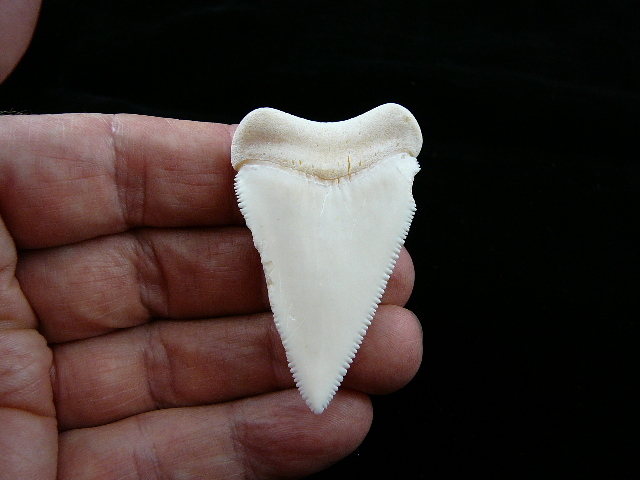 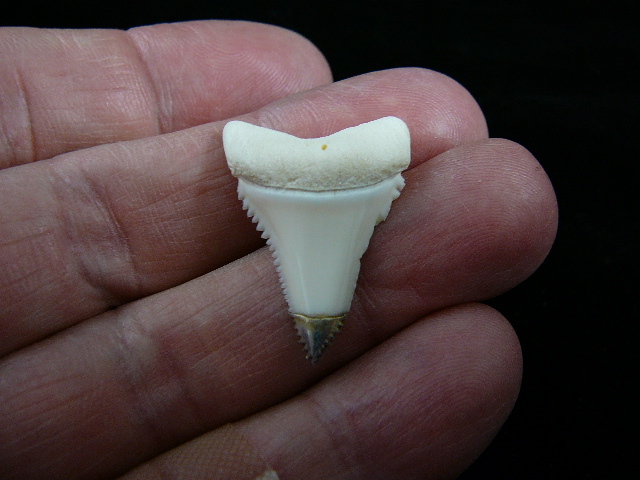 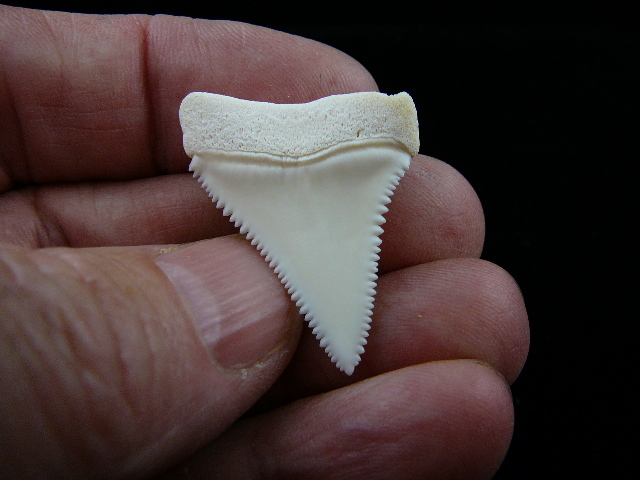 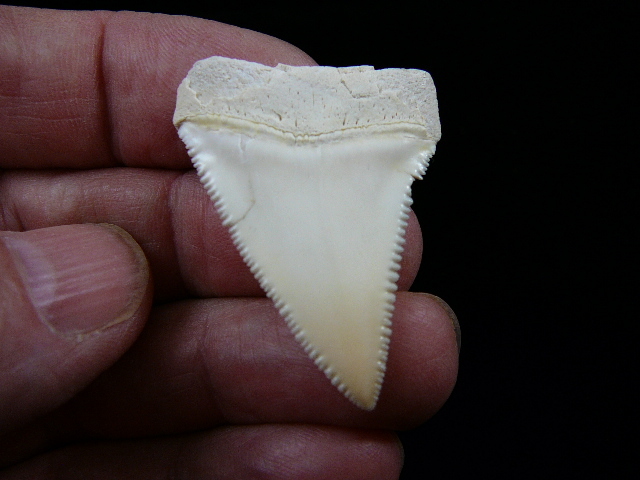 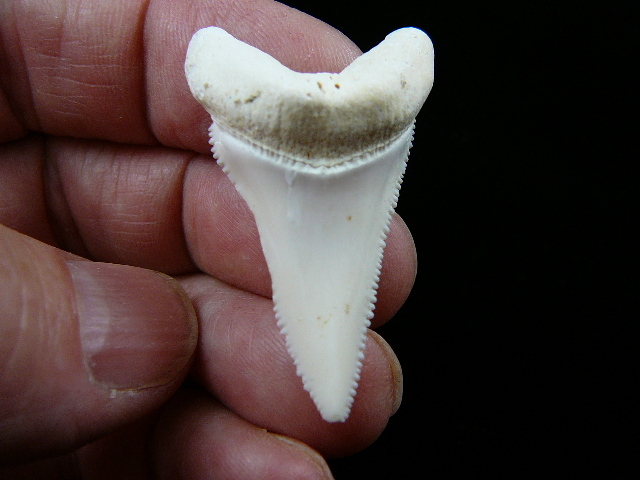 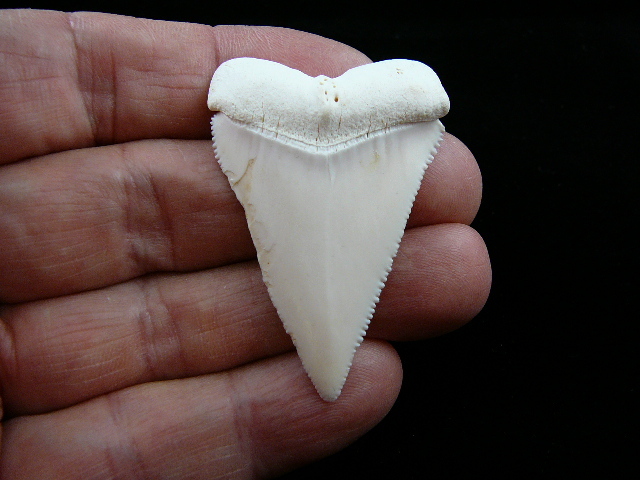 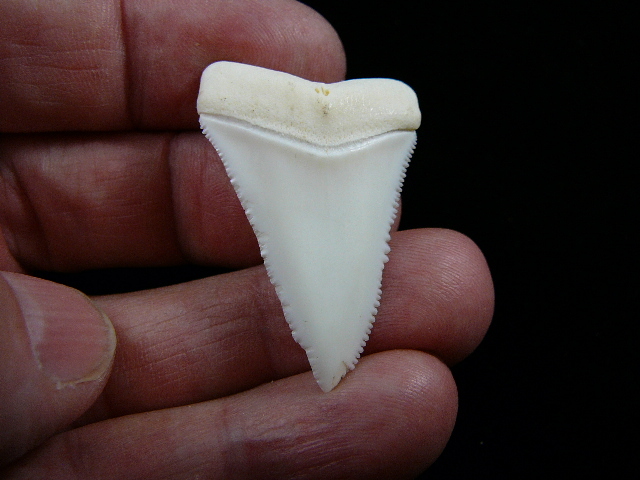 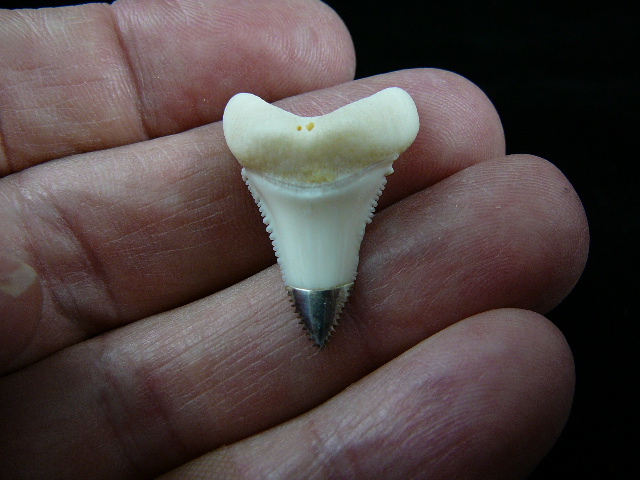 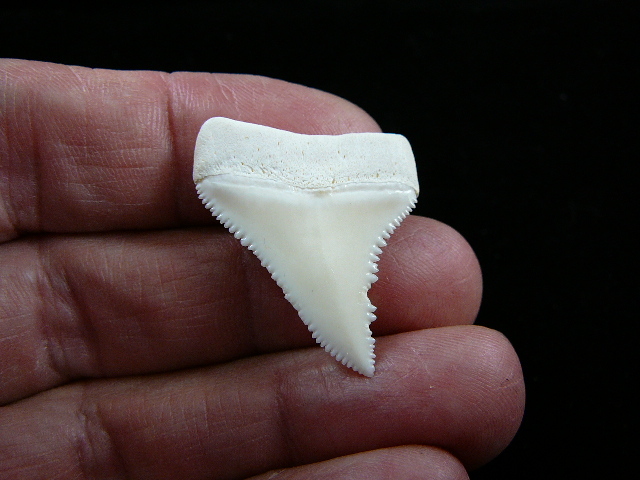 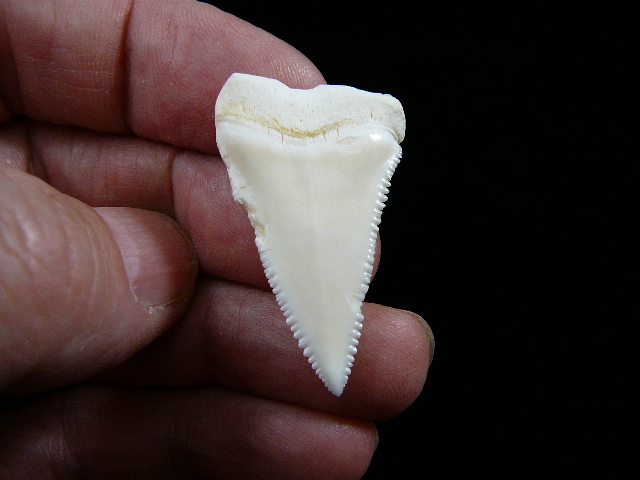 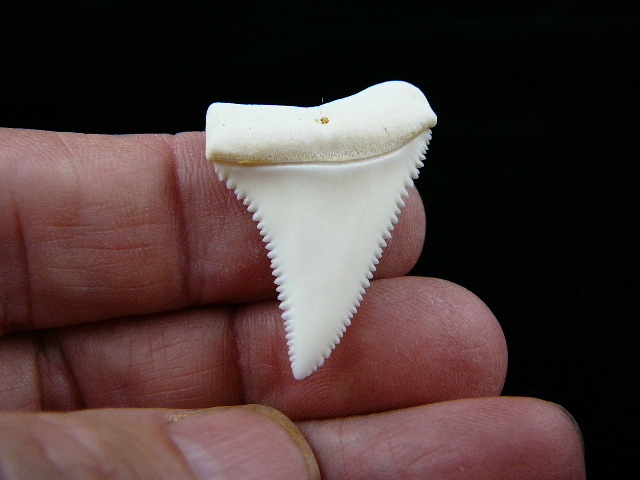 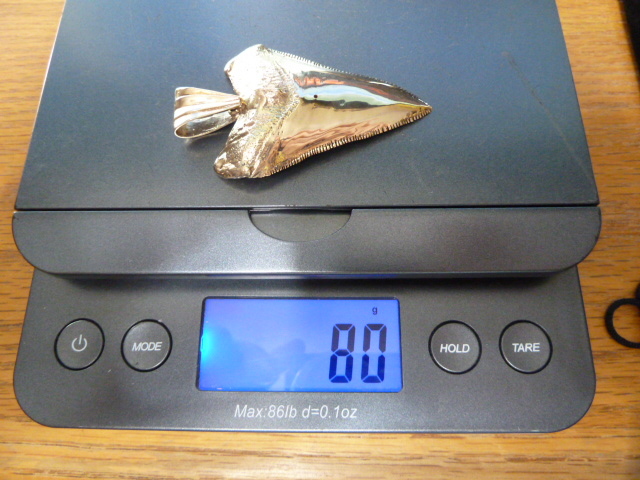 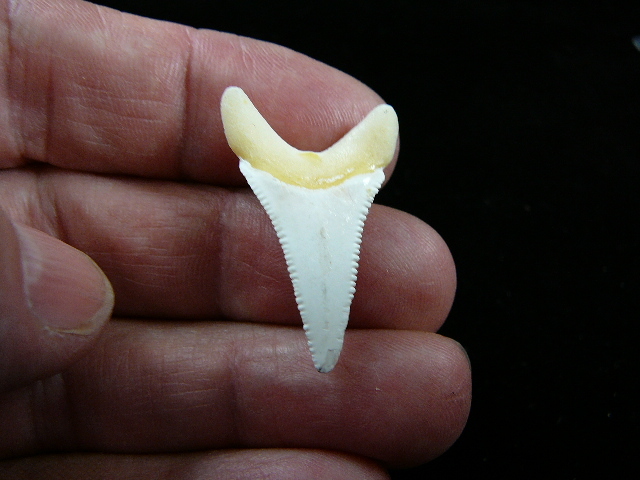 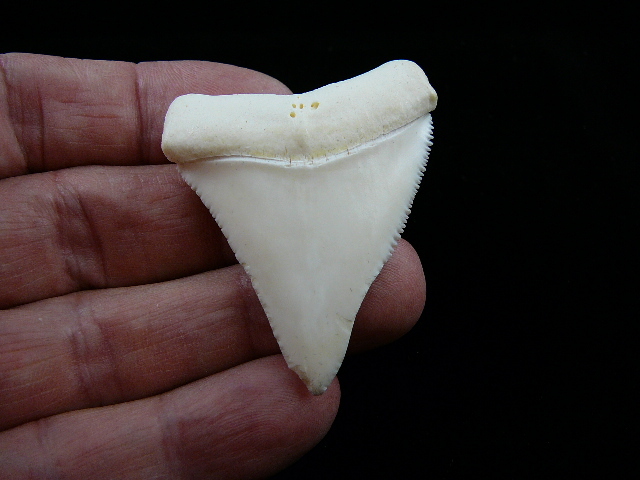 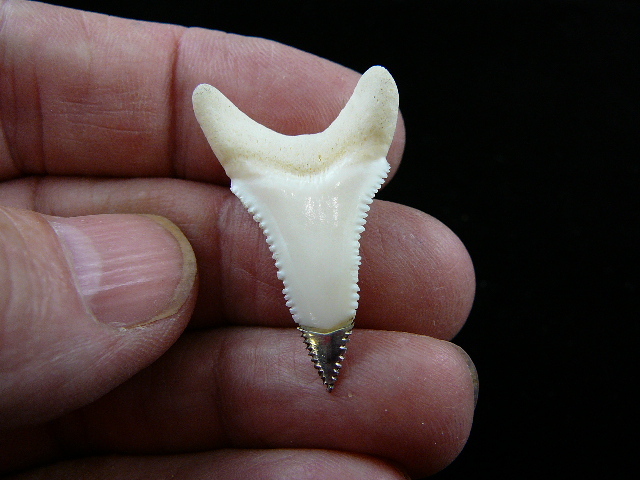 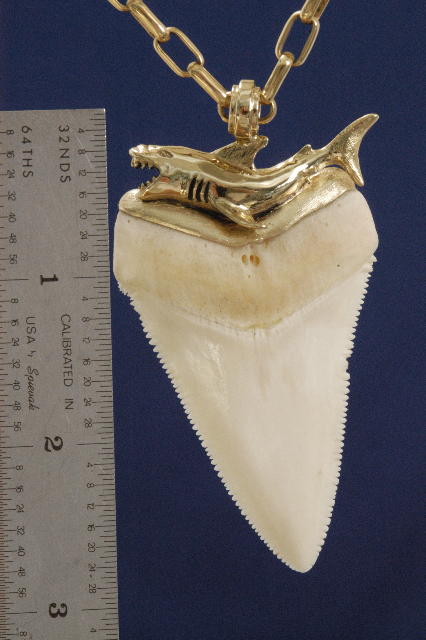 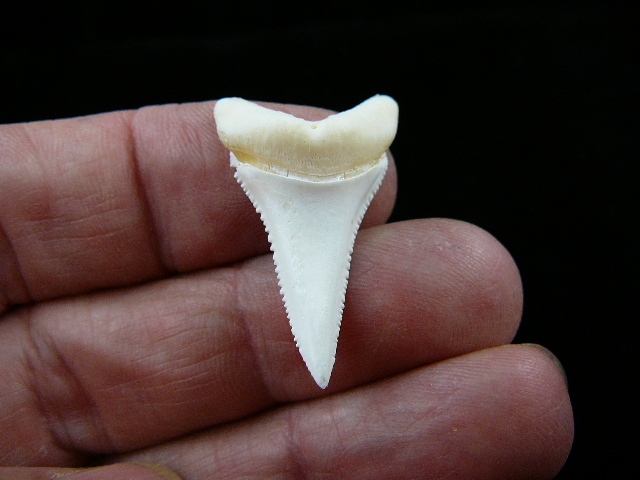 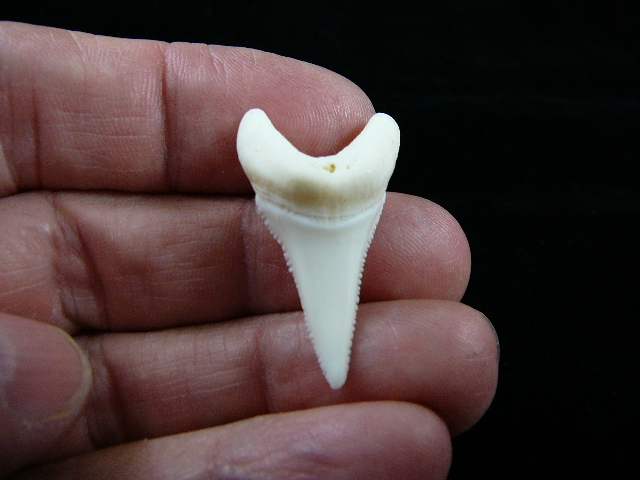 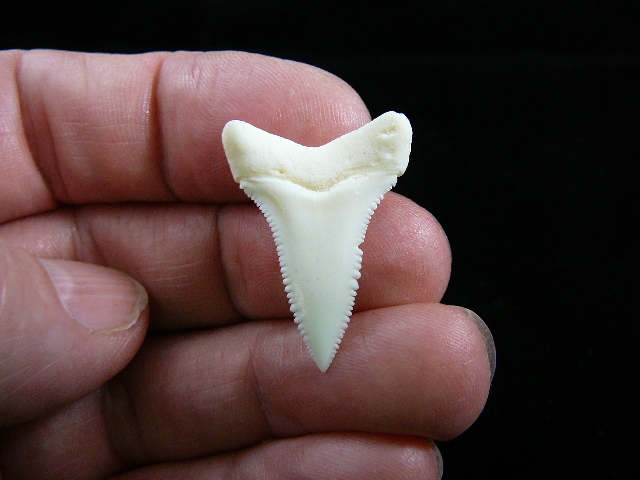 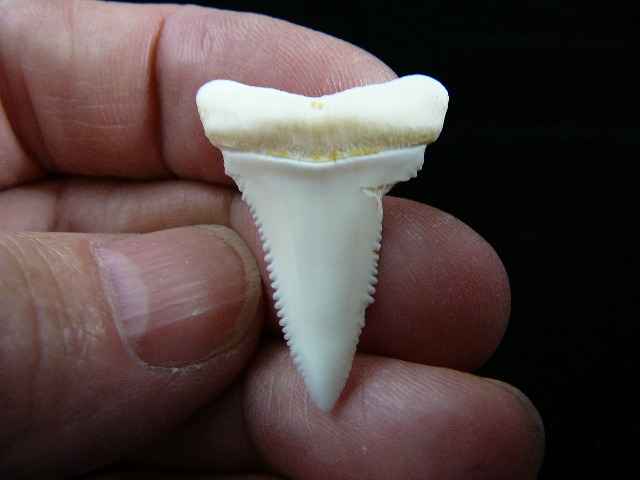 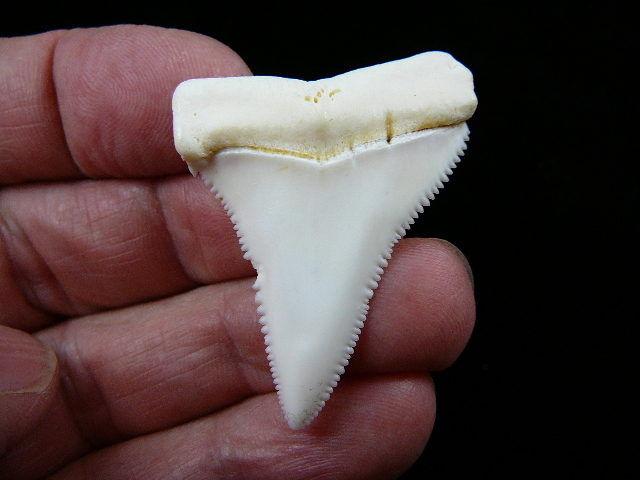 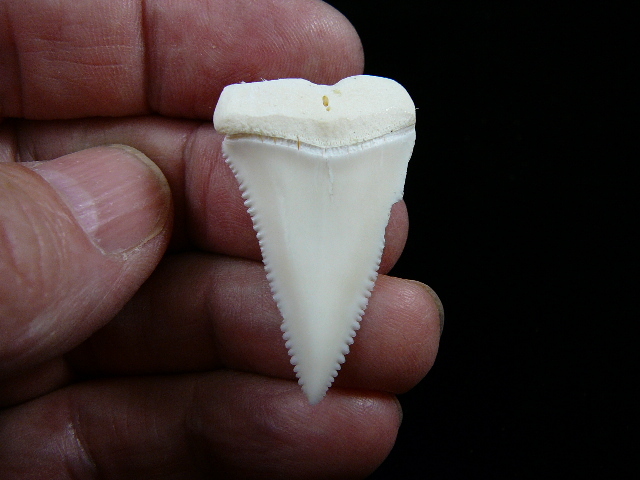 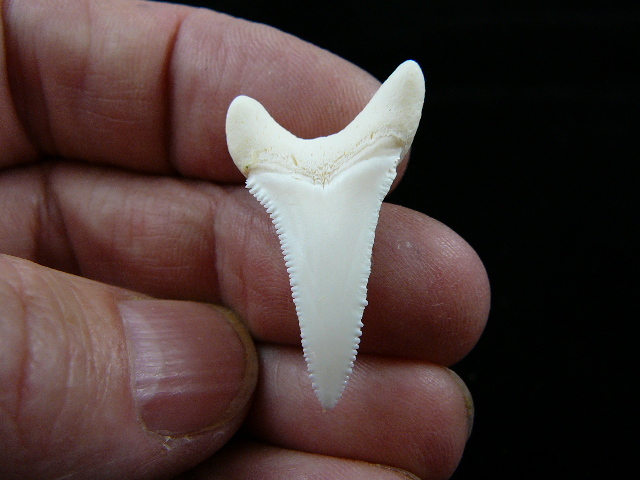 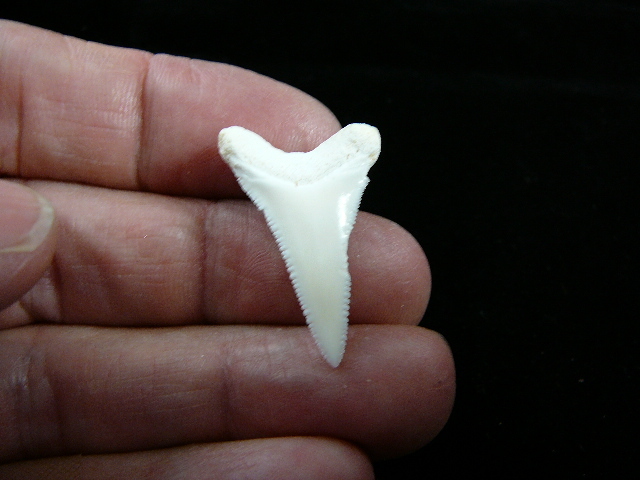 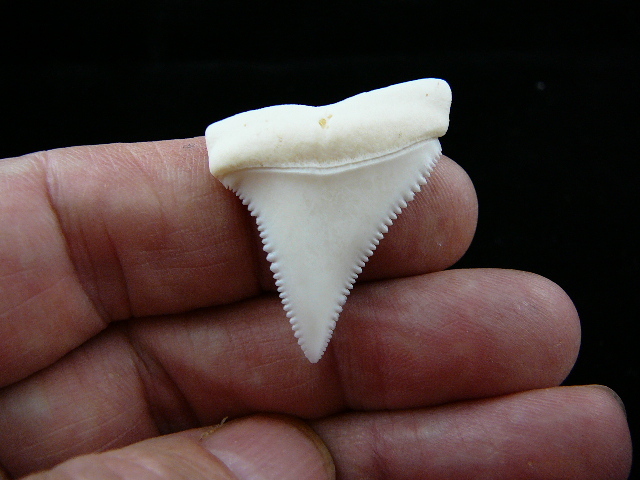 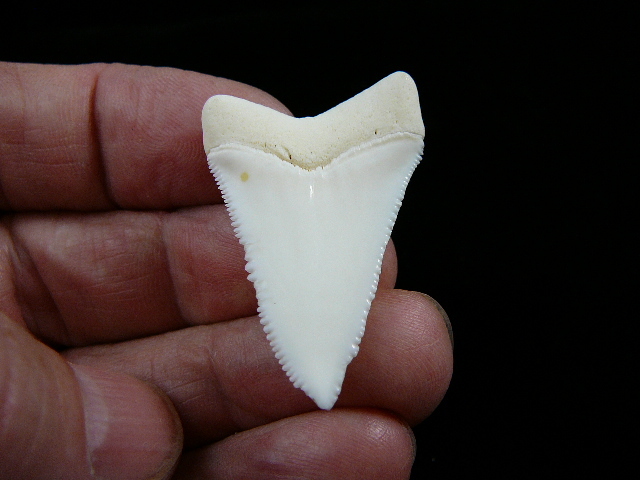 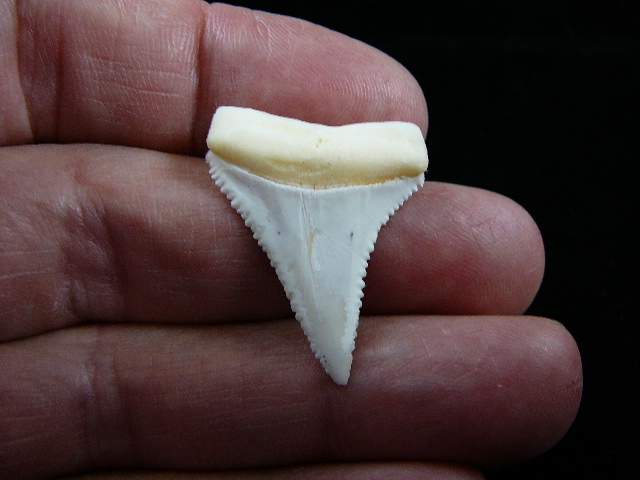 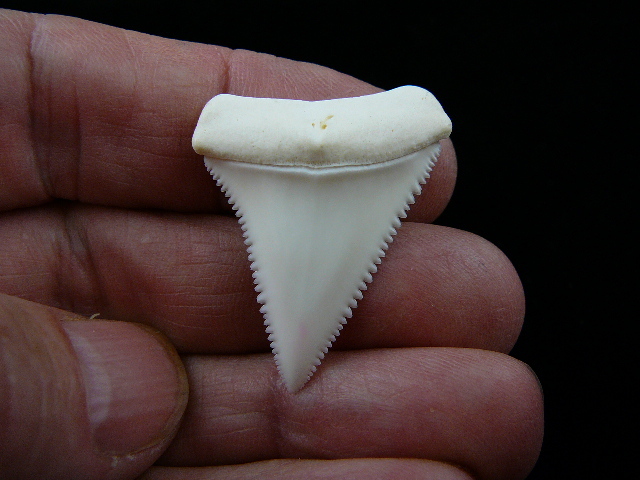 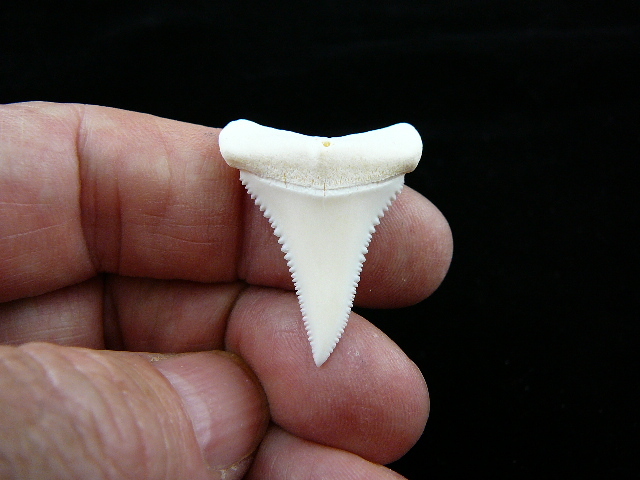 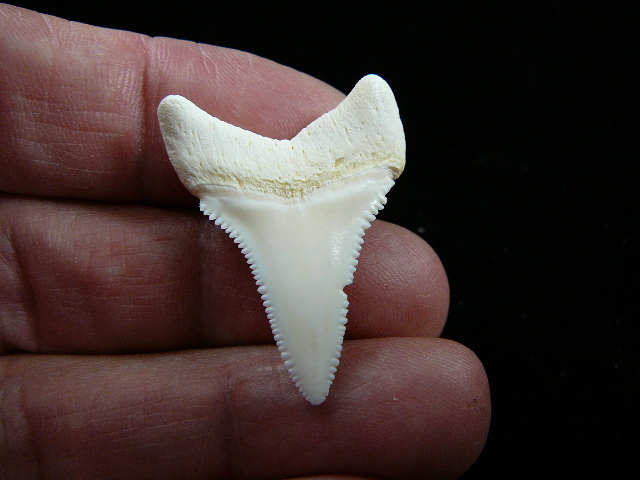 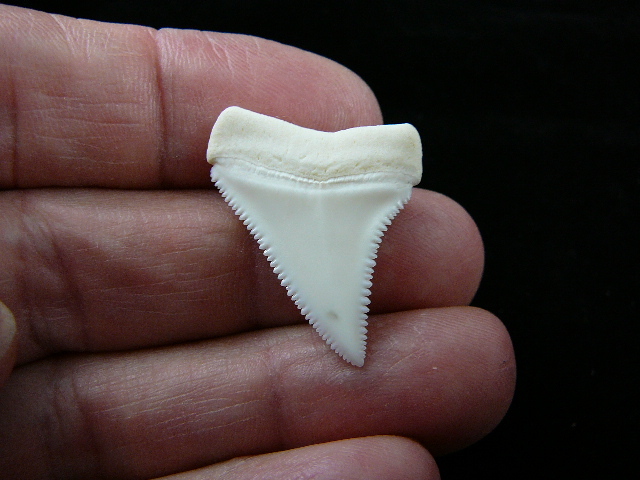 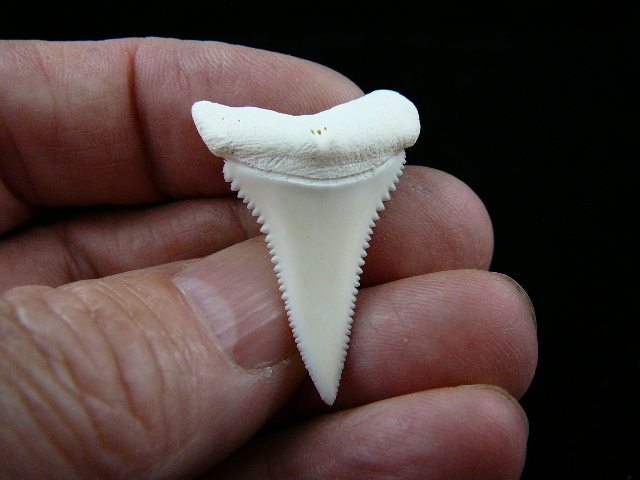 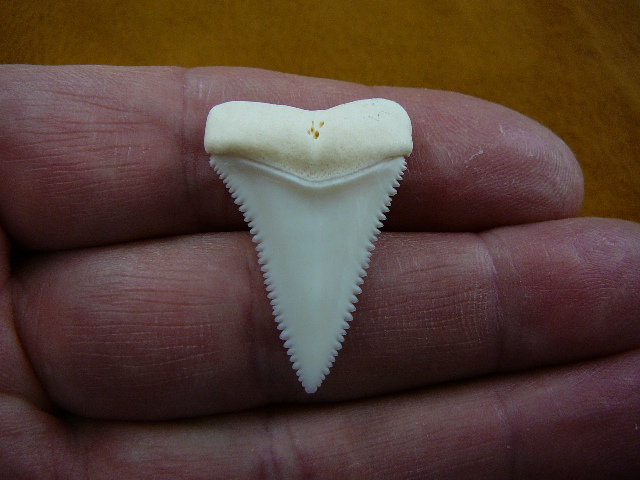 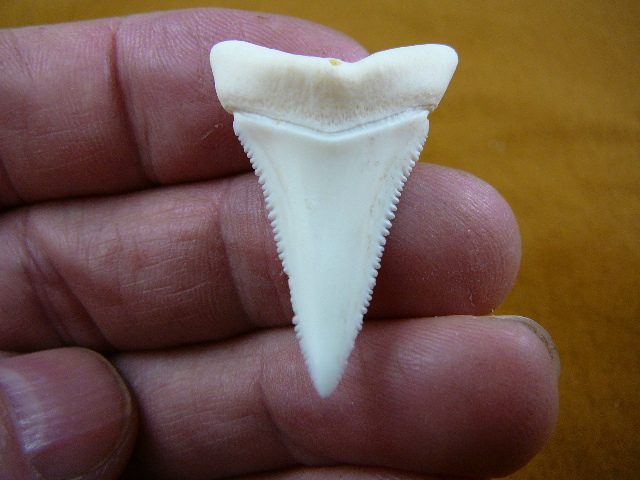 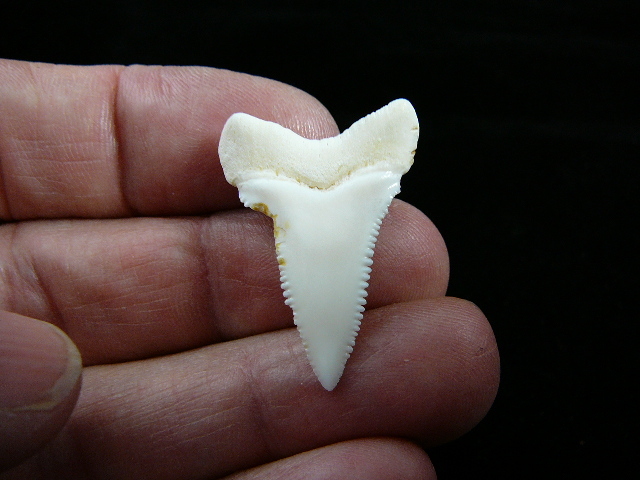 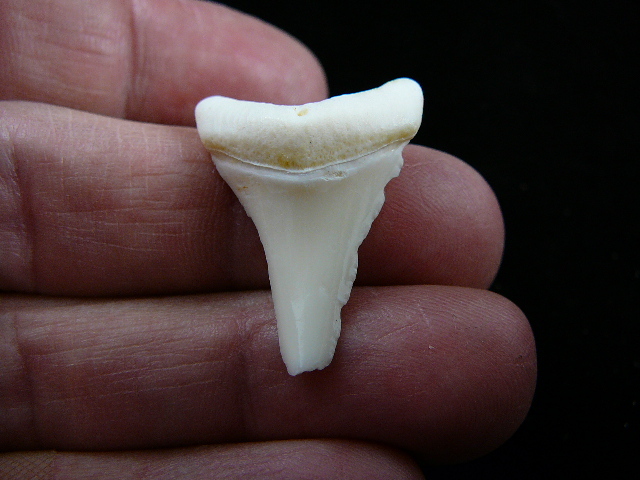 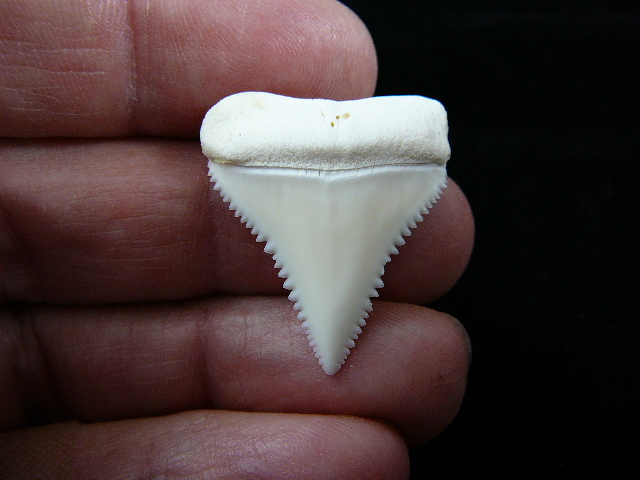 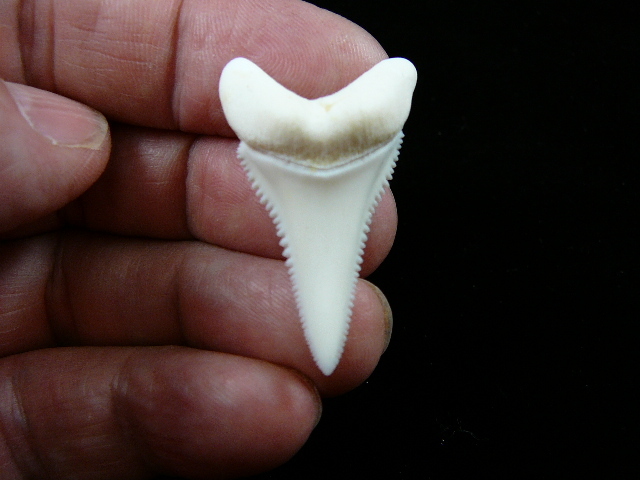 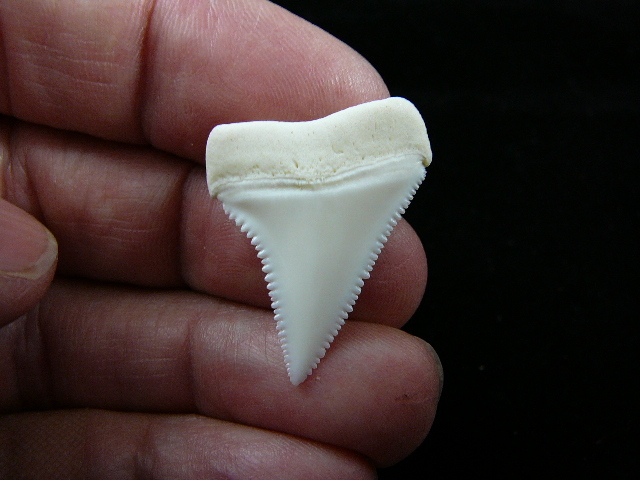 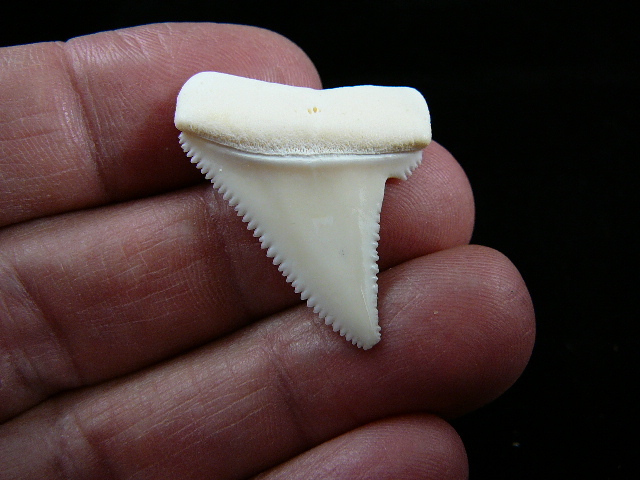 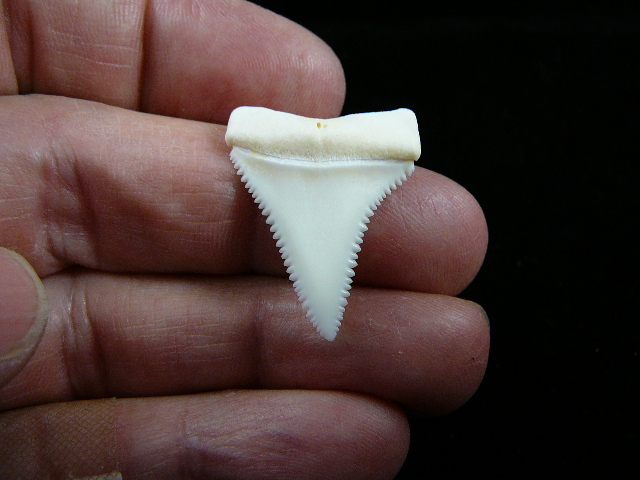 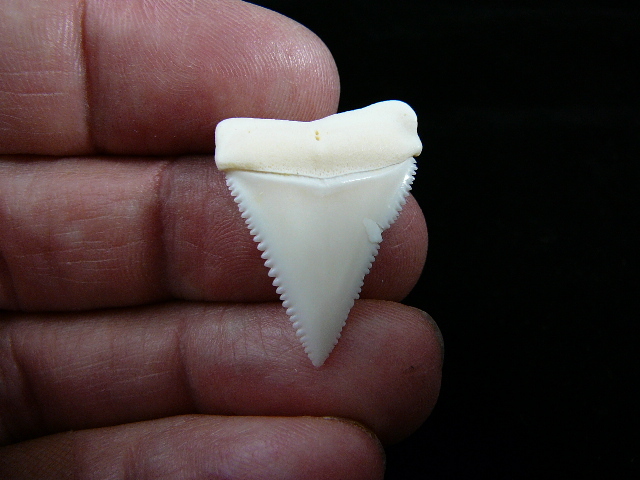 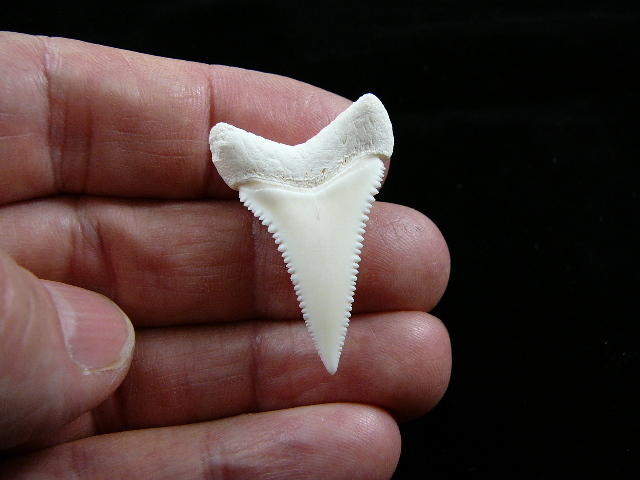 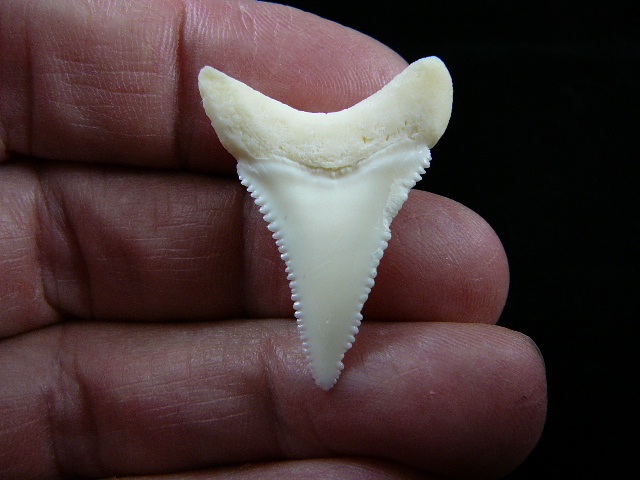 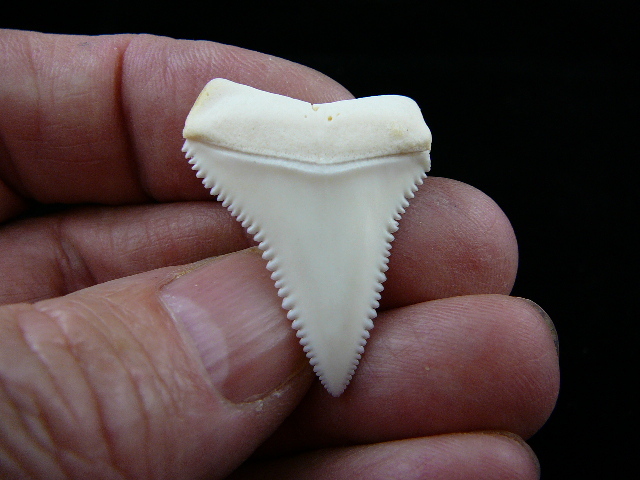 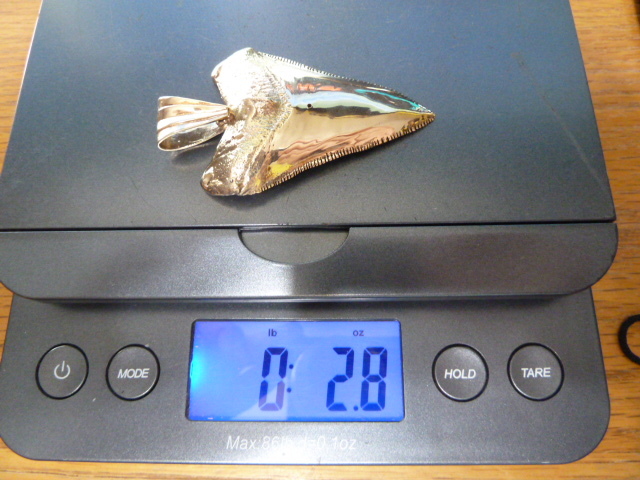 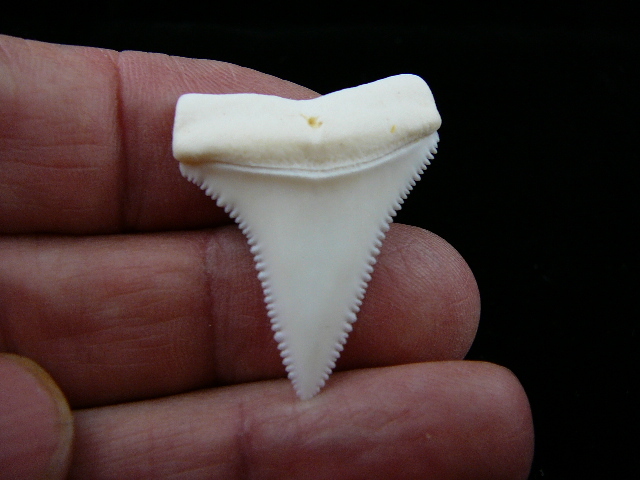 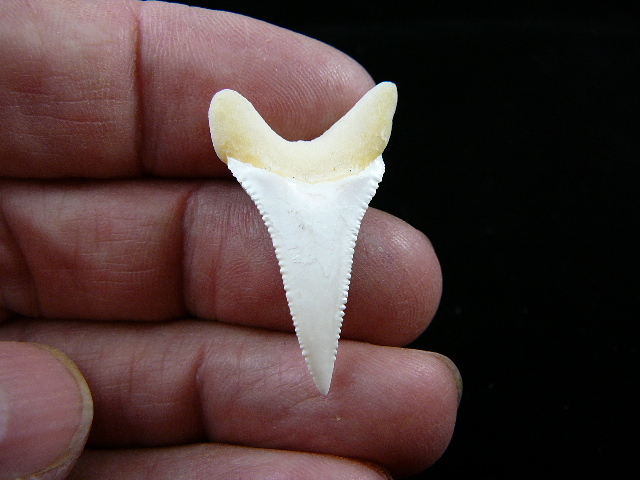 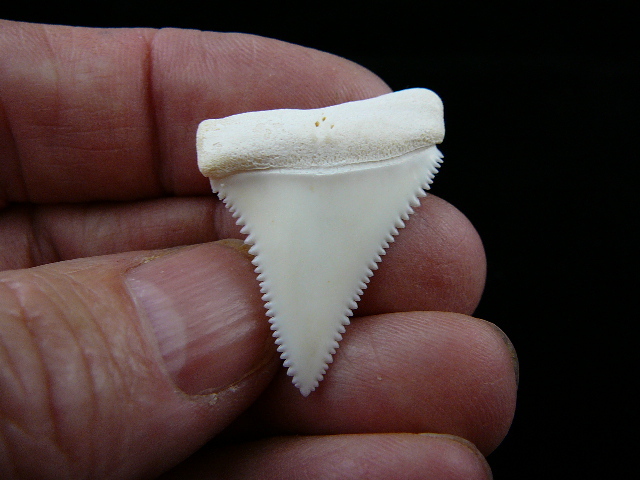 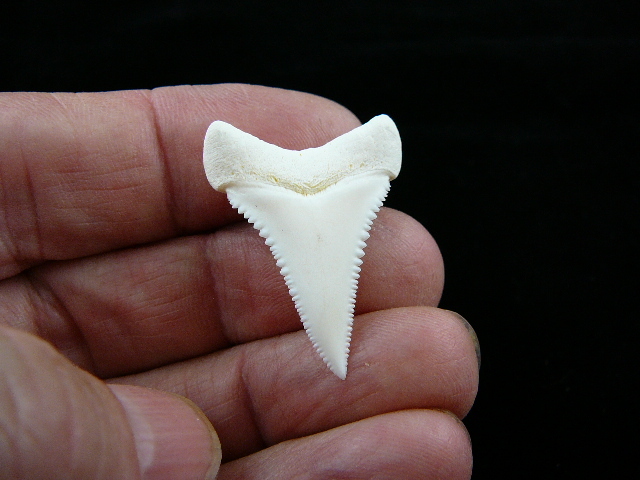 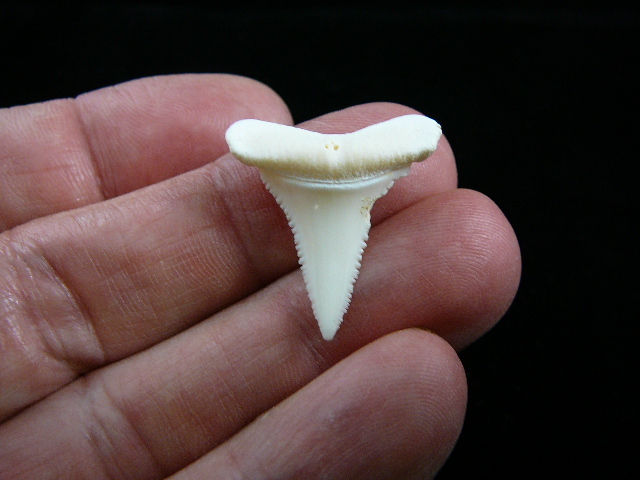 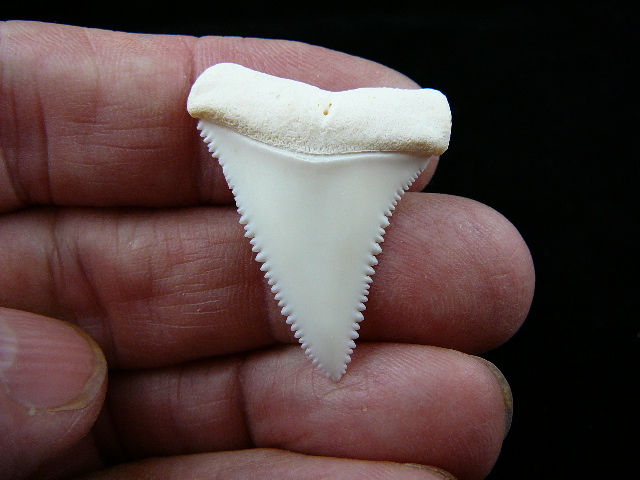 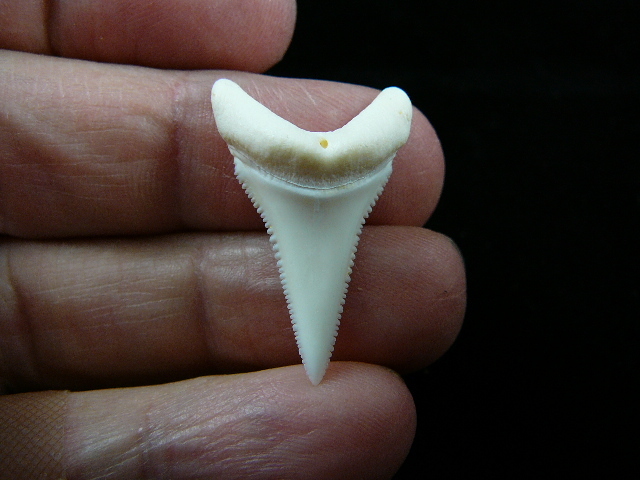 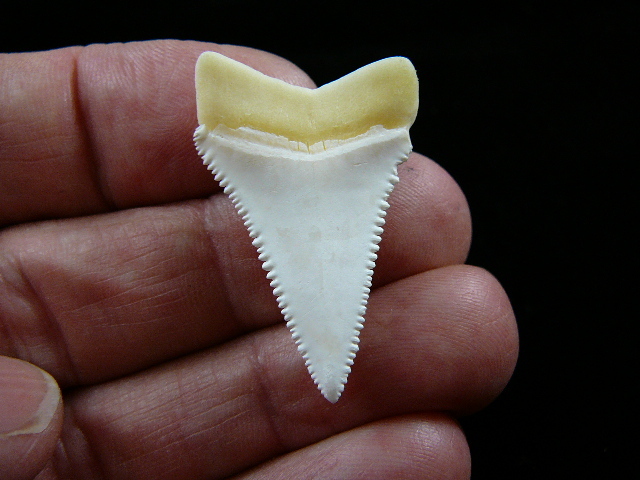 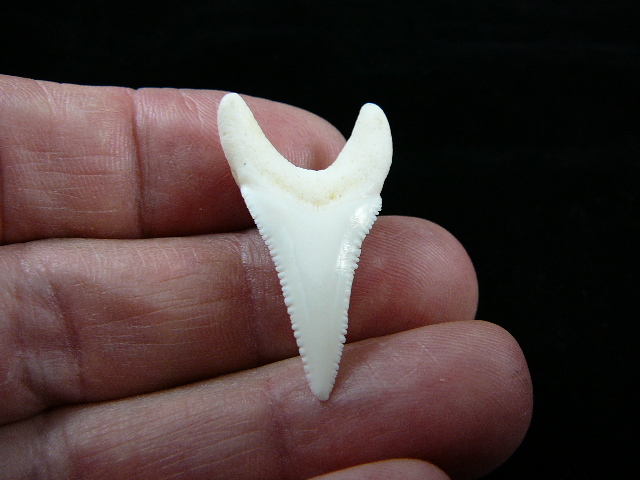 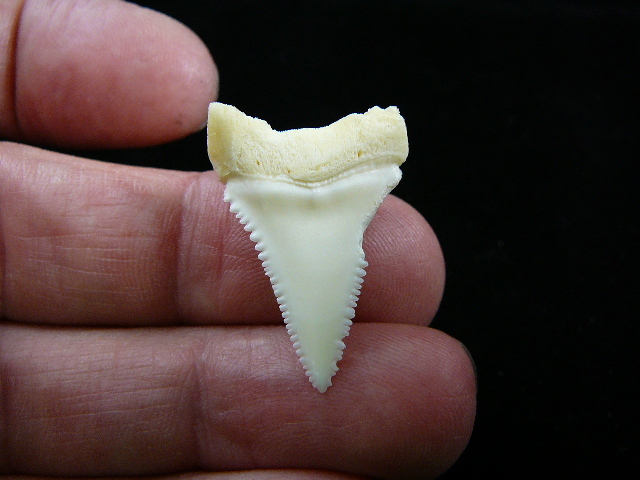 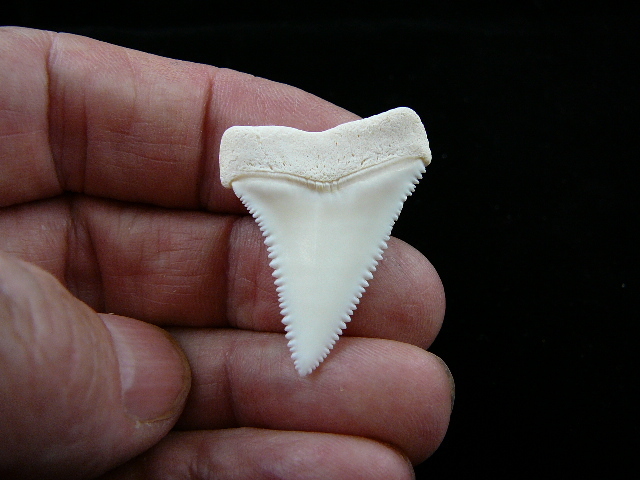 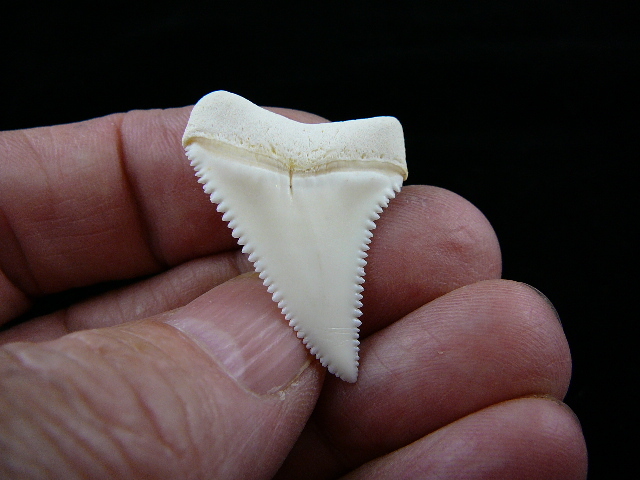 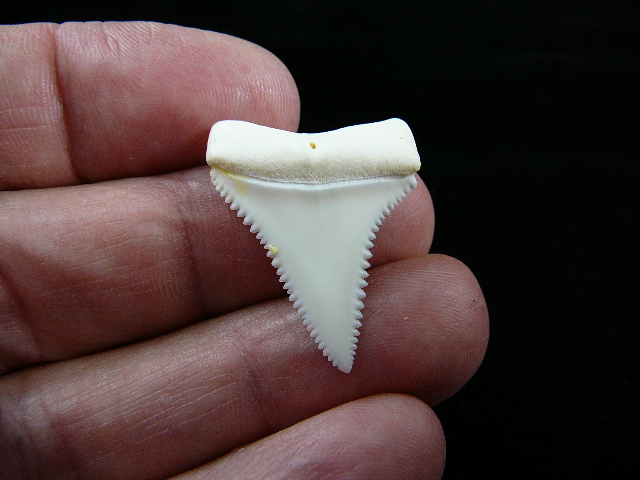 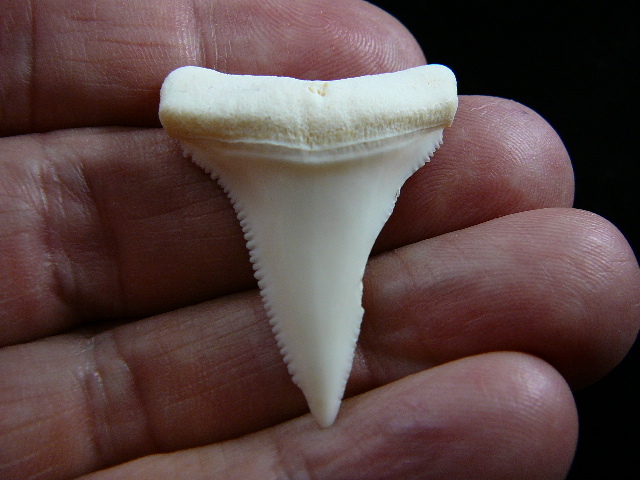 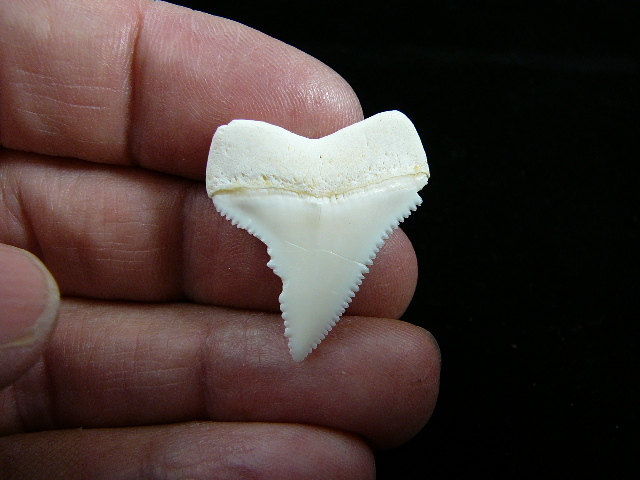 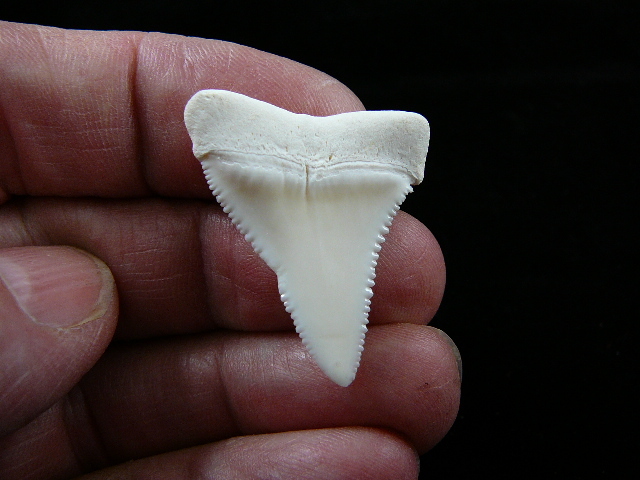 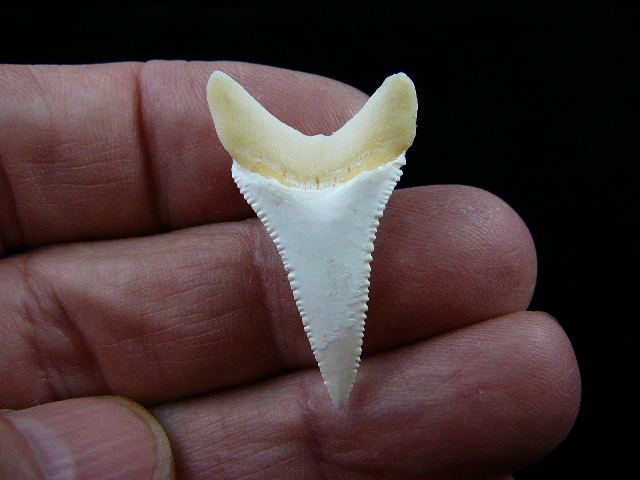 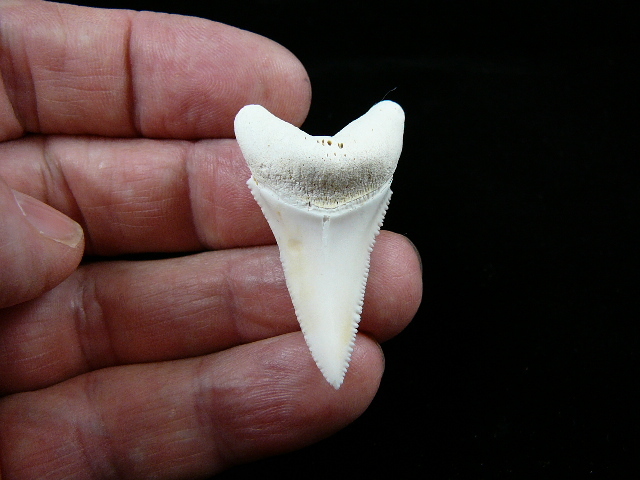 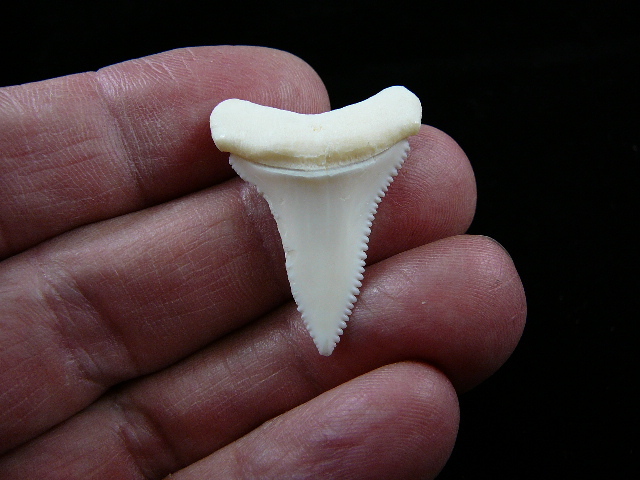 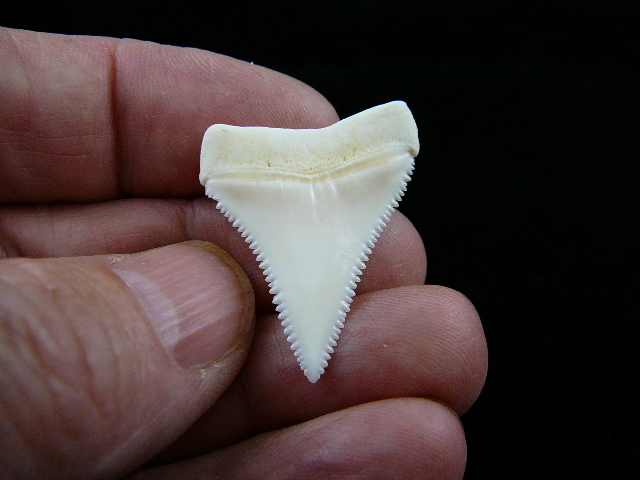 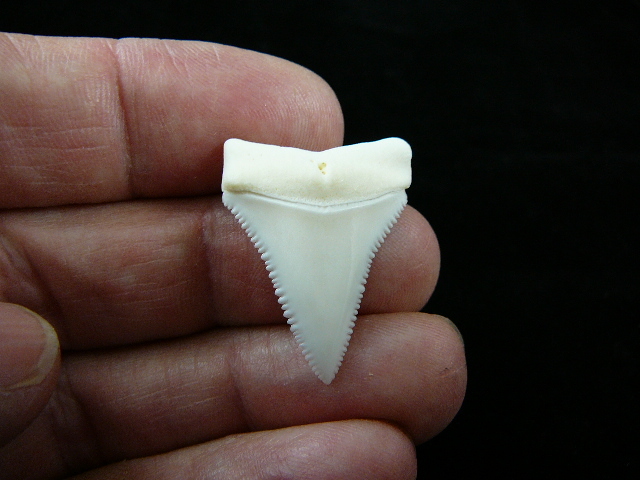 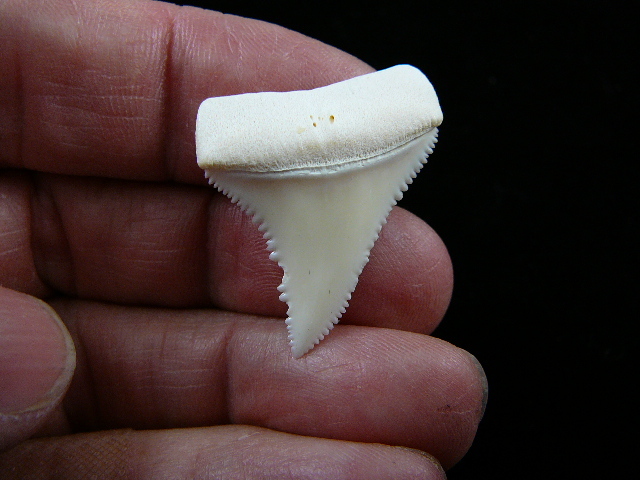 2-3/4", we've measured it on multiple rulers and had it verified by another great white shark tooth expert. 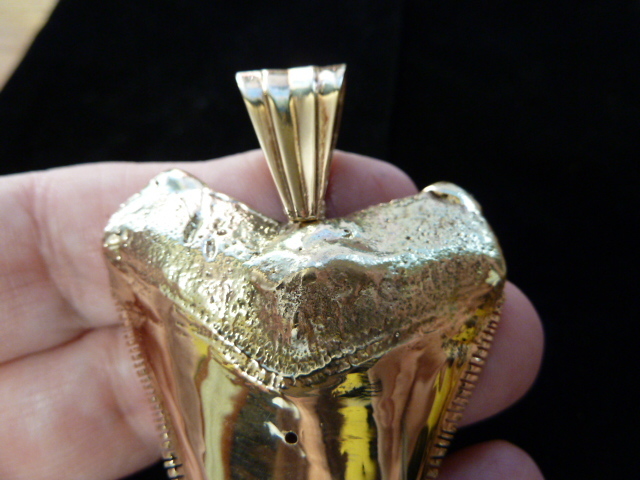 It is what it is! 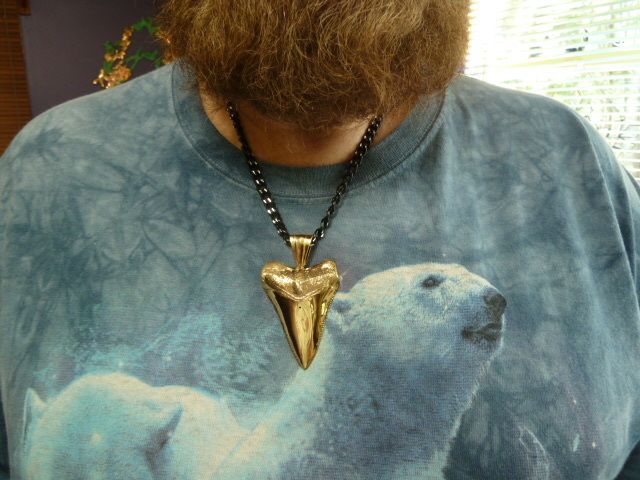 CONGRATULATIONS ON YOUR PURCHASE, MR. T from CALIFORNIA !! 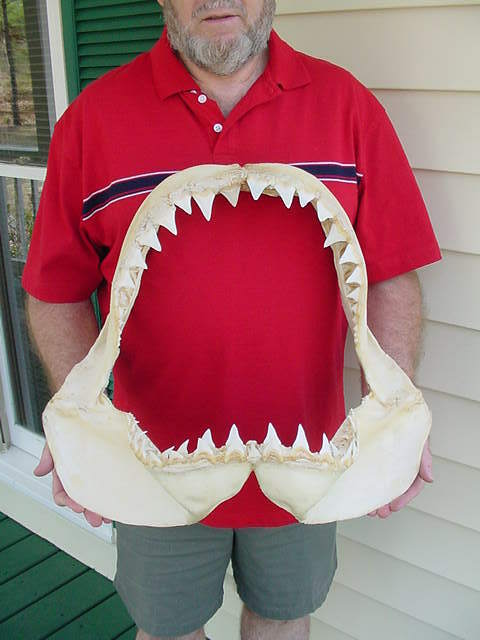 $3485 SOLD - Jeff in NC - CONGRATS on buying the "twins"! 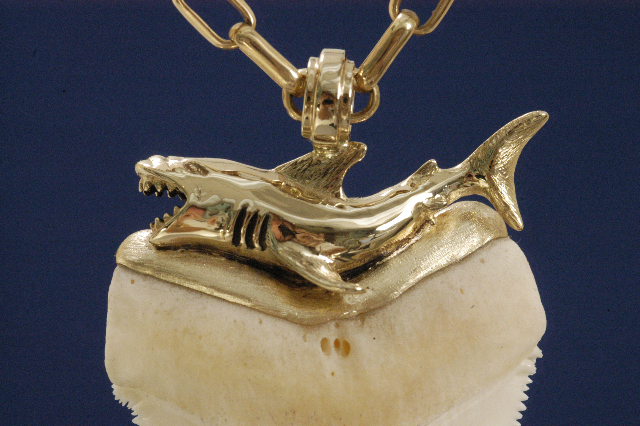 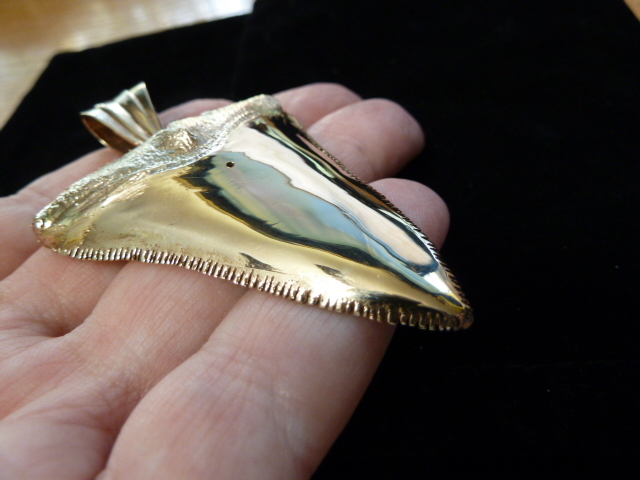 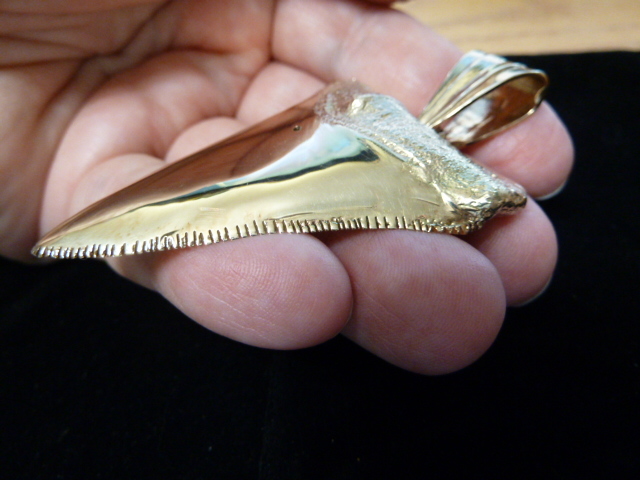 "jumping" sharks and designed the piece as you can see from the picture (photo credits to John Haupt; cap used an ounce of gold). 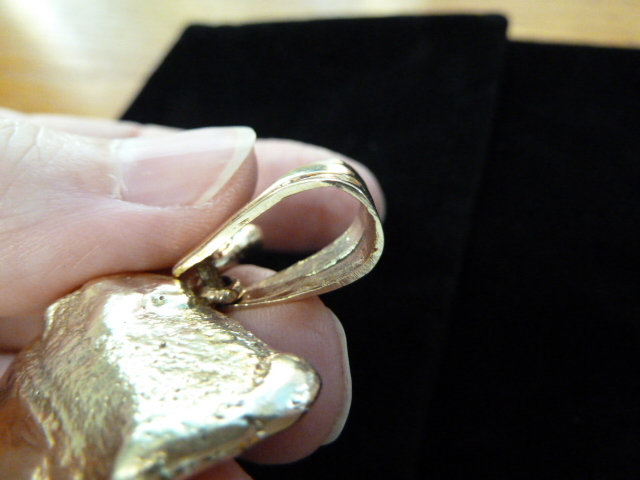 We hand made the chain from 1/2 round 14 k gold wire and cut and soldered each piece (another two ounces of gold). 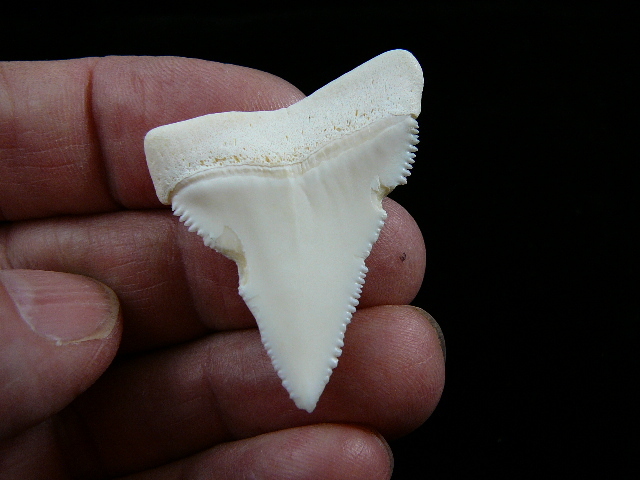 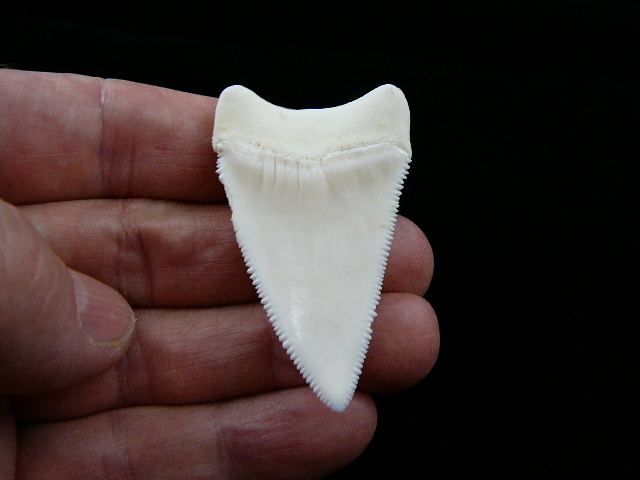 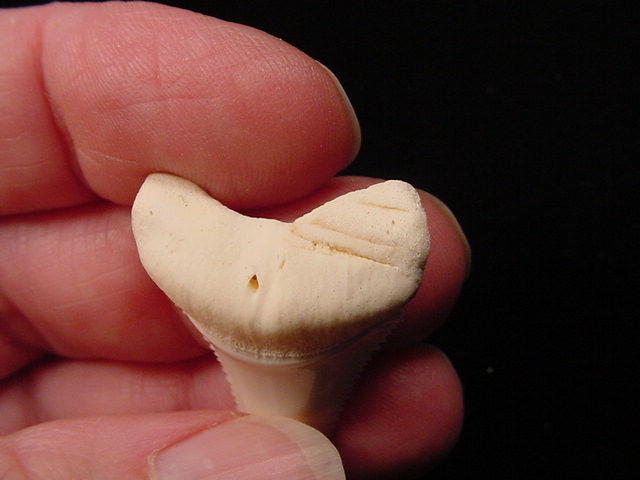 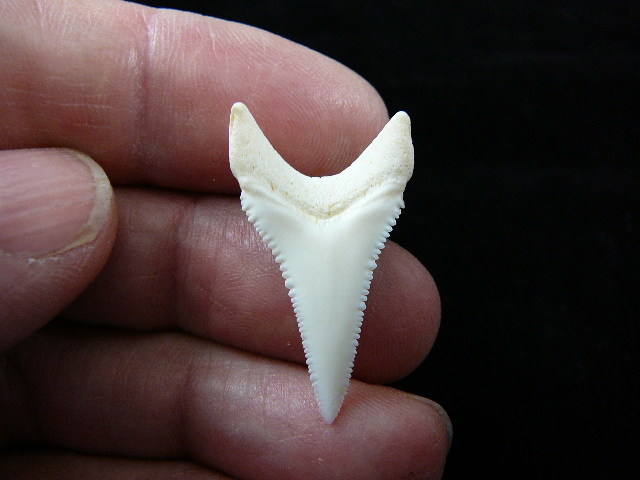 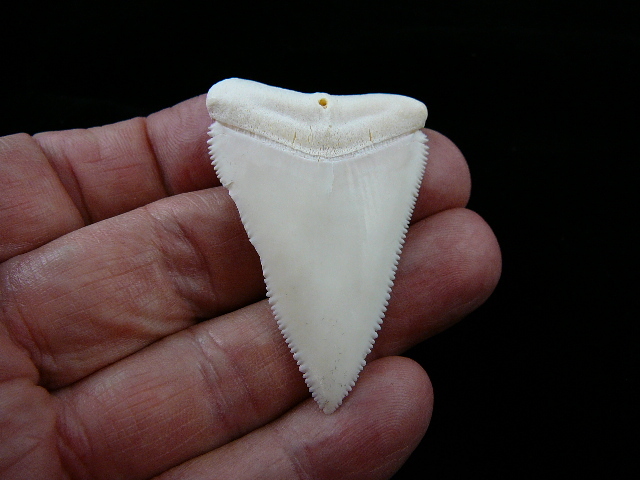 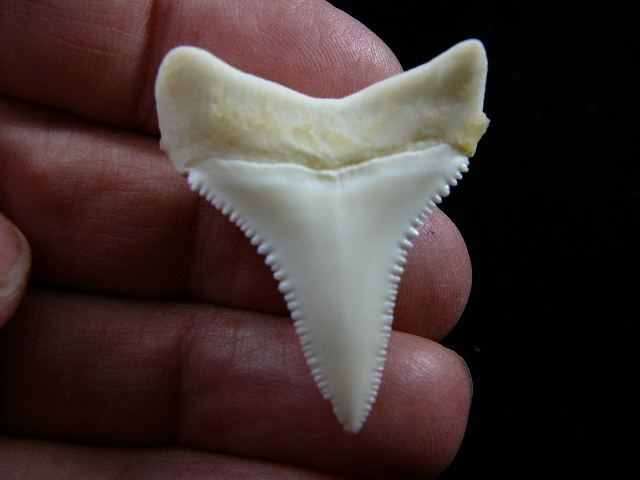 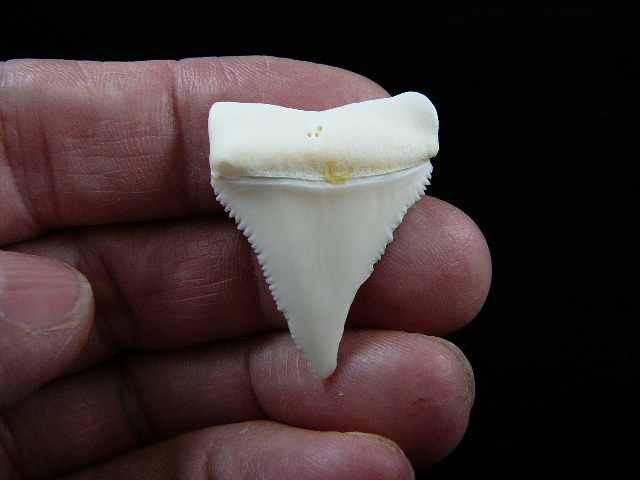 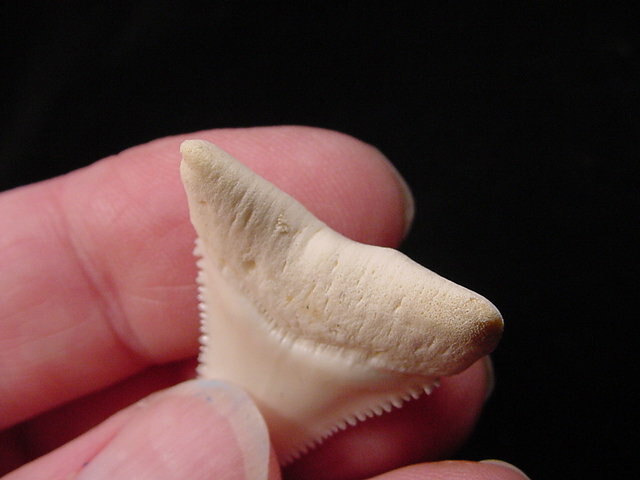 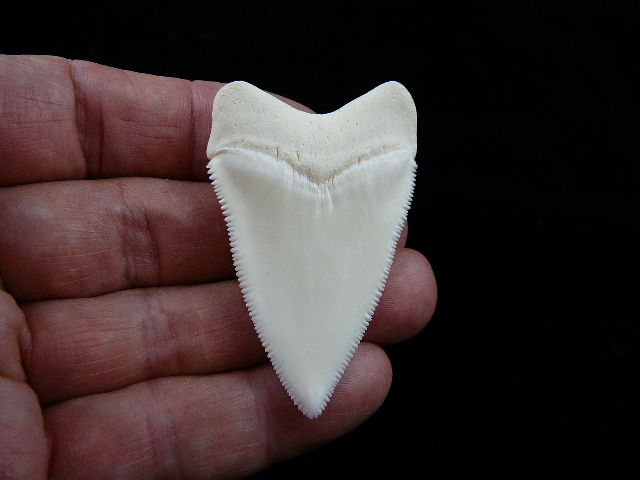 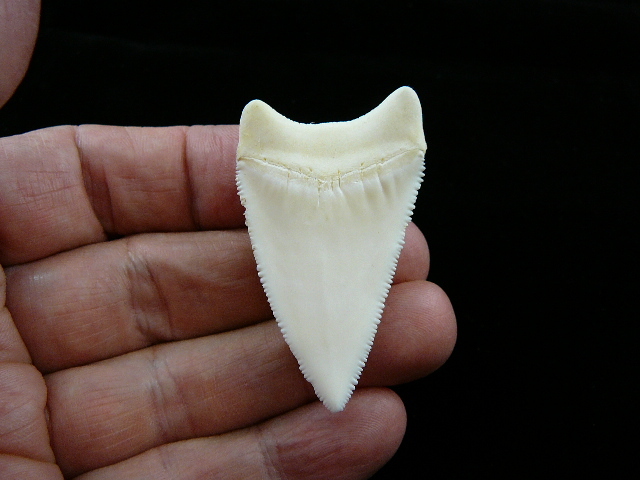 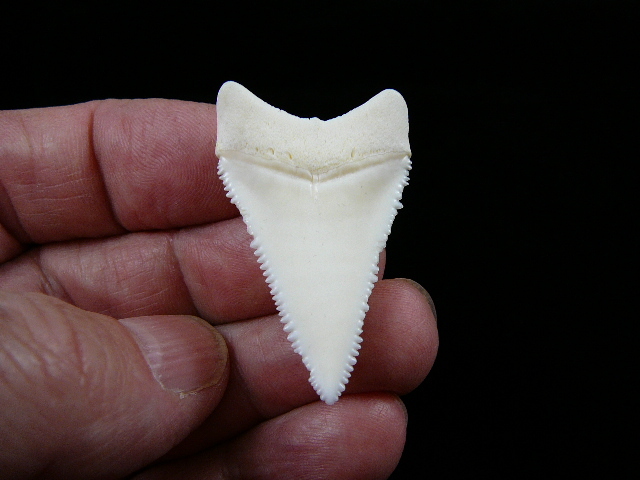 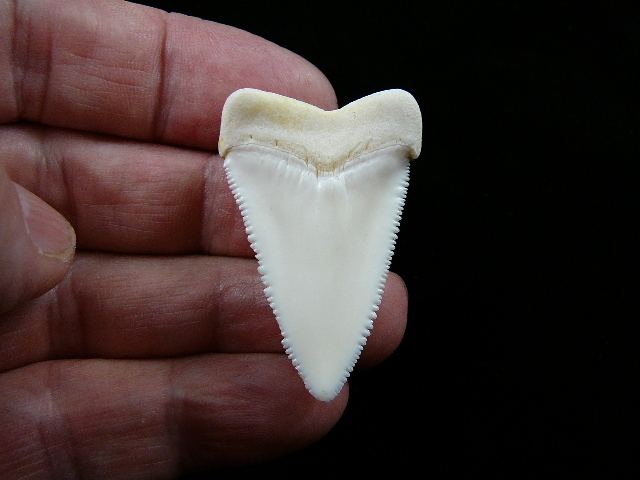 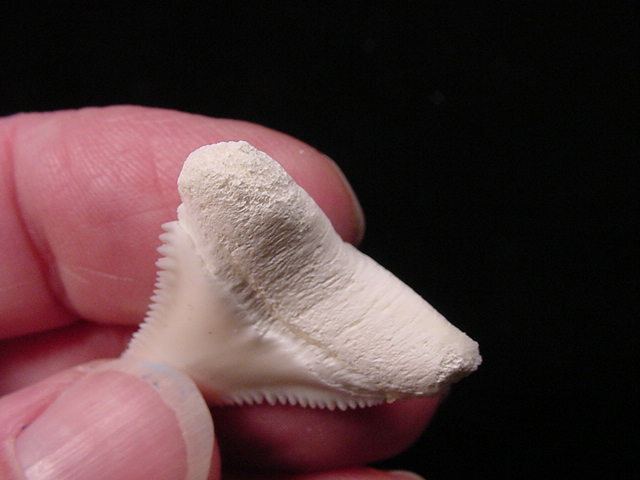 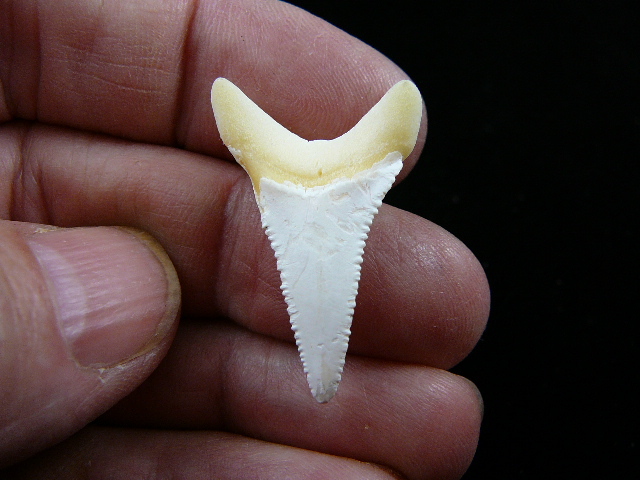 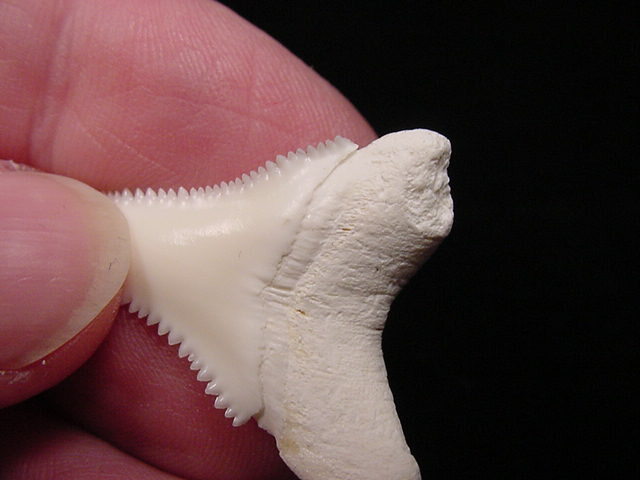 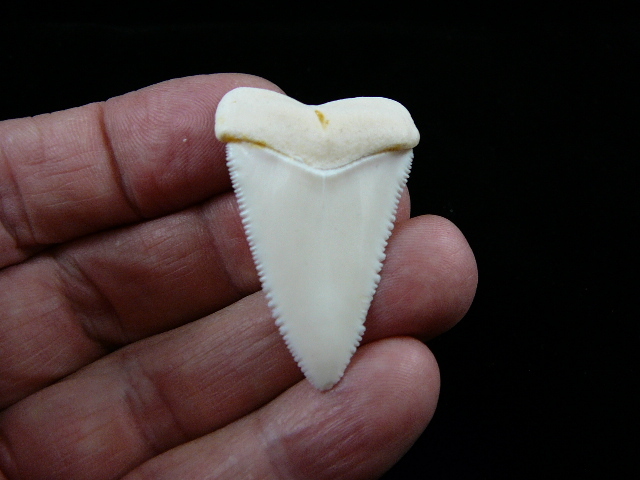 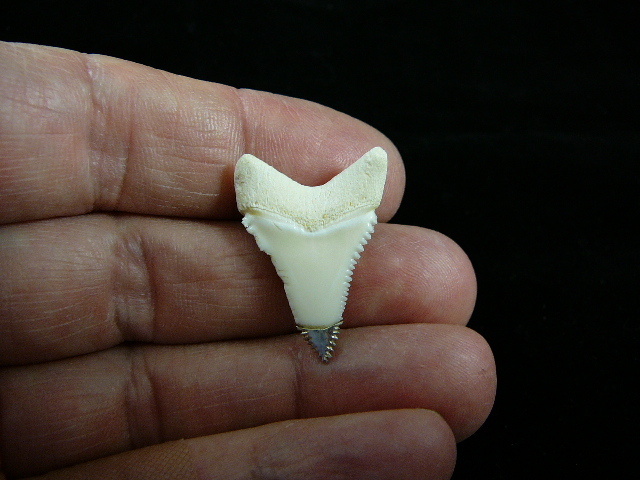 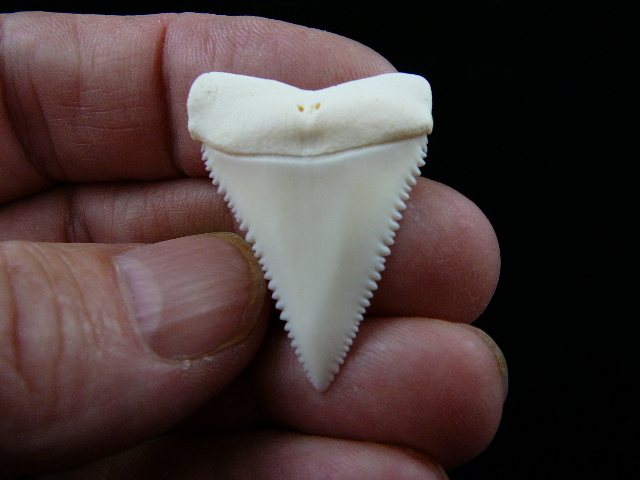 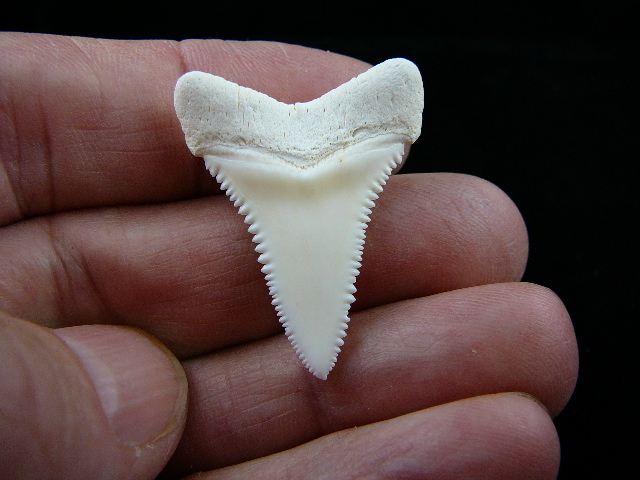 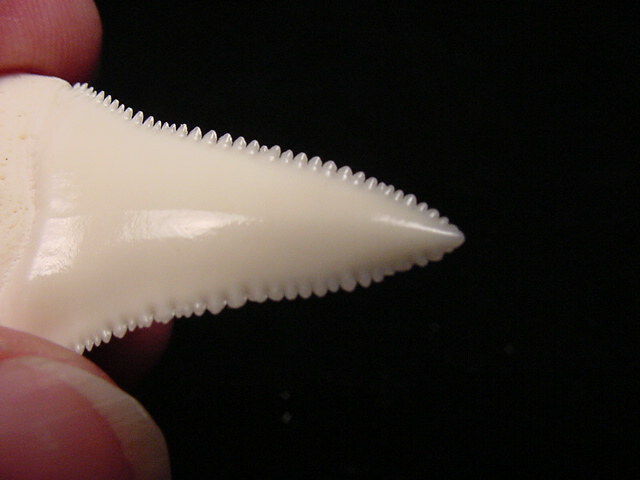 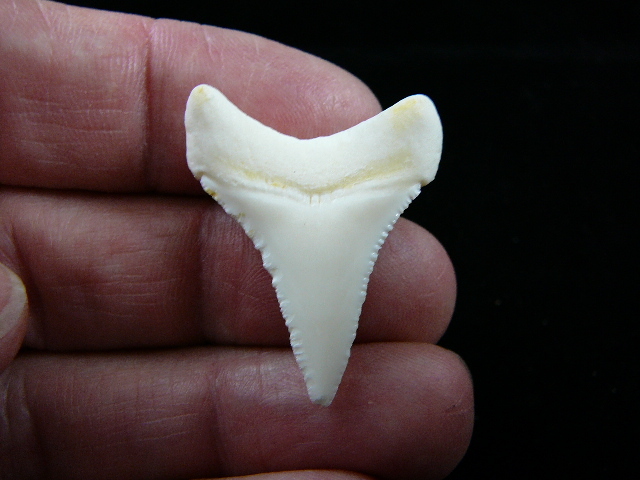 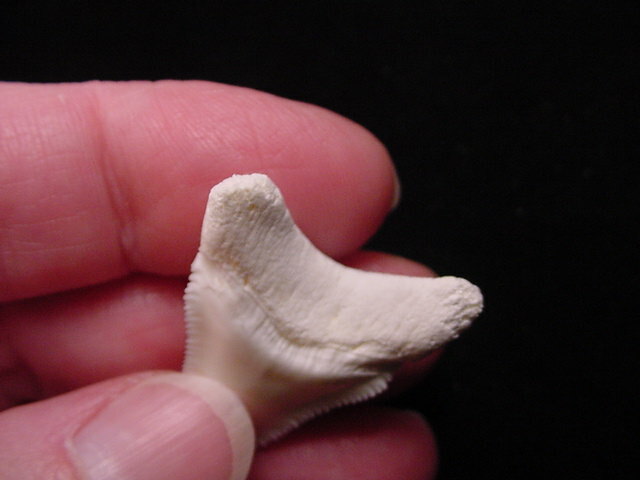 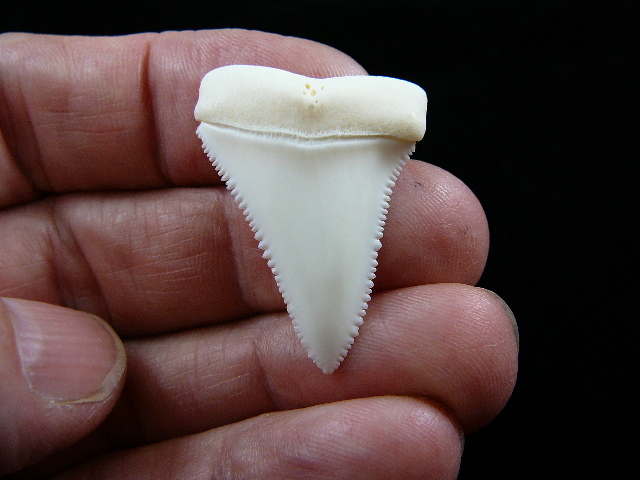 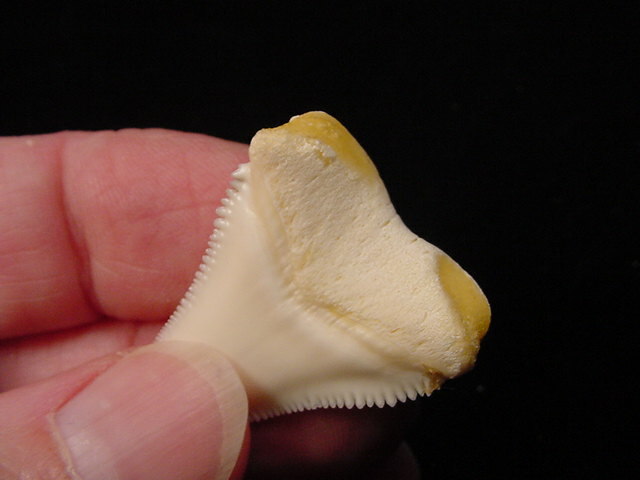 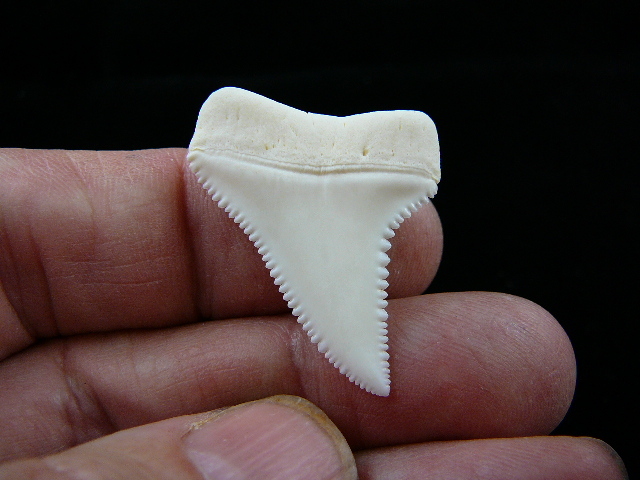 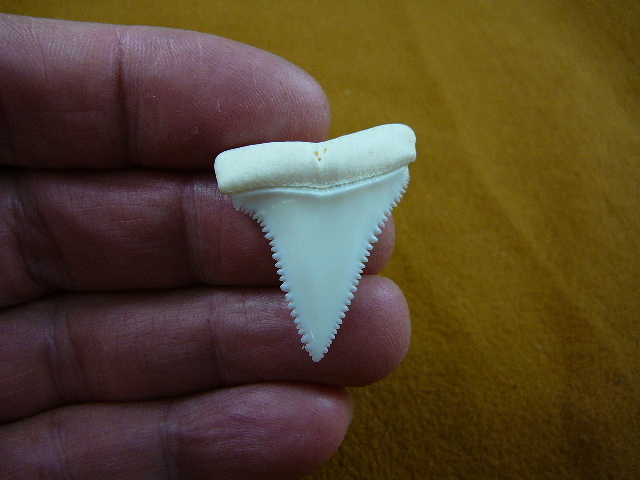 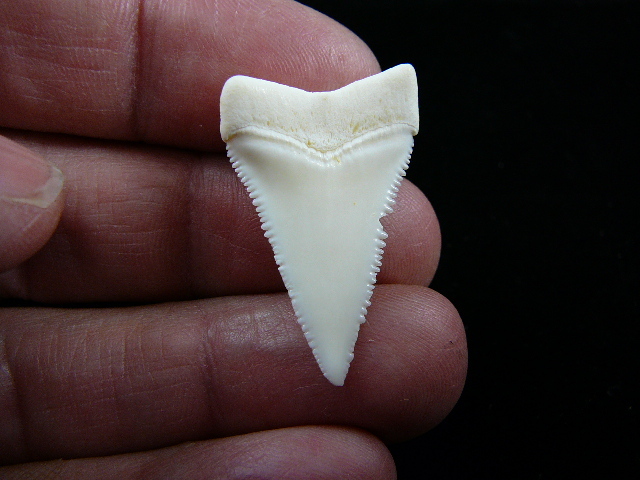 MORE GREAT WHITE SHARK TEETH - 1-1/8" AND SMALLER ARE ON THE NEXT PAGE!